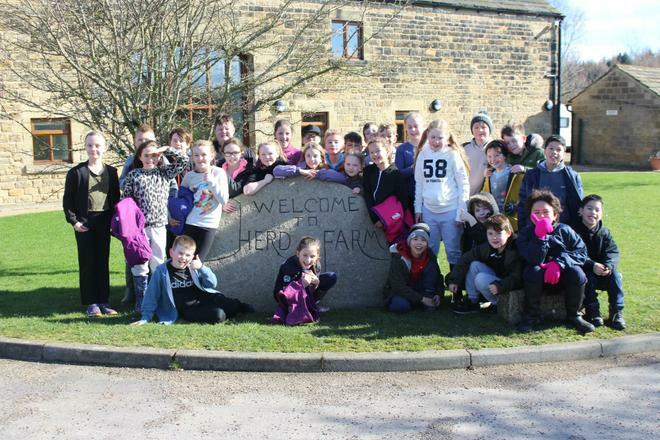 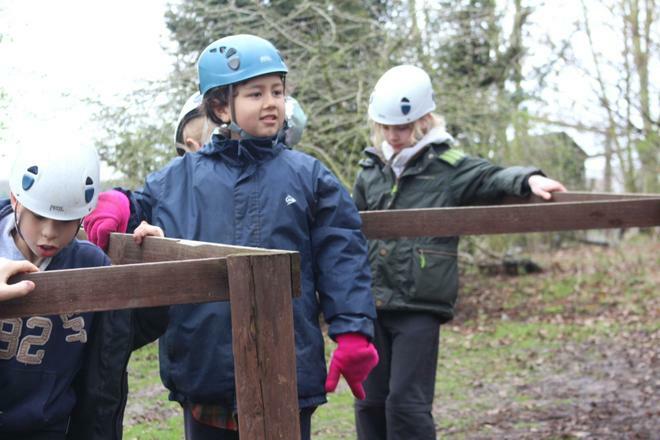 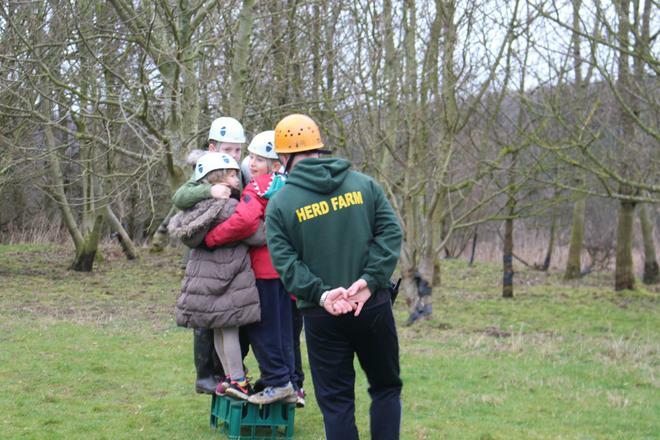 5O had a fantastic first day at Herd Farm. 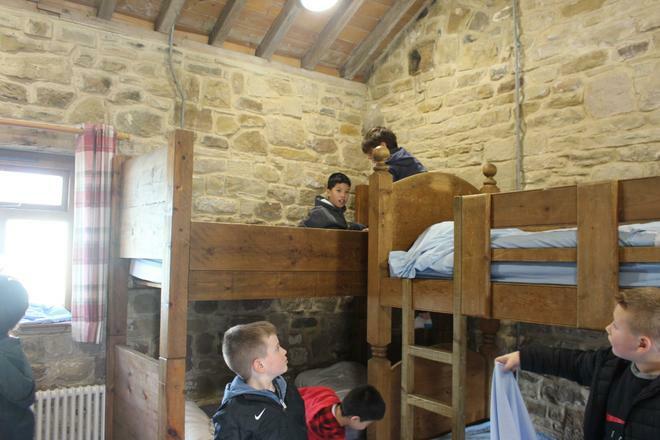 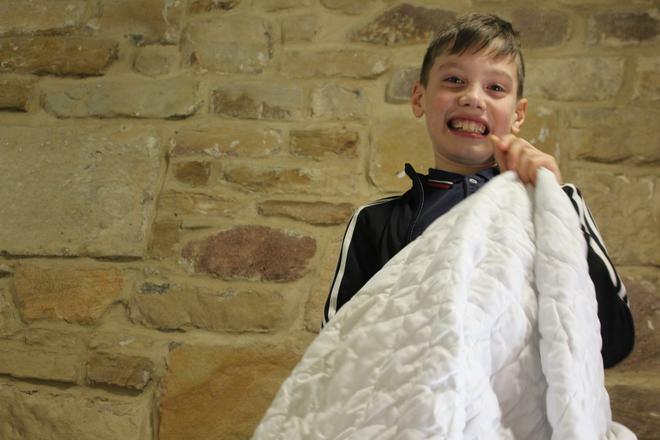 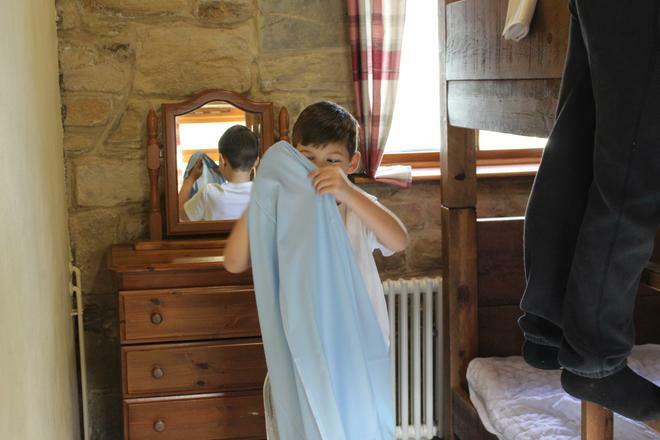 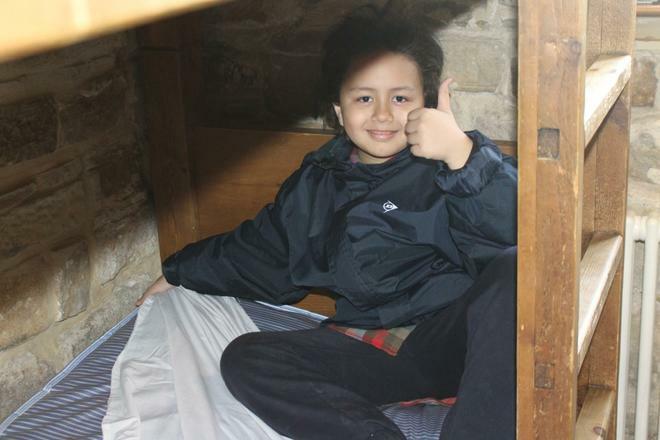 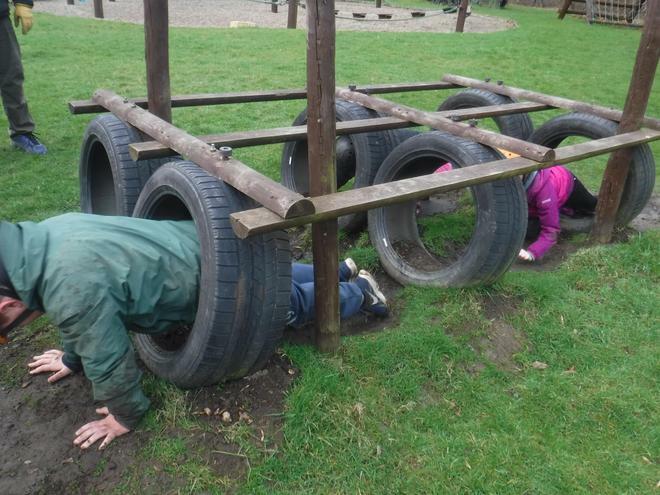 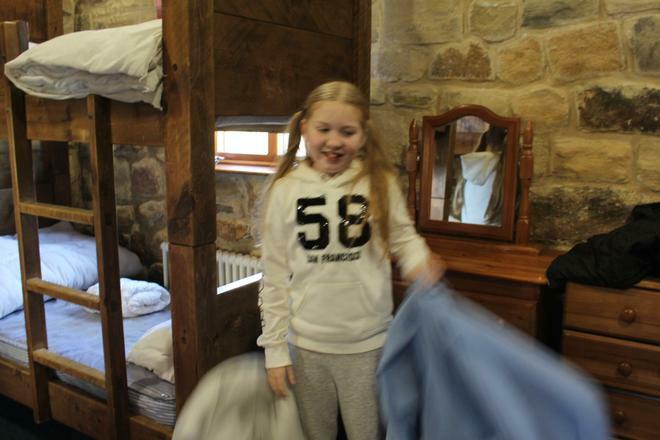 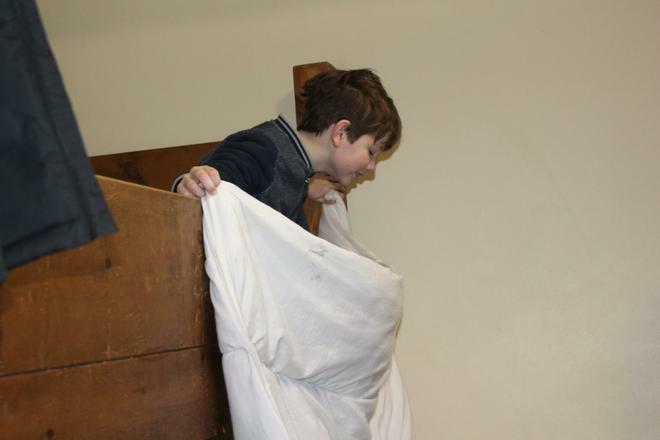 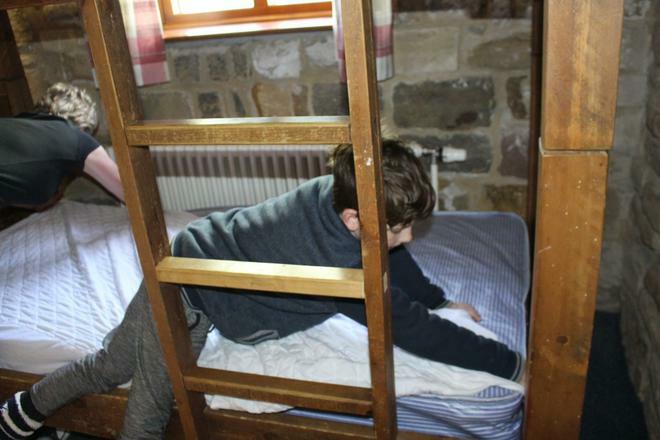 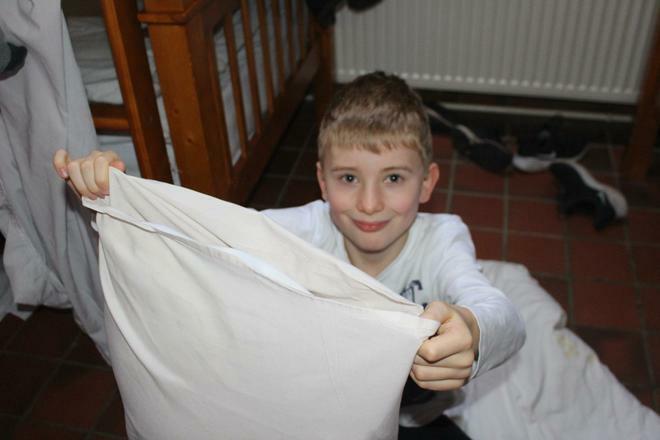 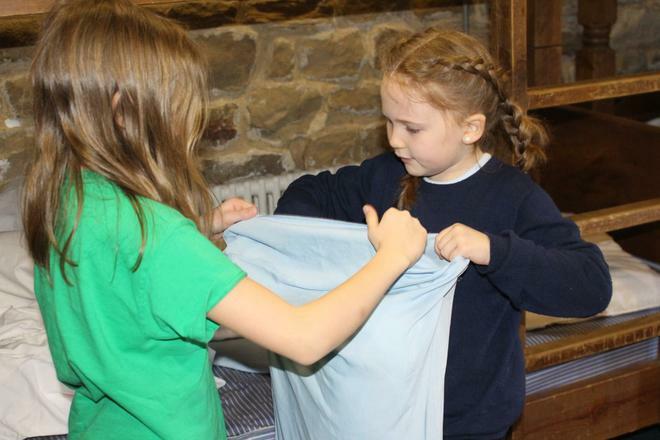 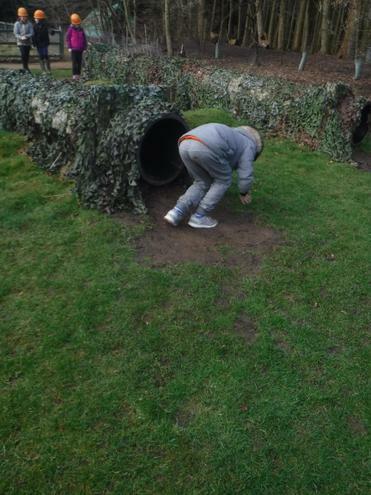 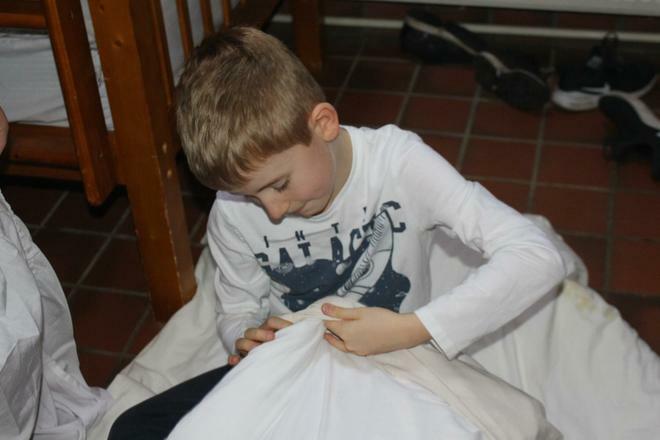 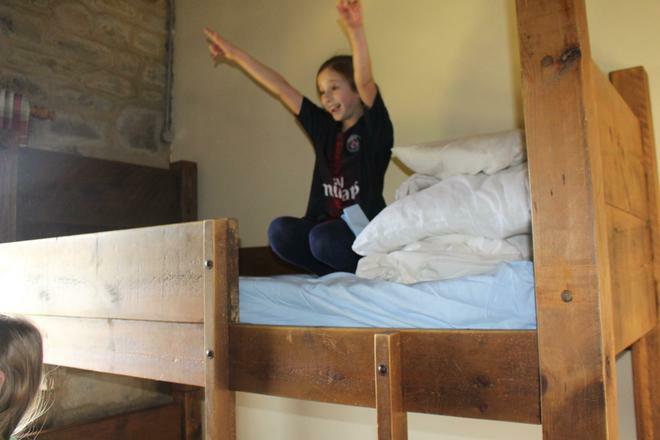 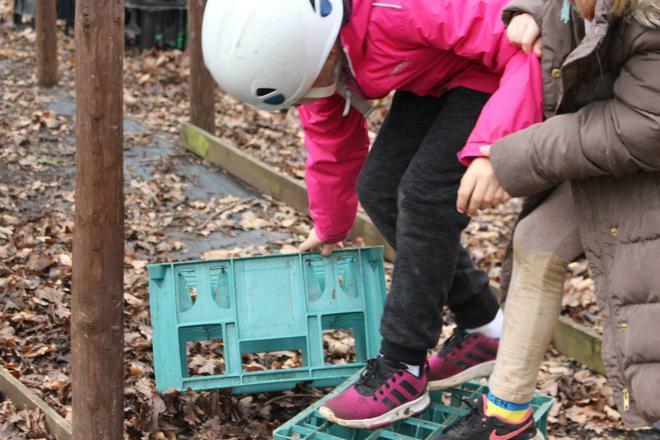 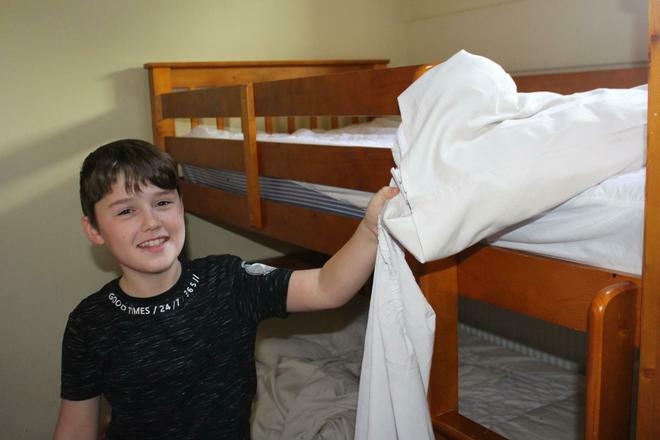 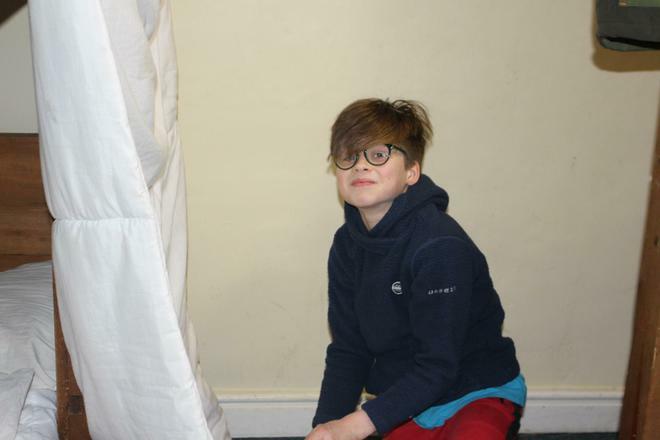 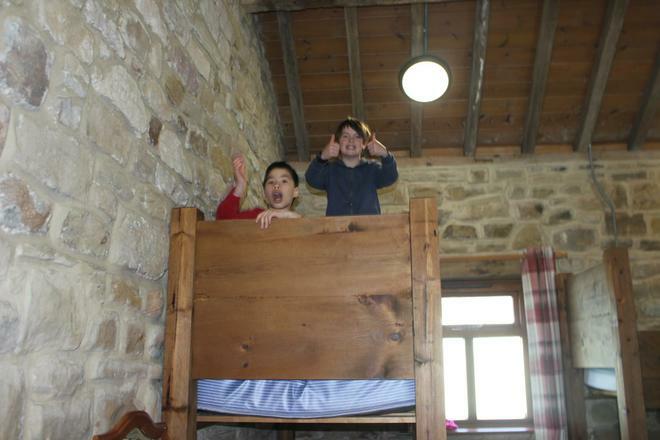 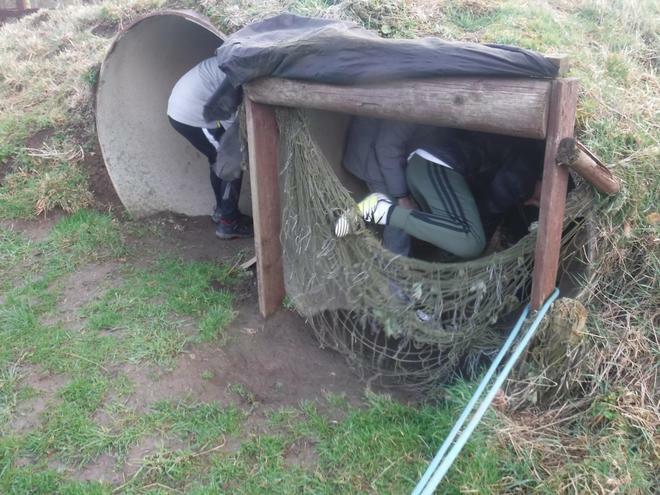 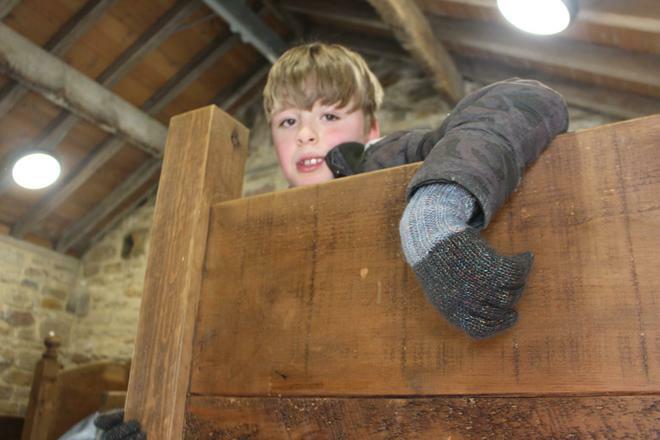 The children had some time to settle in when they first arrived and had fun trying to make their own beds...they were eventually successful! 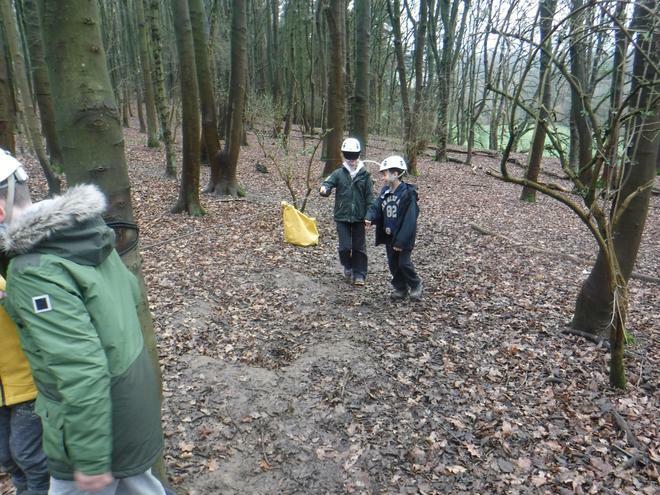 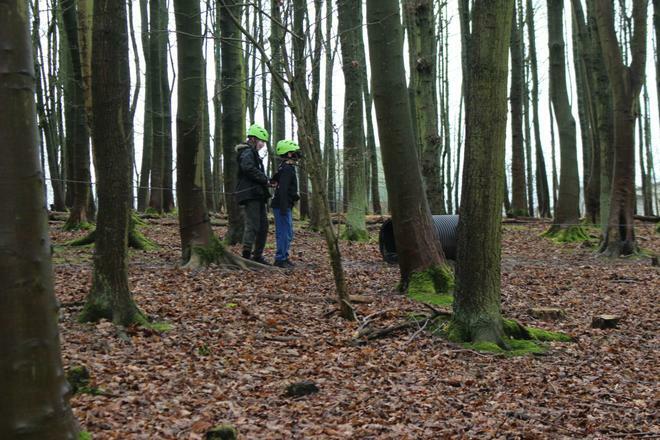 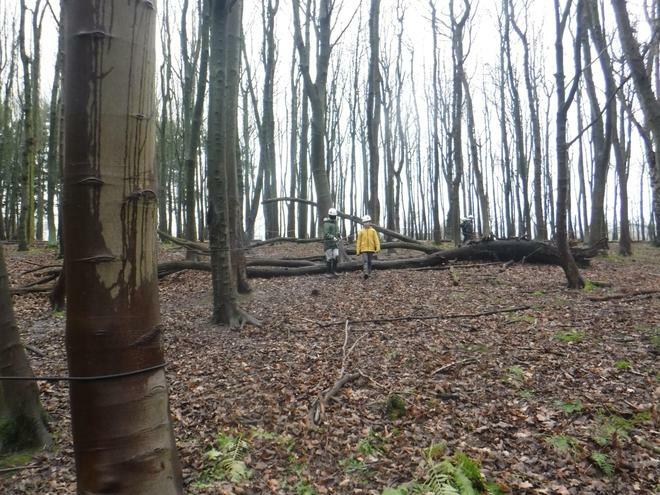 After that they went on a walk to explore the site before heading back for lunch. 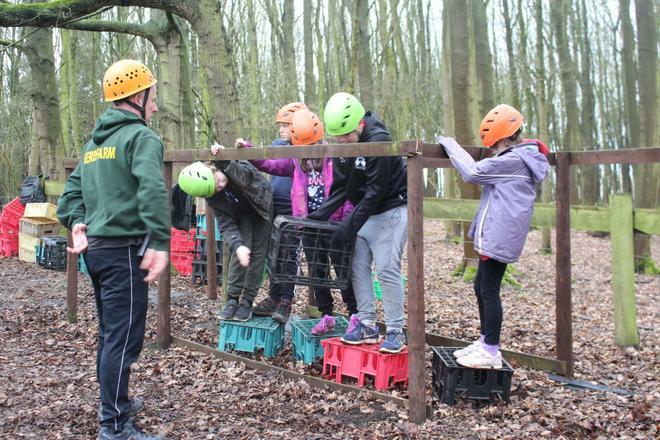 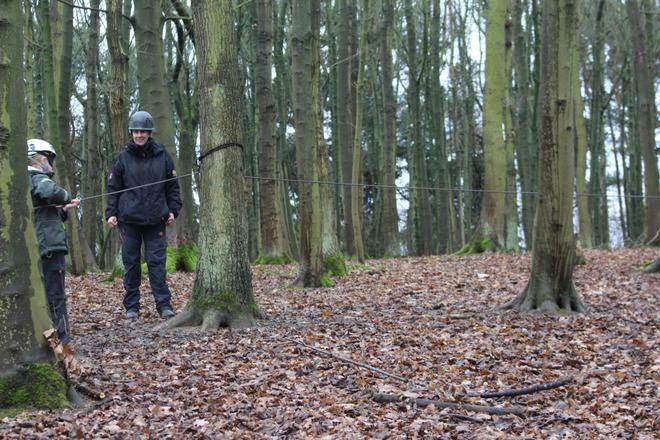 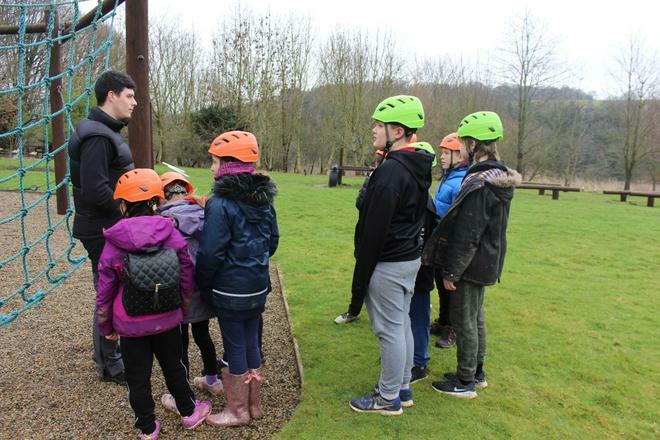 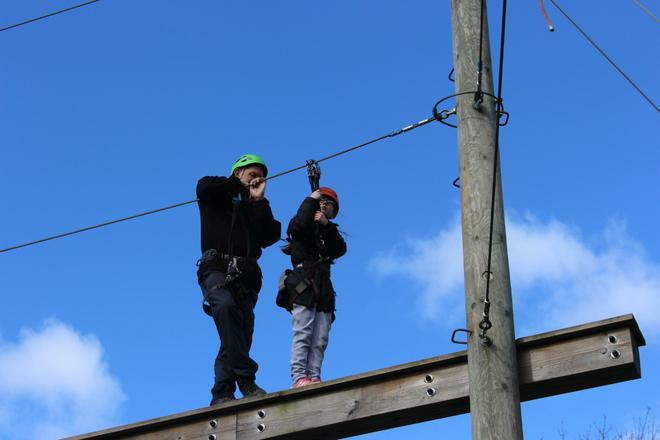 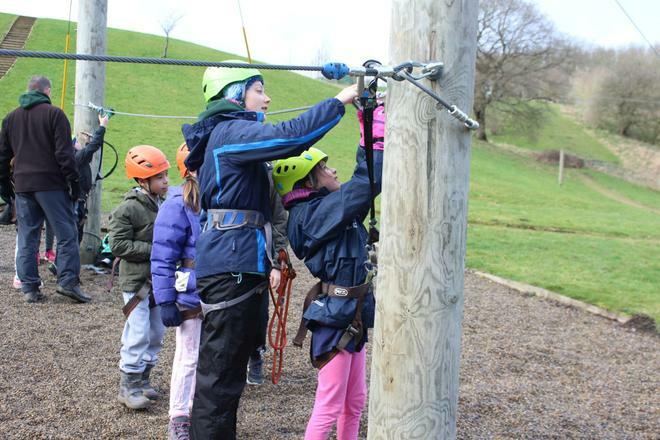 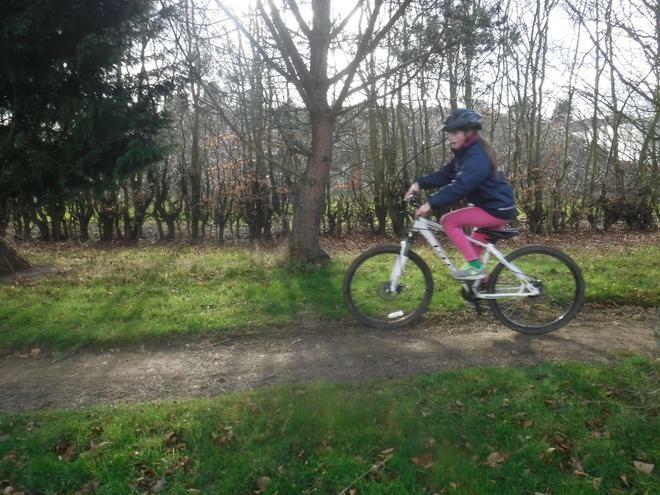 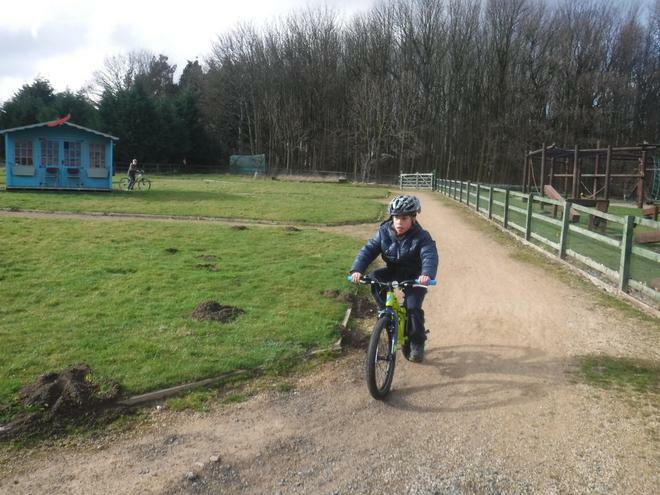 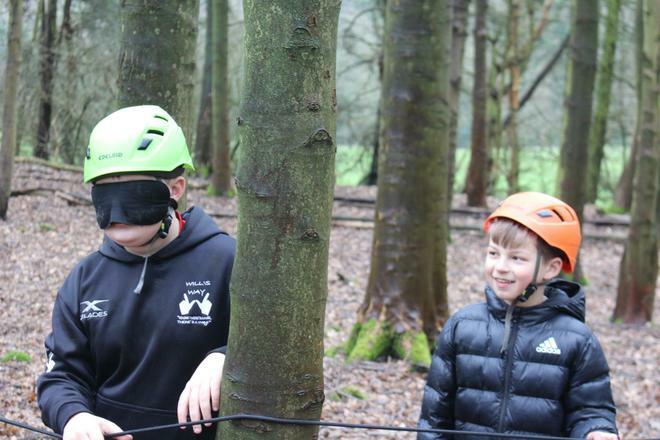 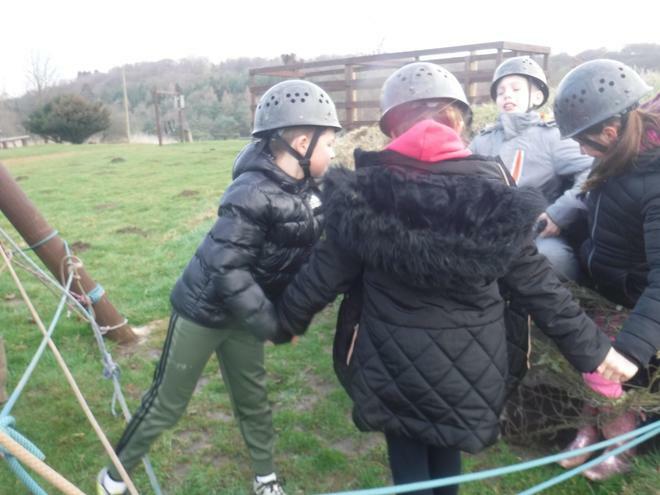 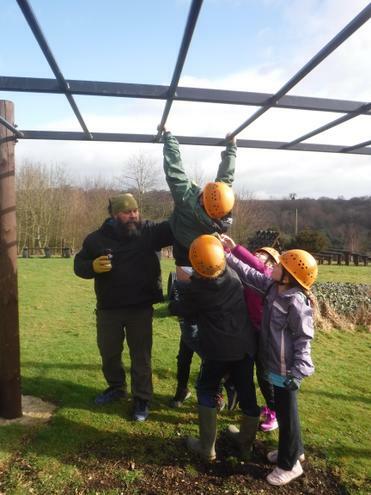 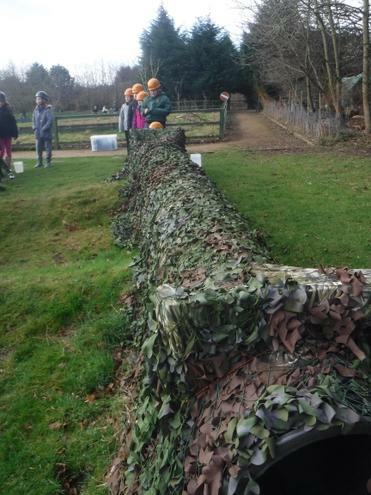 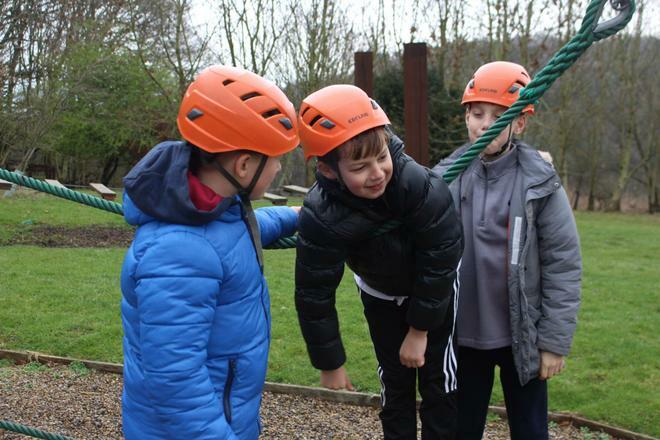 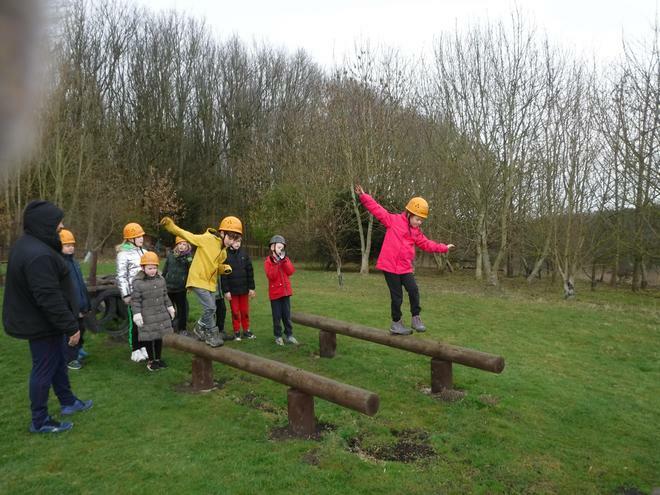 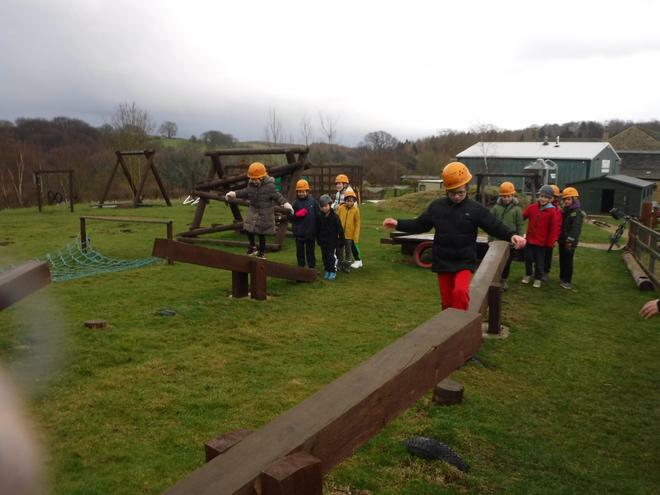 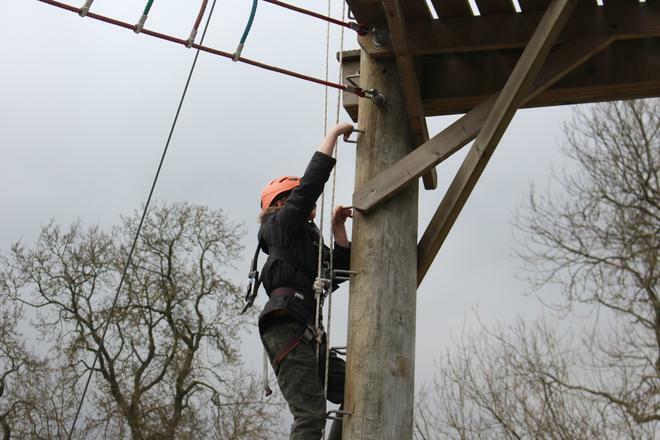 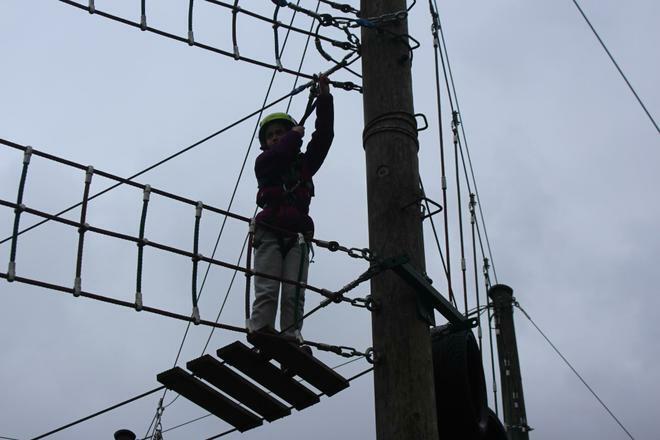 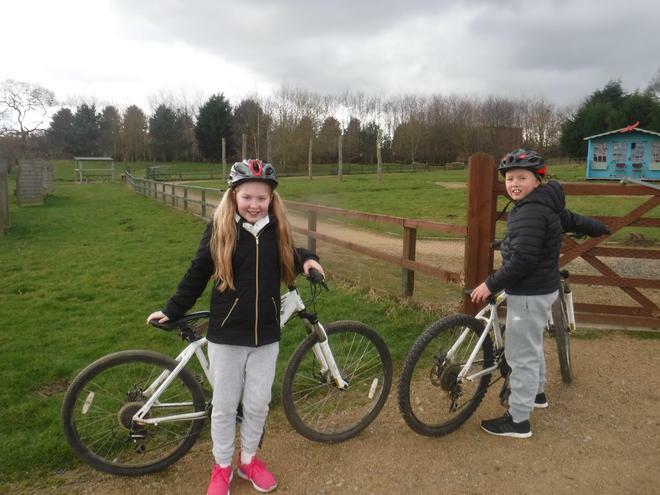 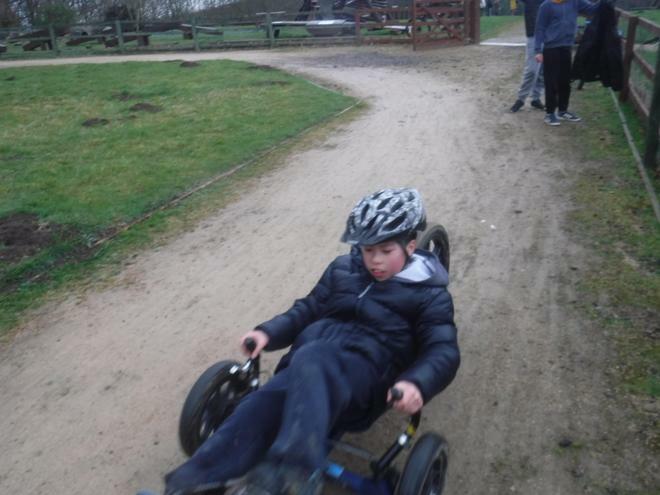 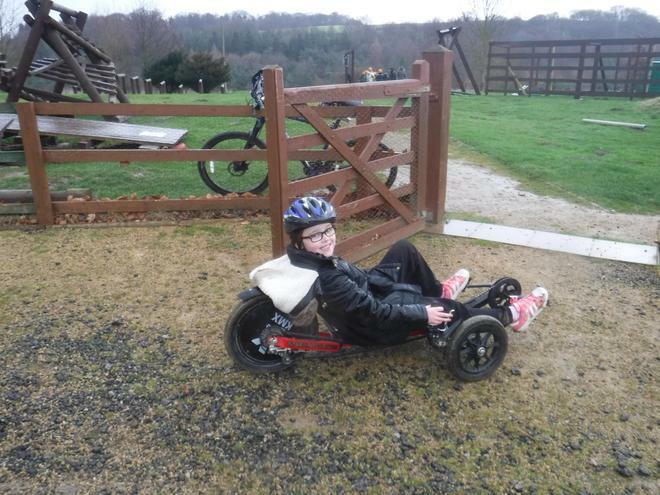 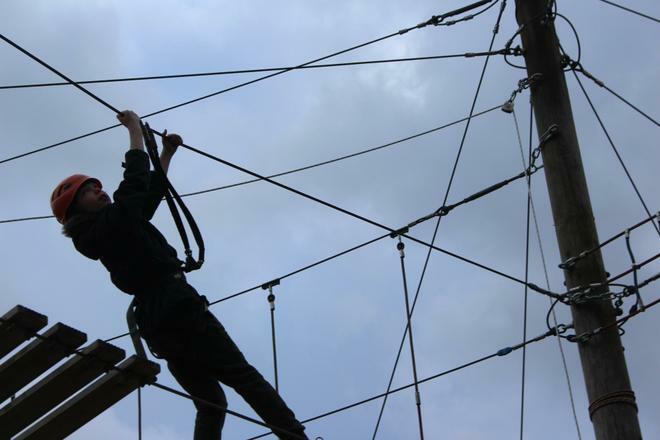 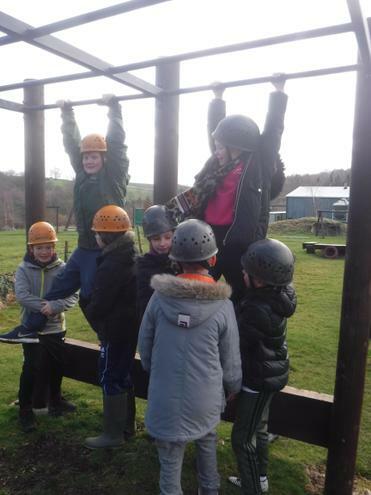 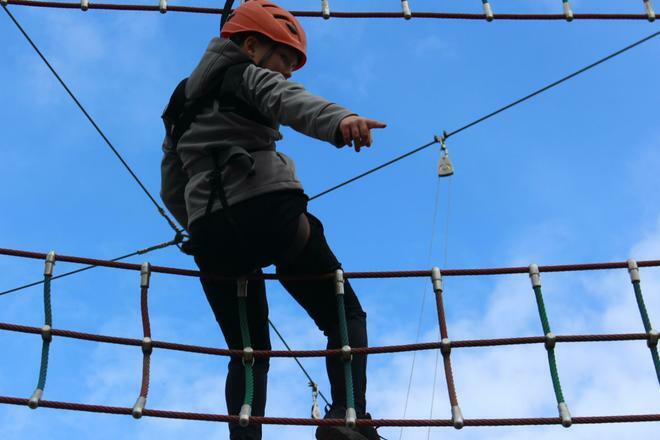 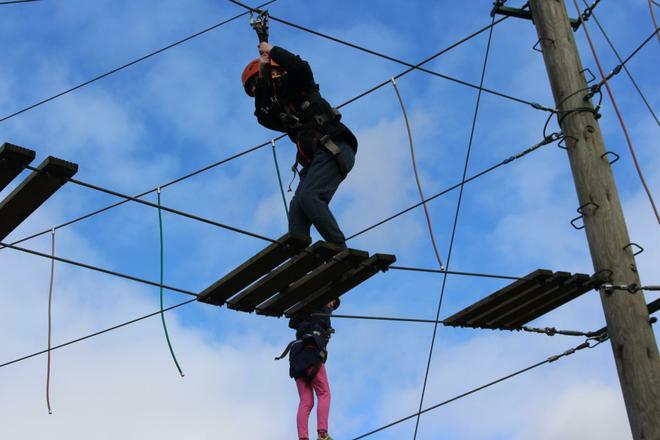 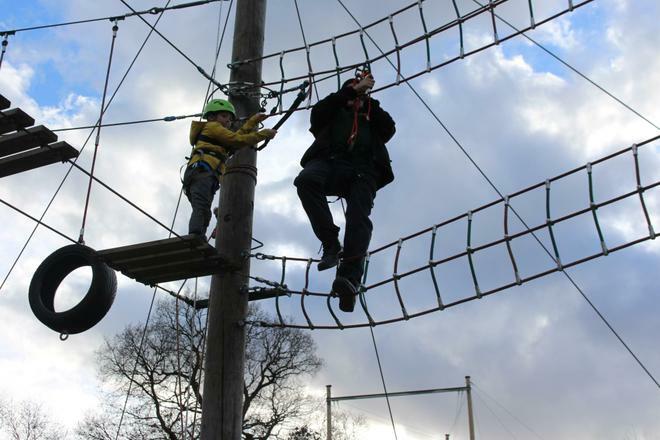 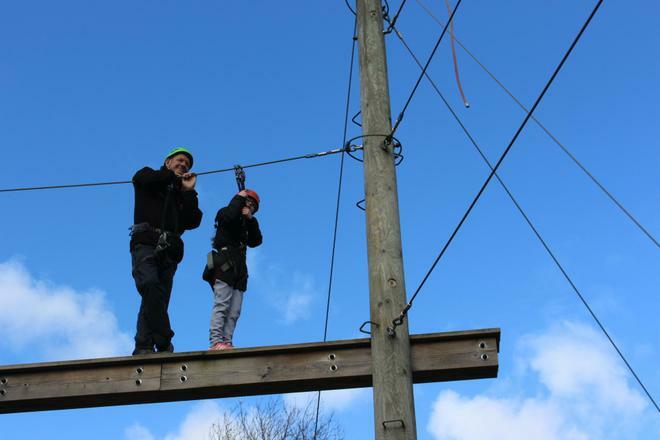 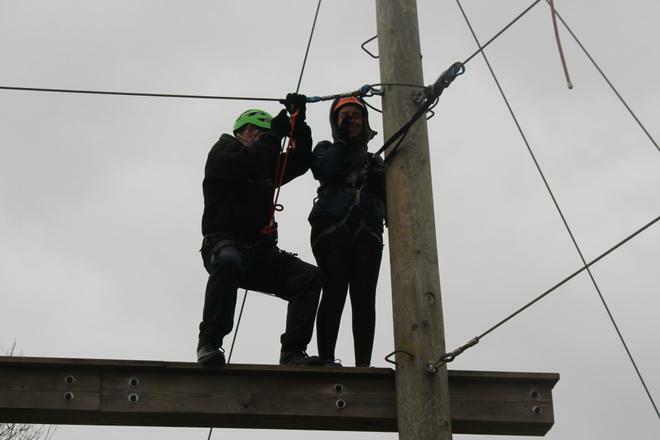 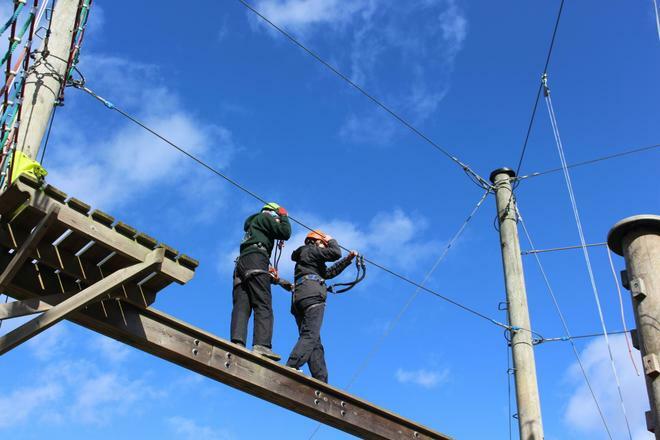 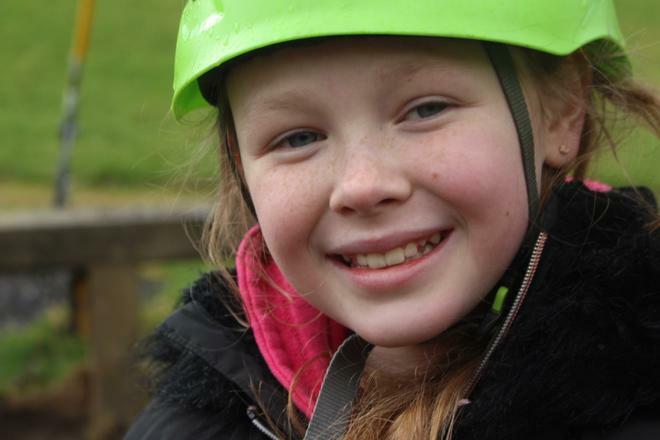 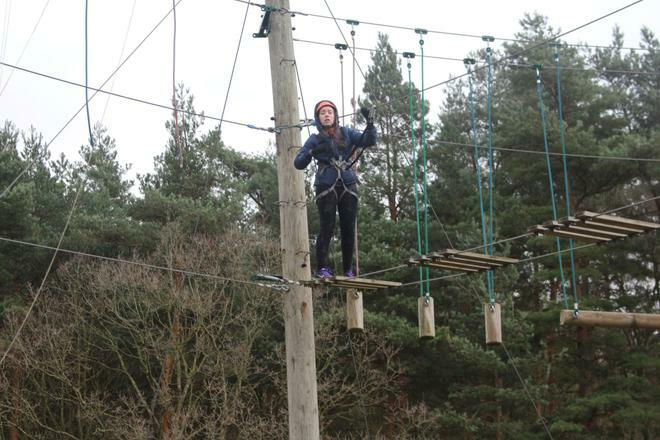 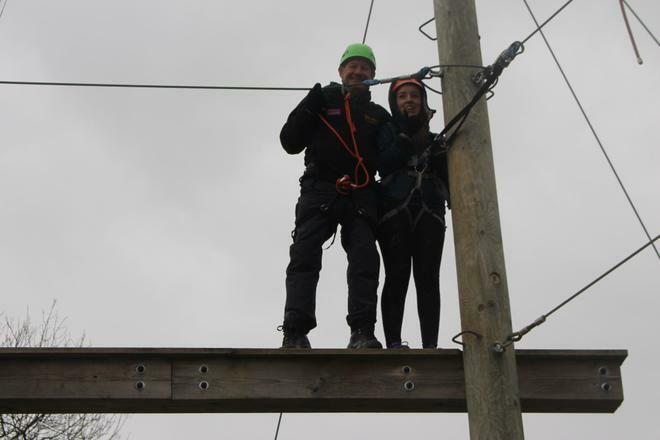 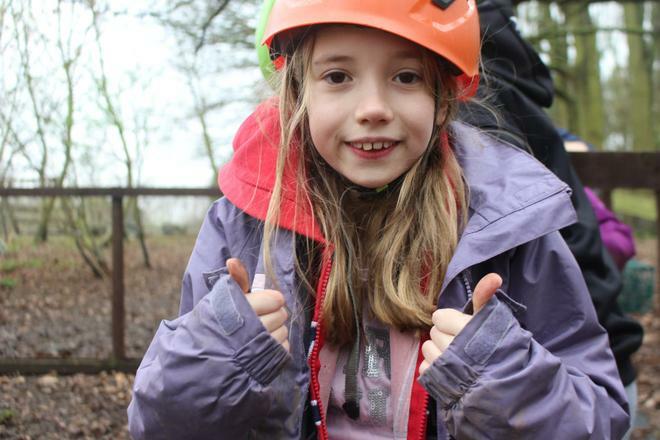 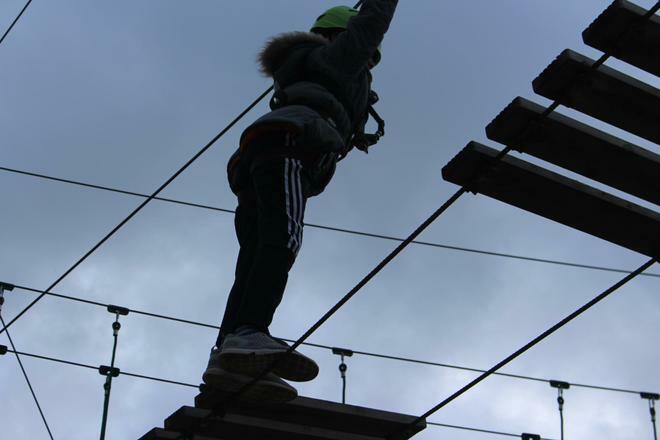 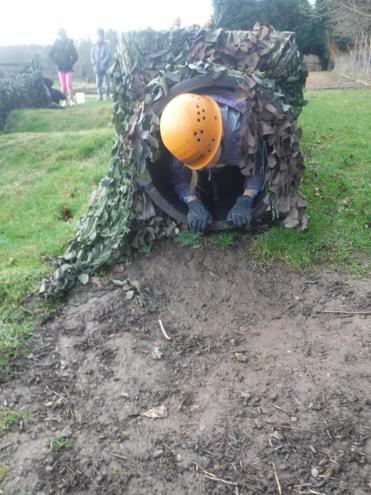 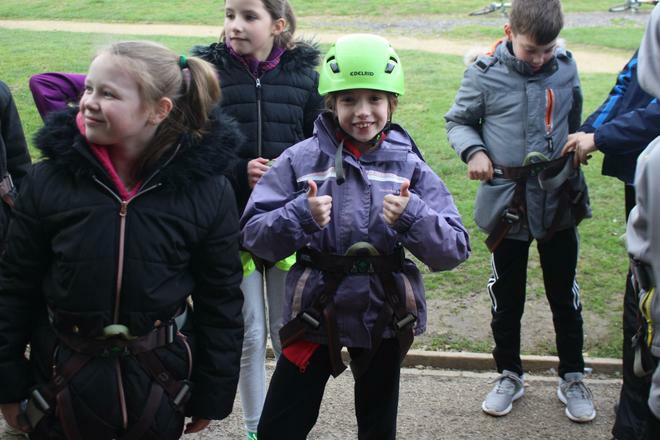 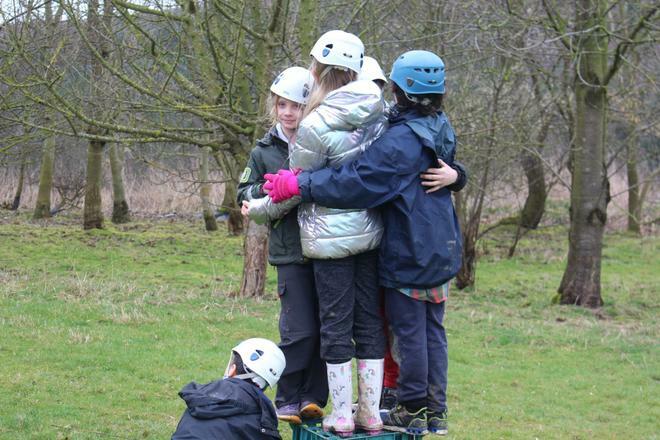 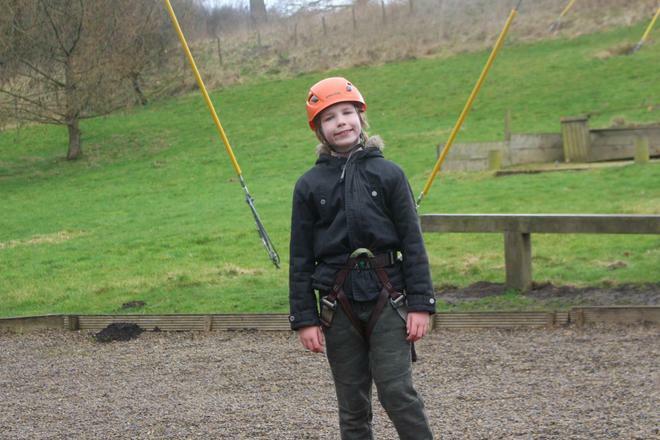 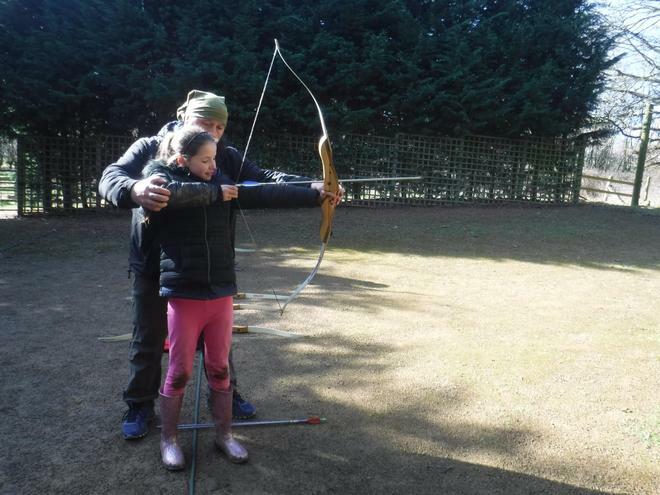 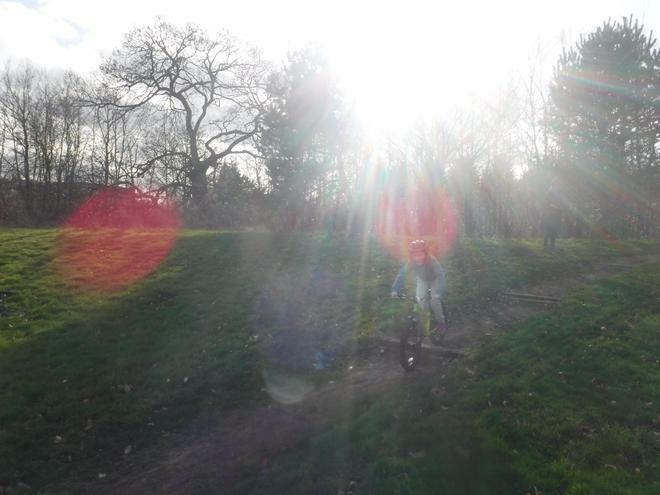 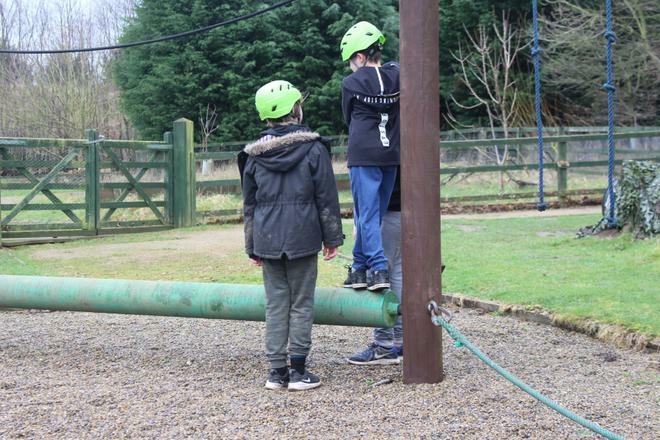 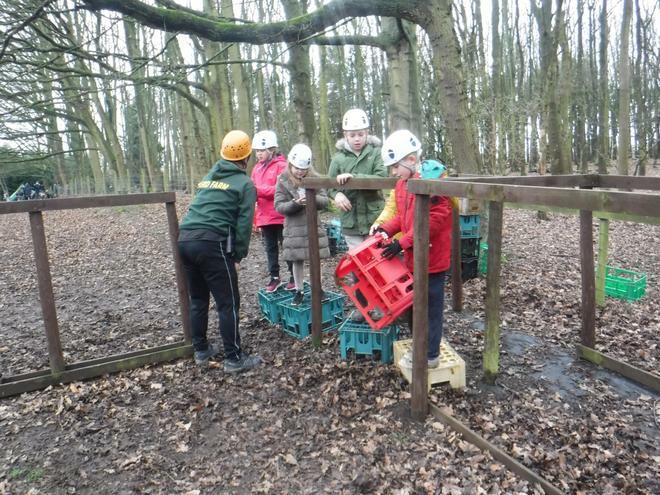 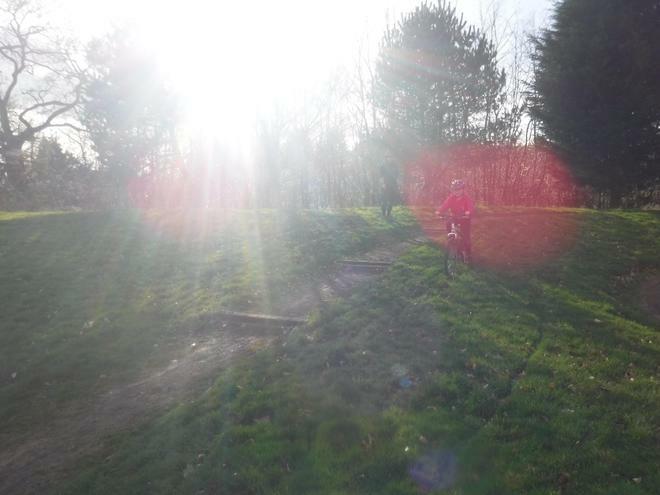 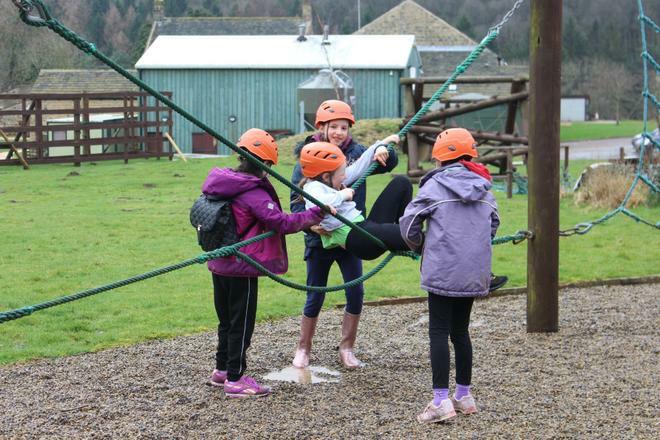 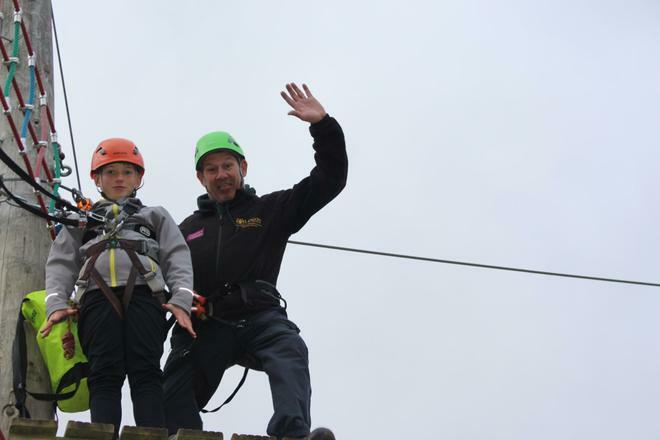 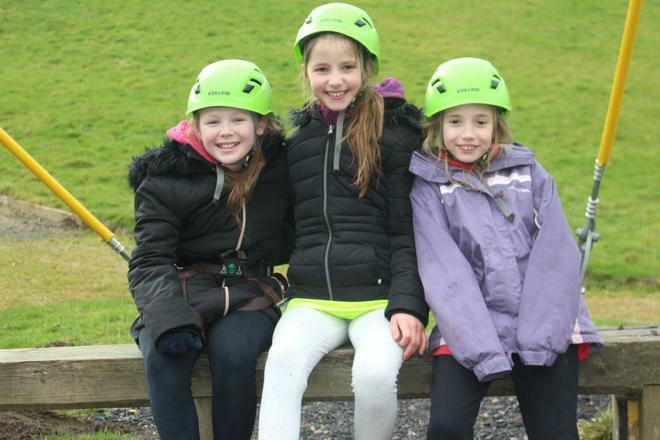 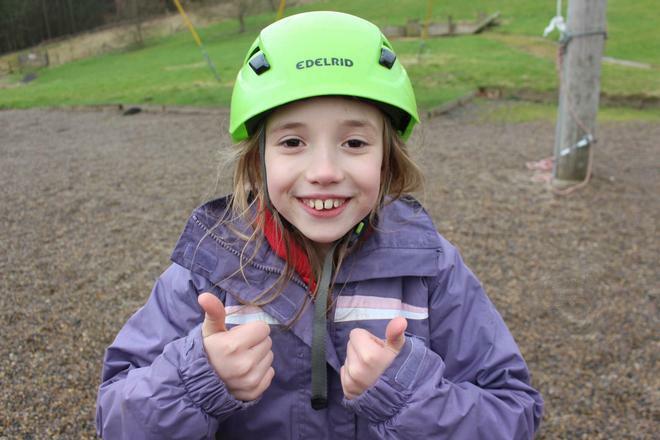 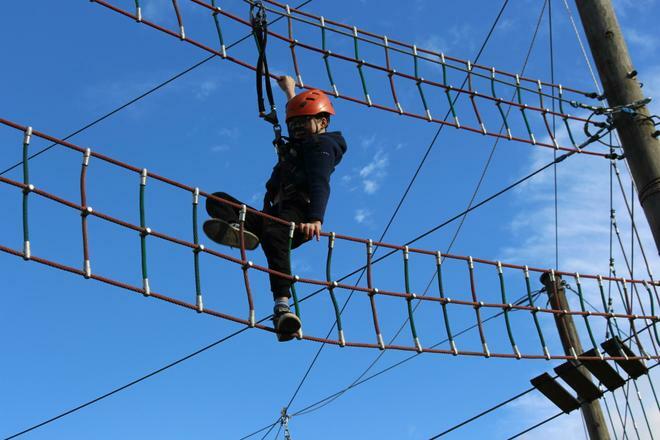 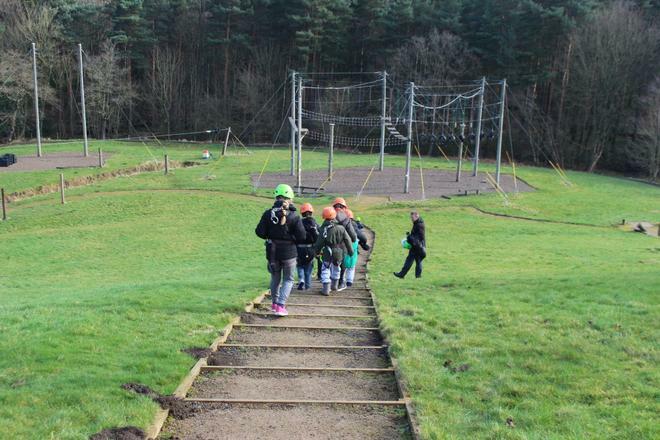 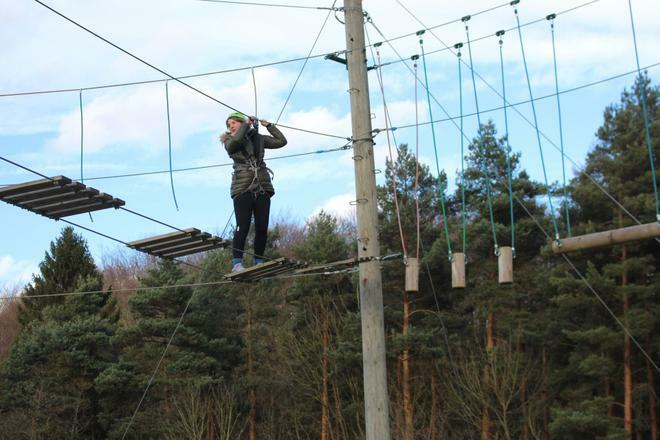 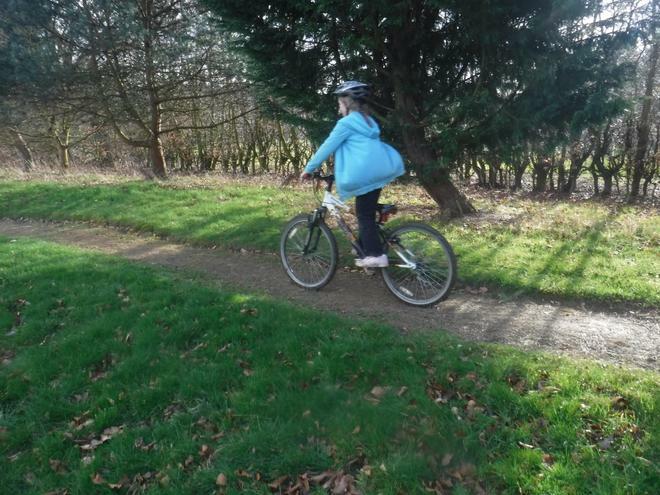 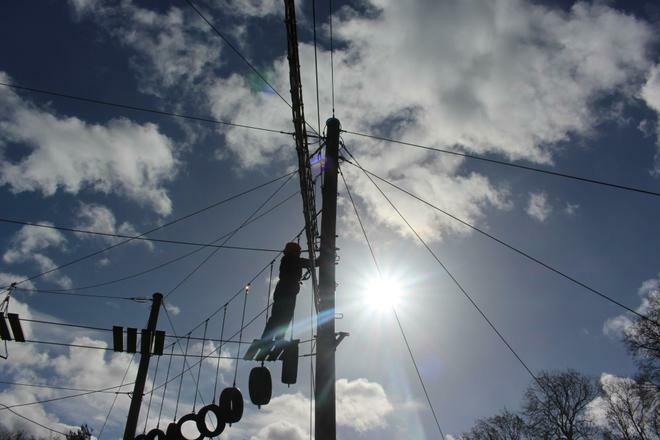 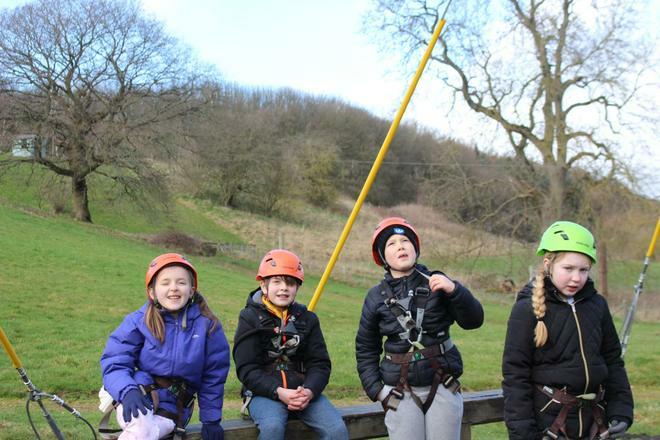 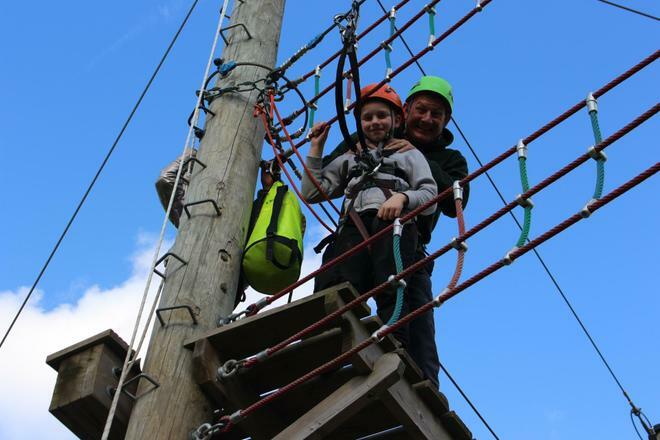 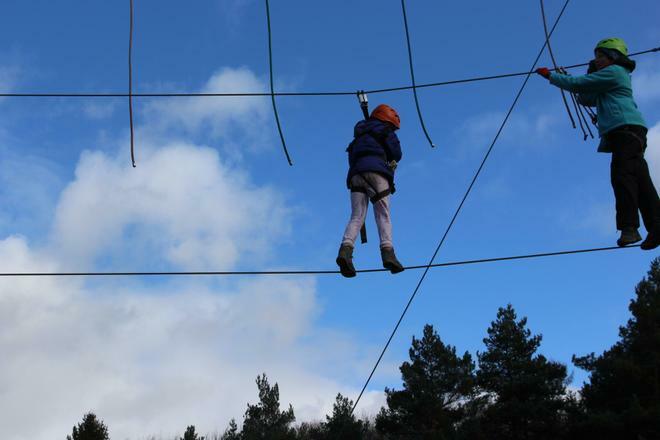 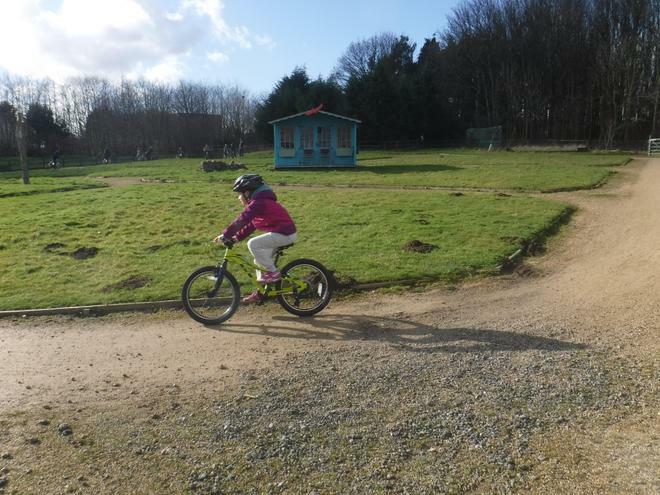 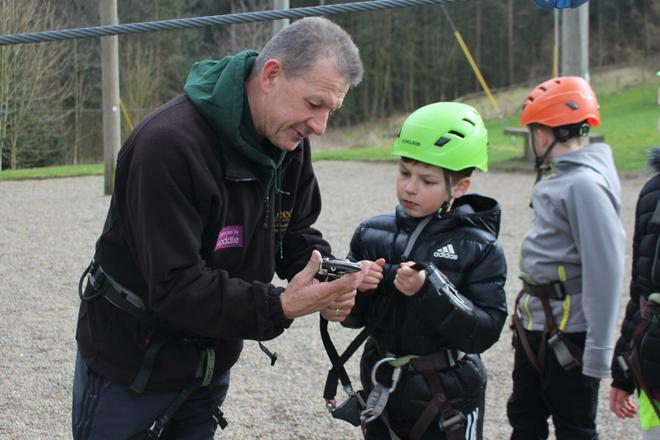 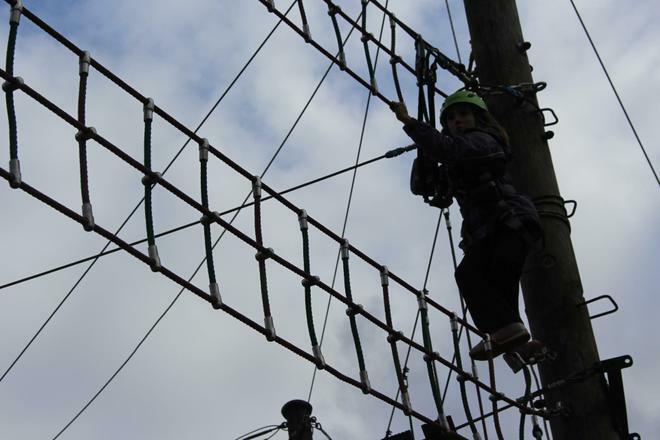 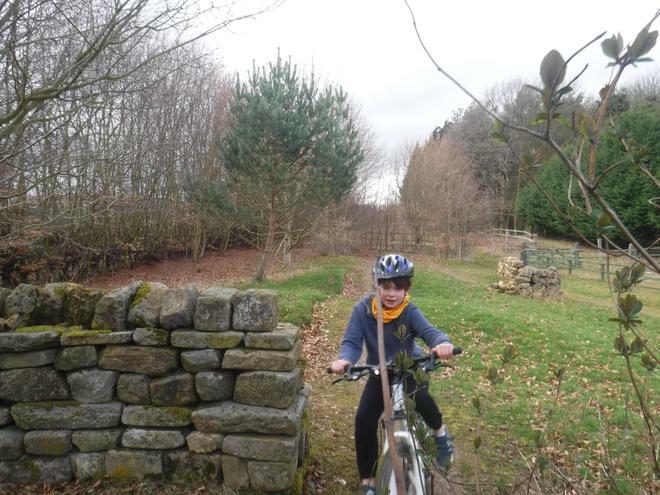 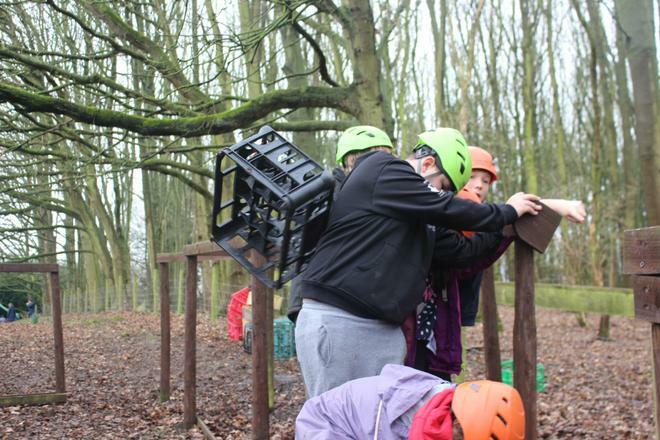 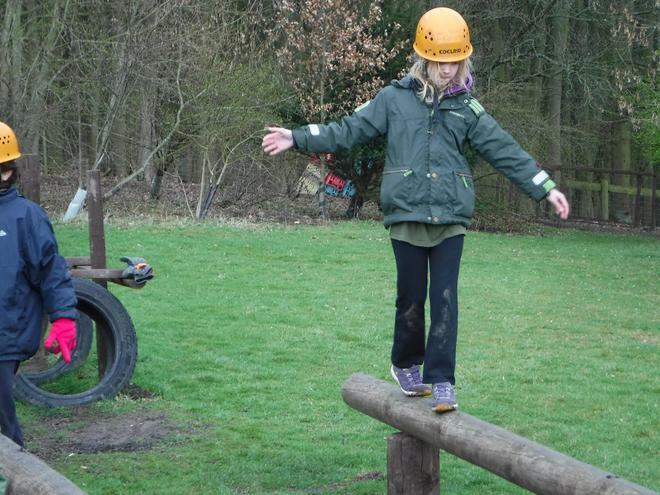 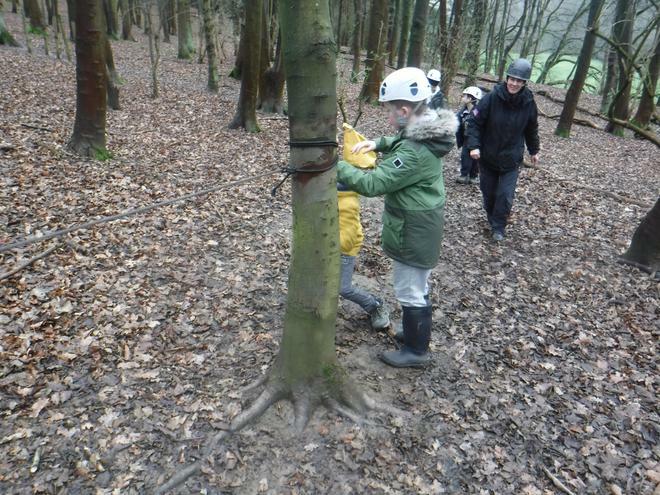 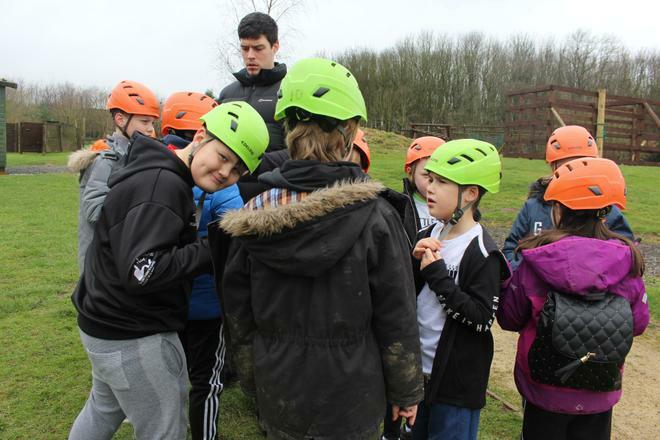 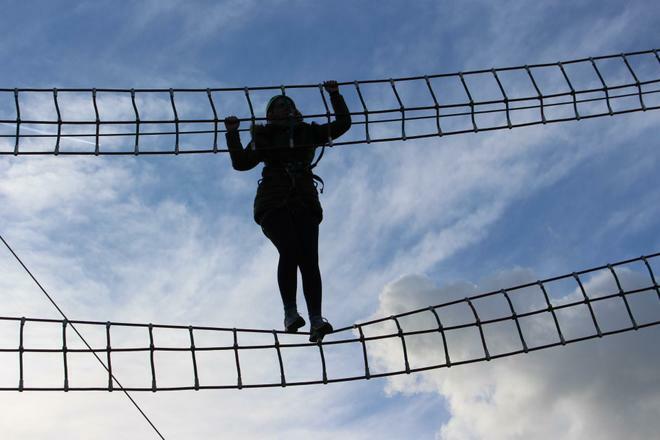 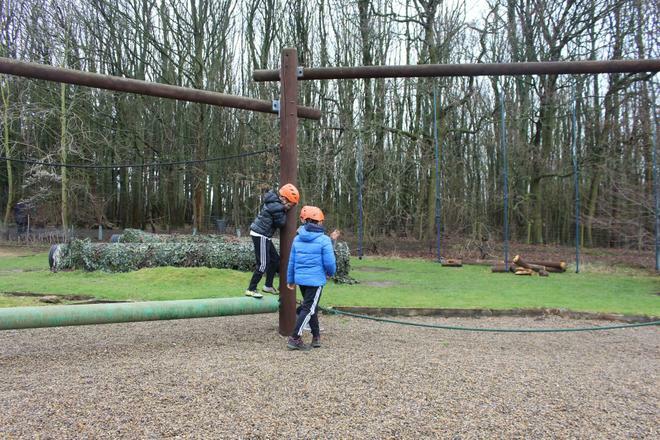 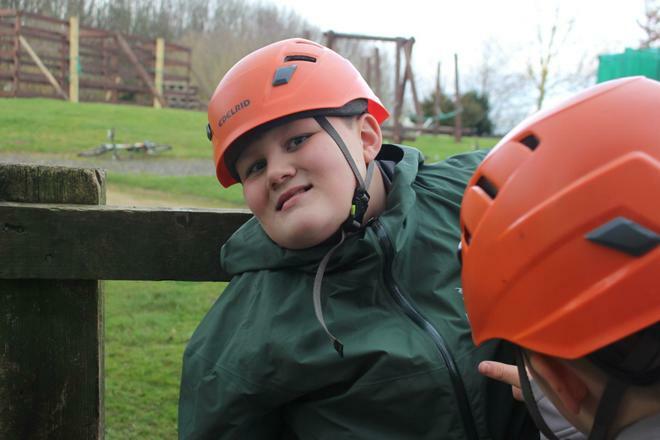 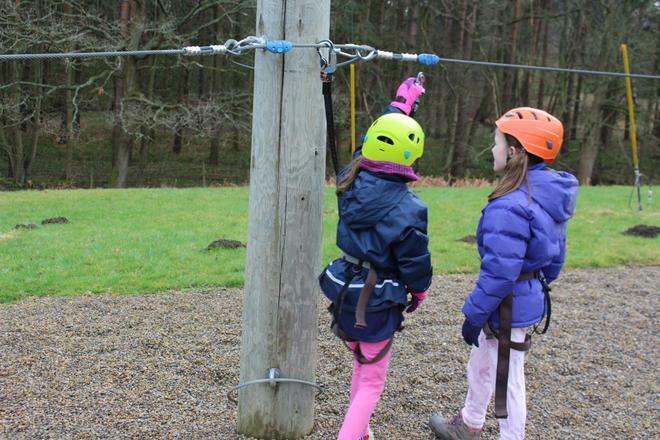 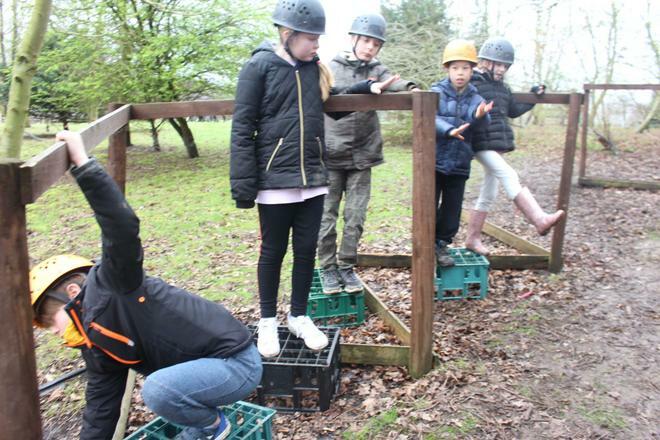 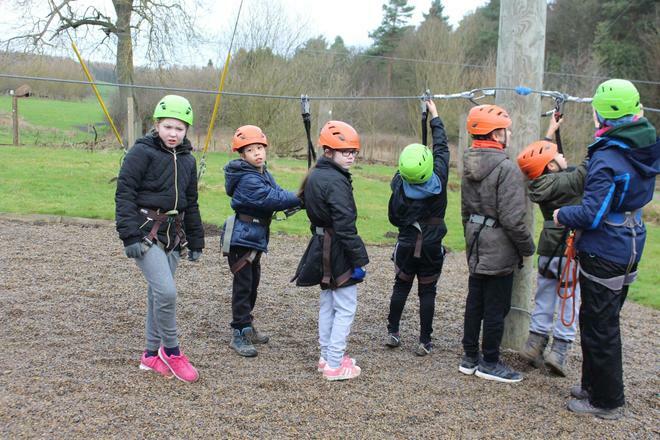 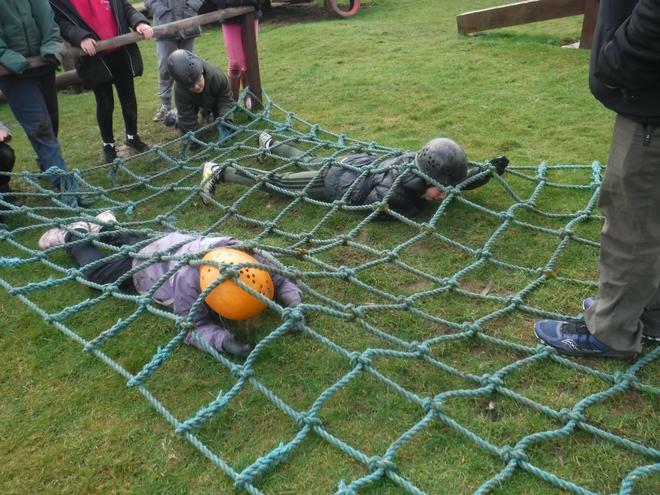 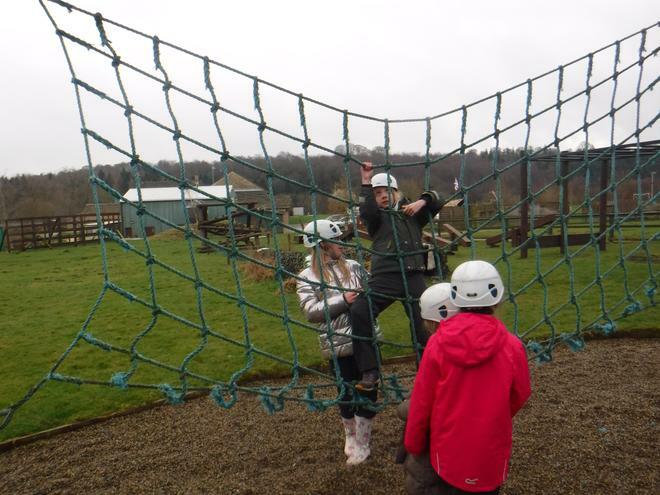 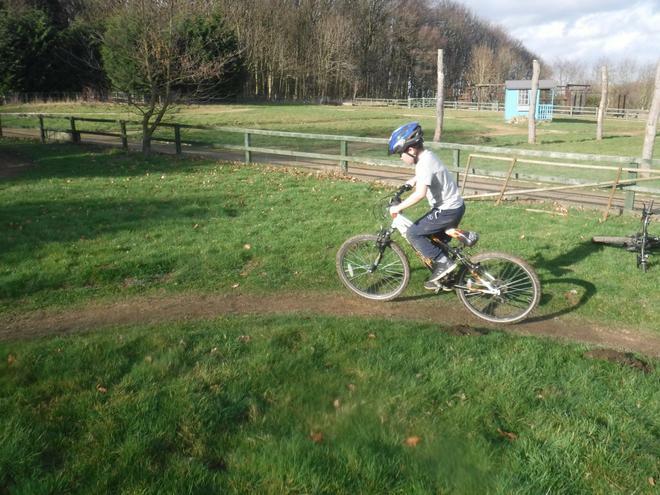 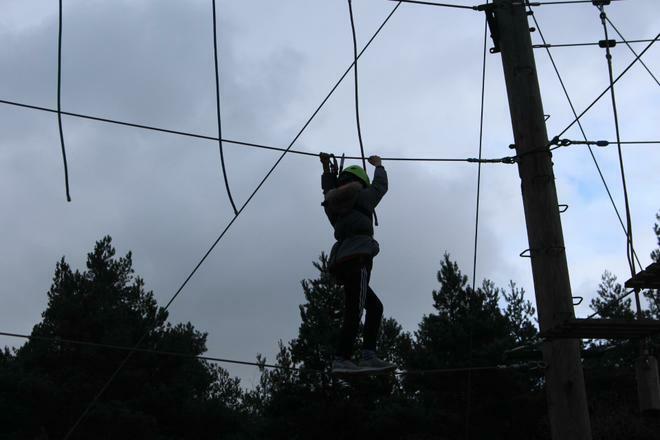 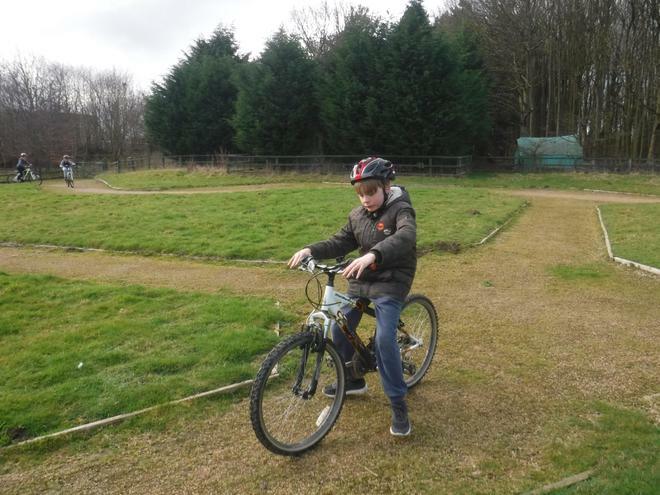 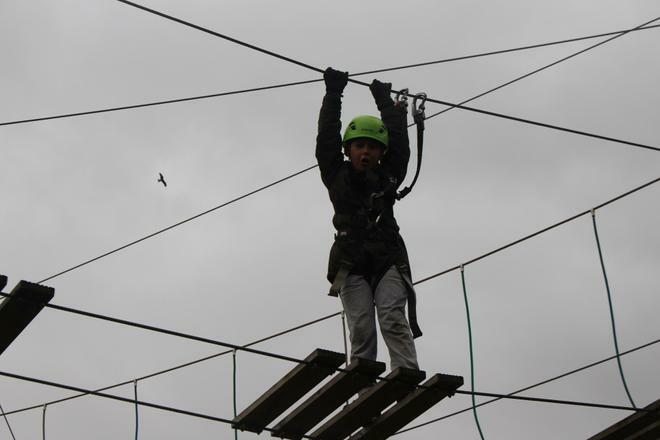 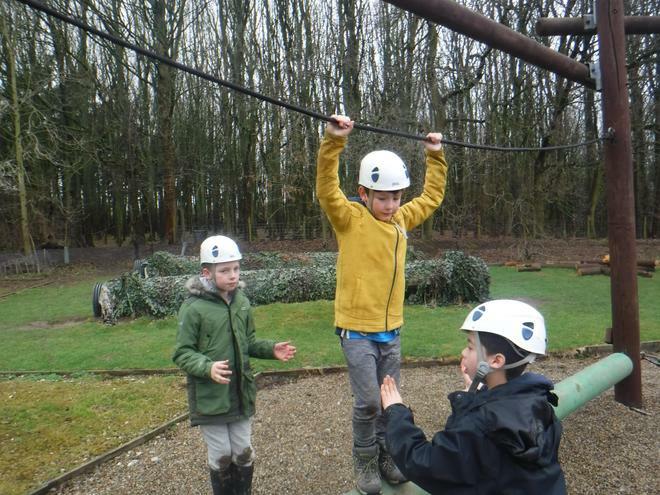 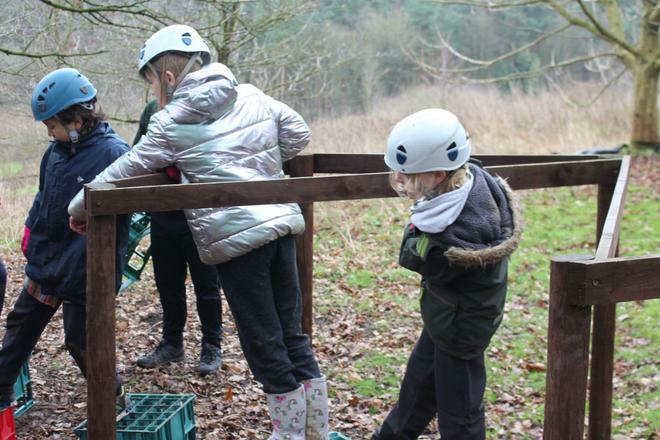 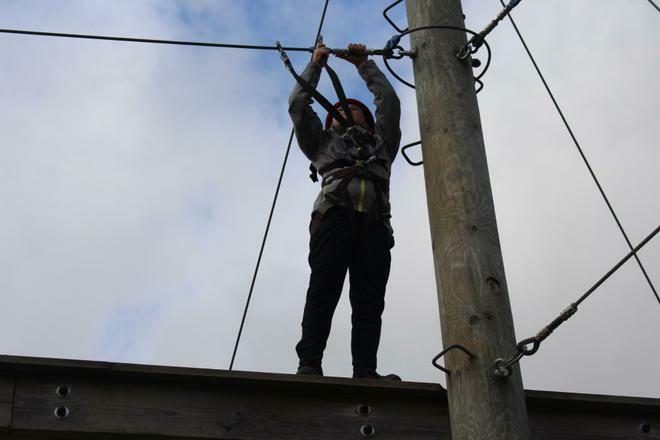 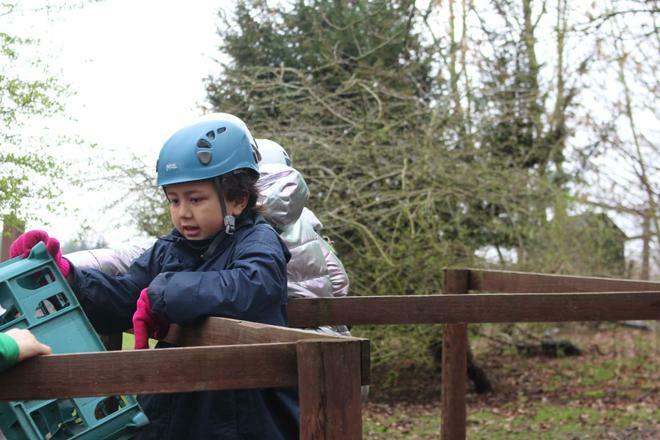 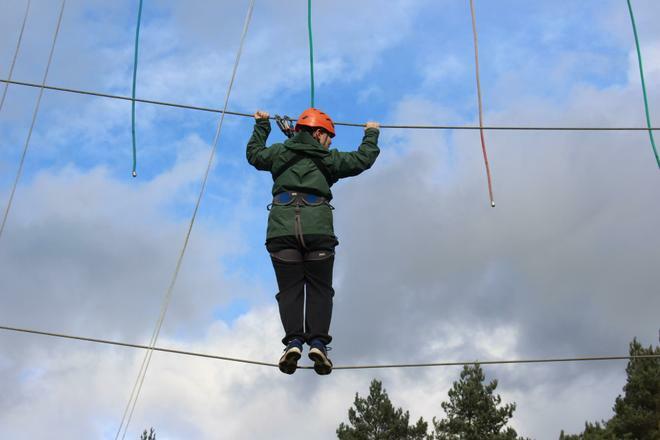 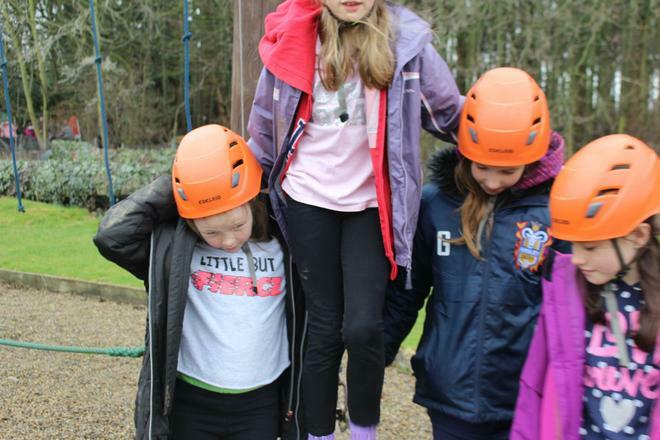 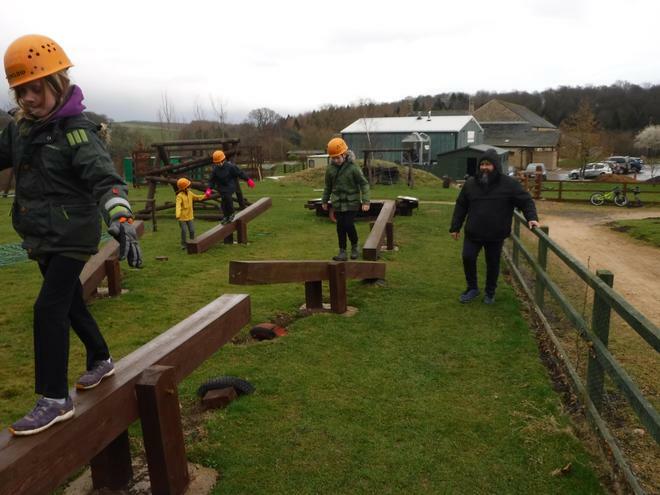 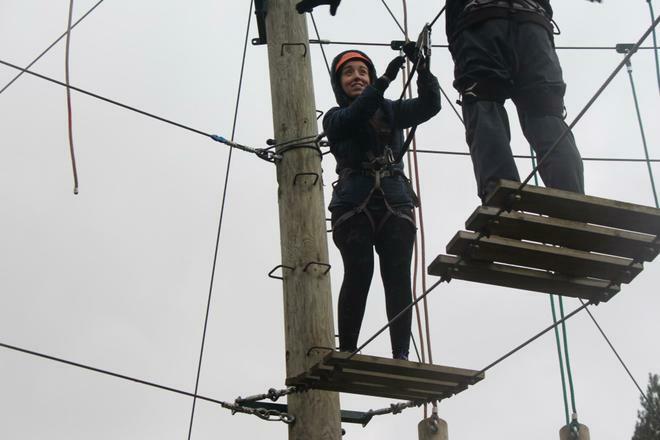 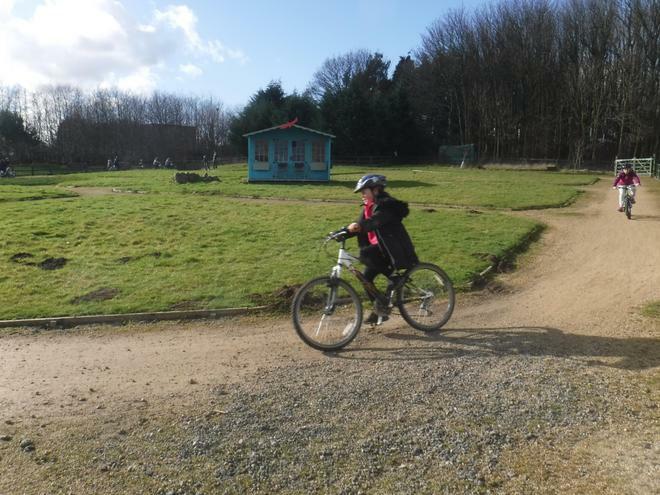 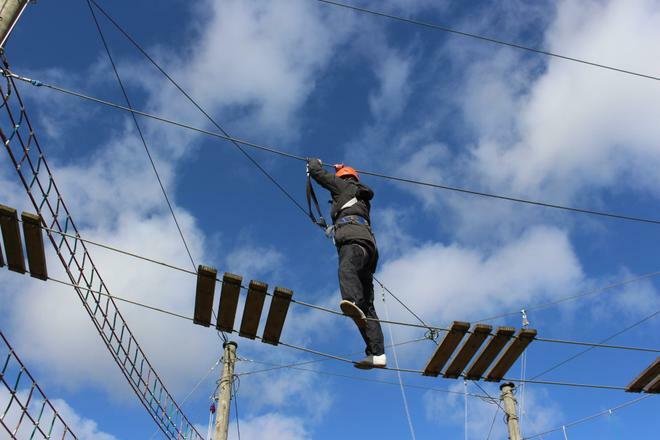 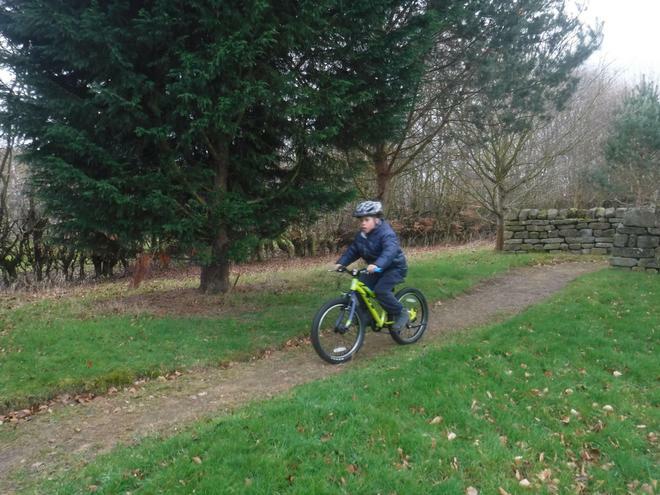 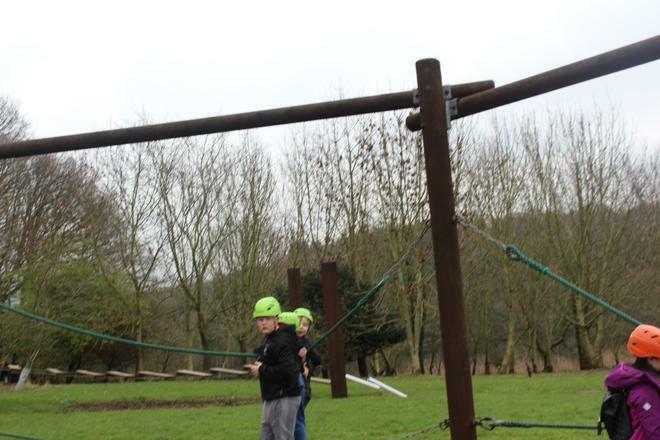 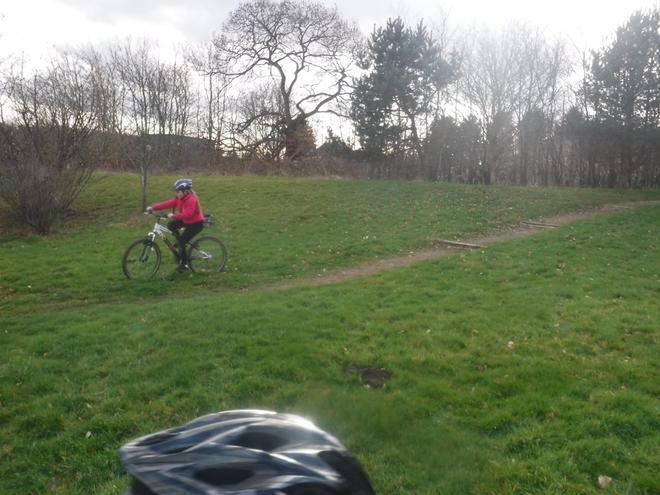 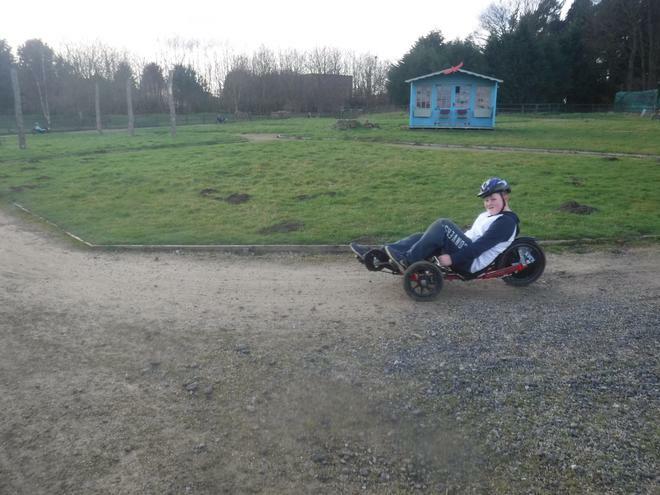 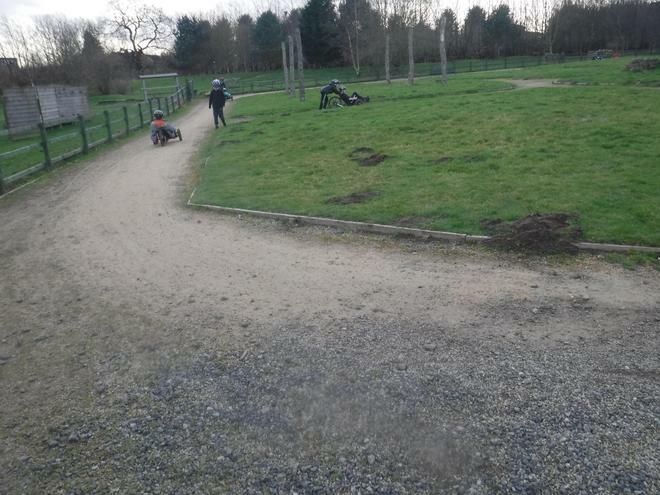 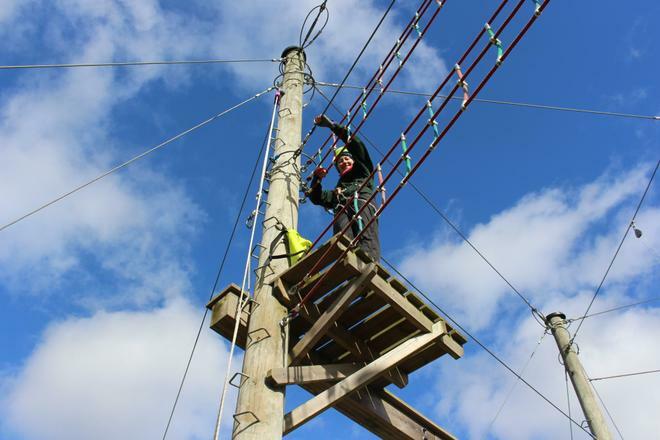 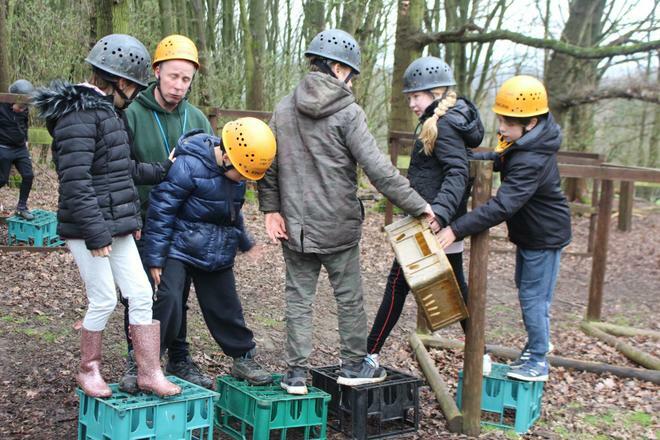 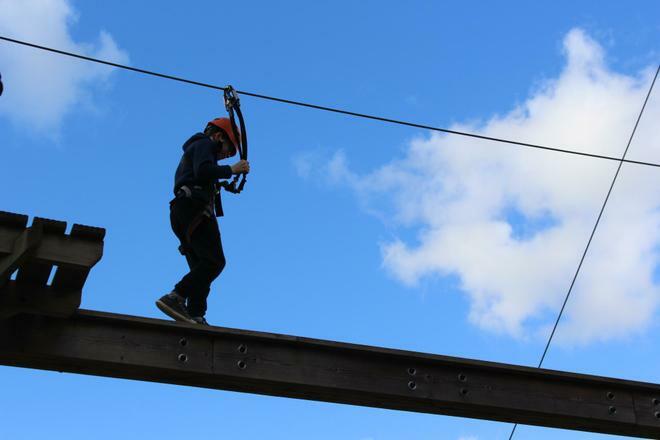 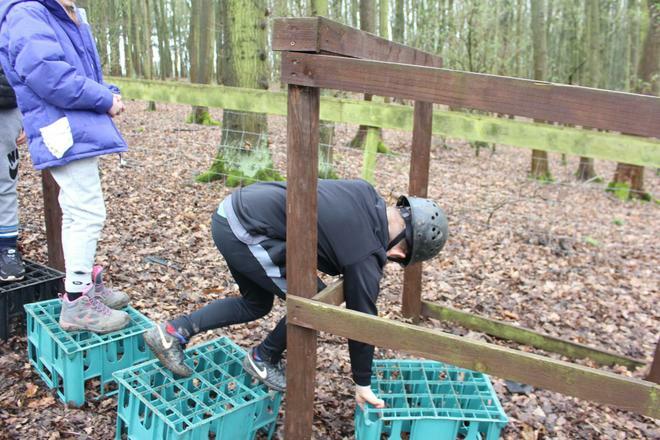 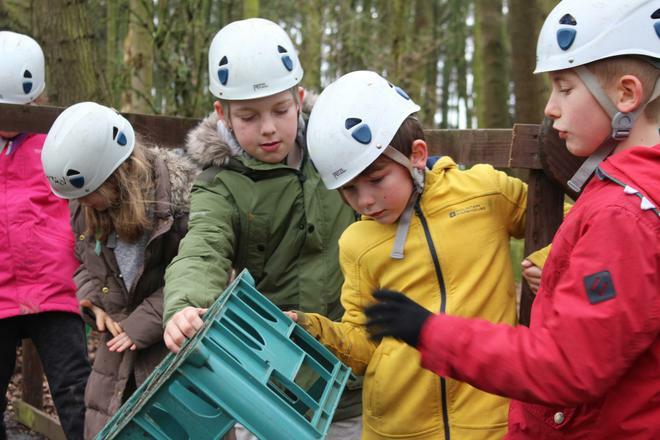 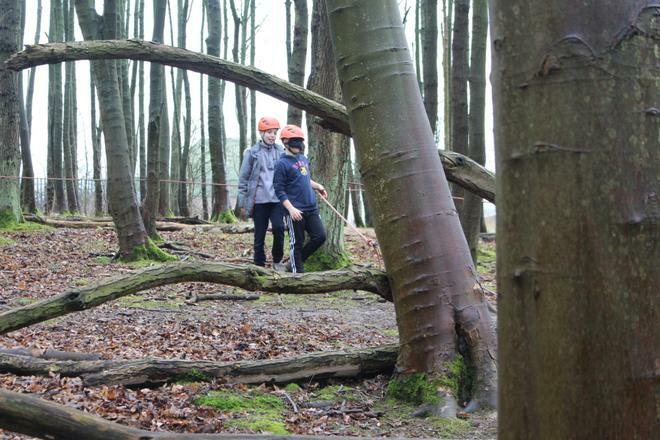 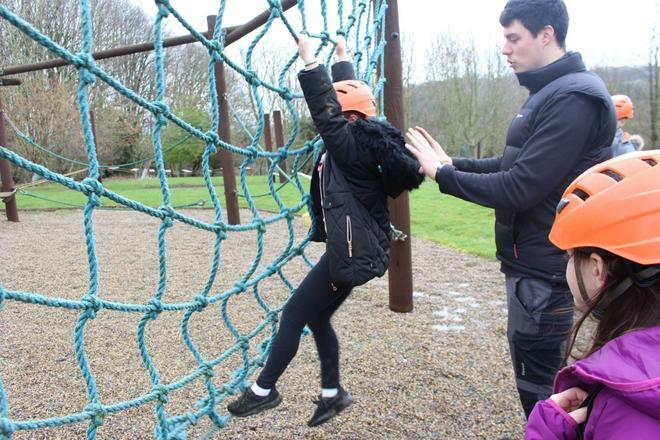 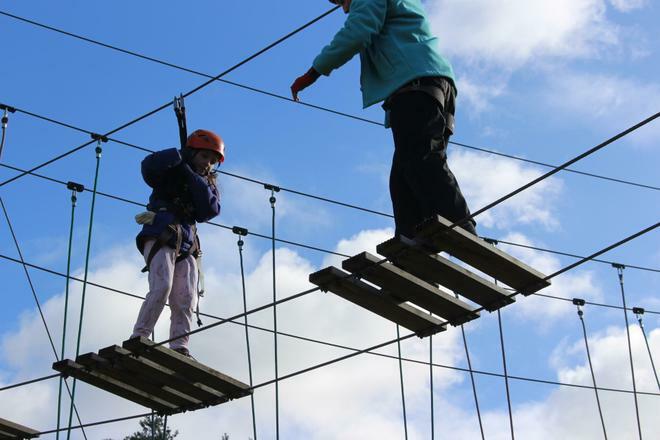 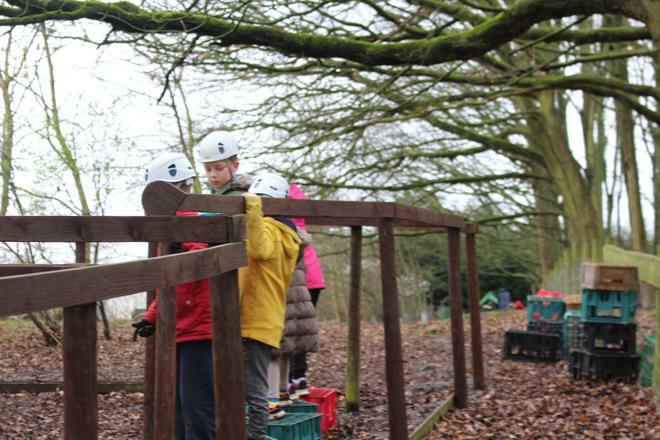 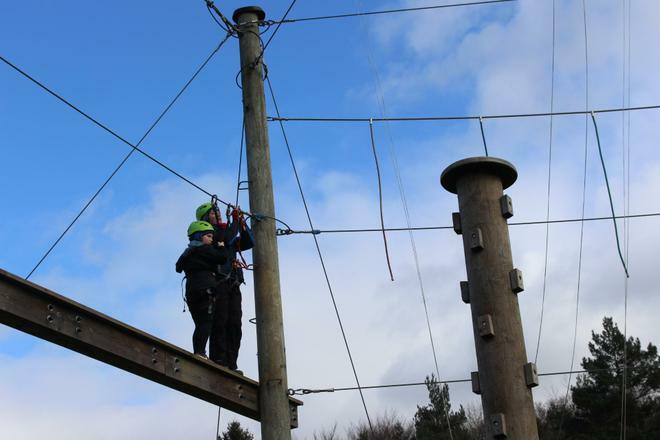 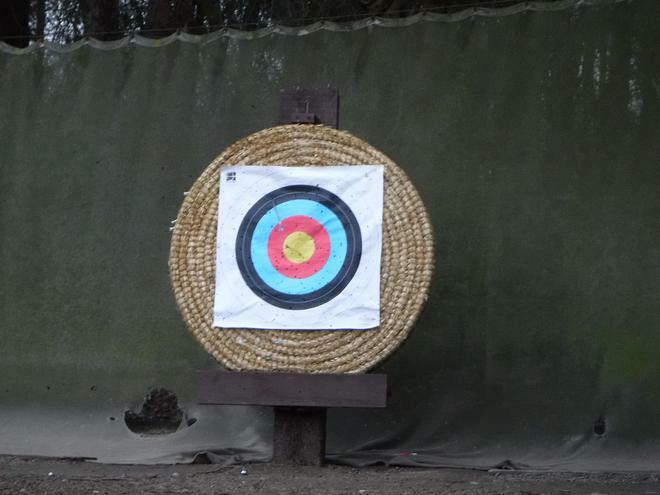 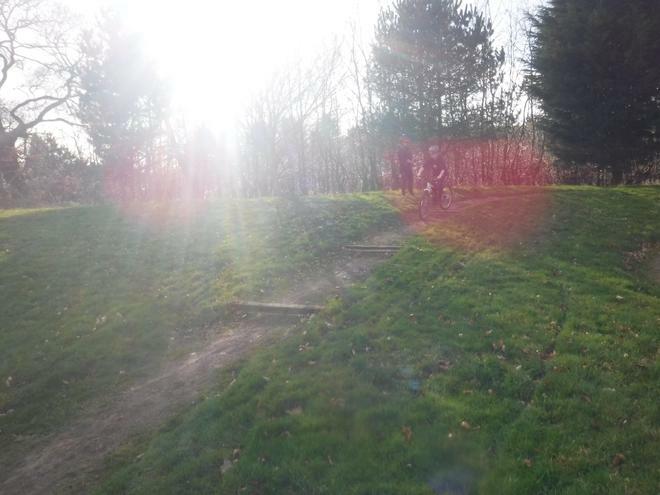 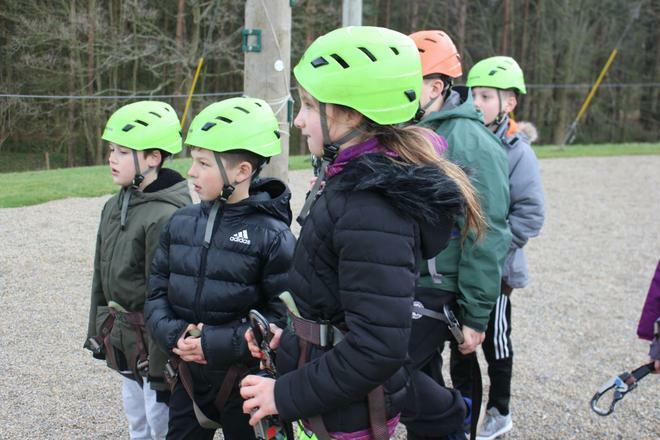 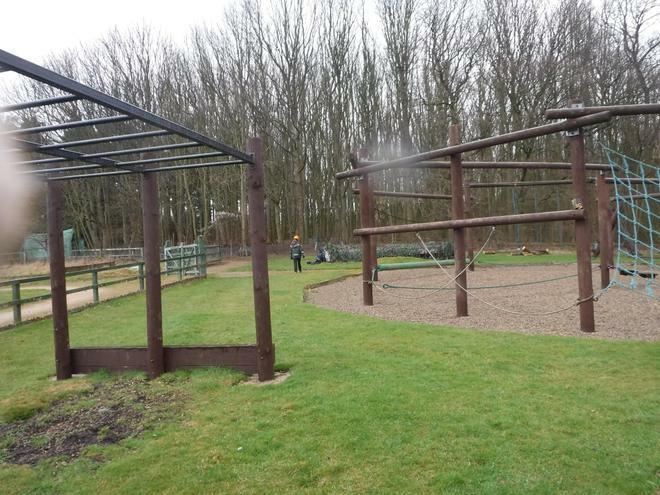 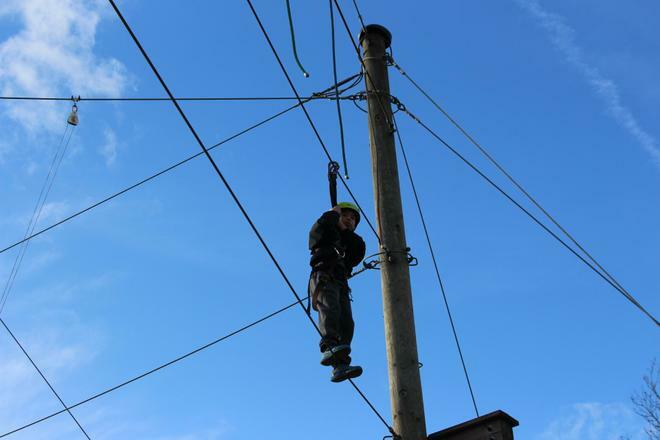 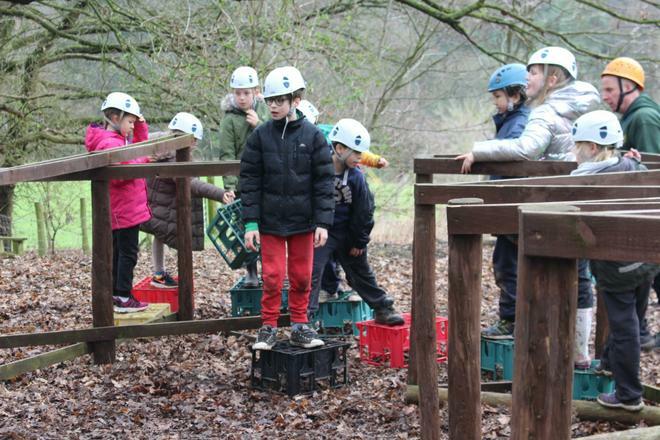 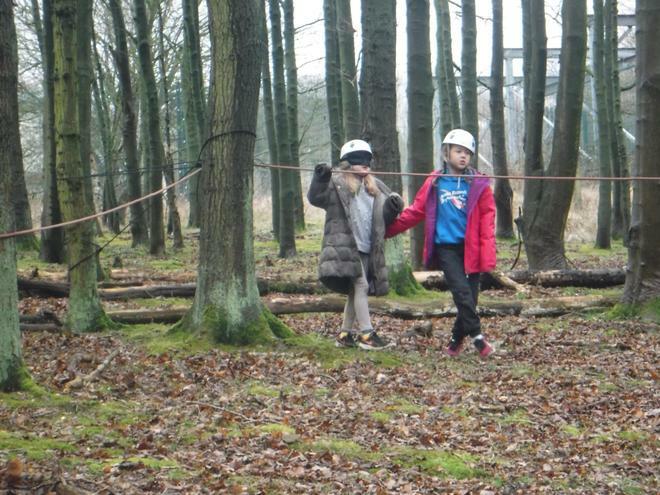 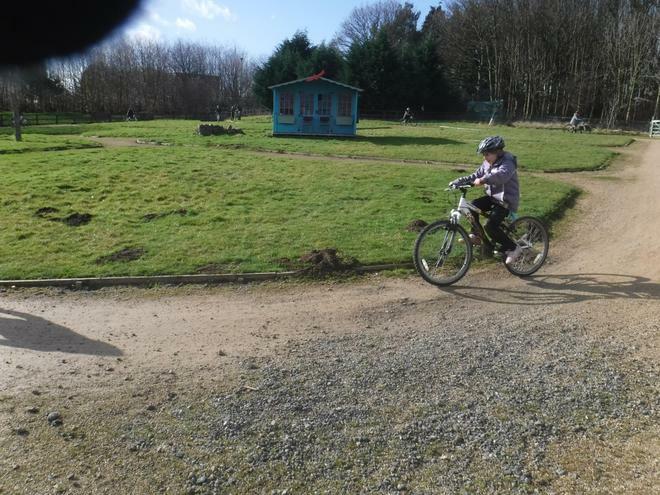 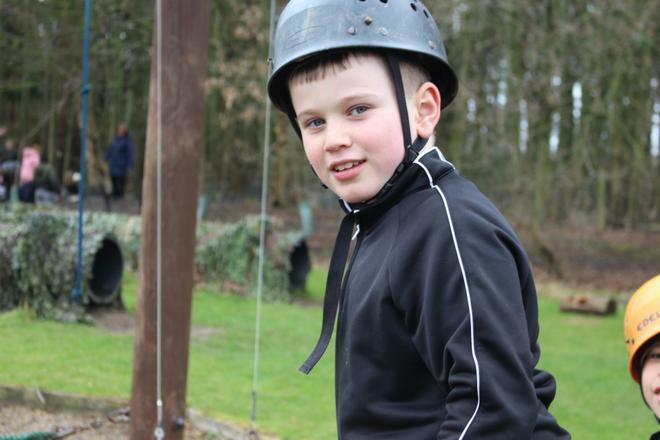 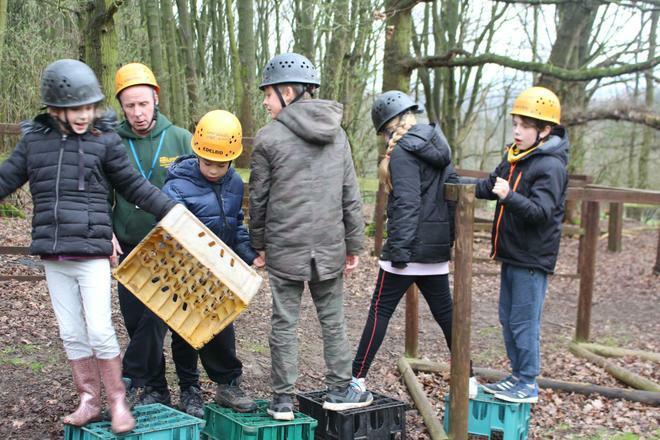 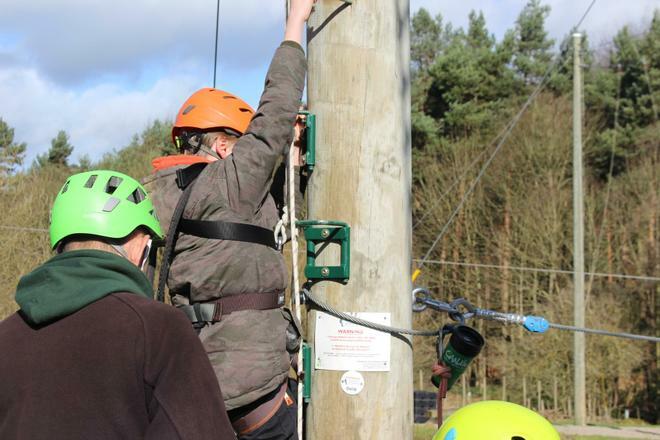 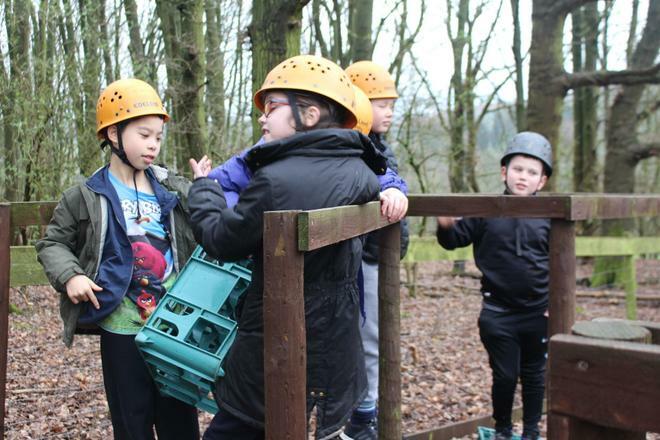 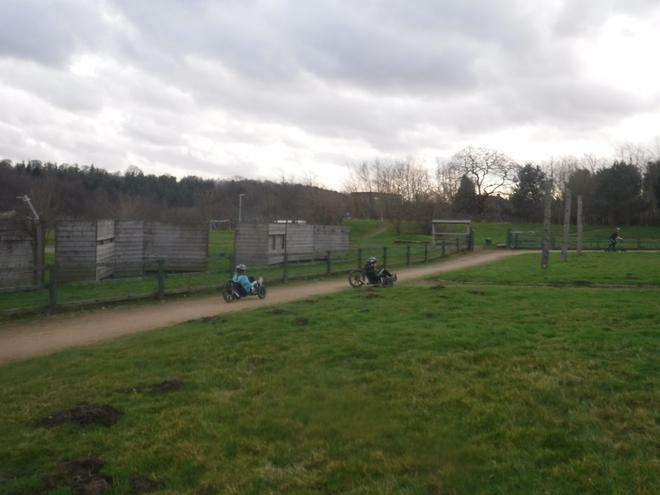 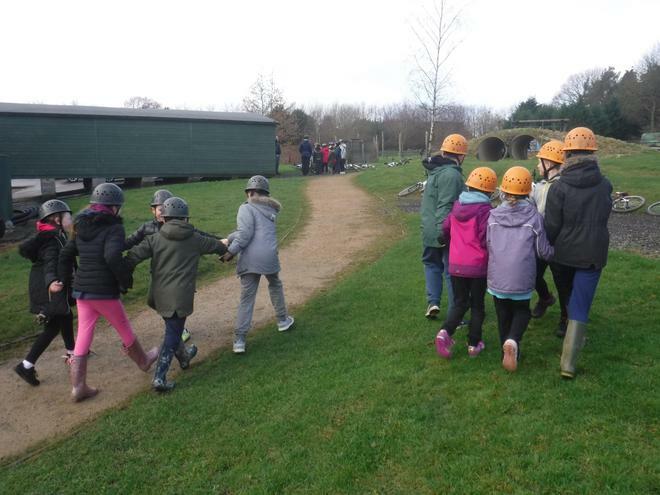 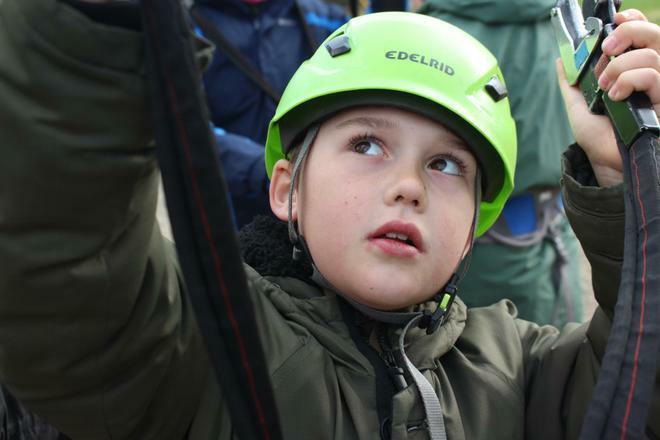 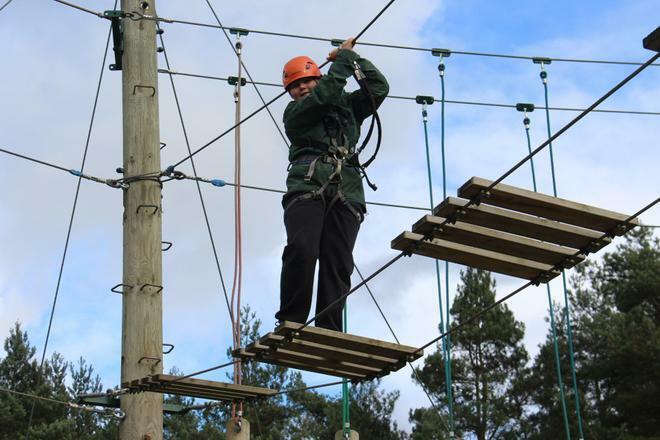 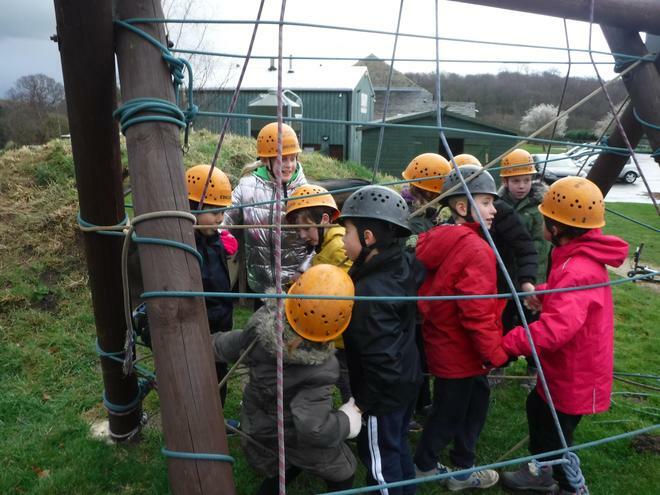 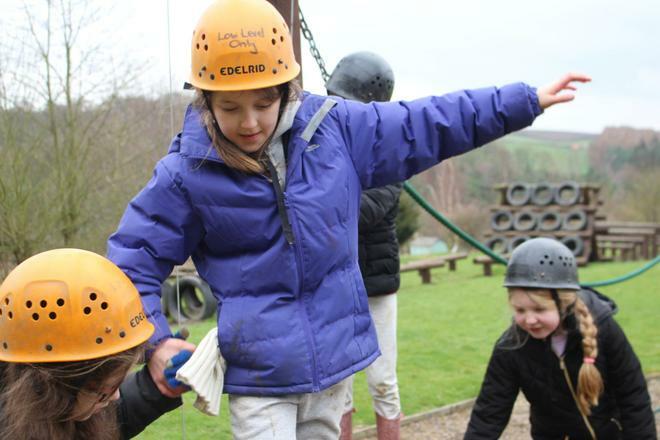 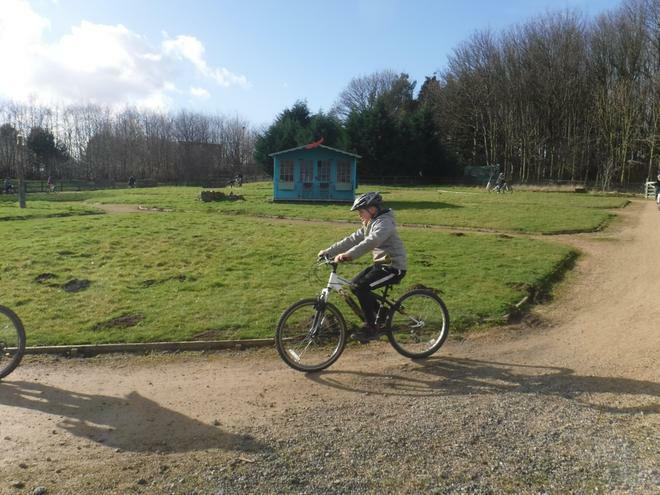 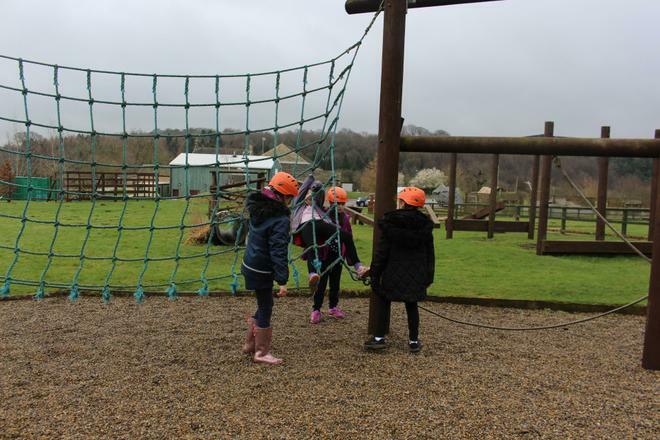 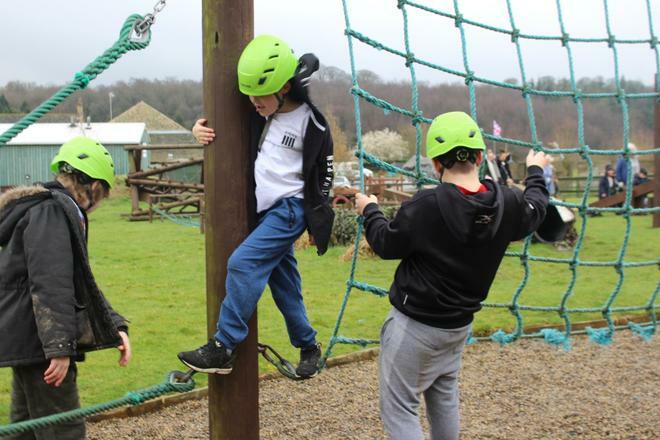 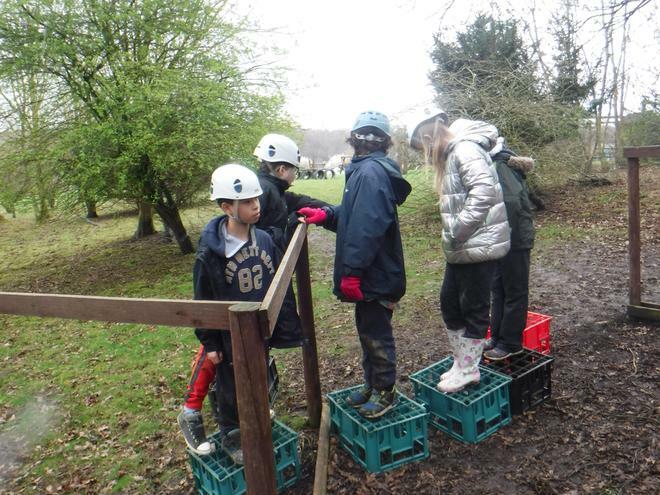 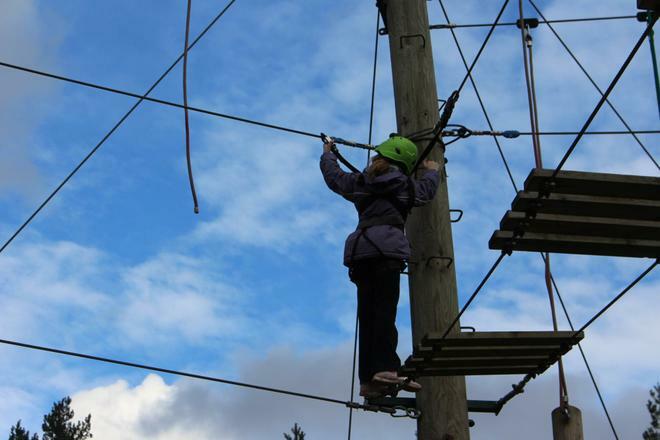 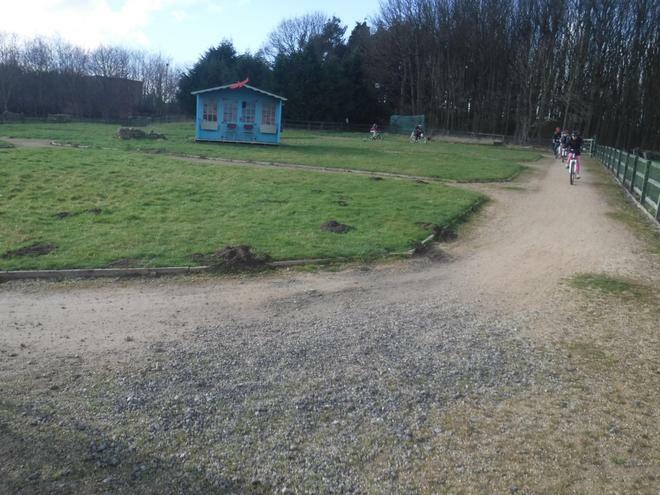 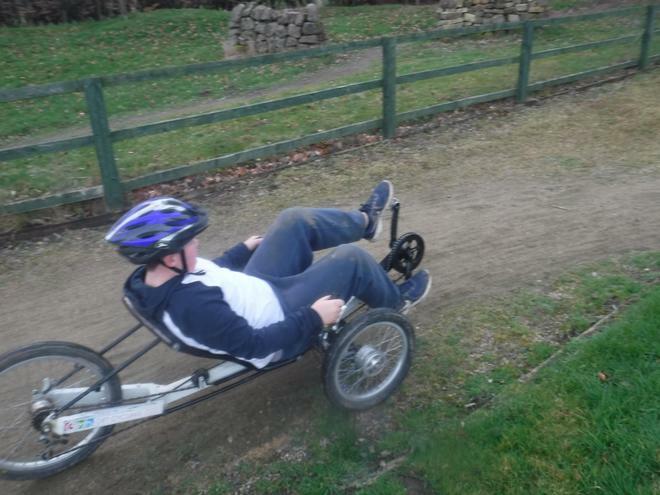 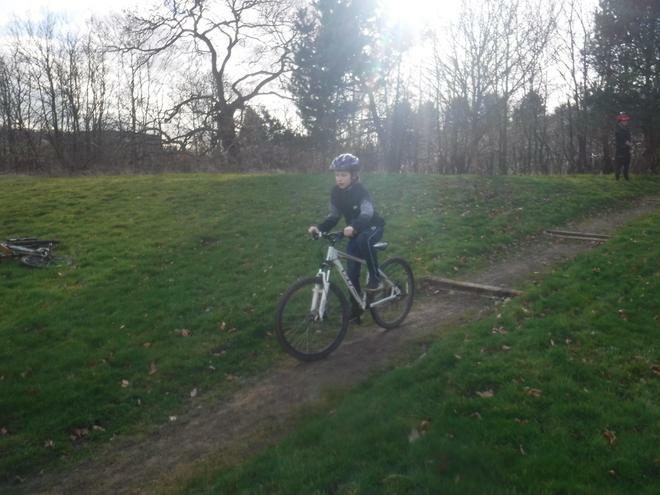 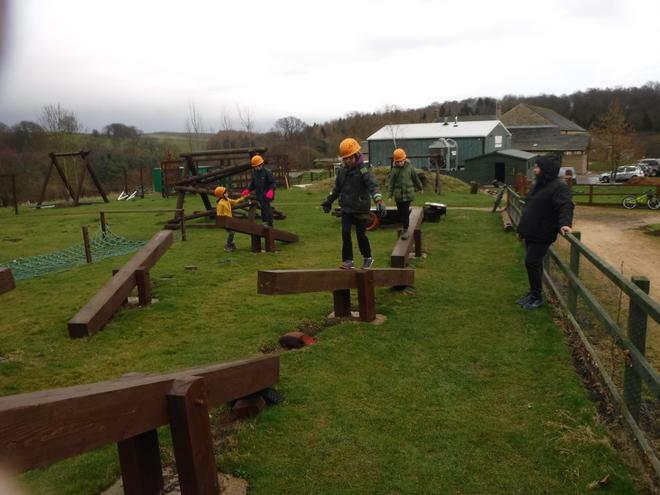 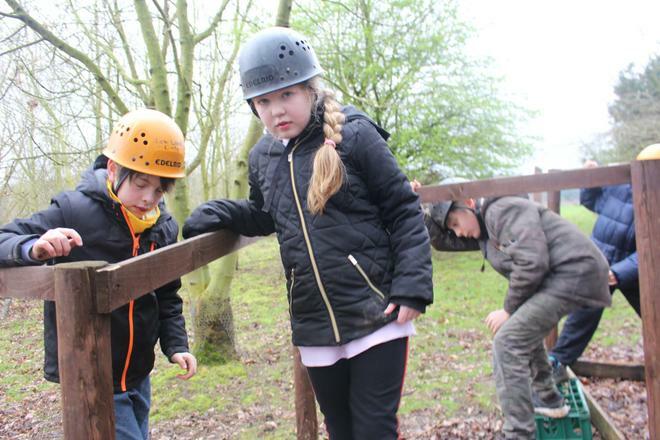 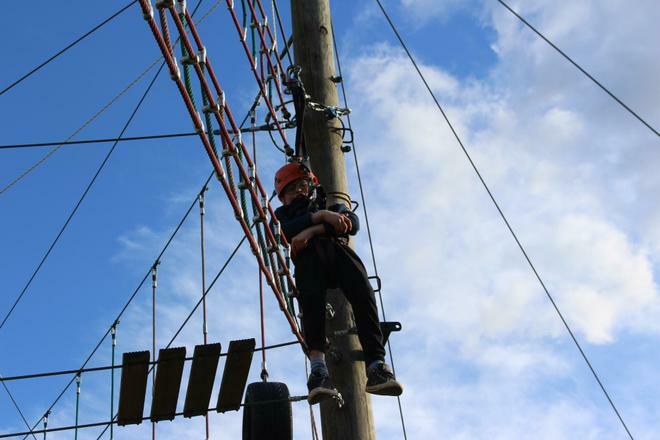 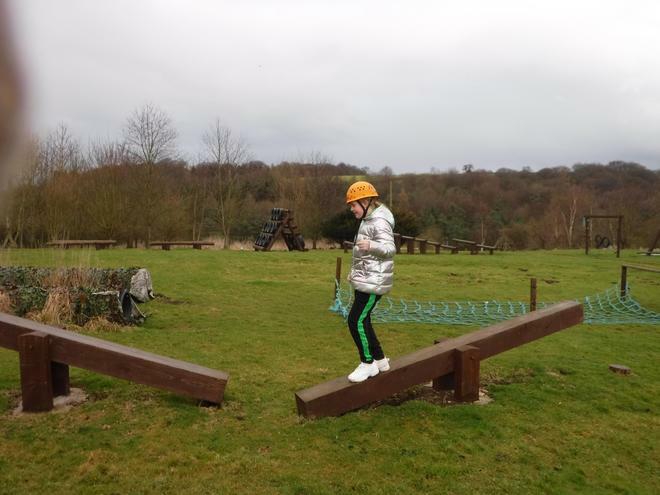 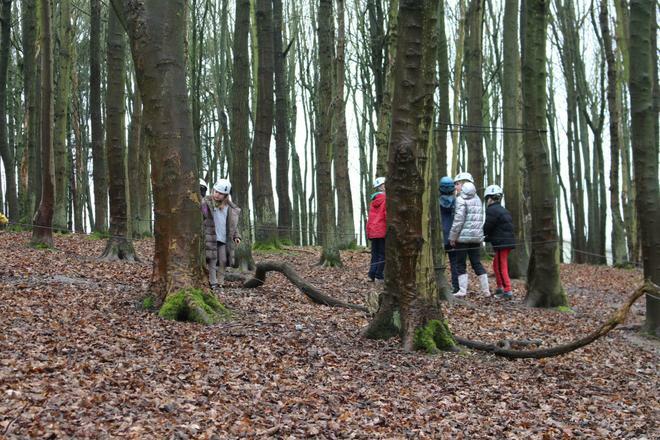 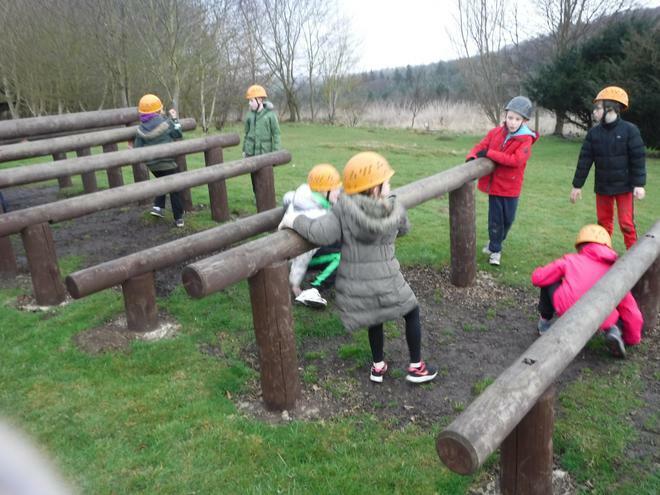 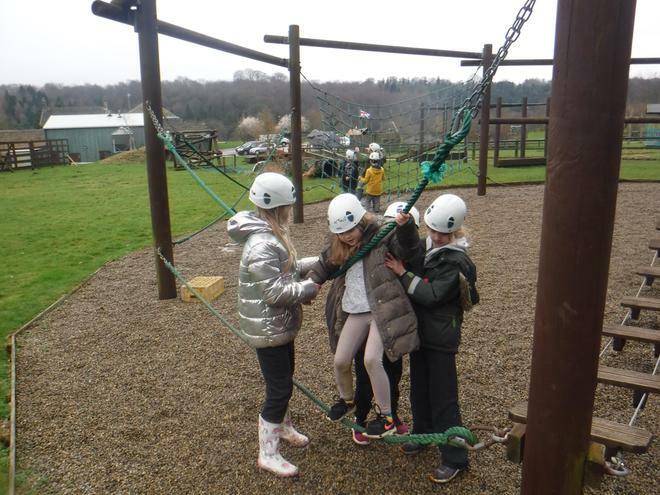 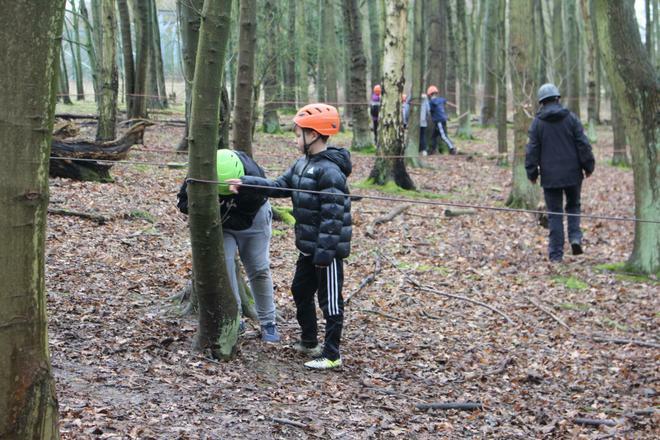 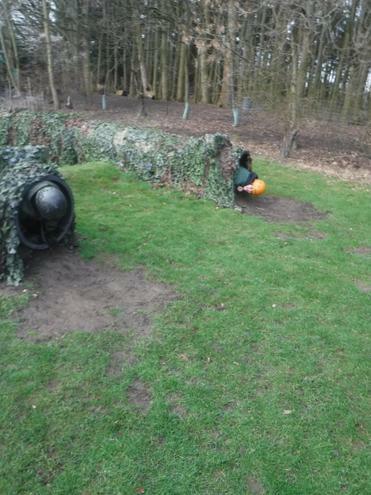 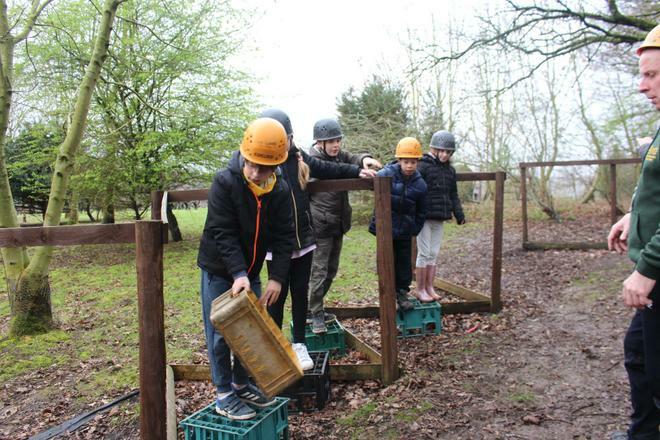 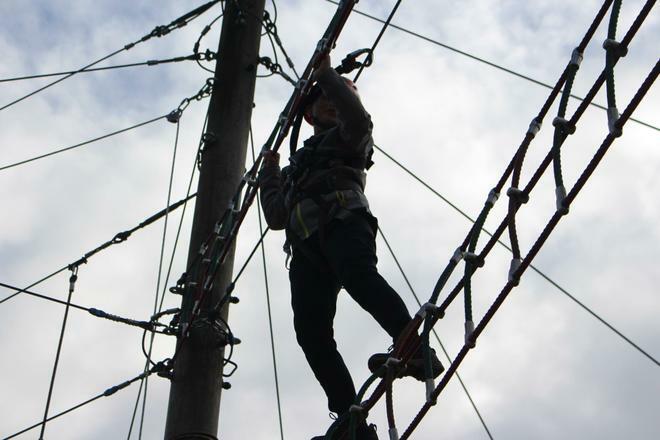 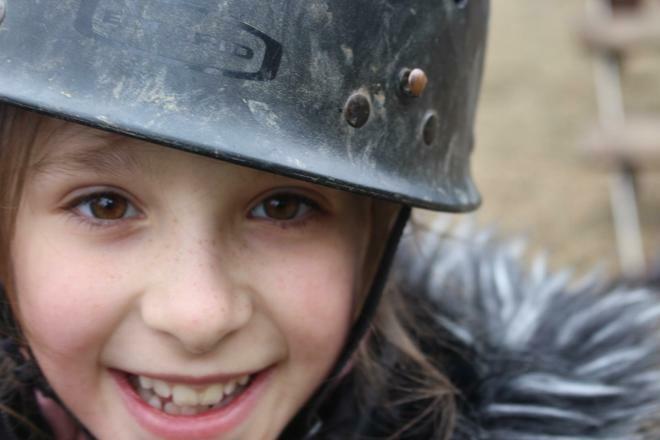 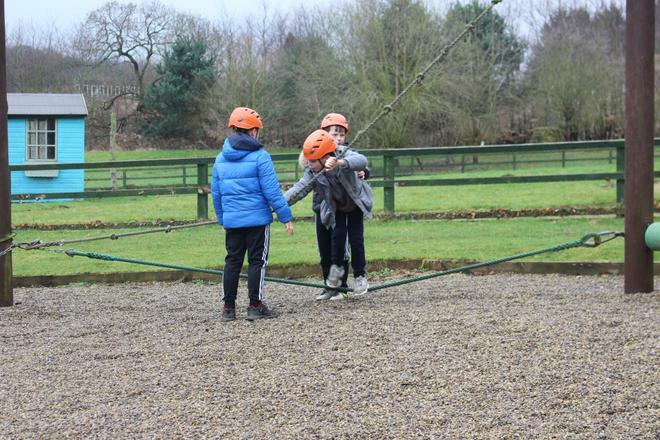 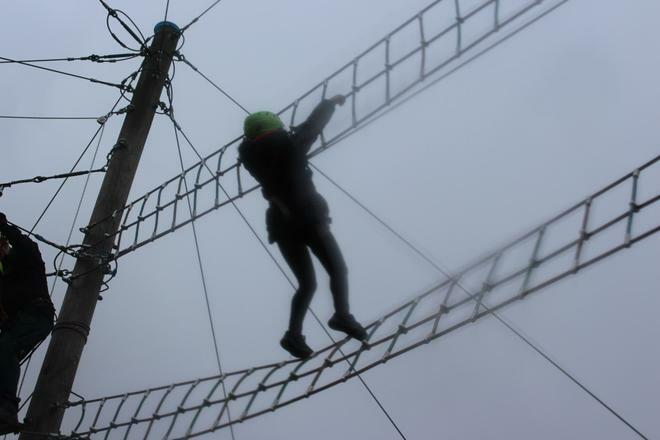 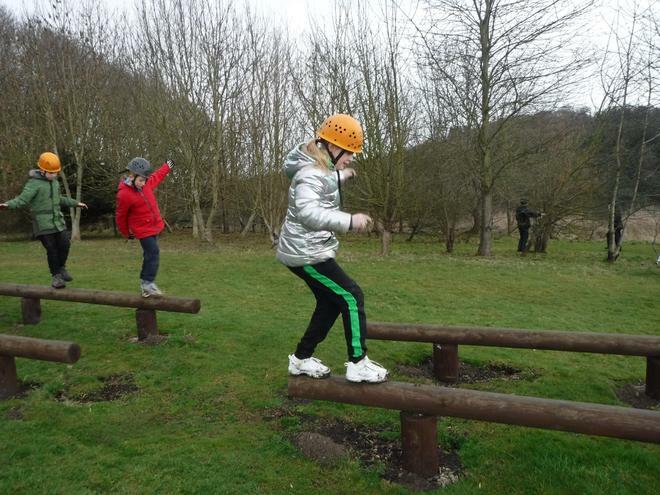 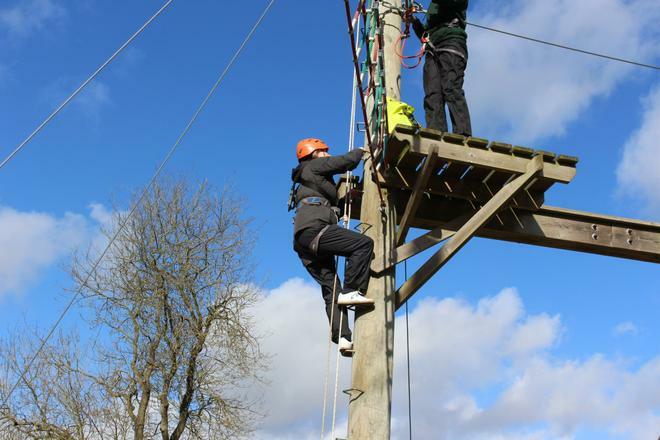 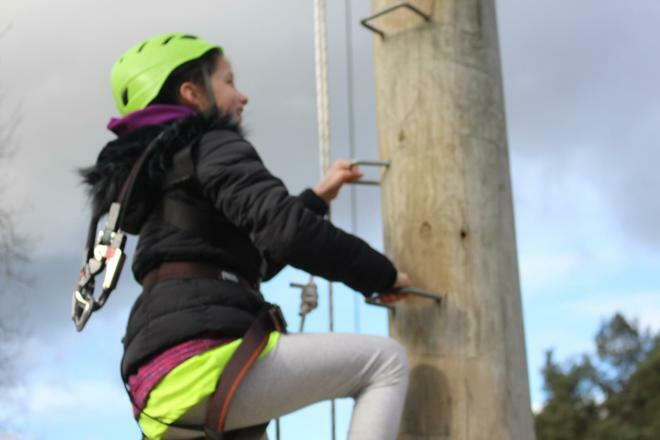 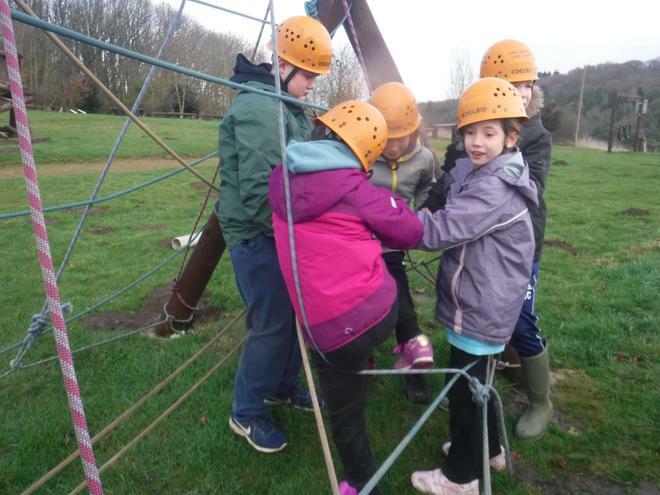 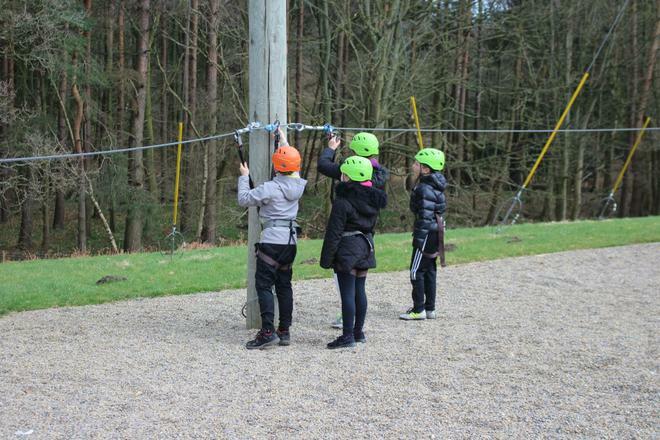 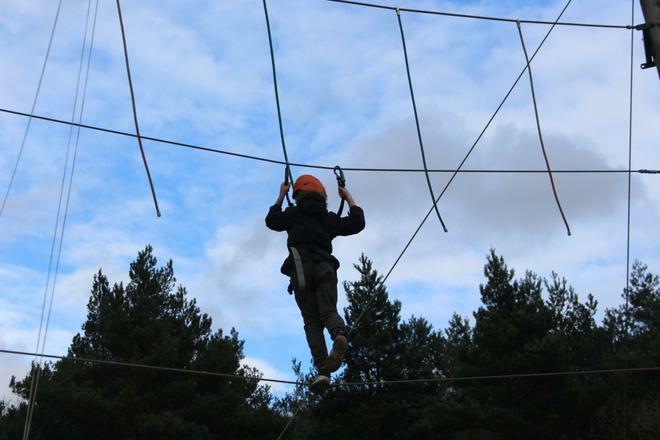 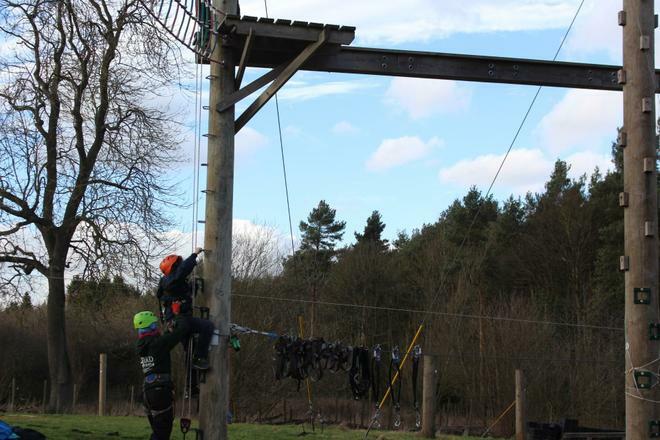 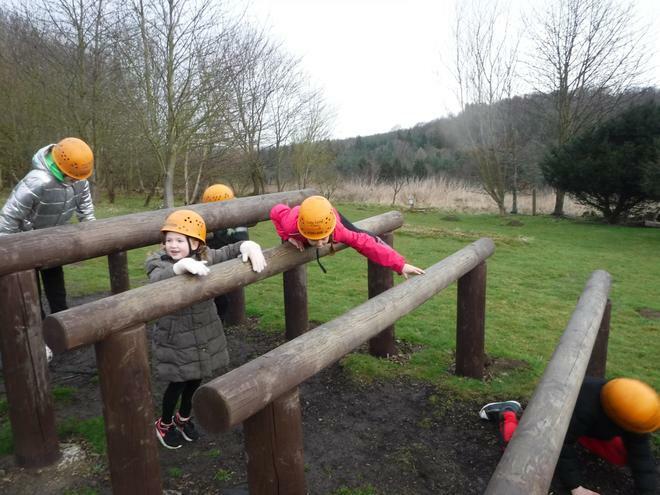 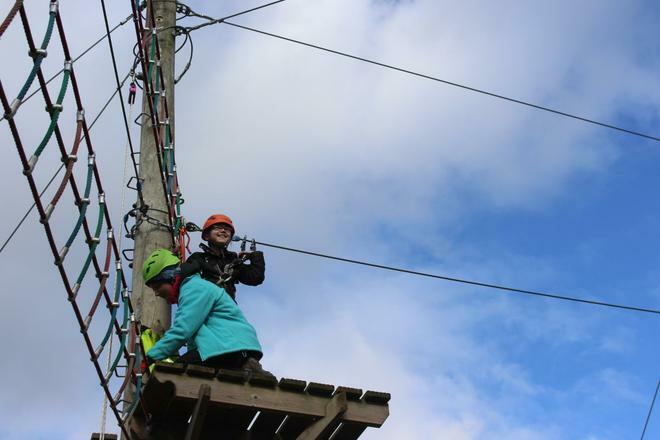 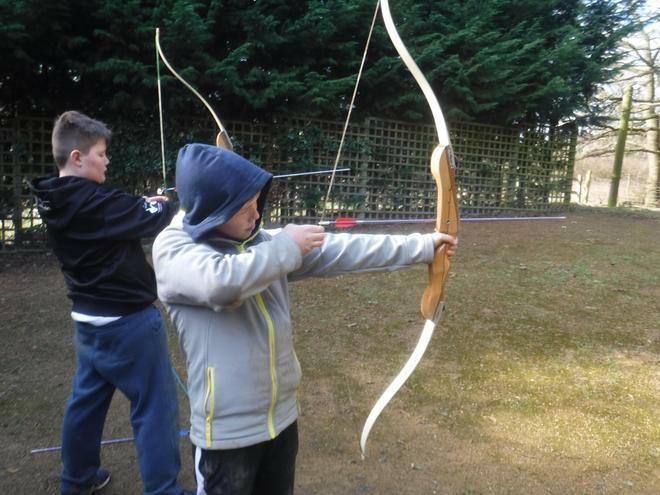 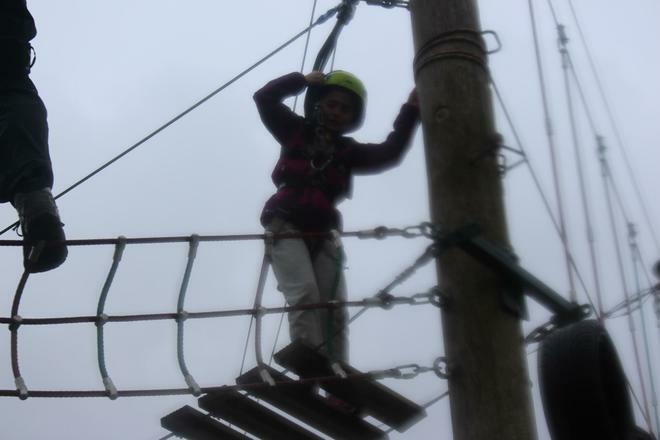 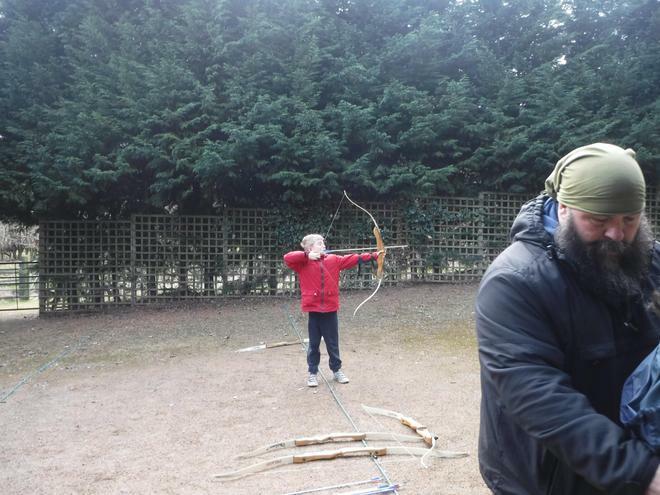 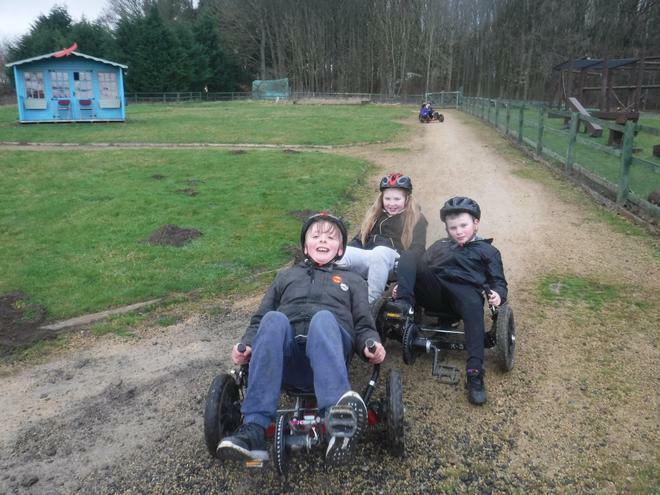 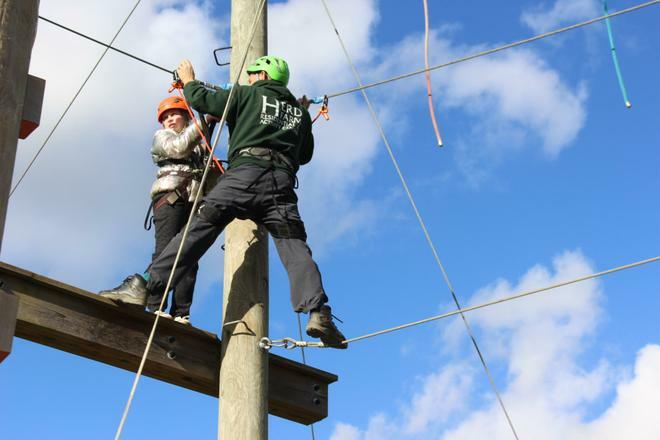 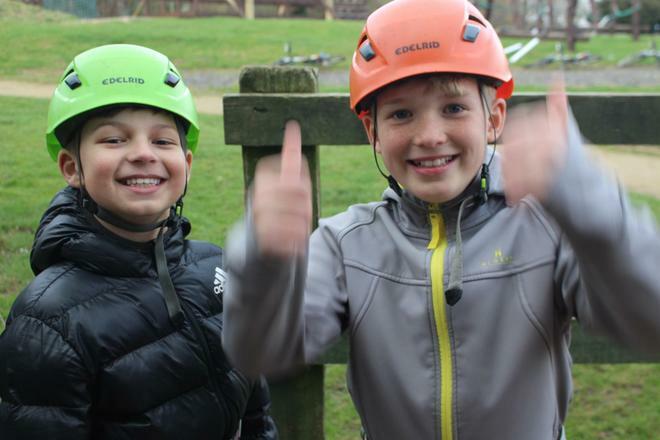 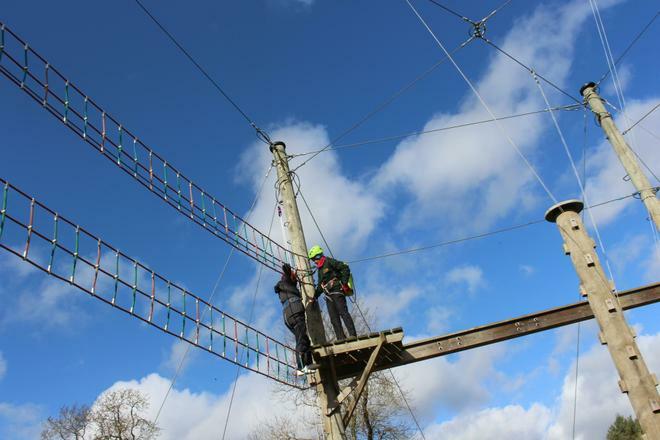 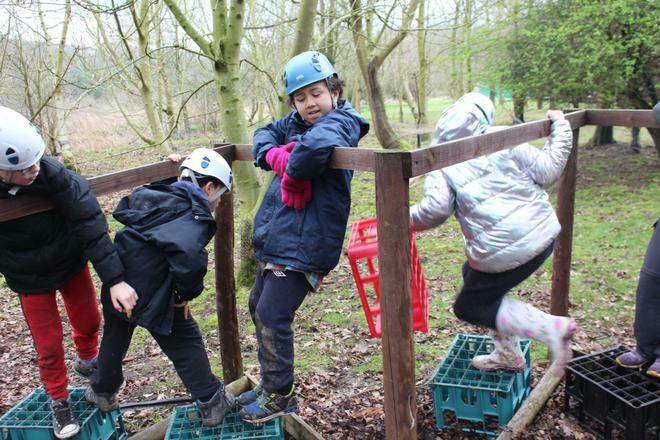 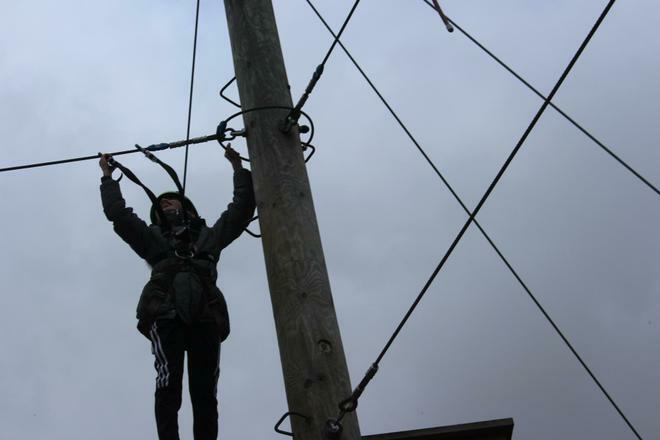 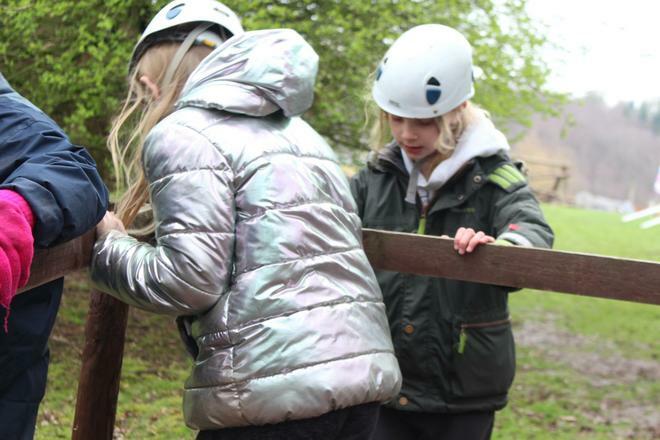 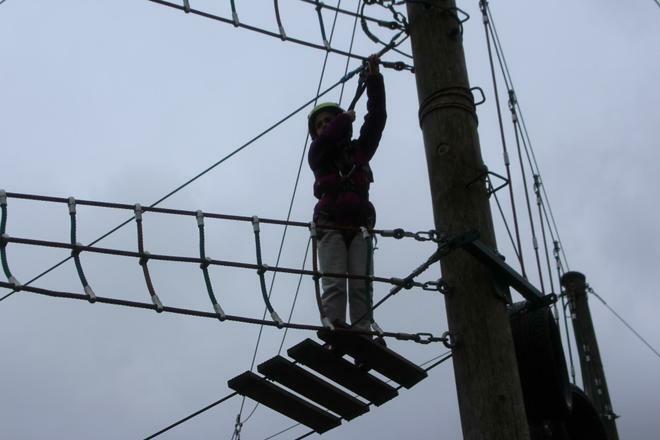 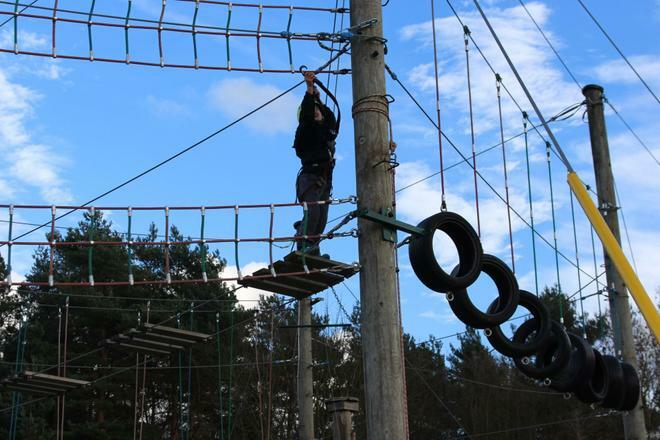 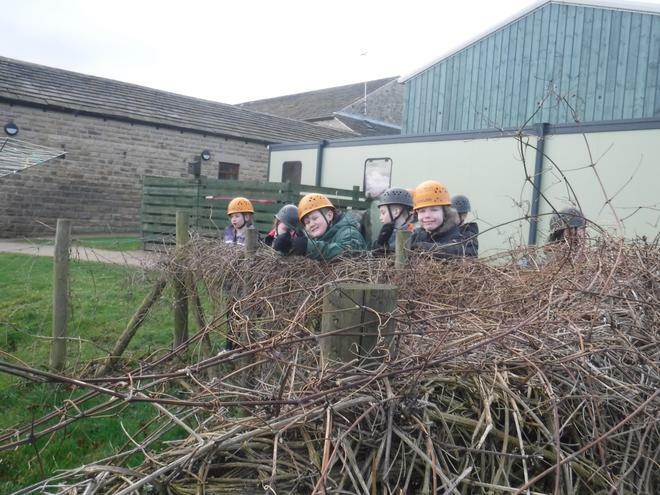 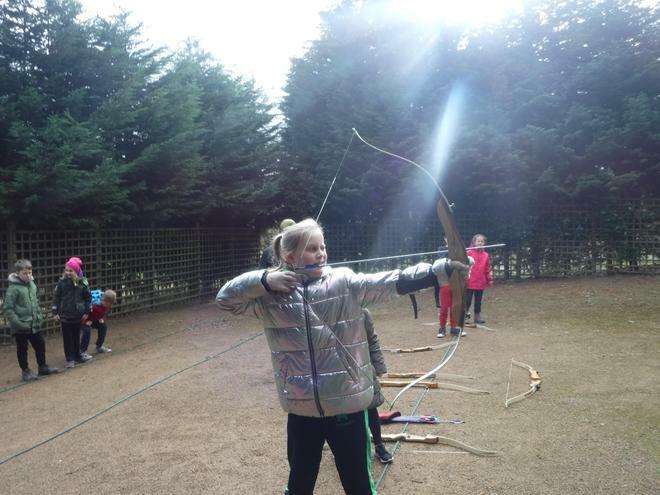 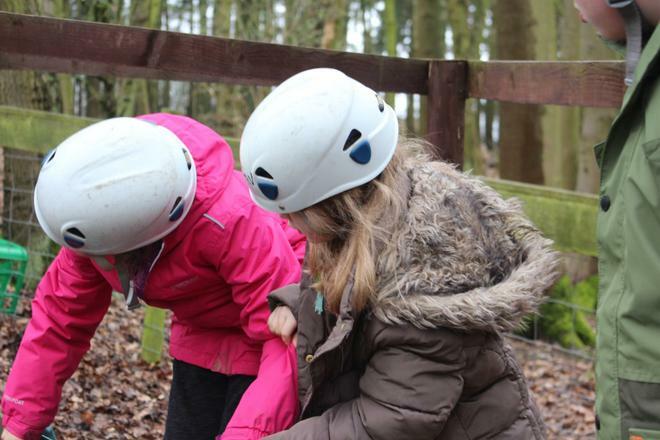 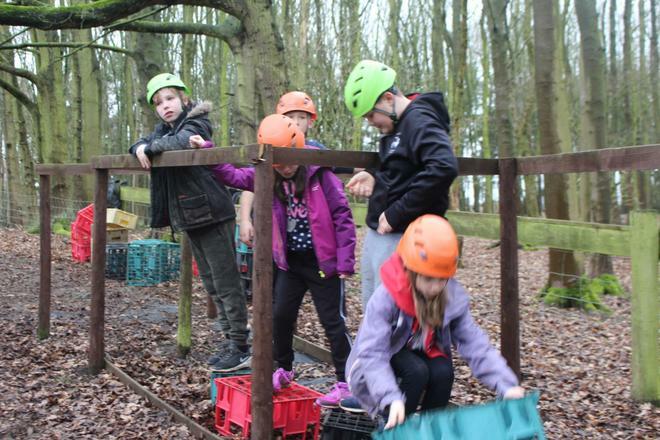 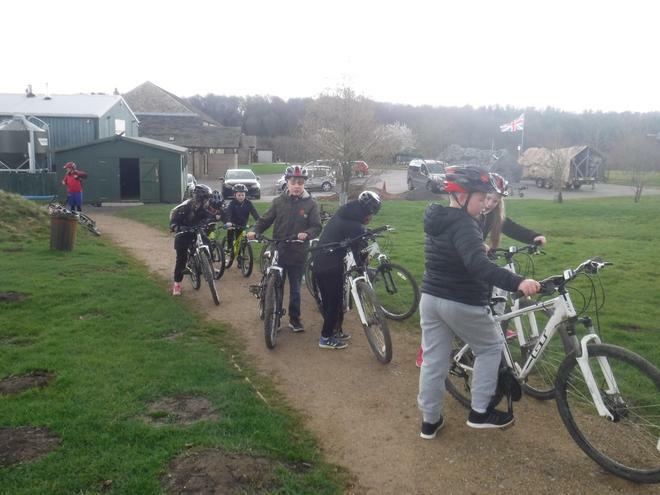 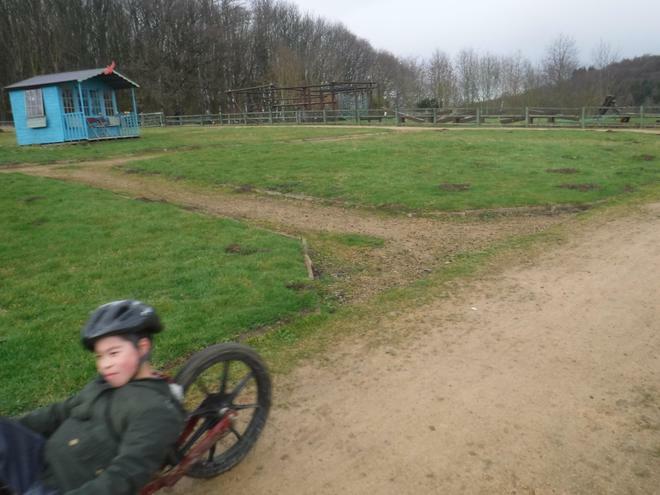 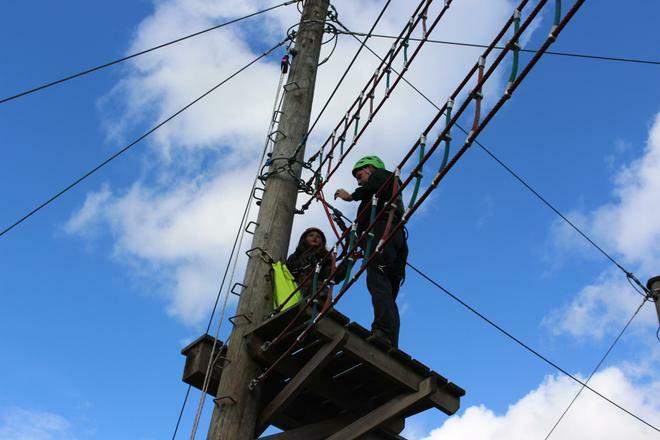 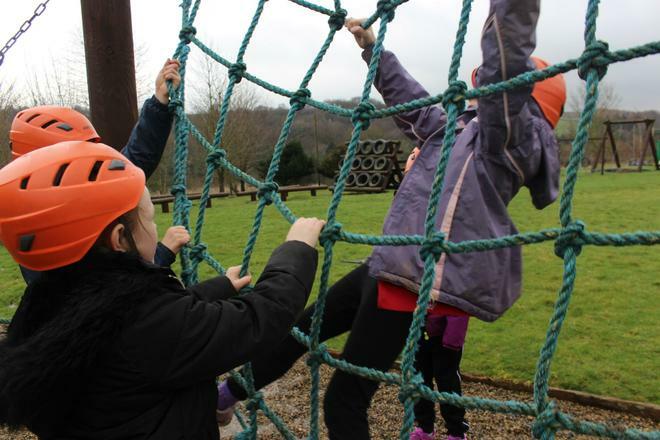 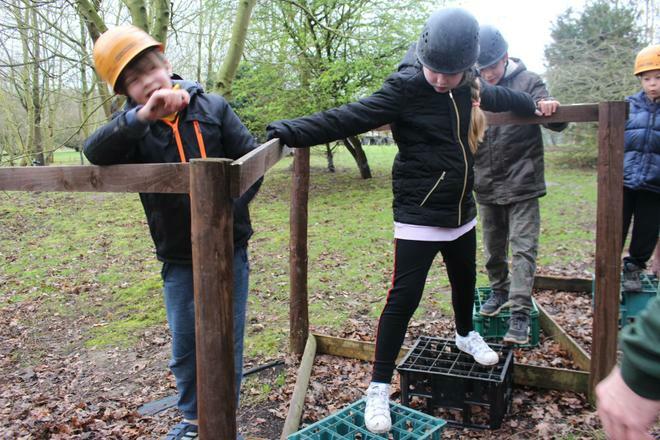 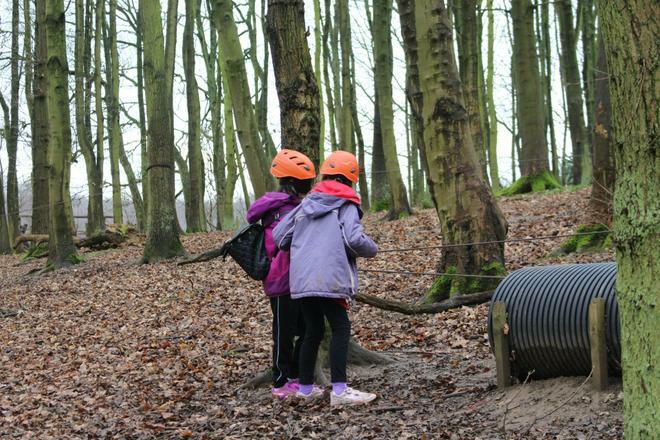 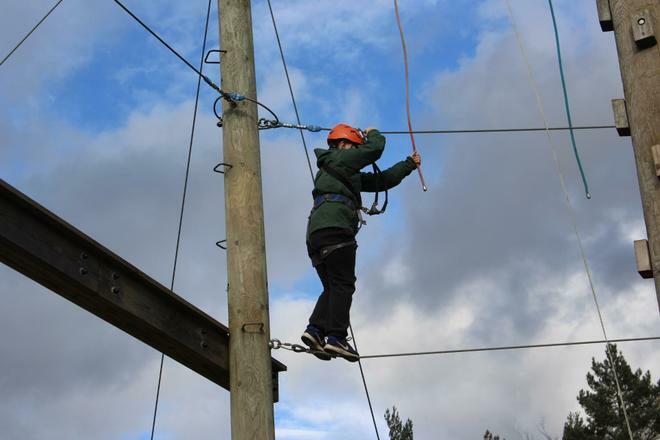 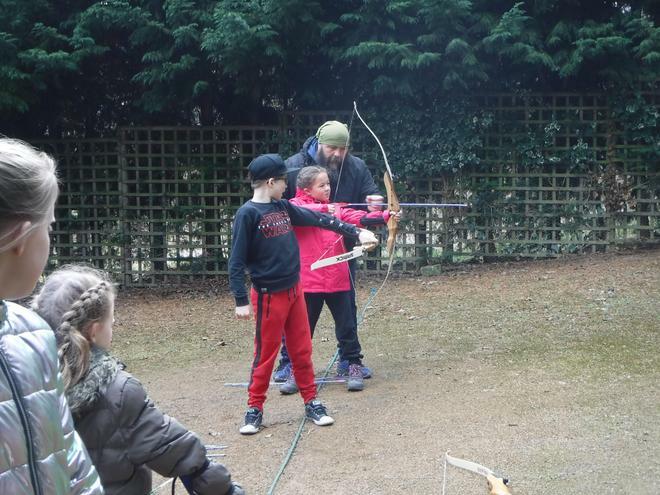 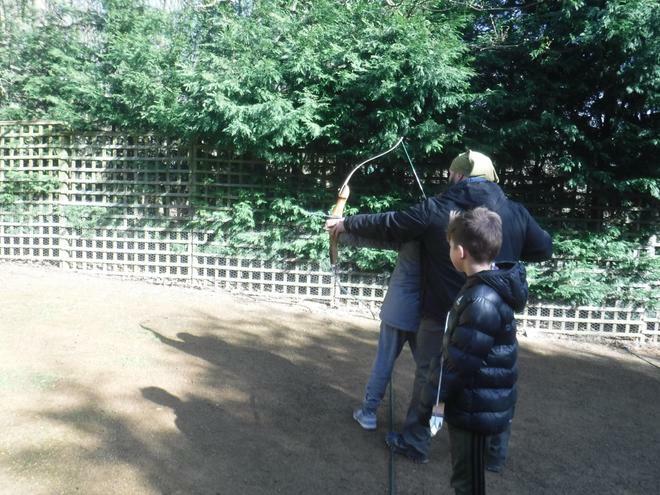 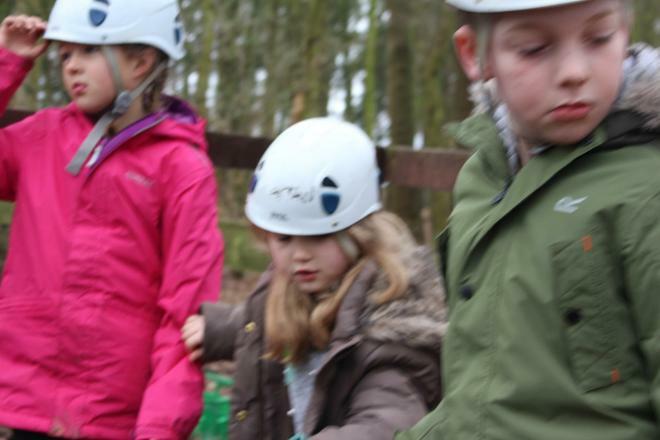 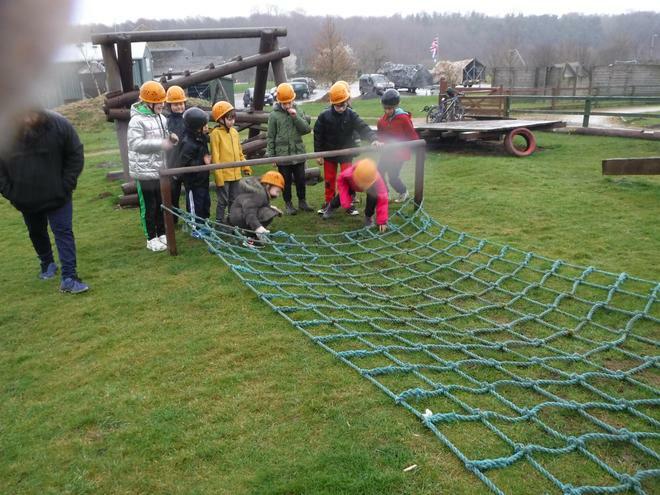 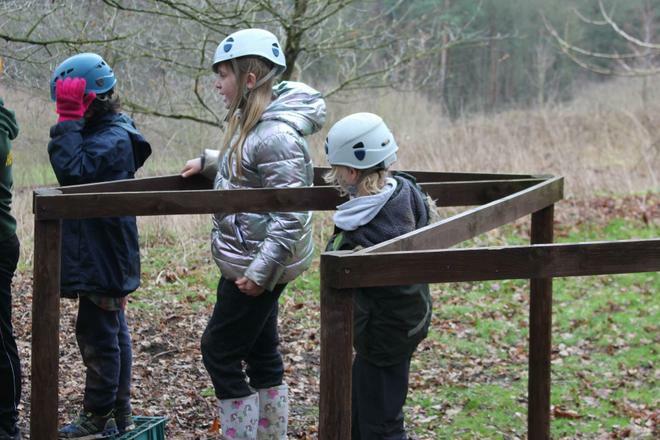 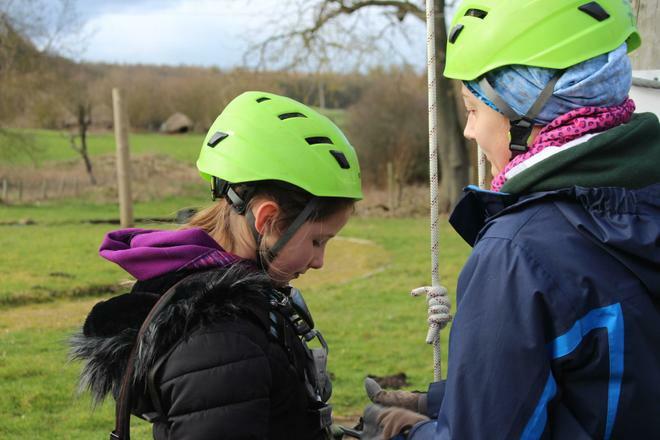 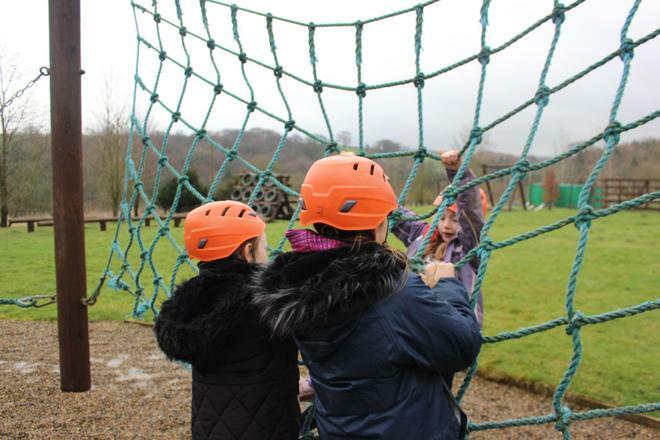 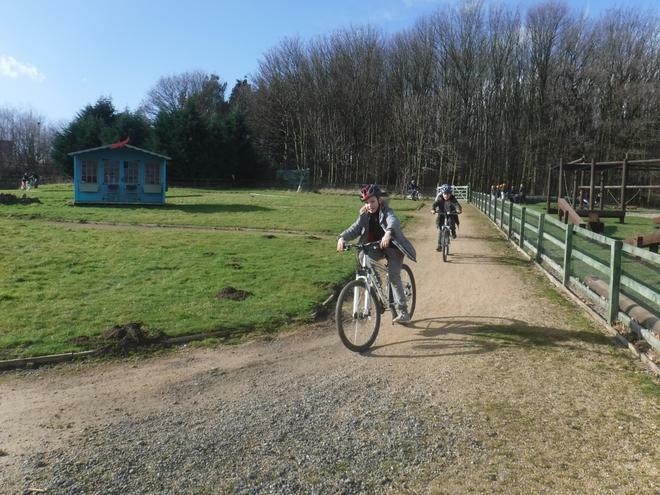 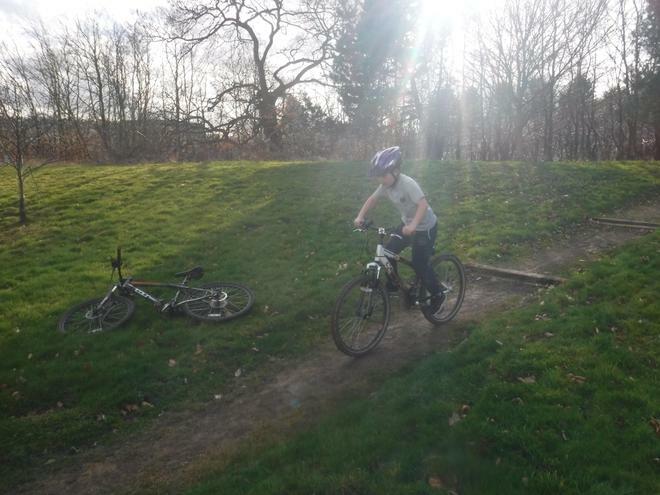 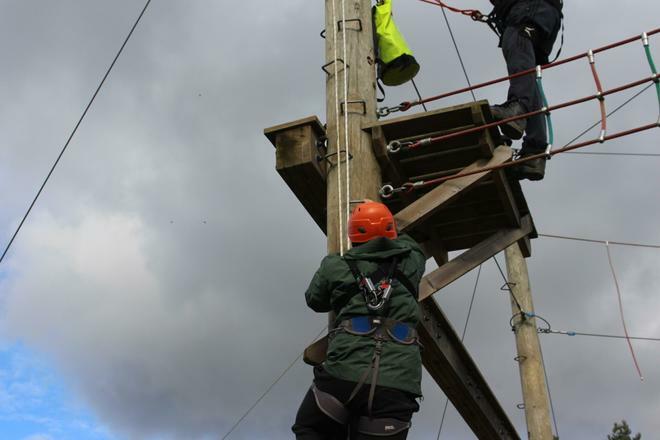 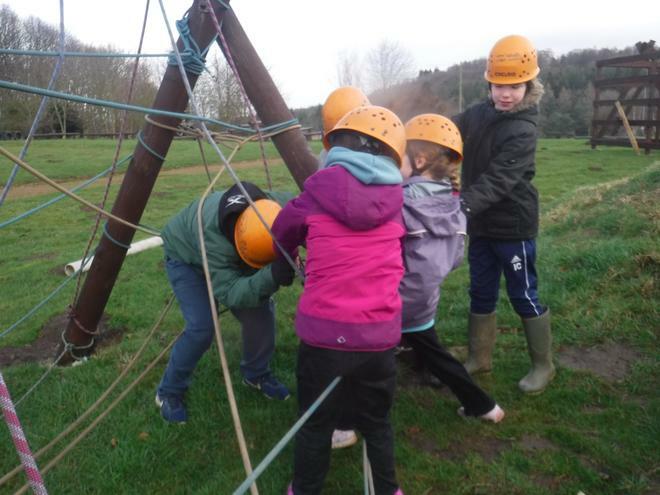 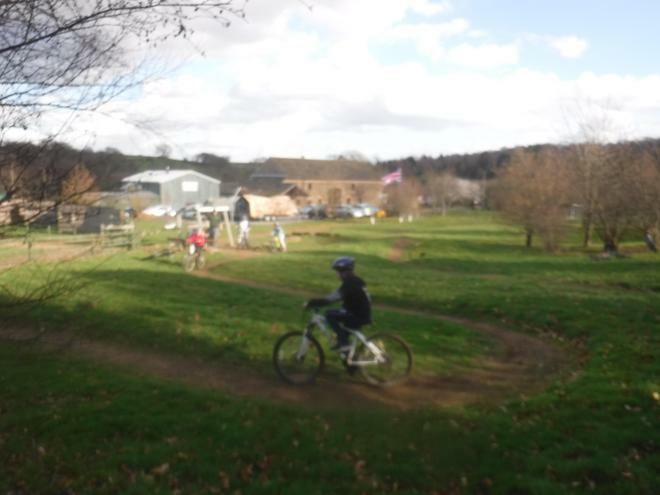 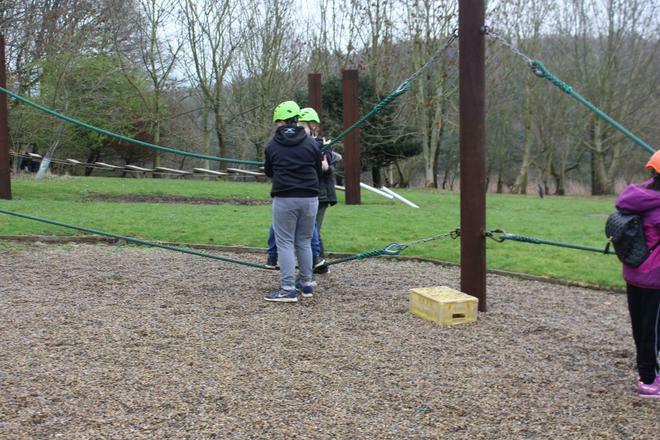 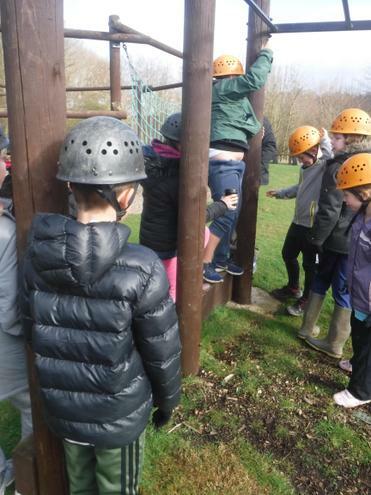 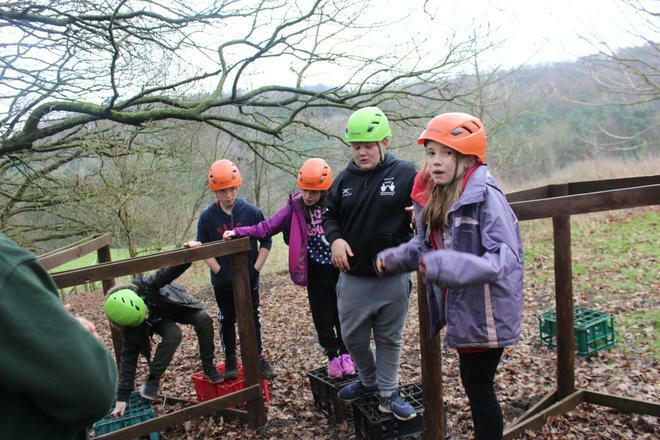 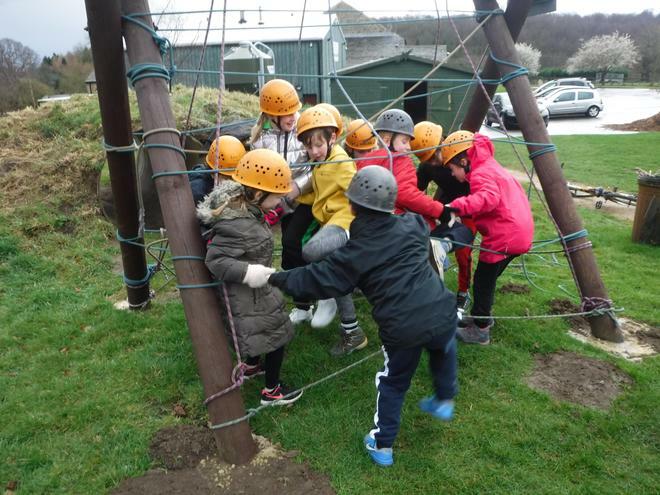 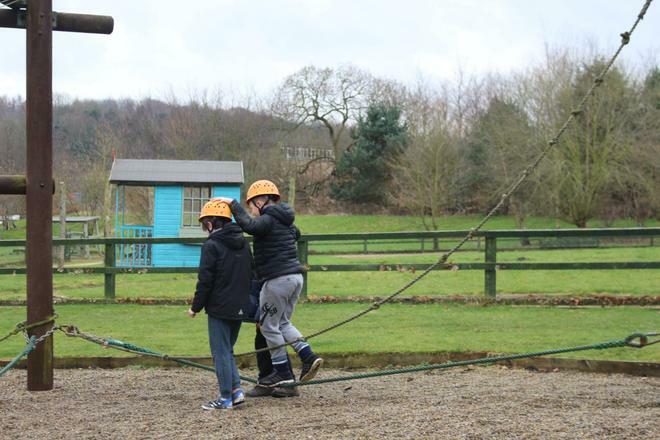 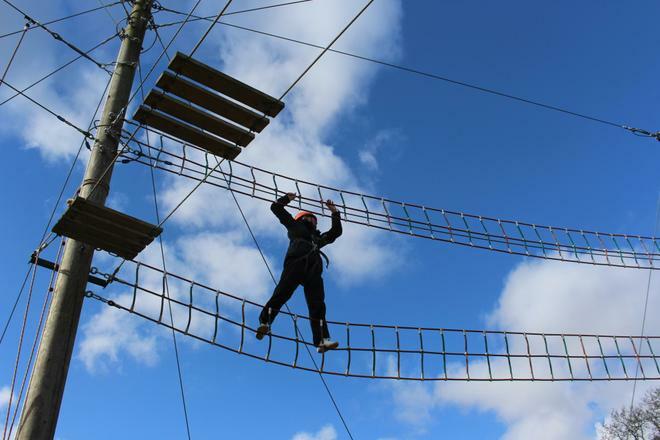 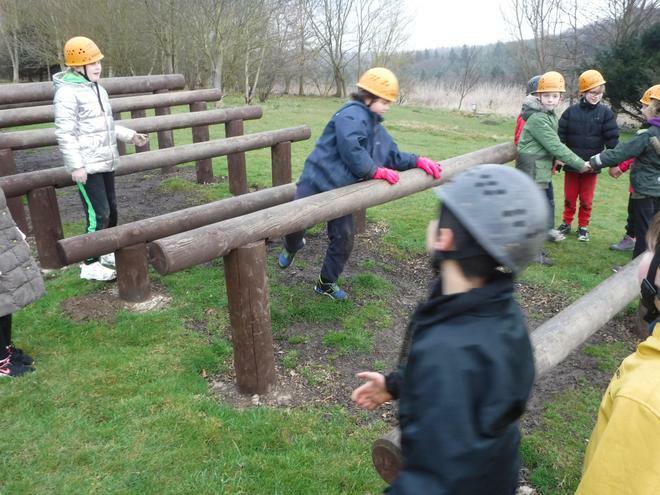 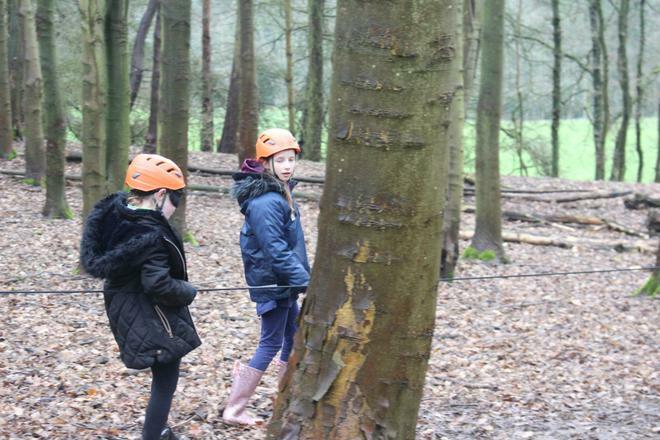 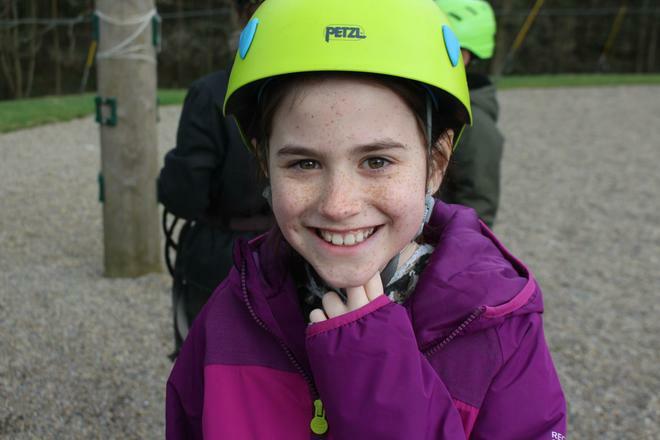 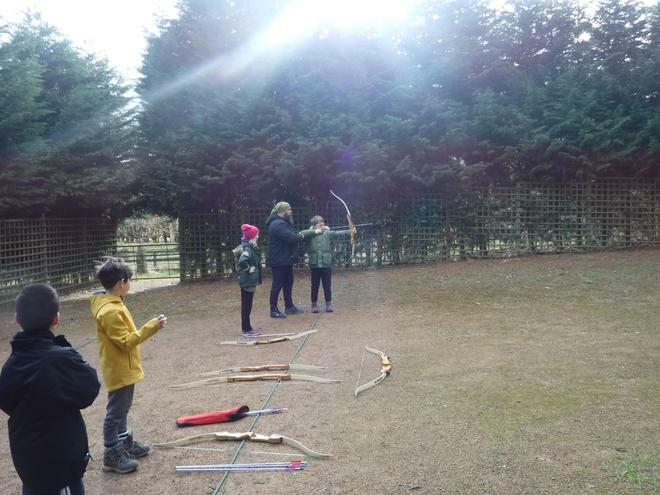 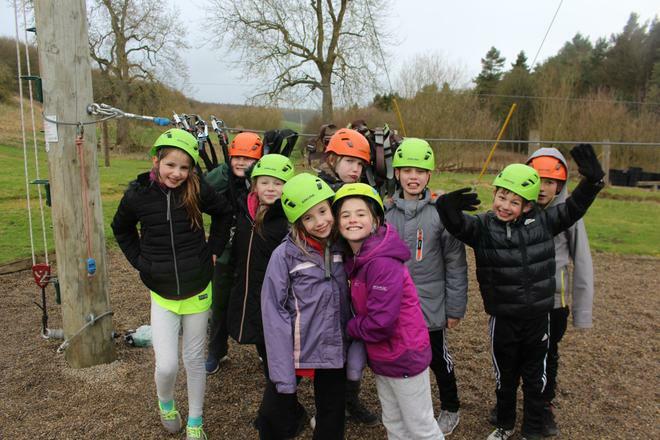 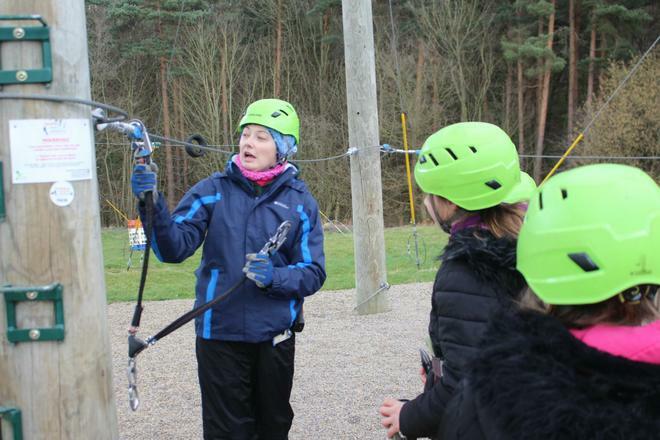 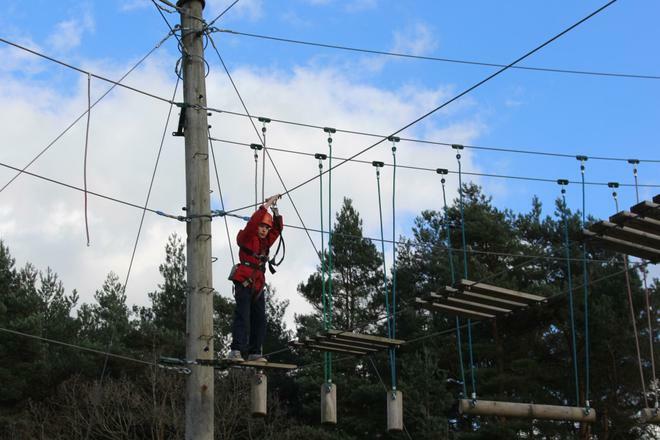 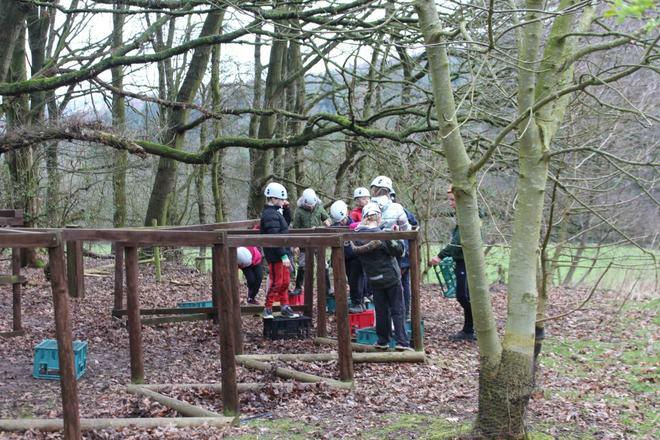 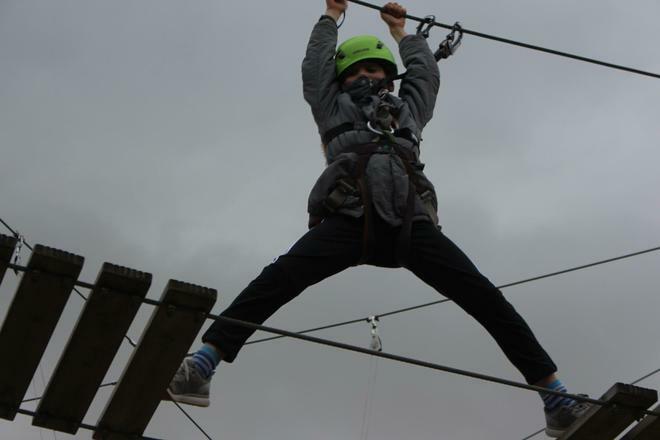 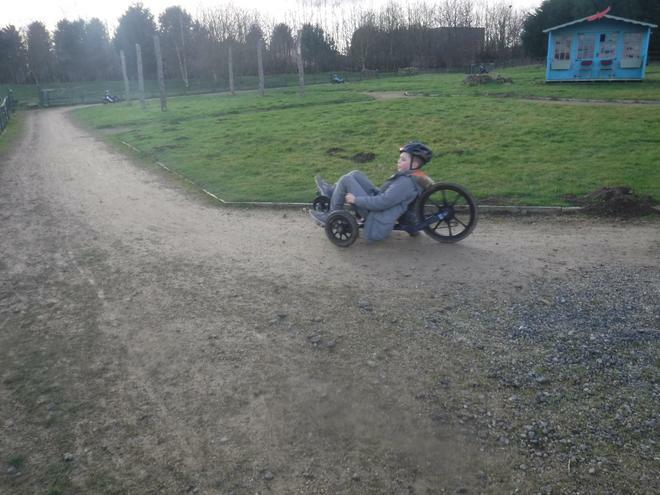 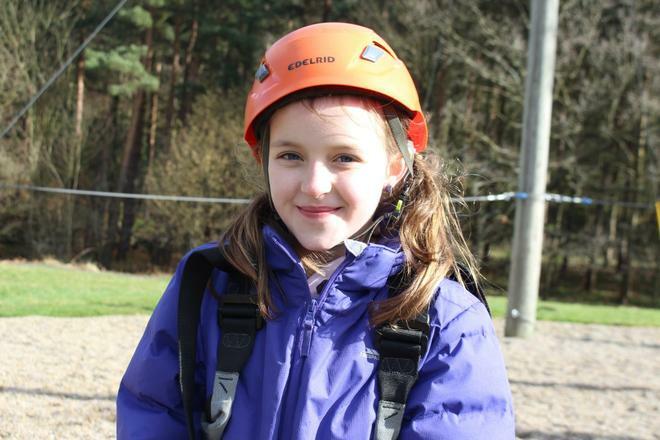 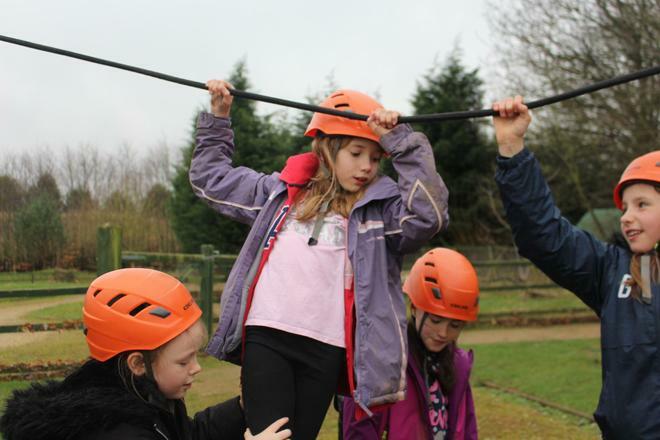 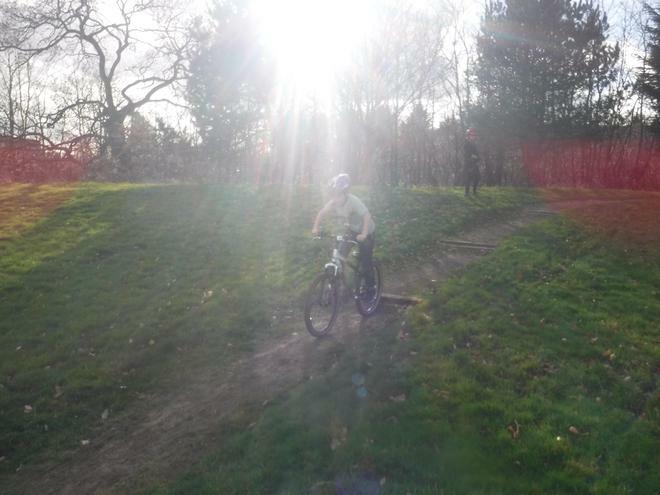 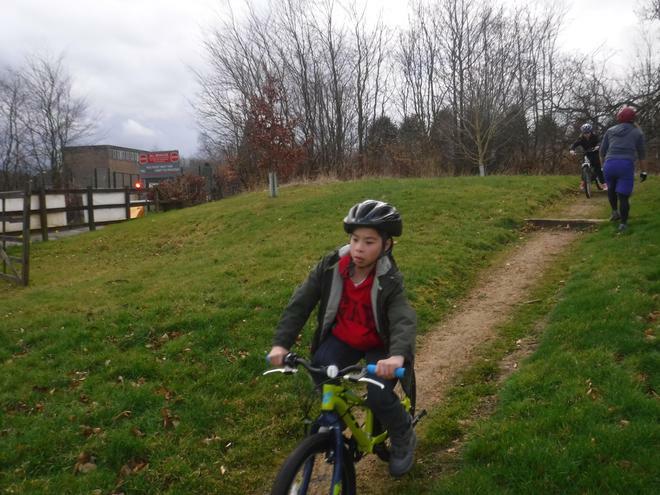 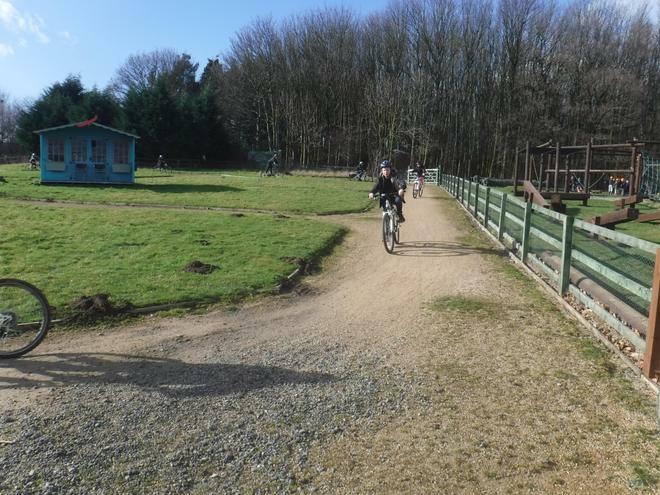 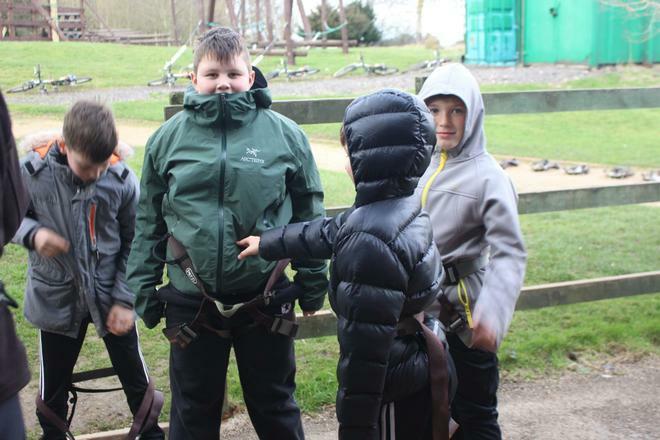 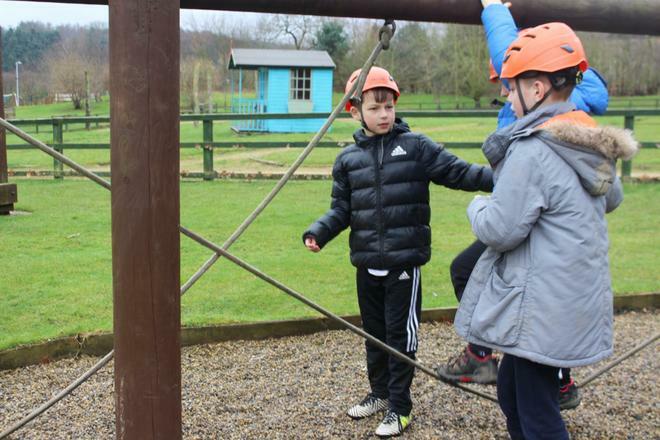 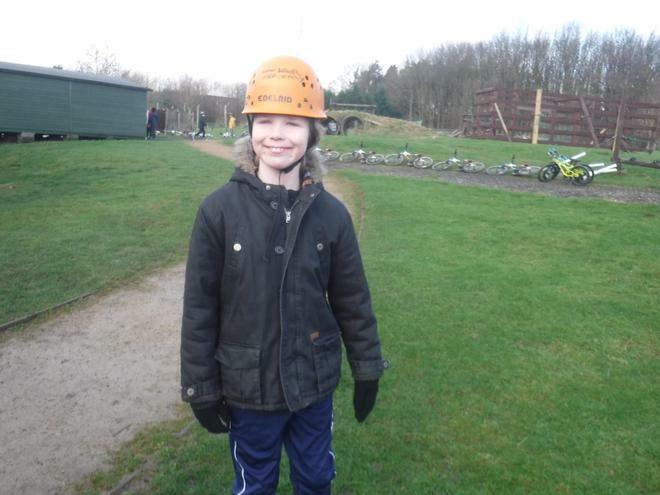 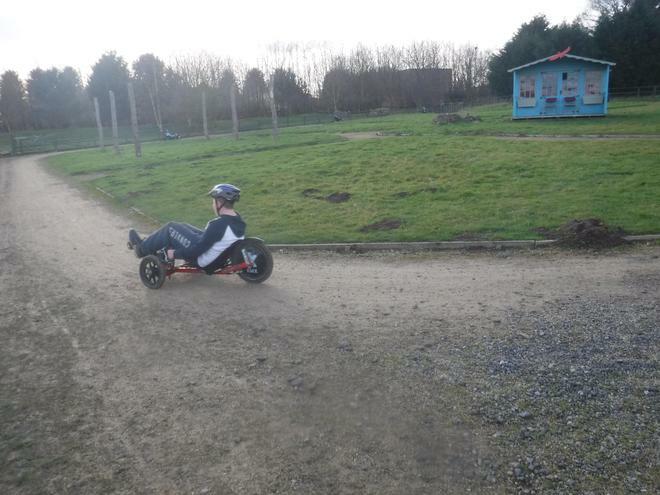 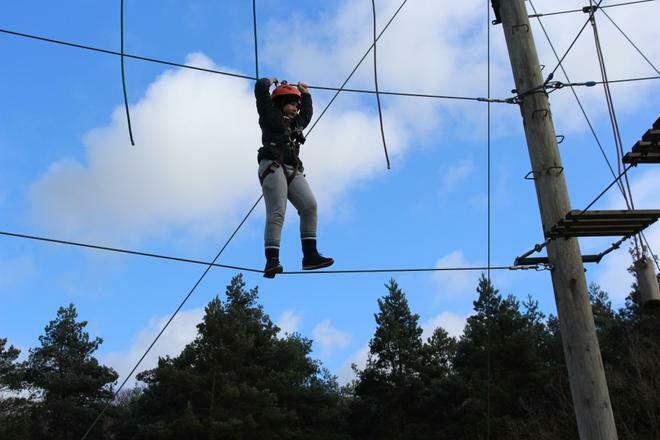 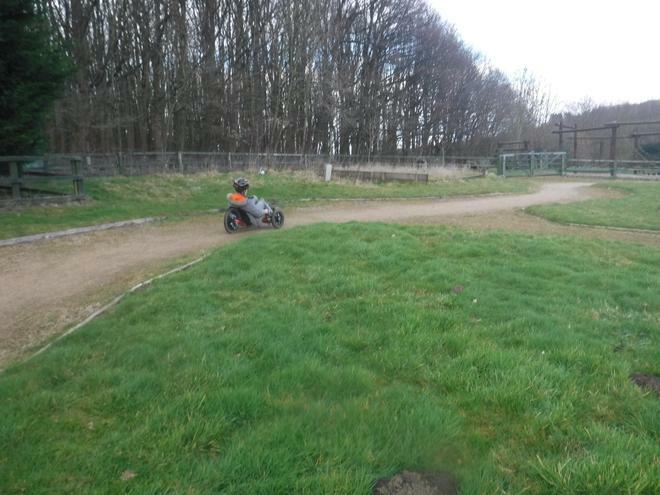 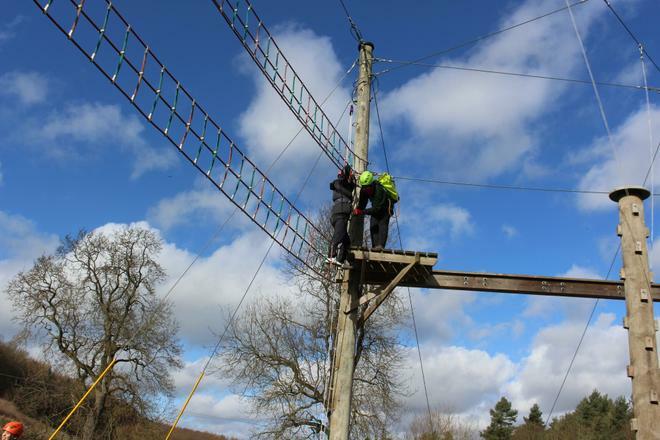 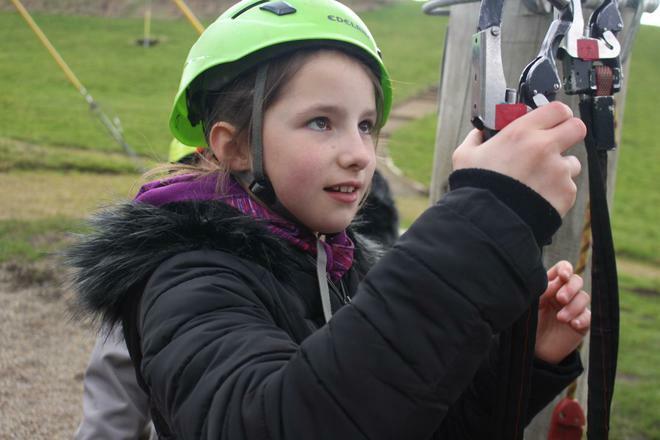 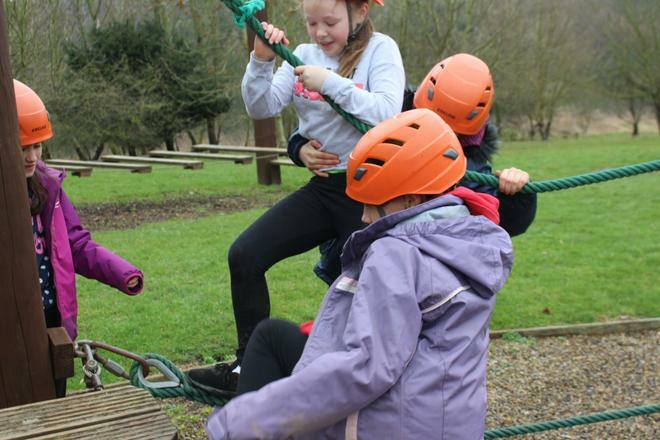 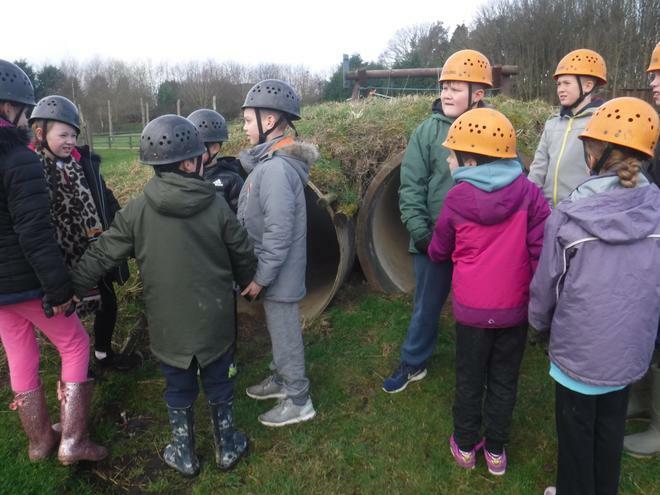 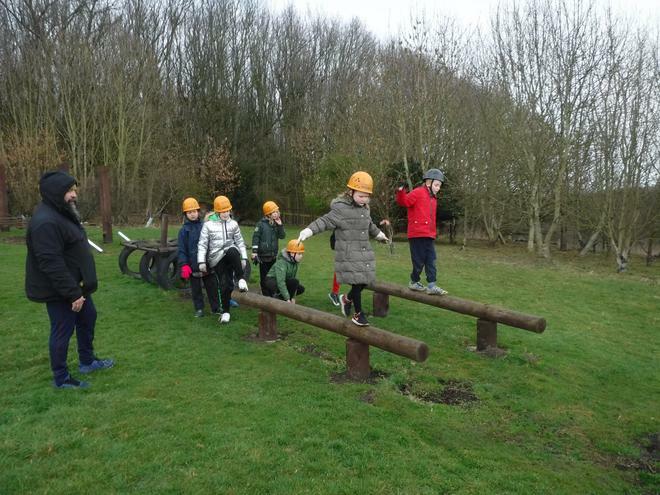 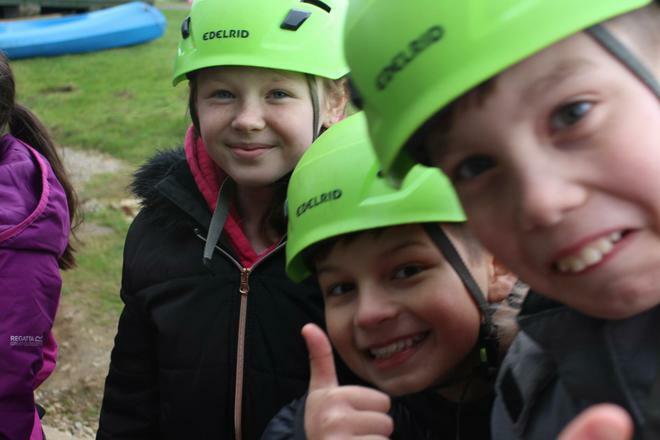 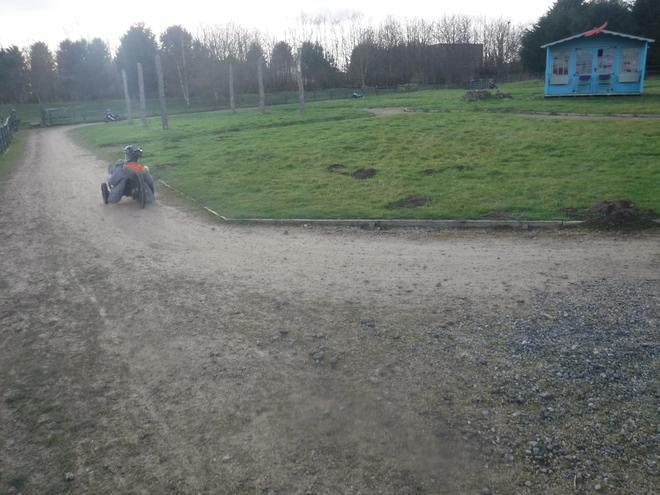 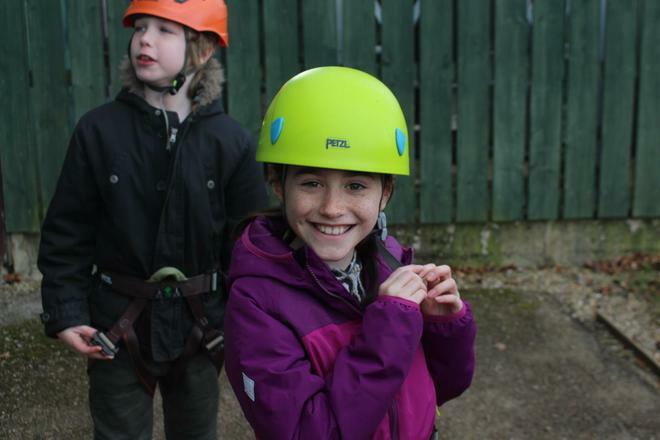 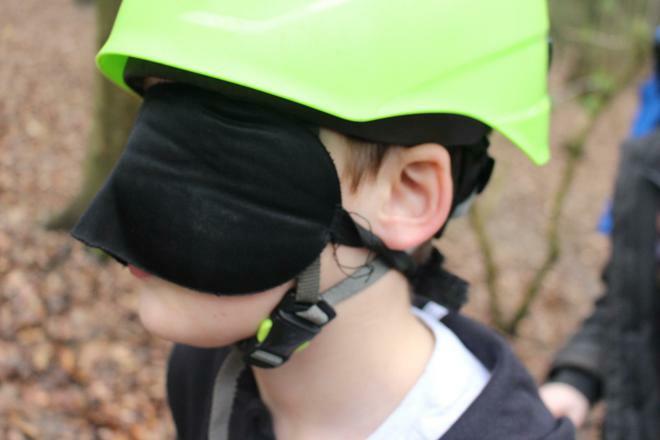 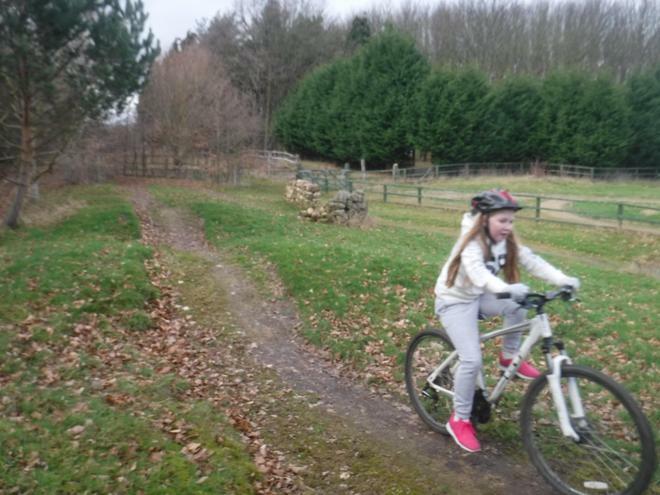 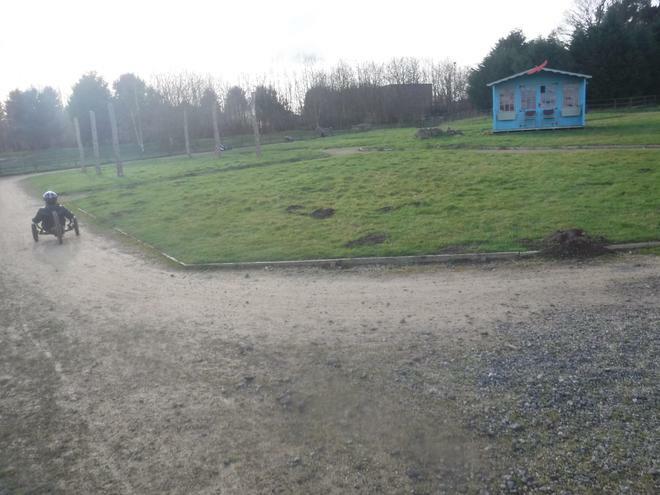 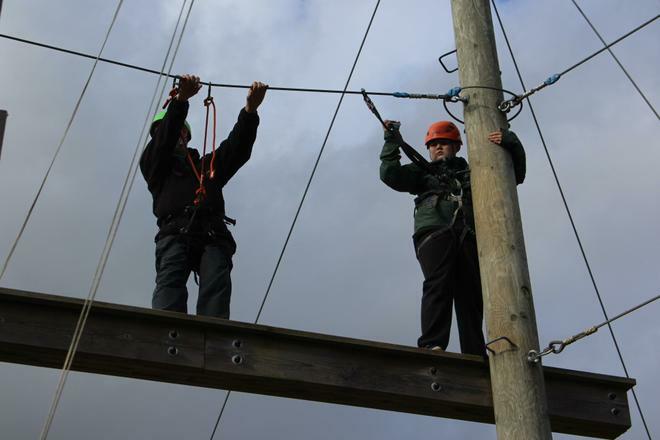 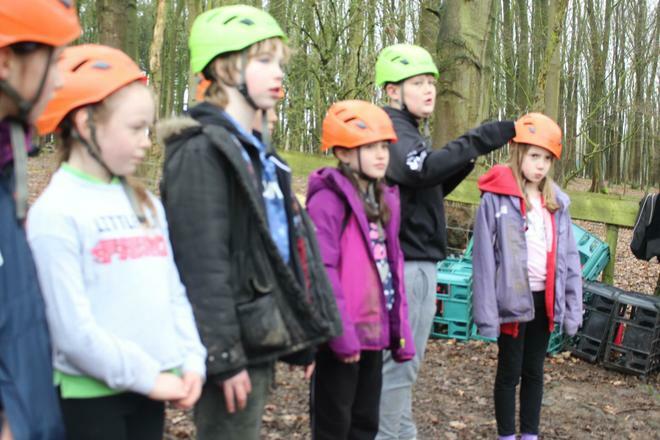 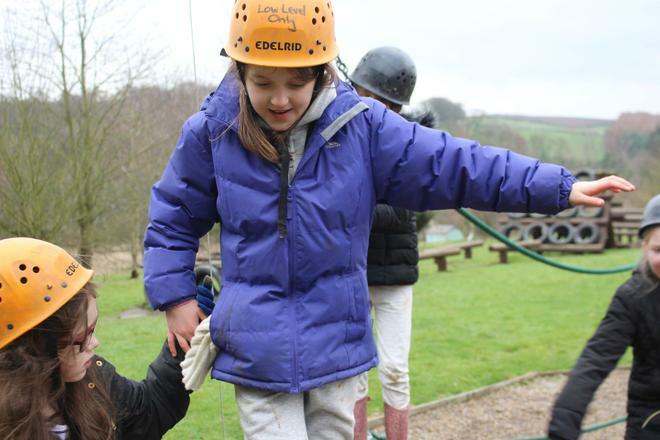 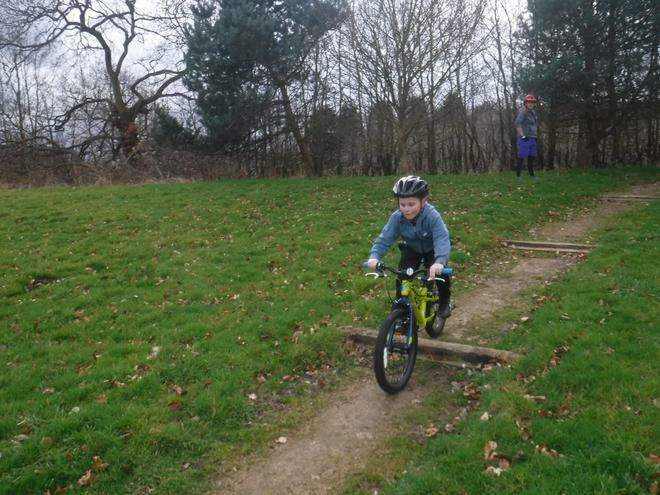 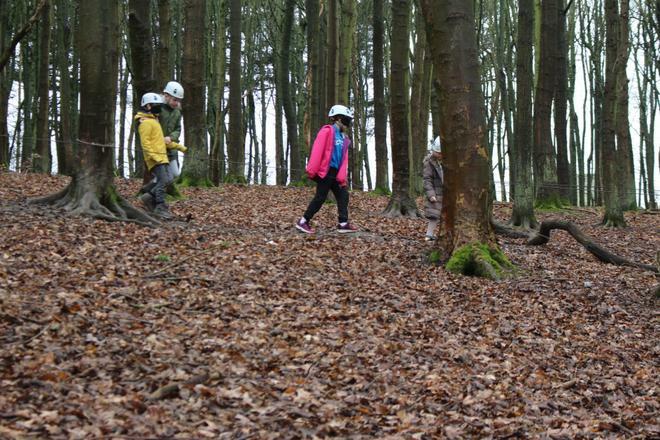 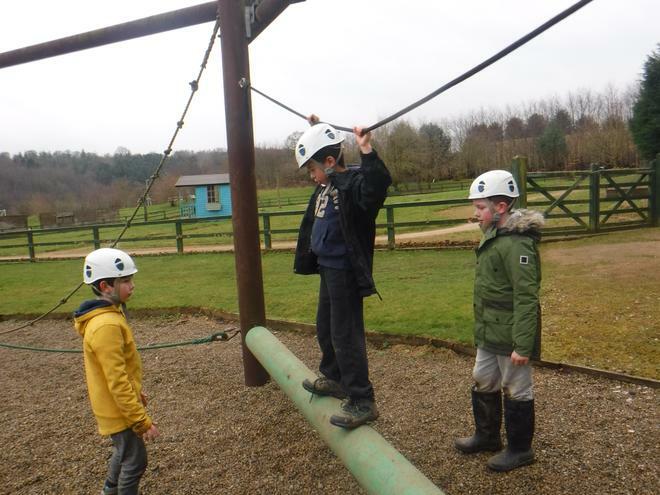 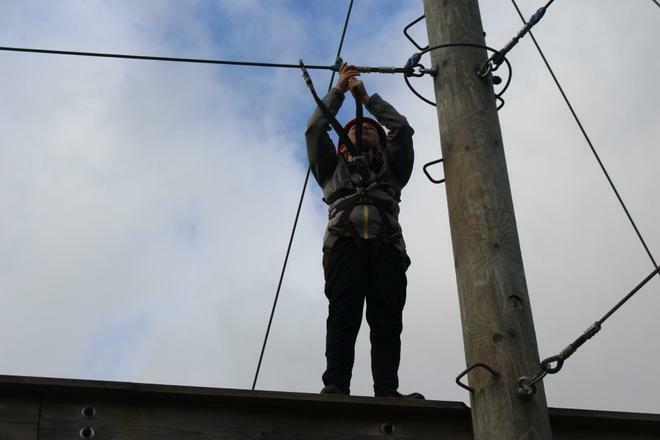 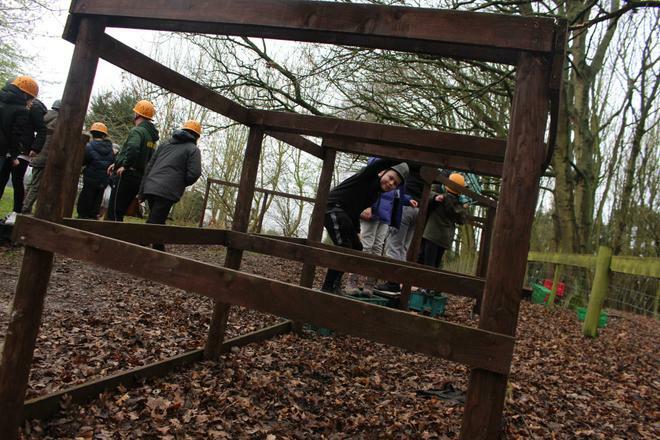 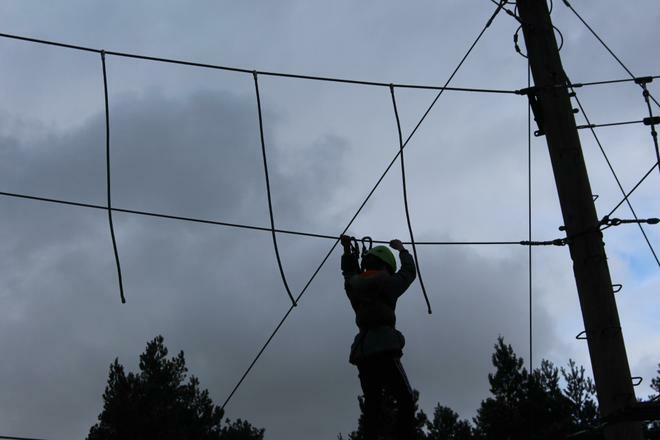 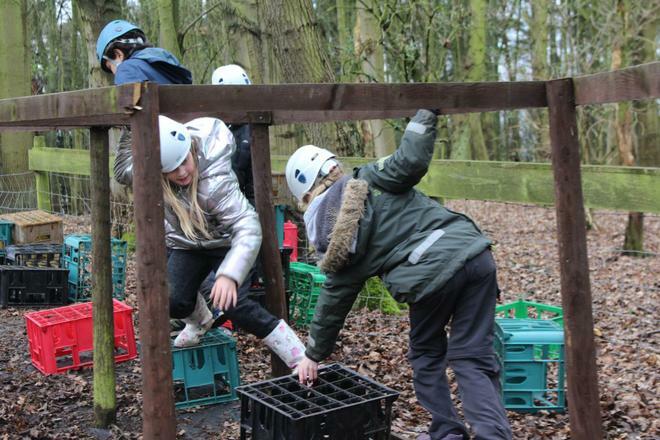 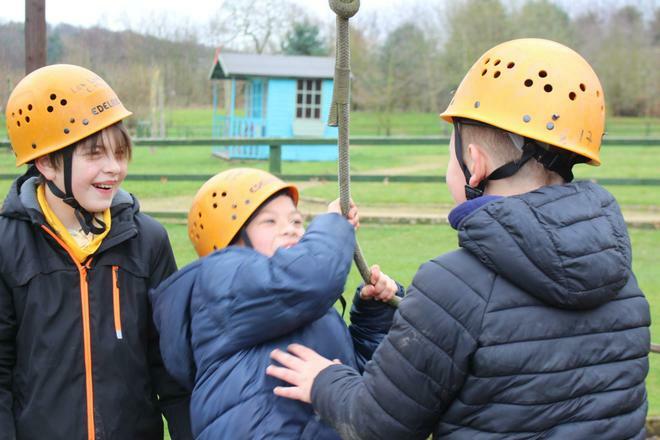 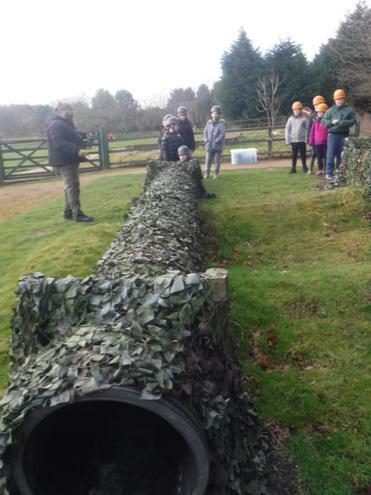 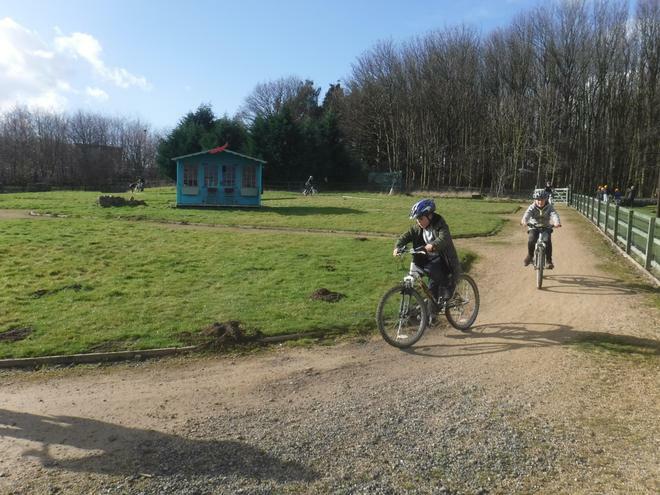 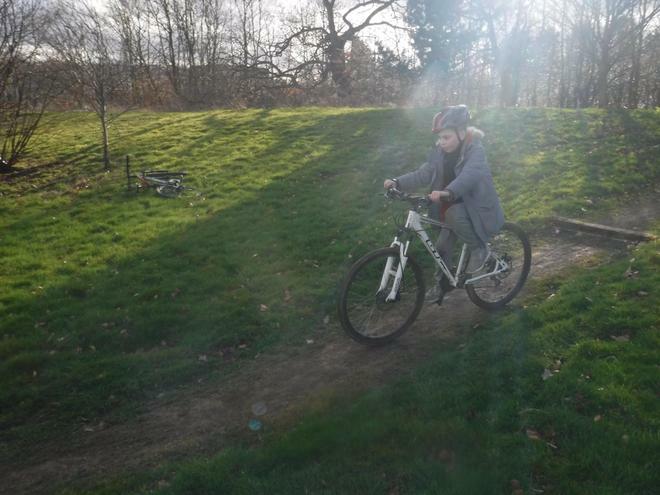 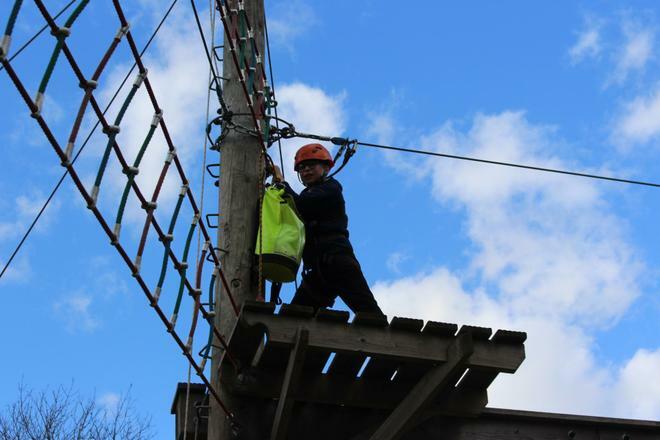 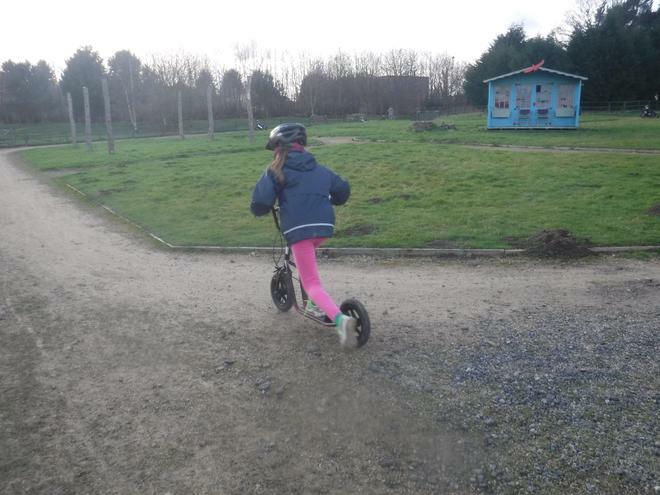 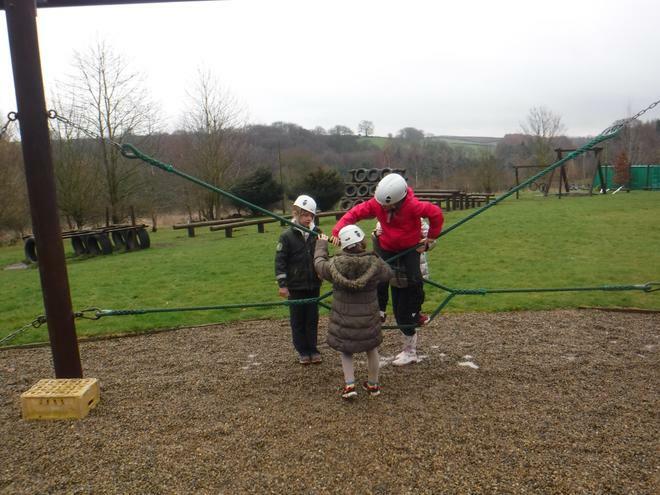 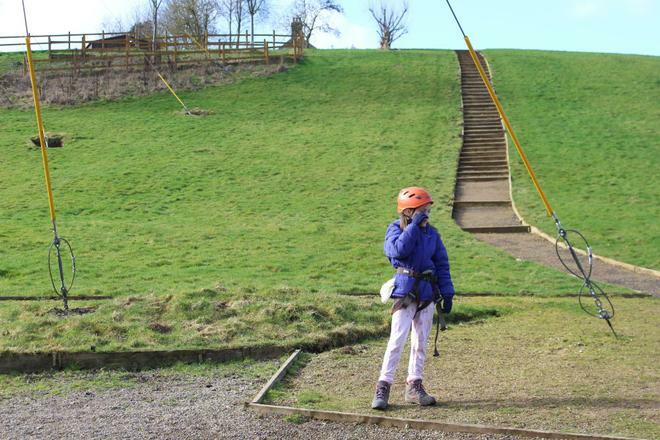 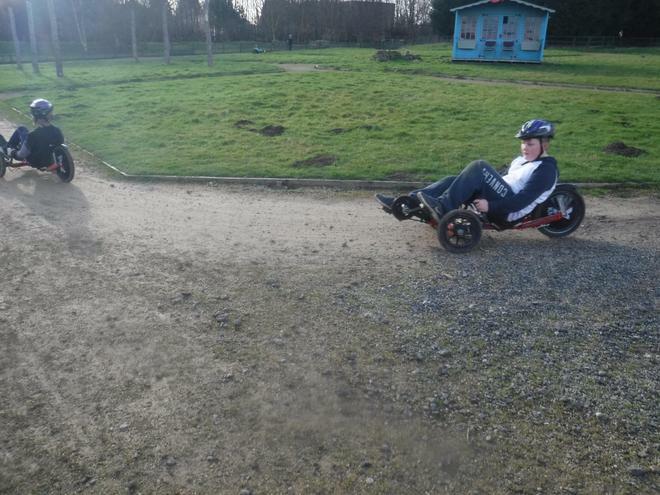 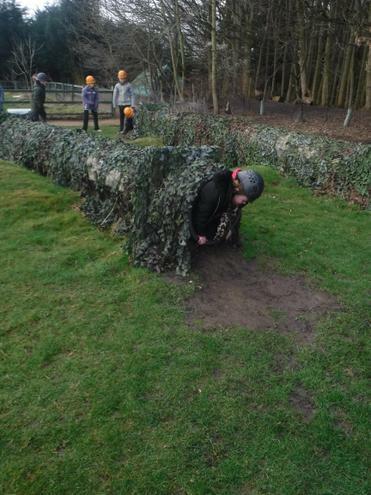 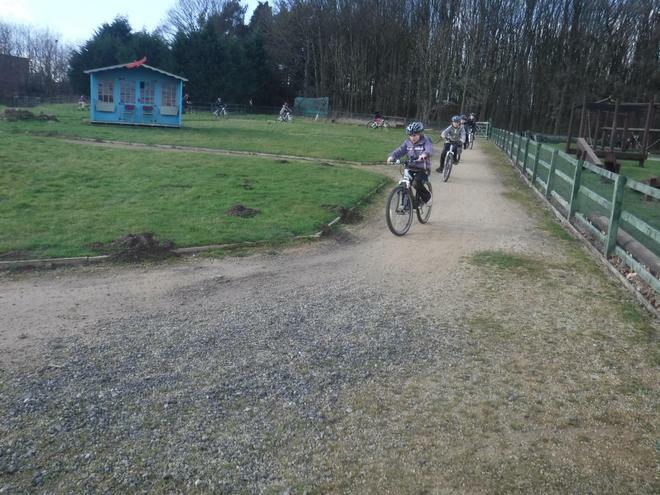 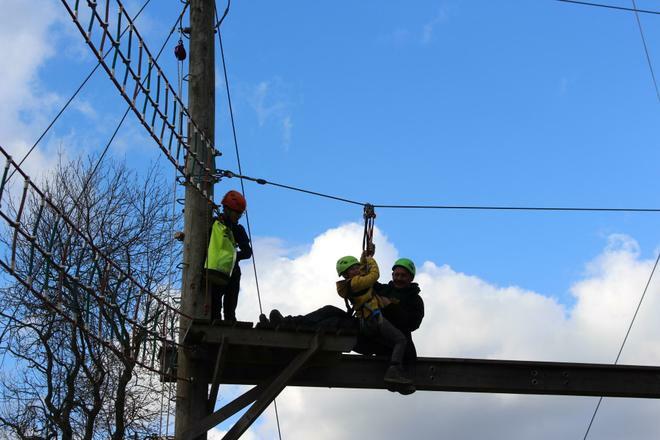 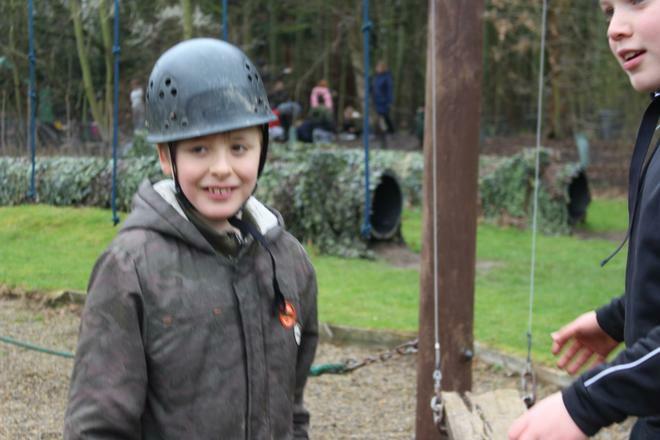 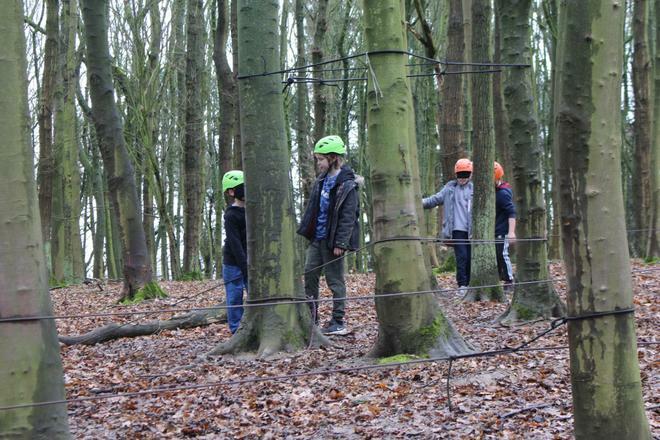 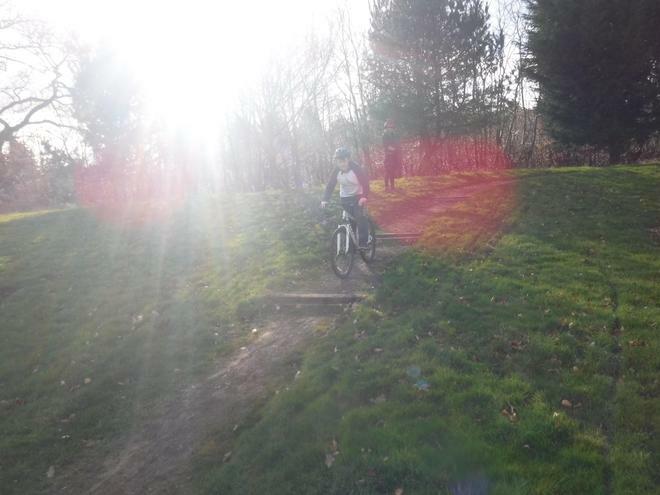 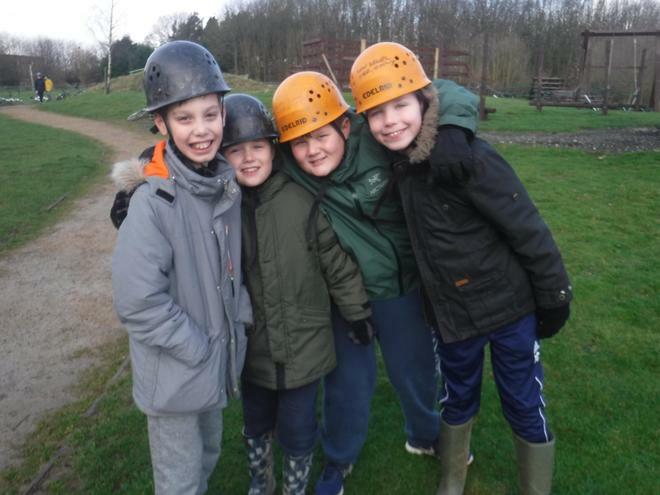 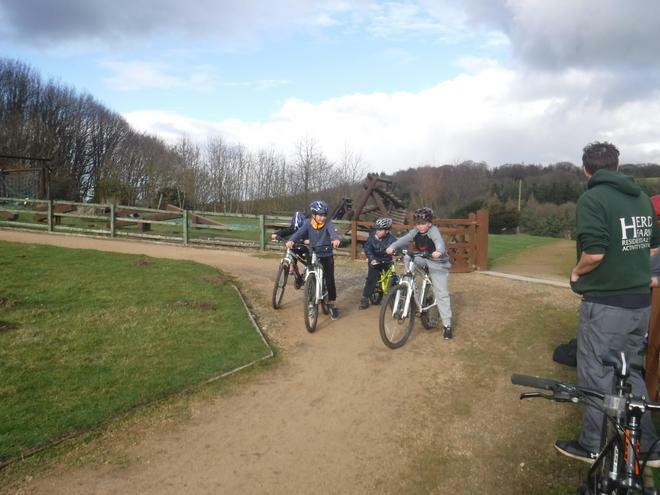 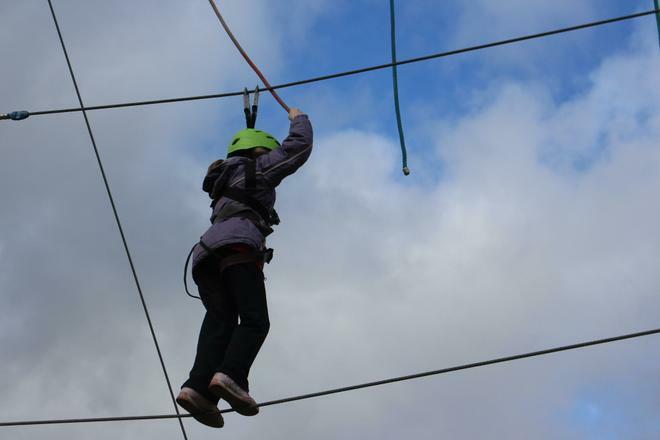 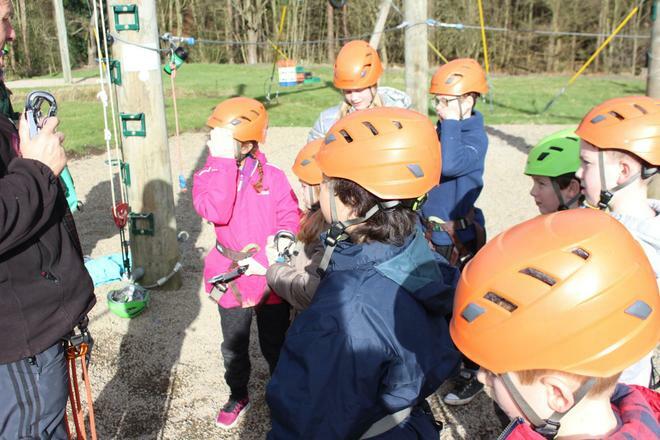 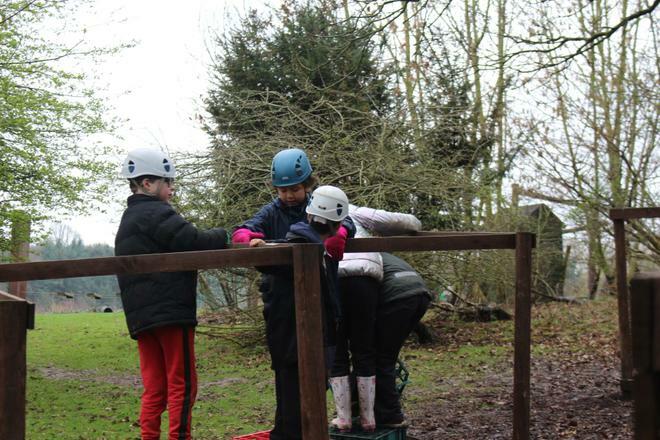 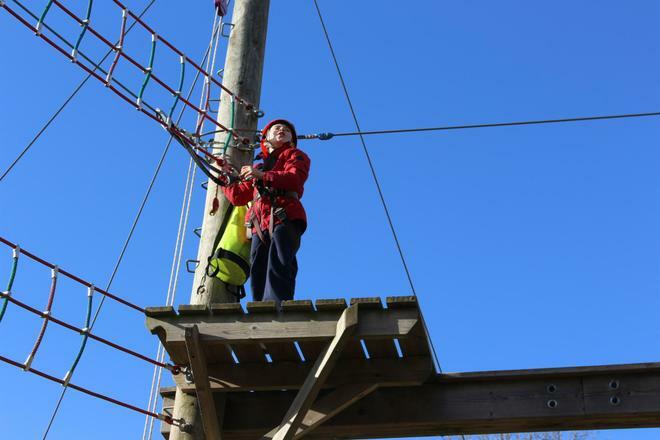 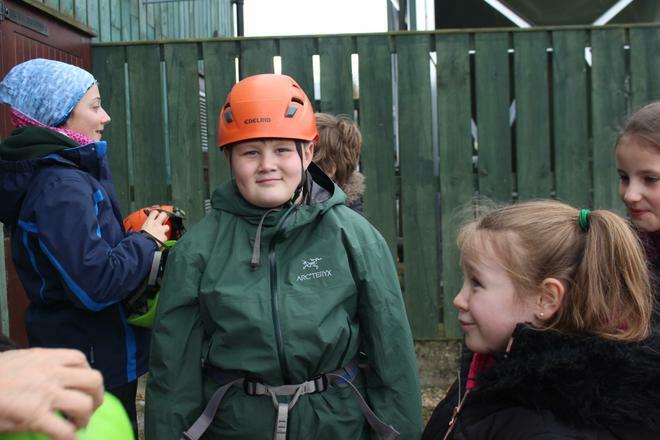 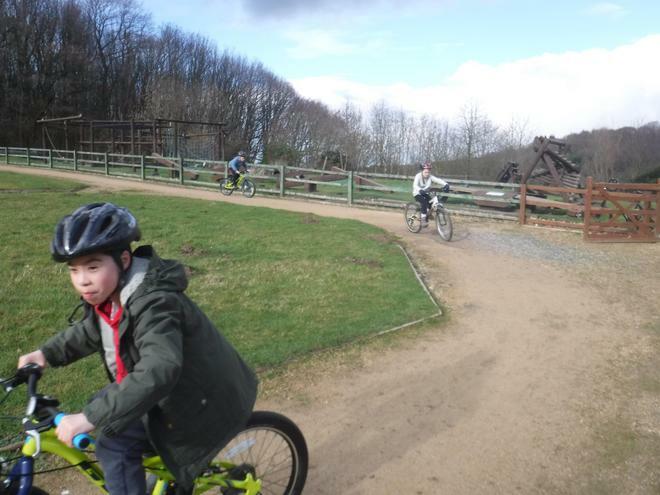 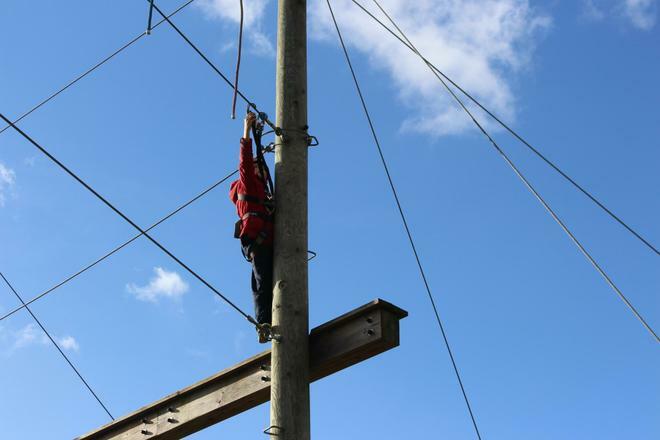 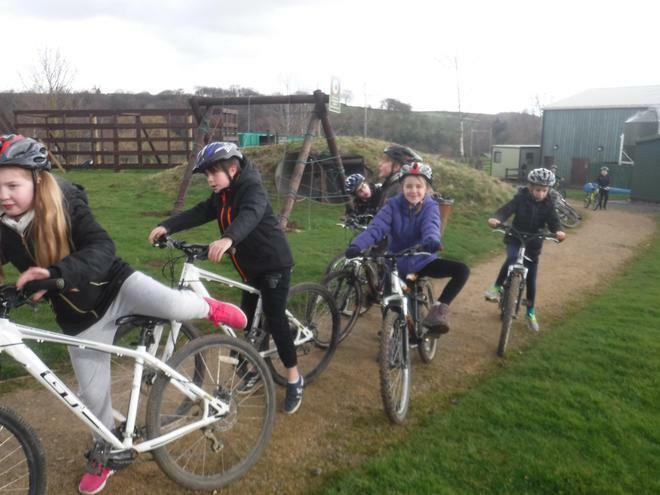 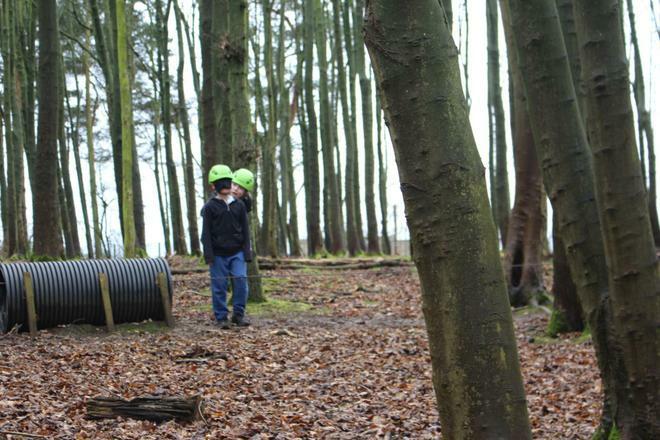 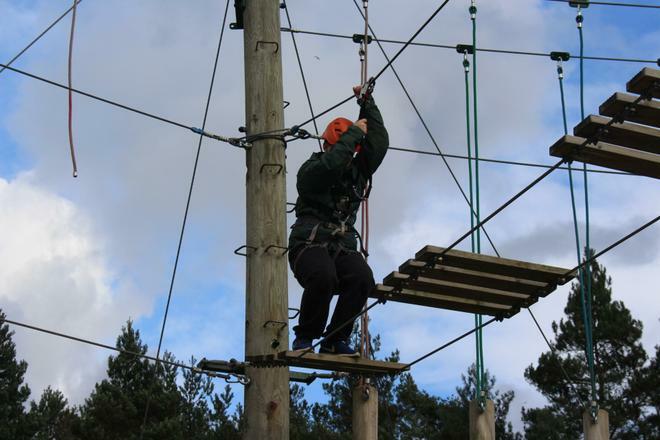 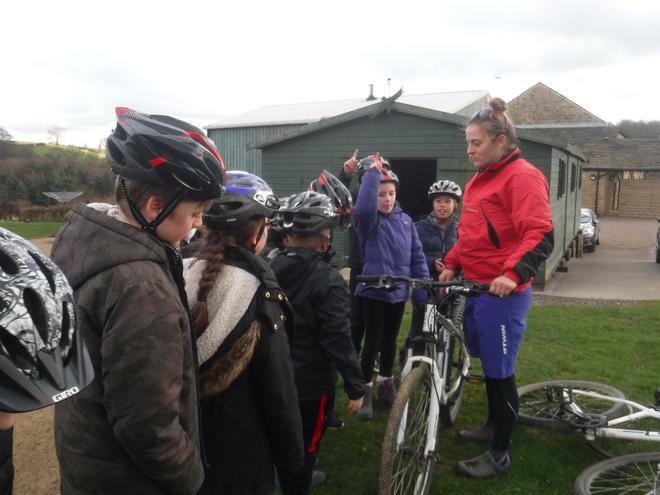 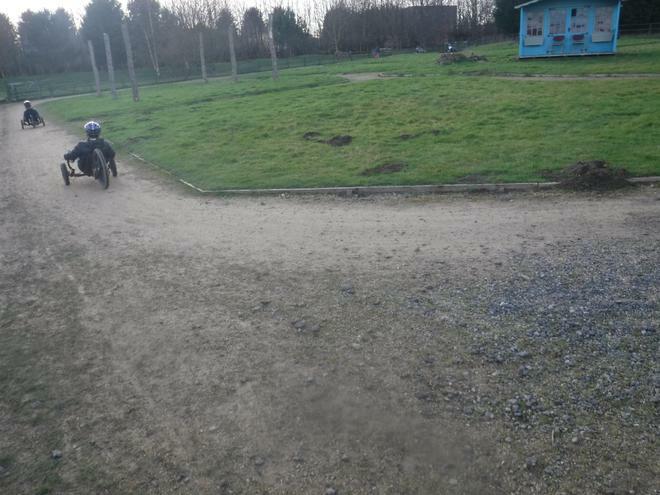 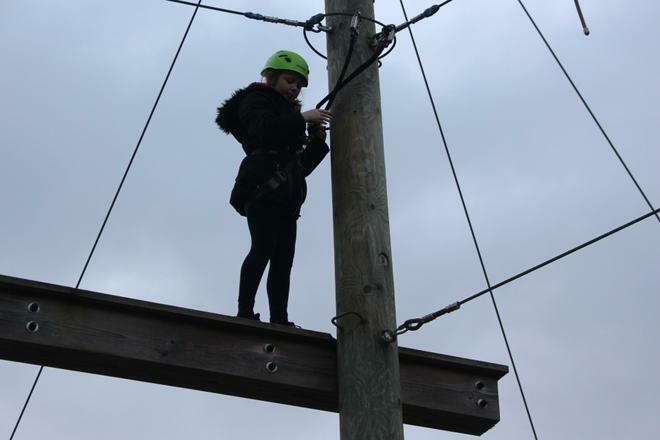 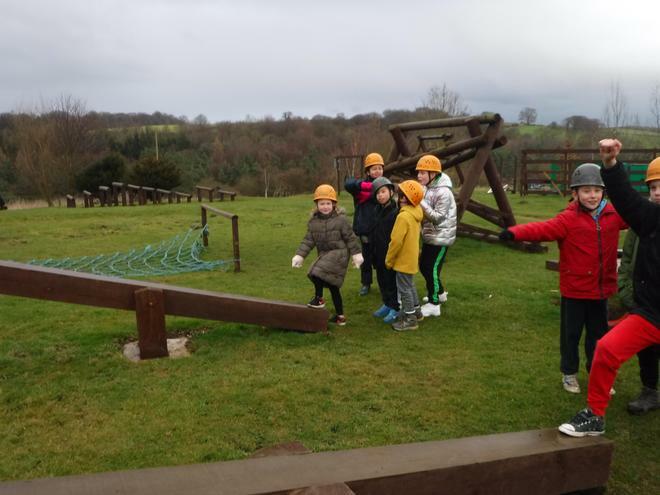 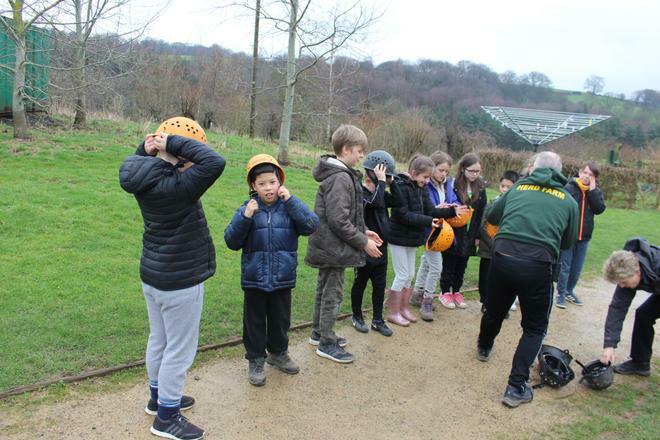 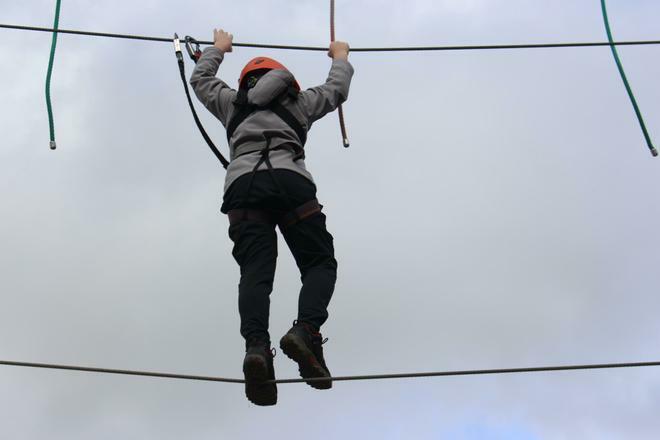 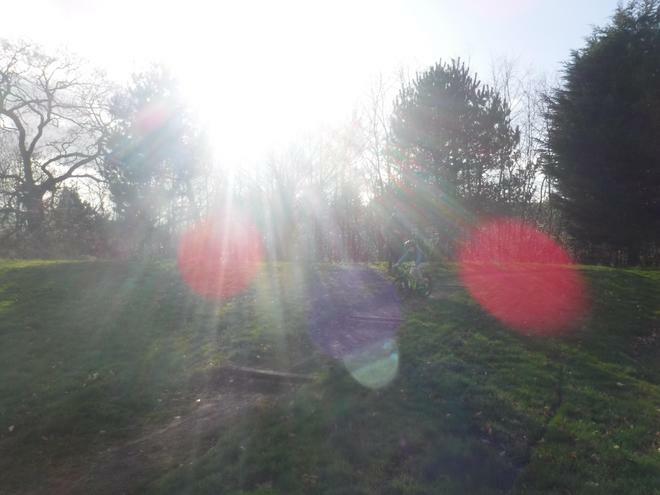 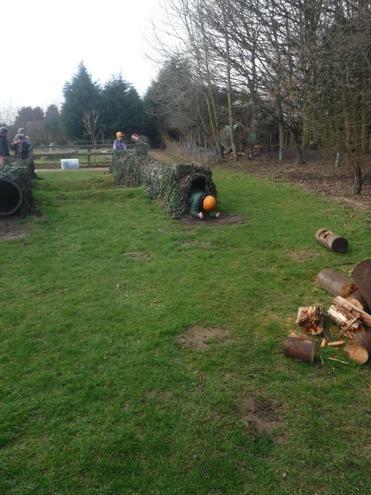 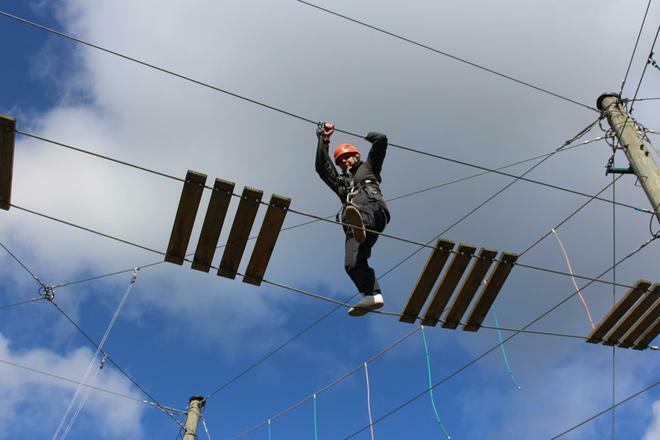 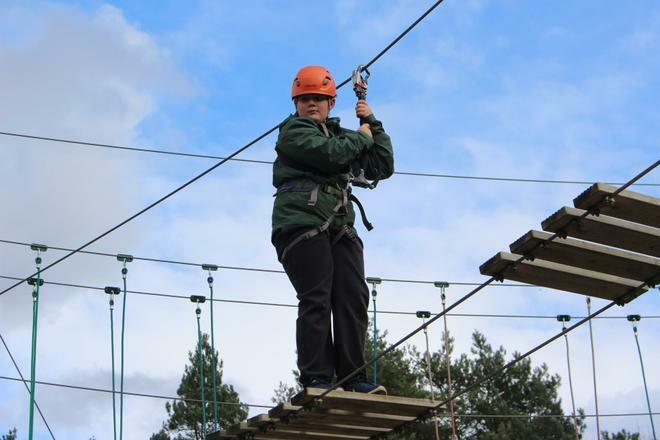 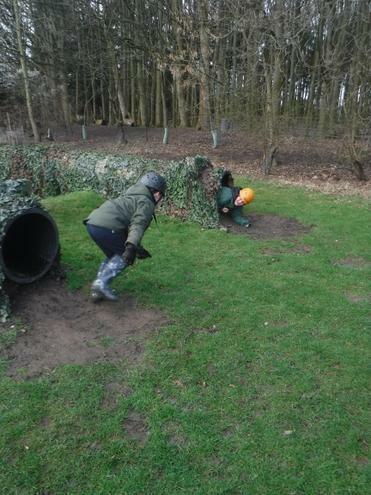 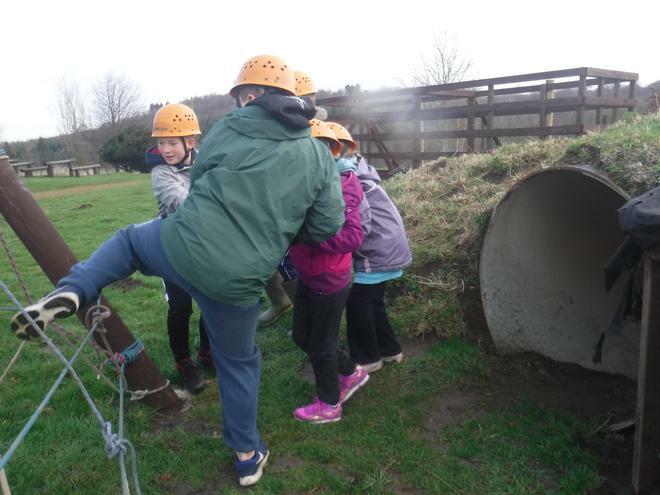 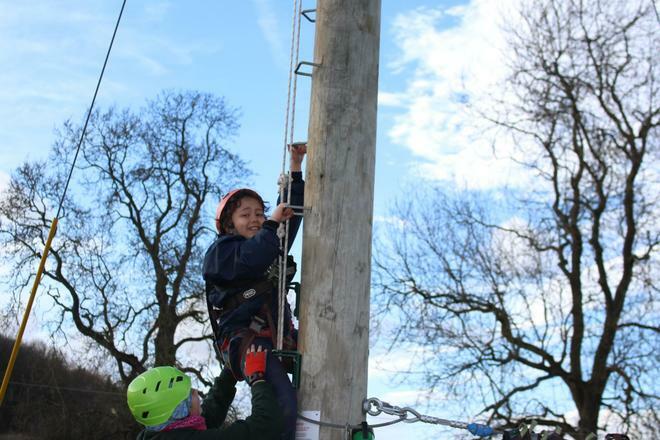 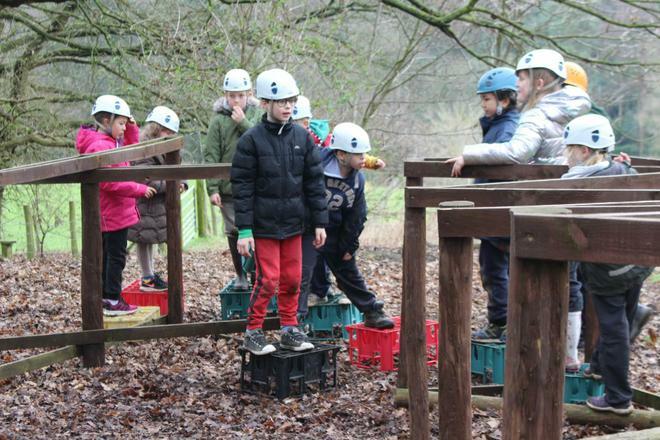 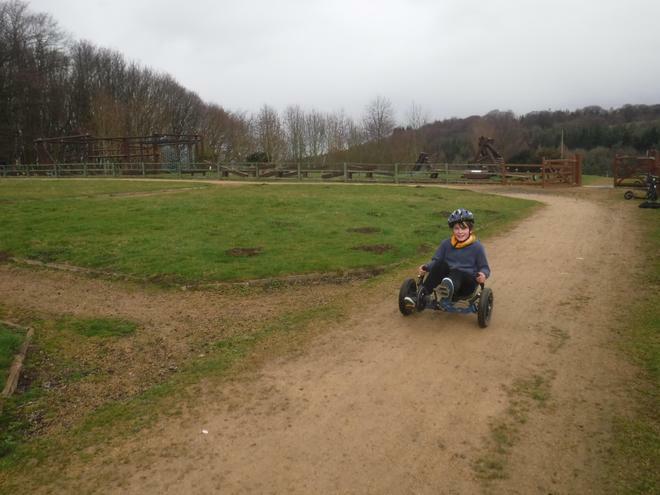 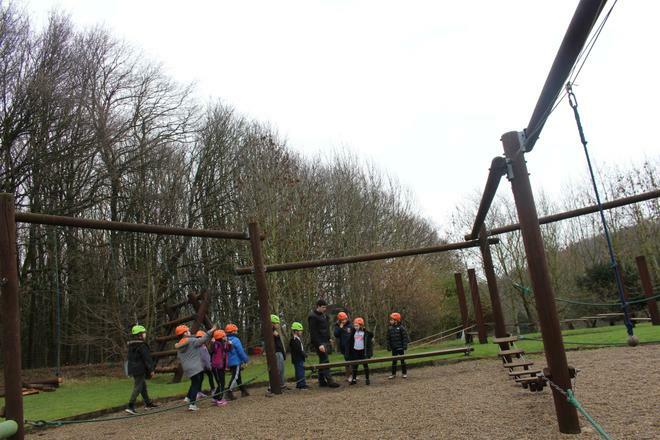 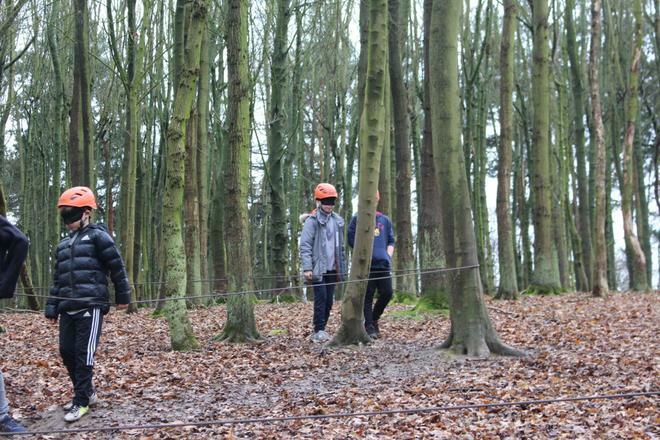 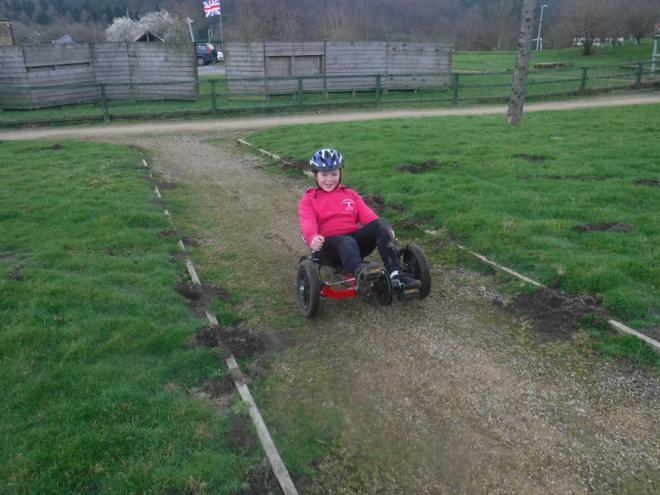 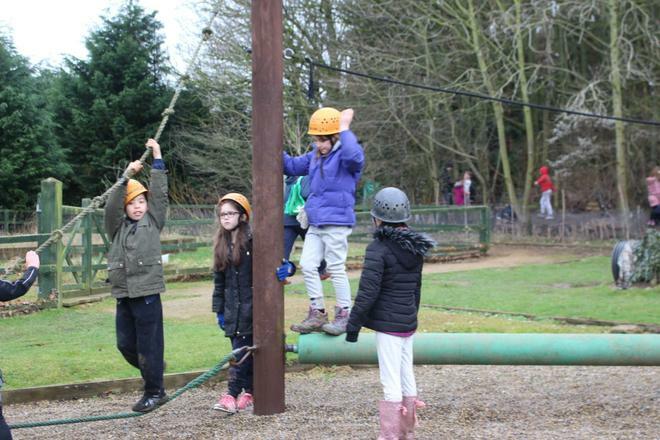 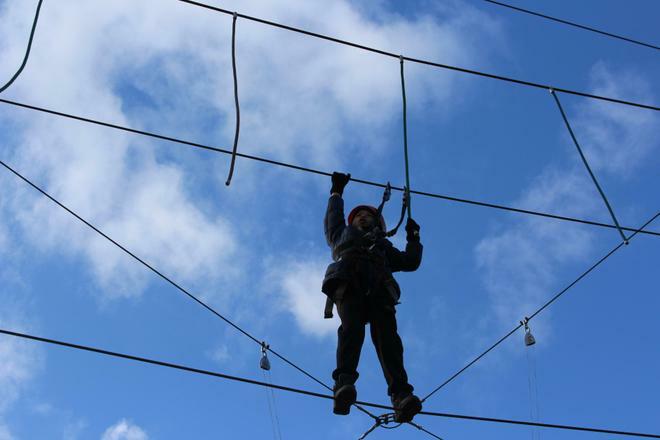 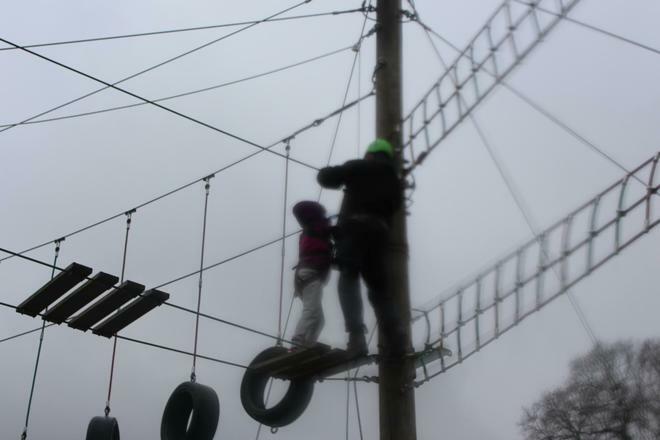 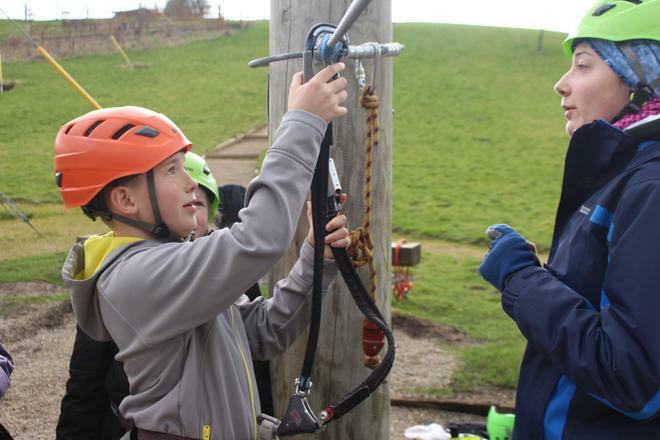 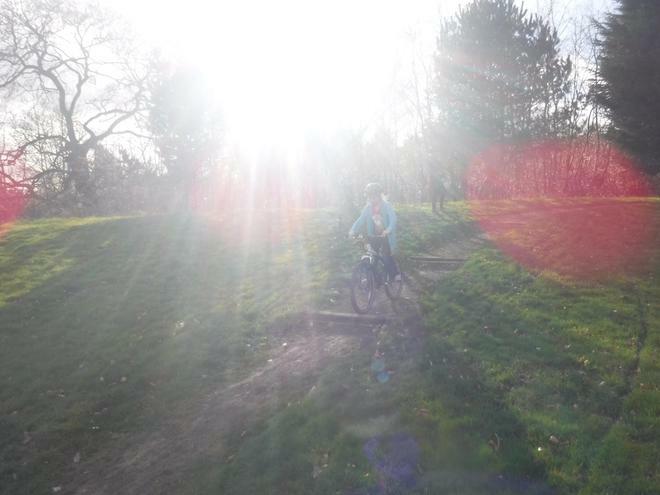 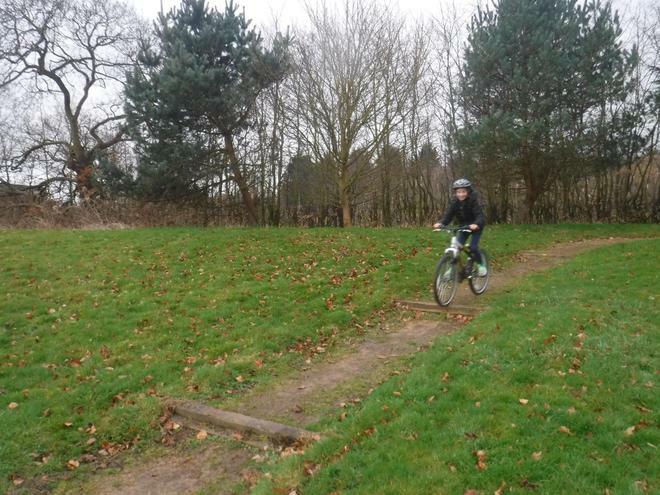 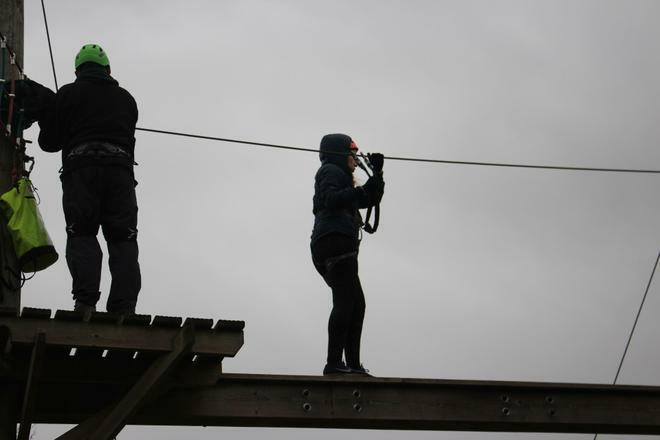 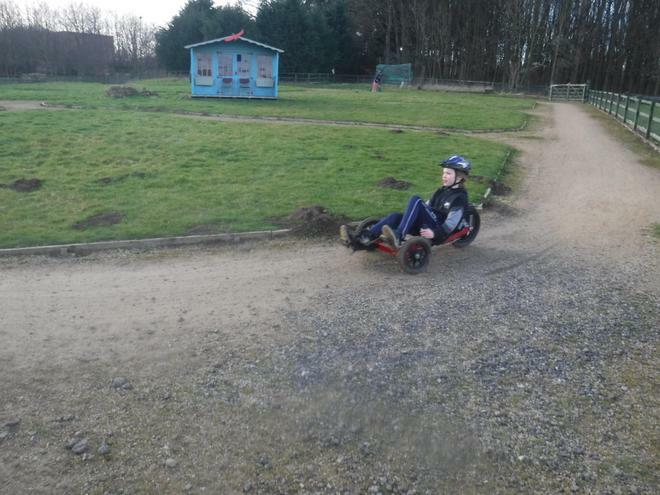 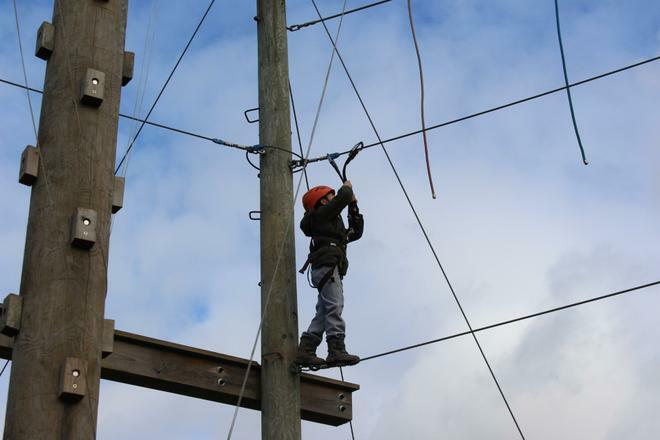 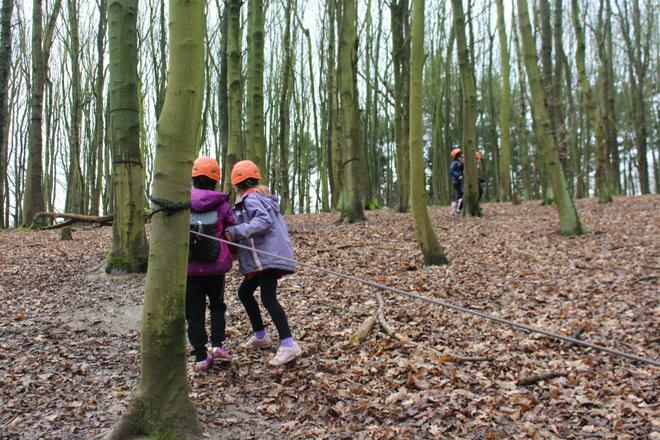 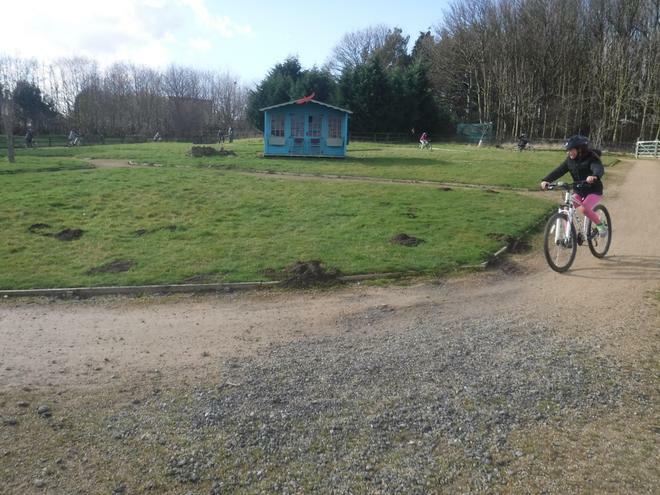 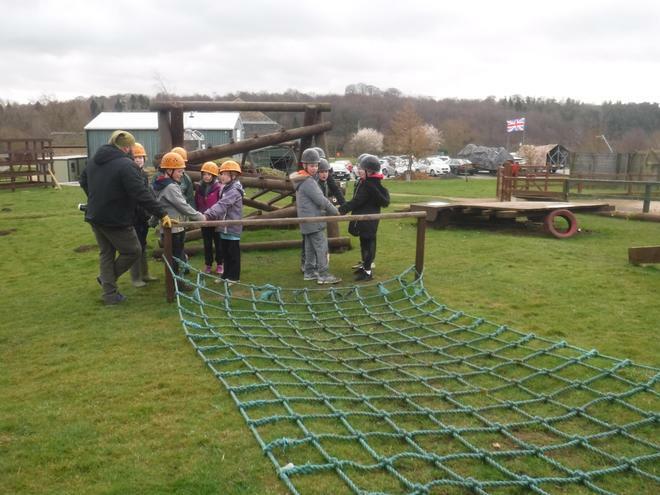 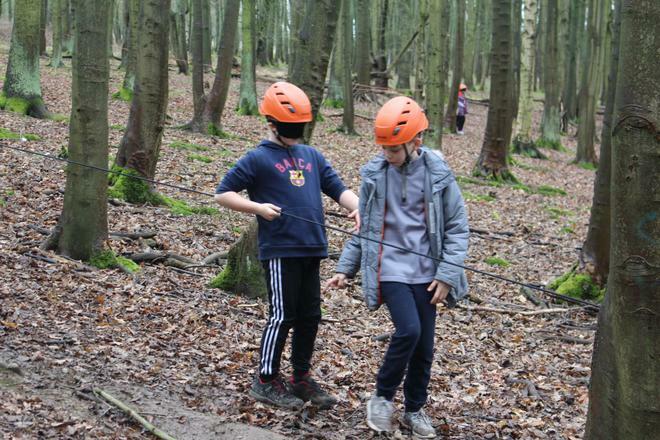 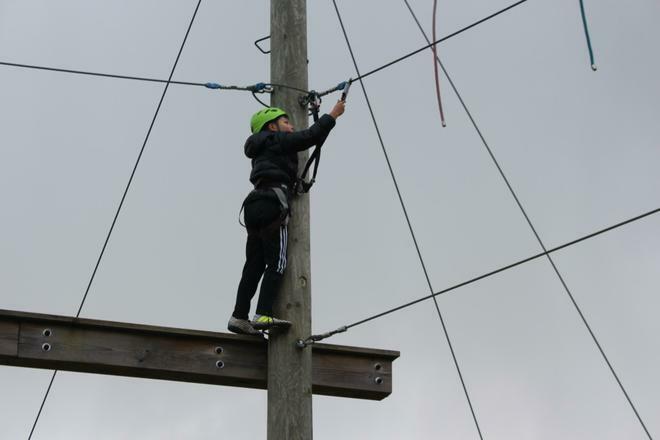 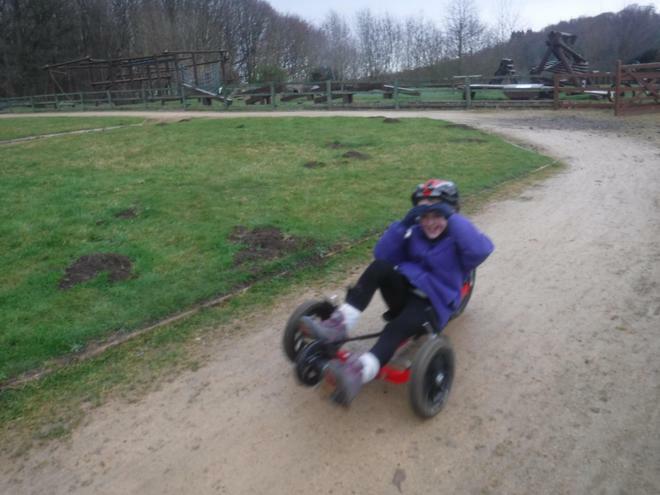 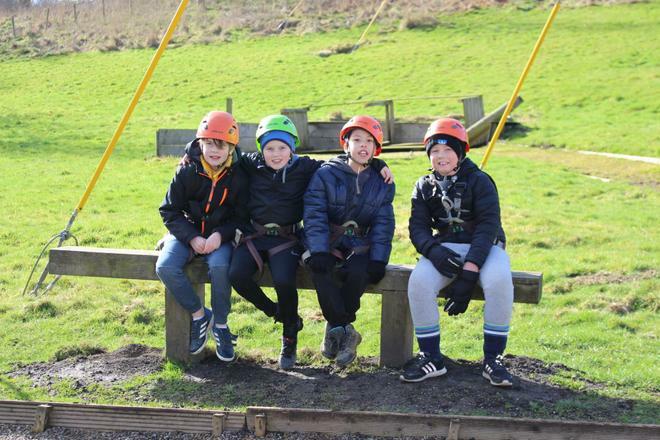 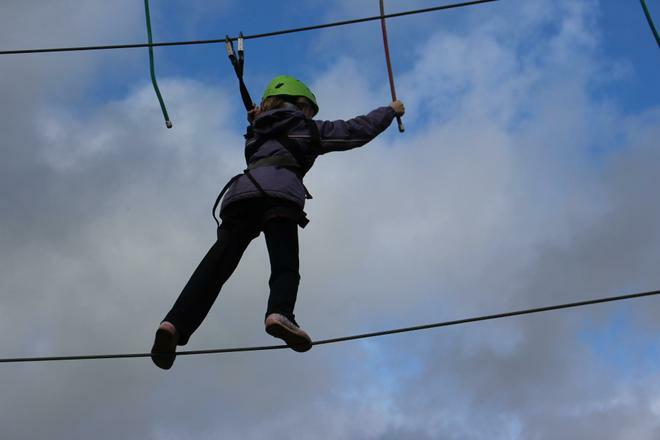 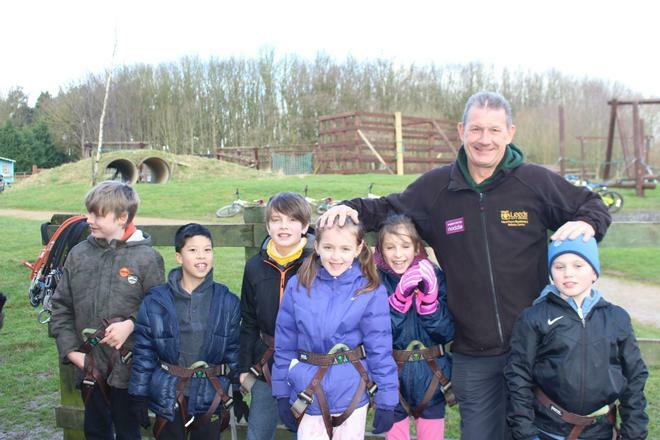 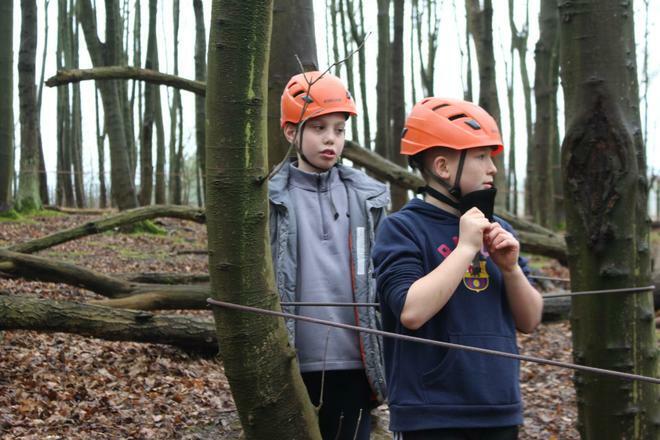 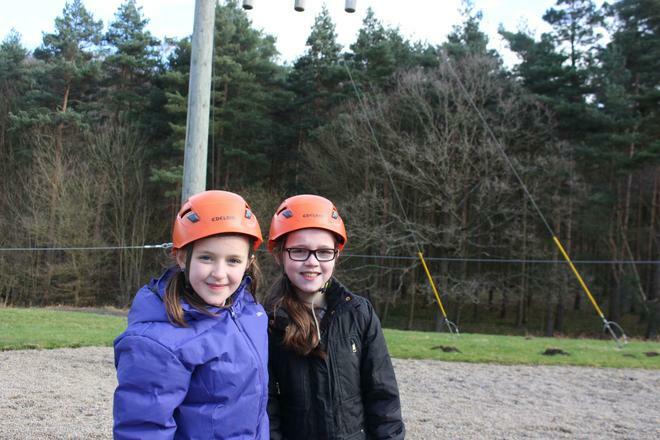 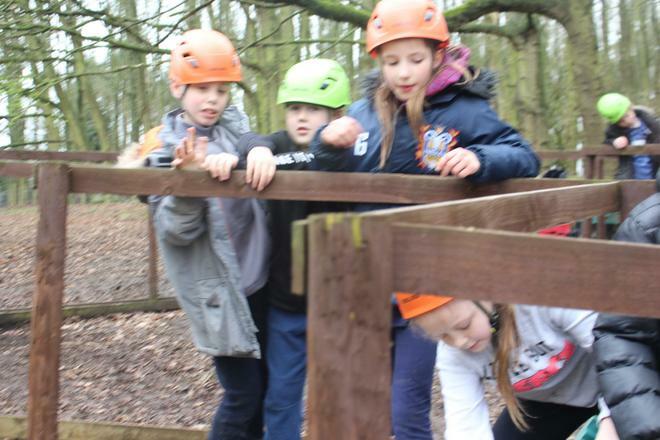 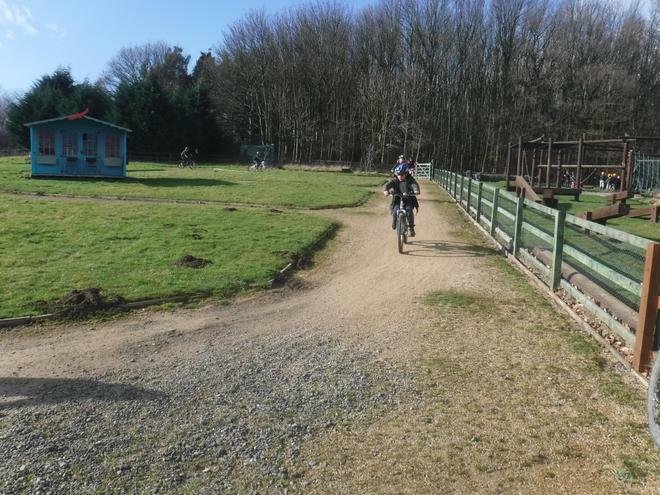 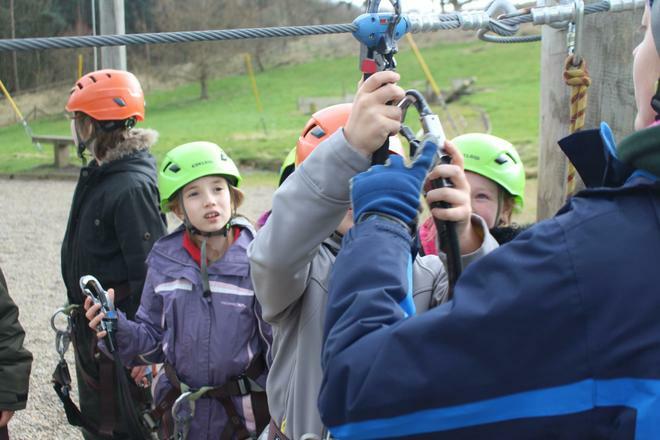 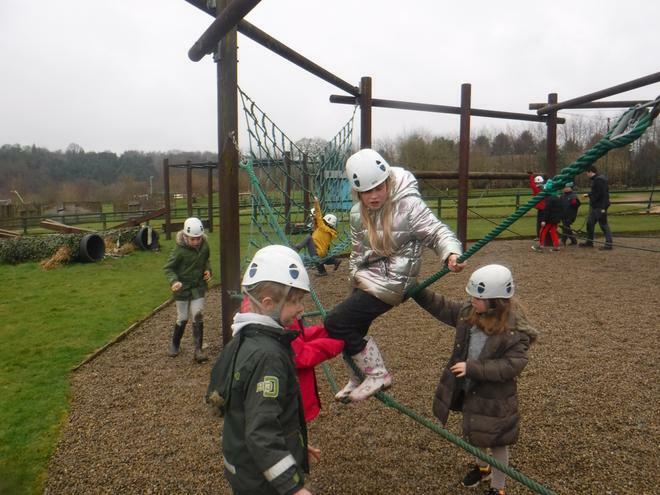 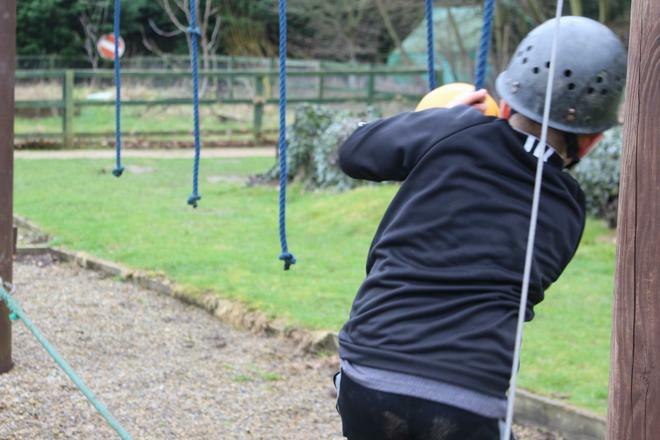 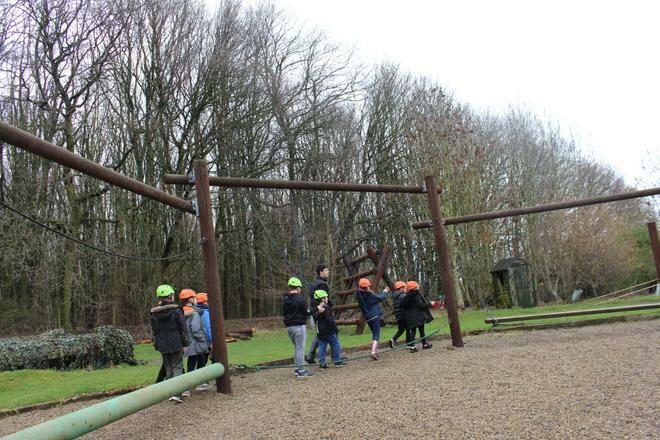 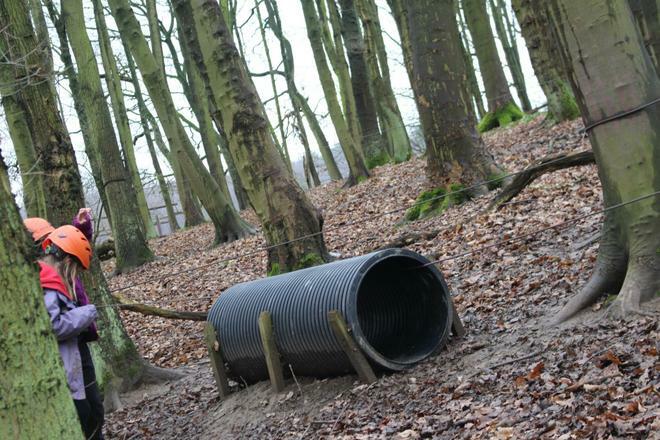 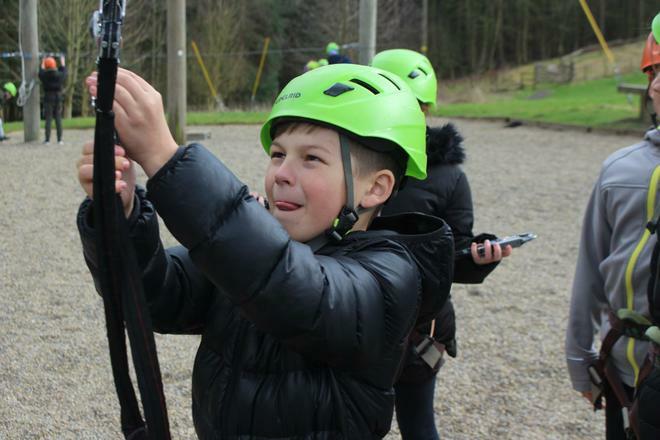 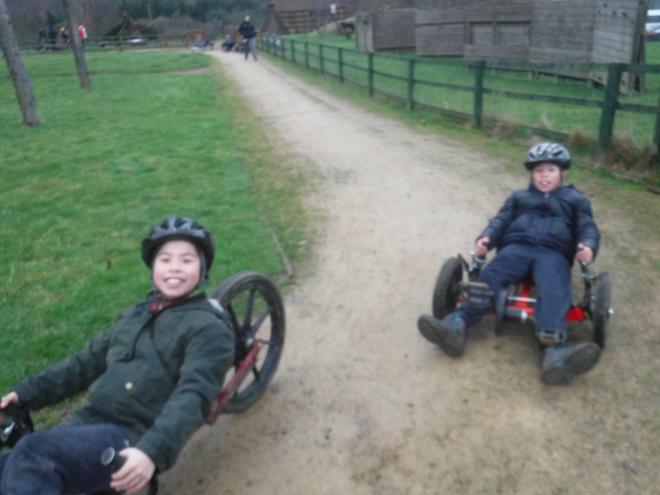 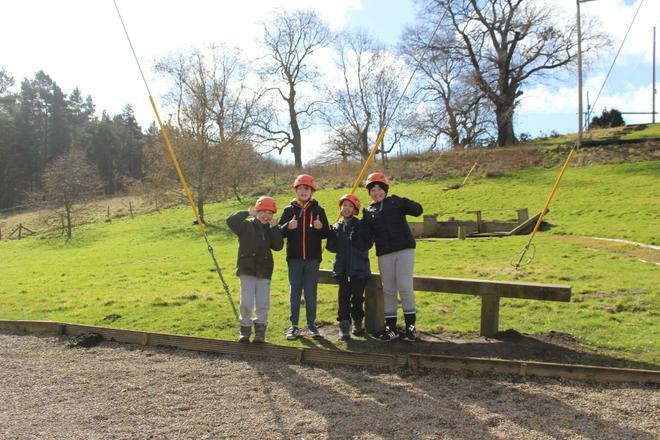 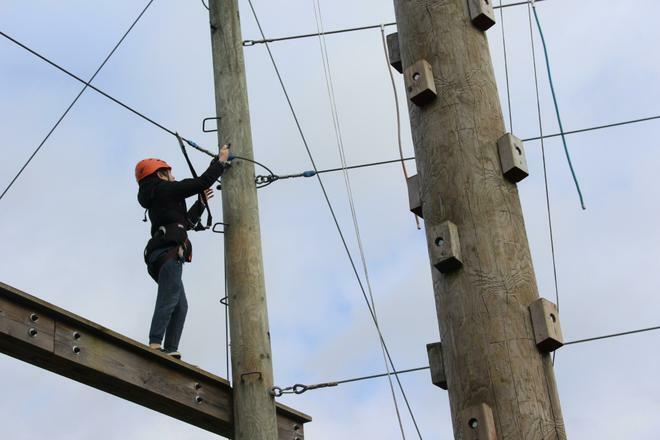 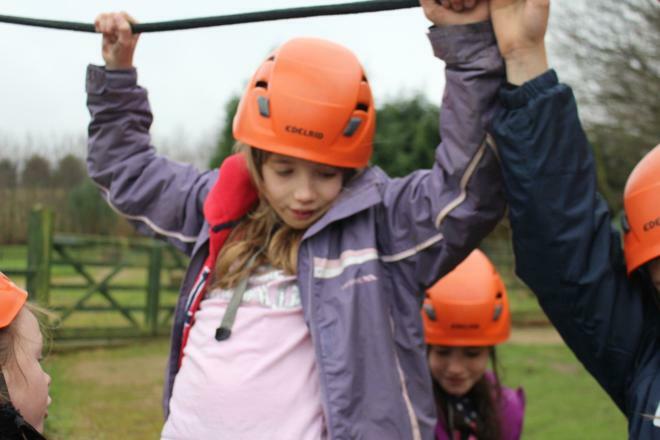 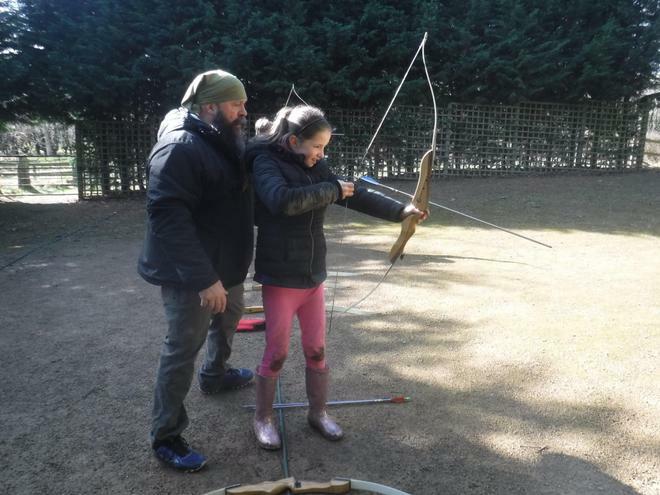 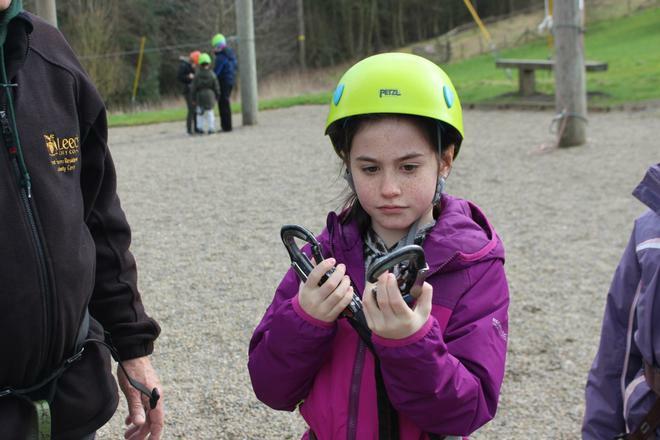 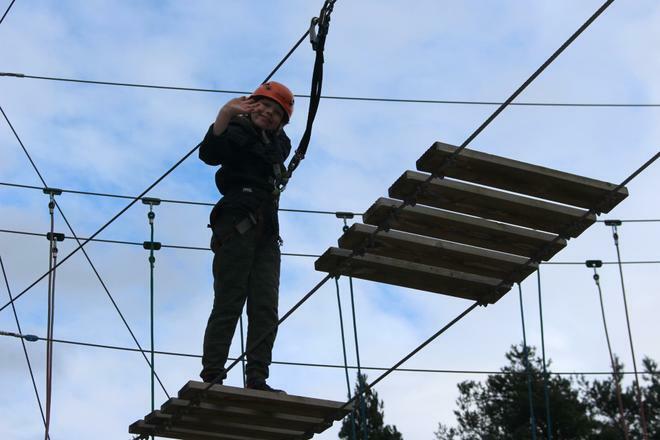 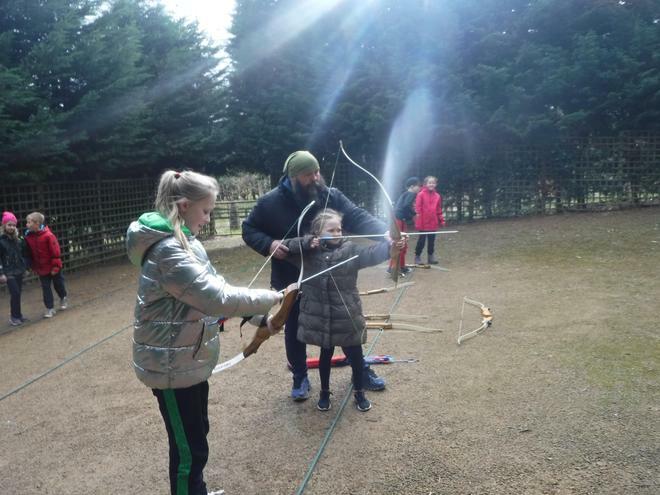 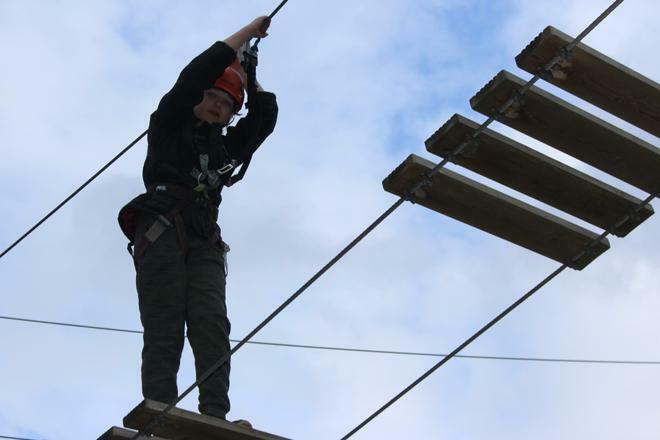 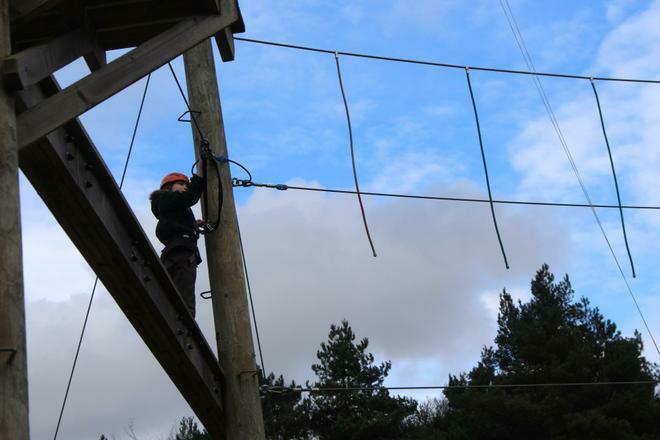 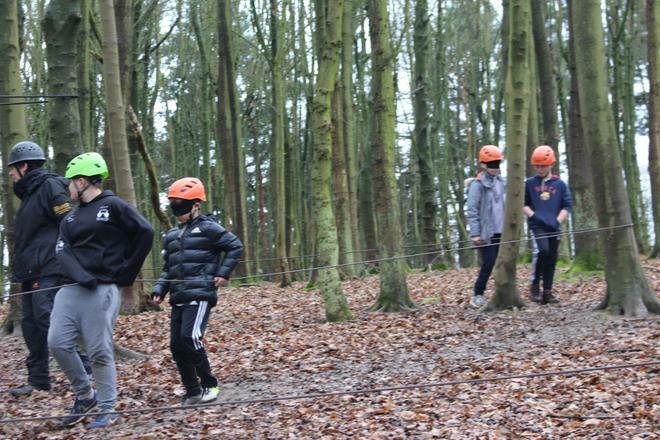 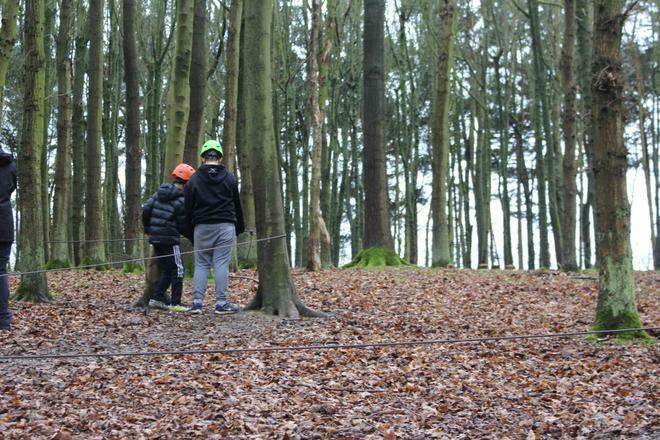 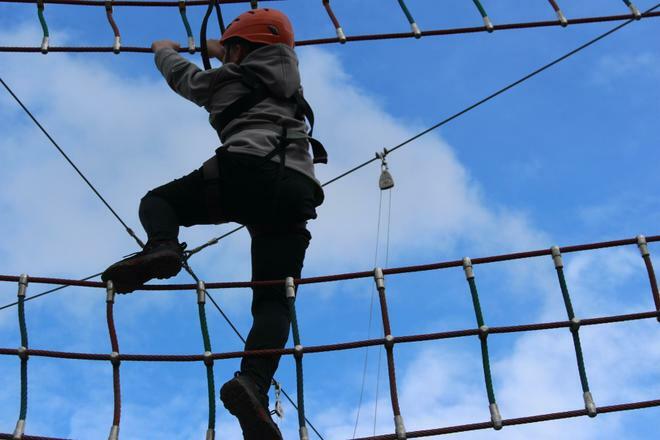 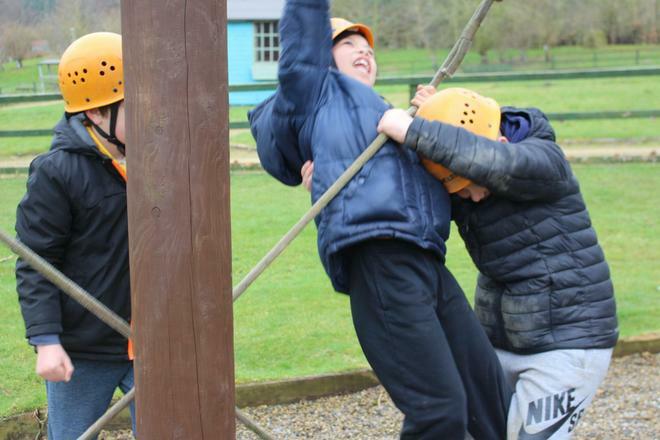 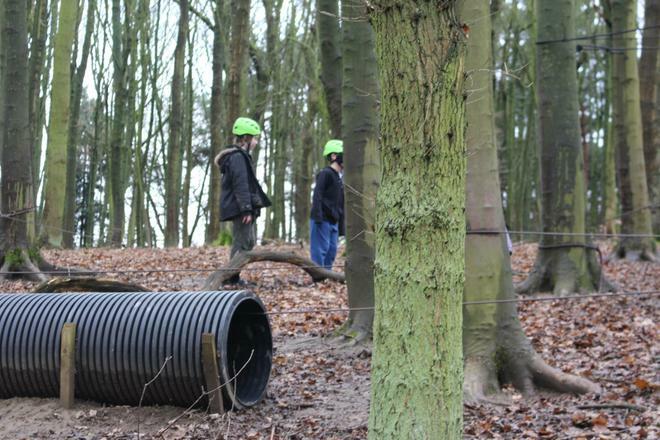 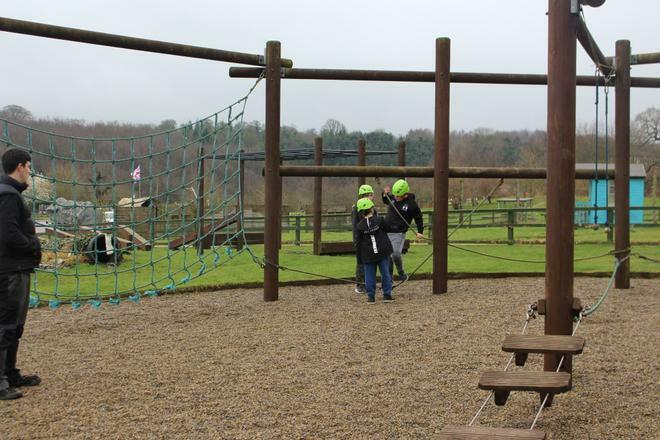 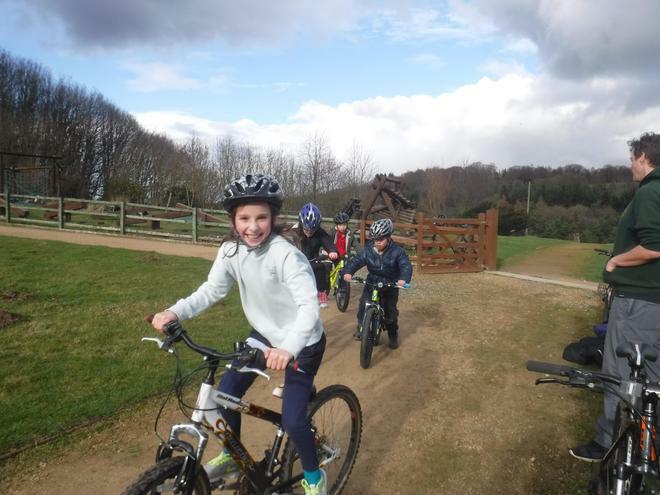 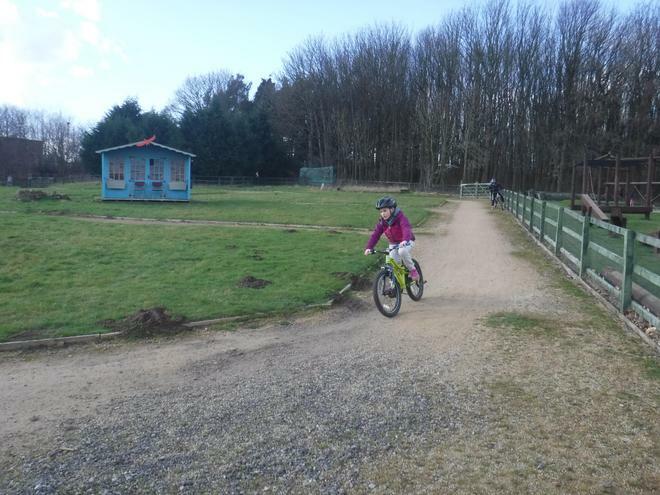 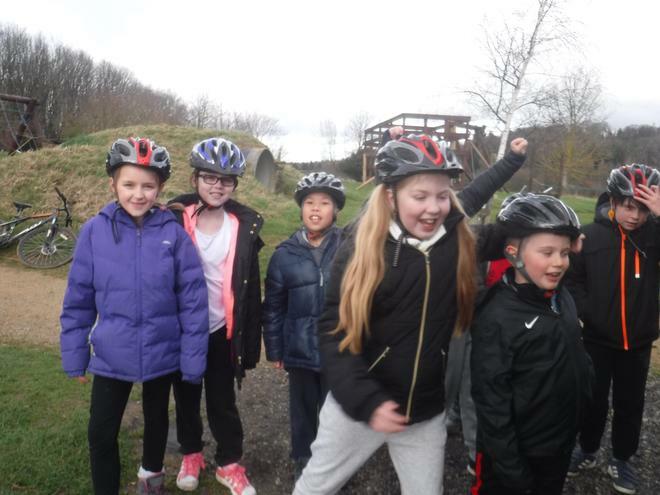 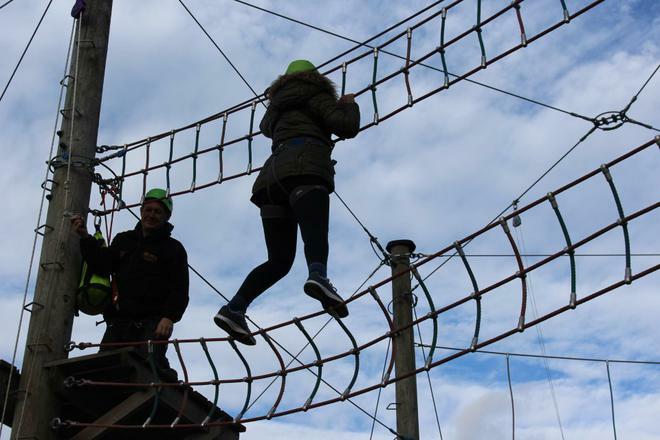 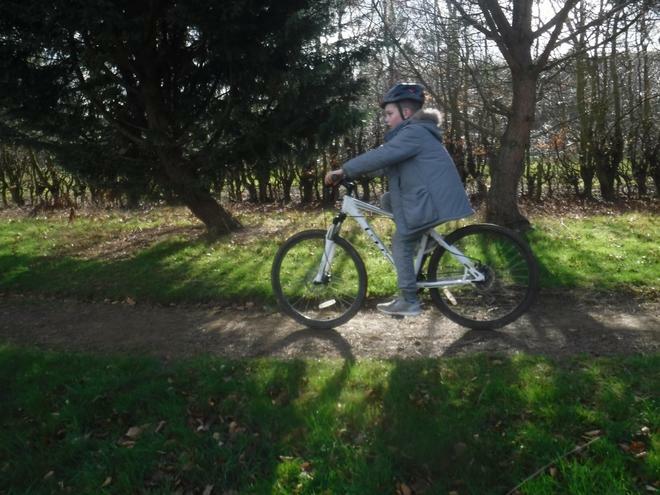 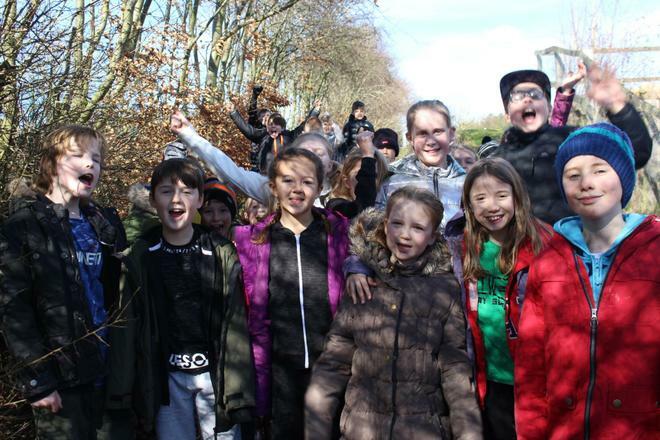 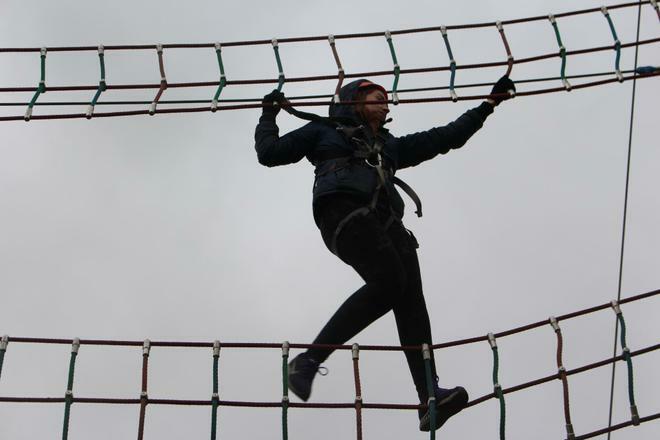 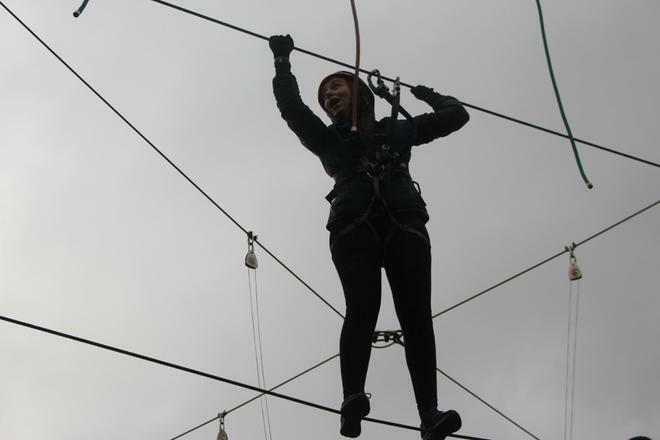 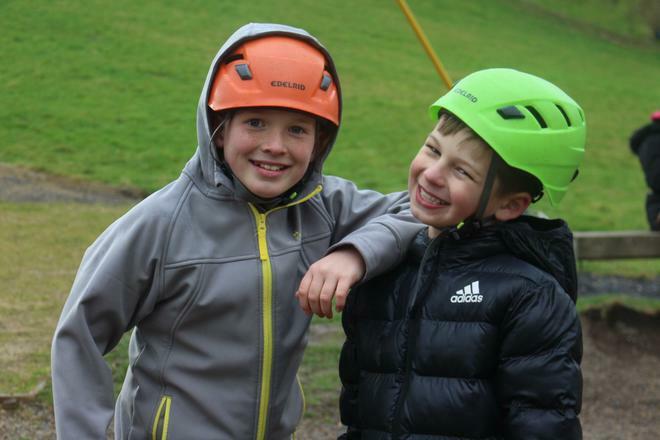 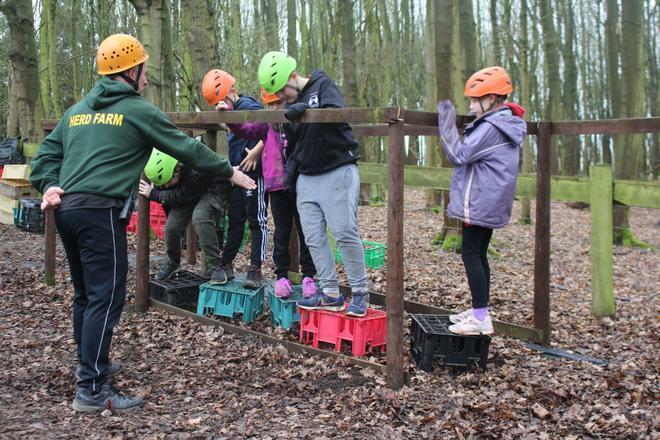 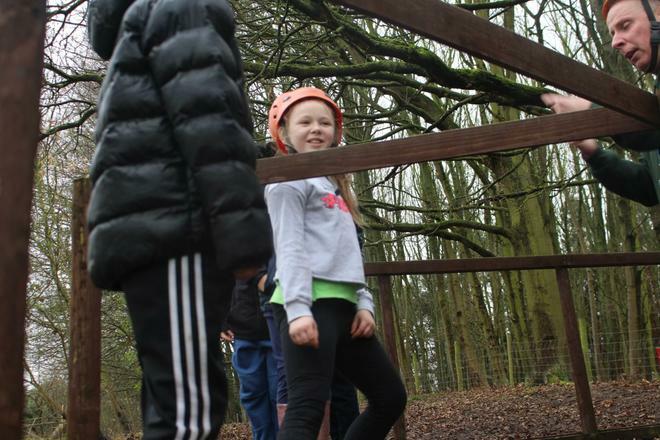 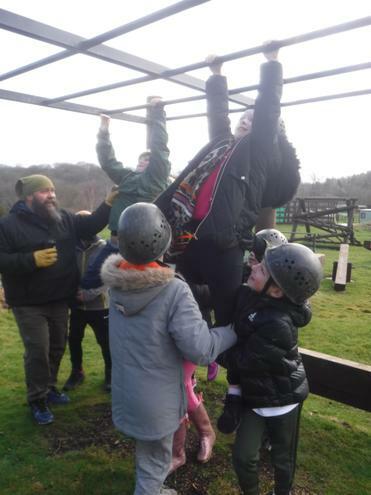 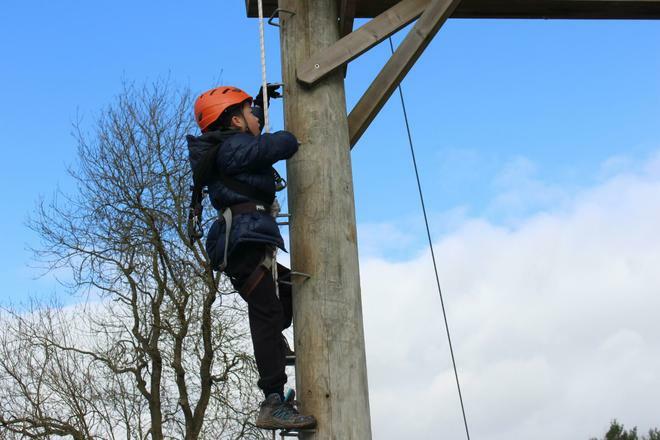 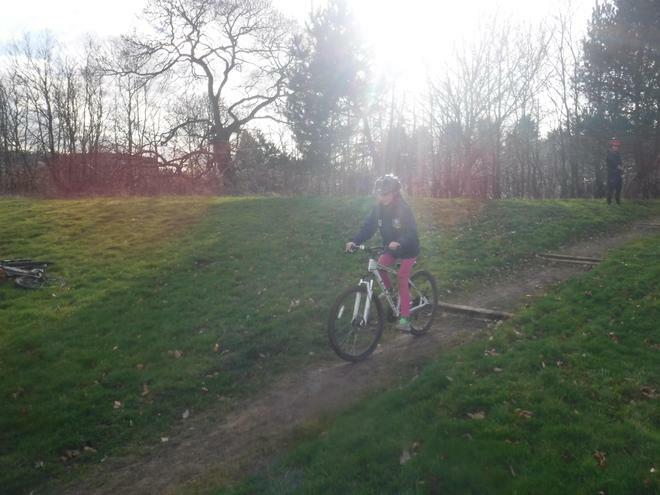 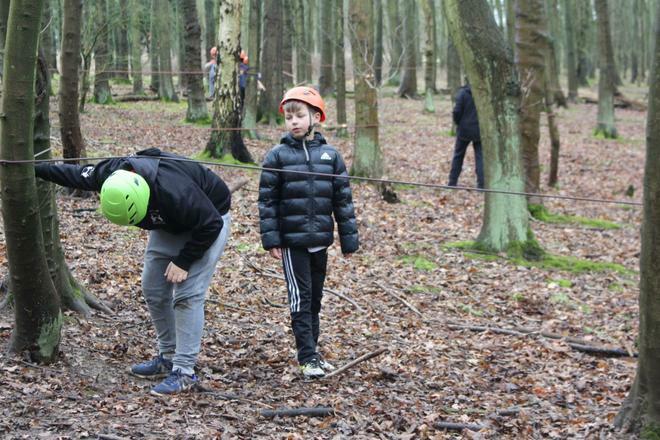 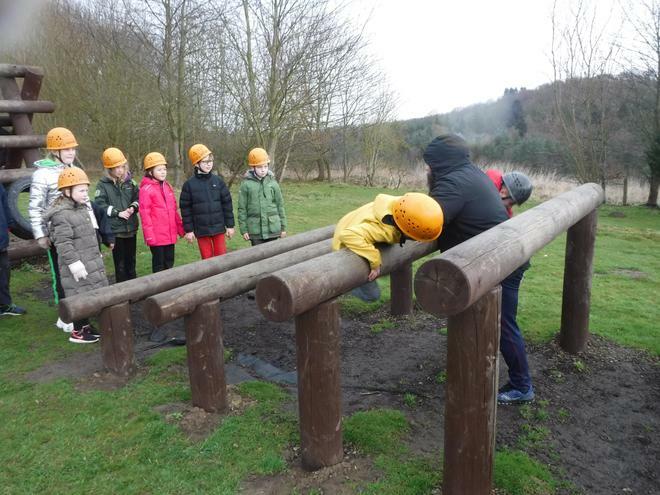 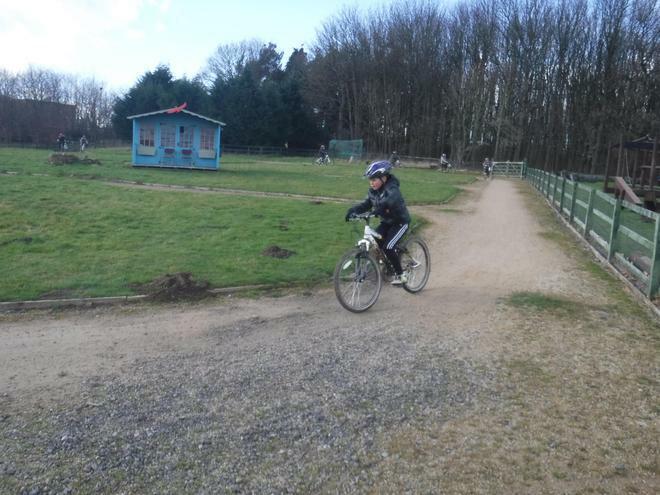 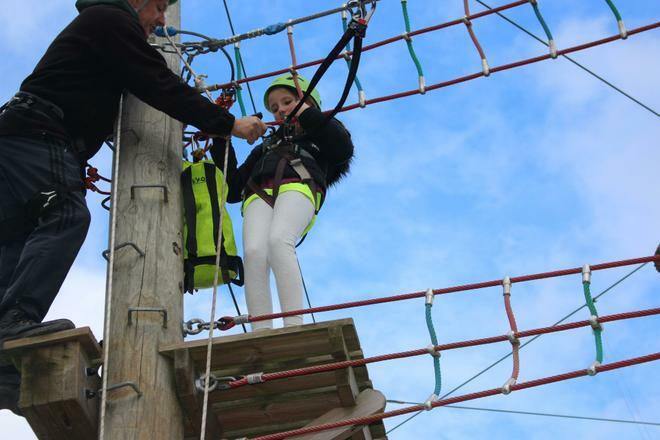 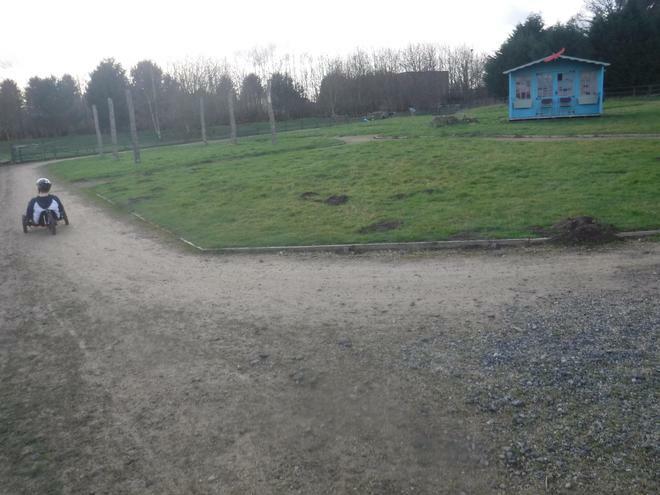 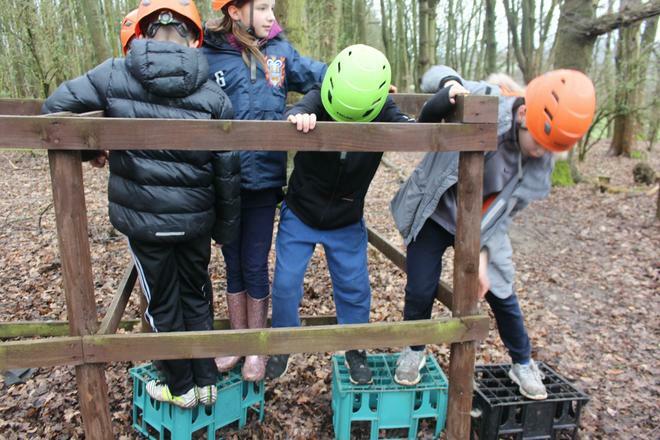 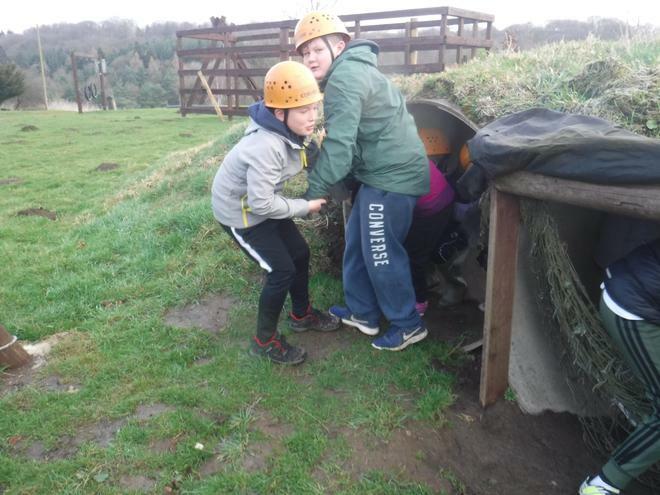 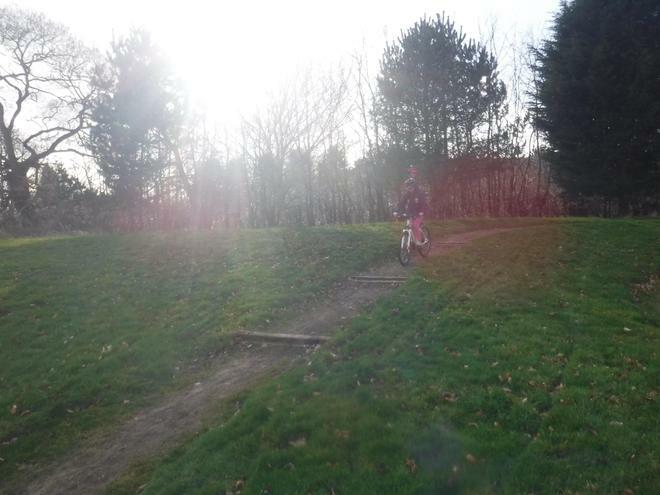 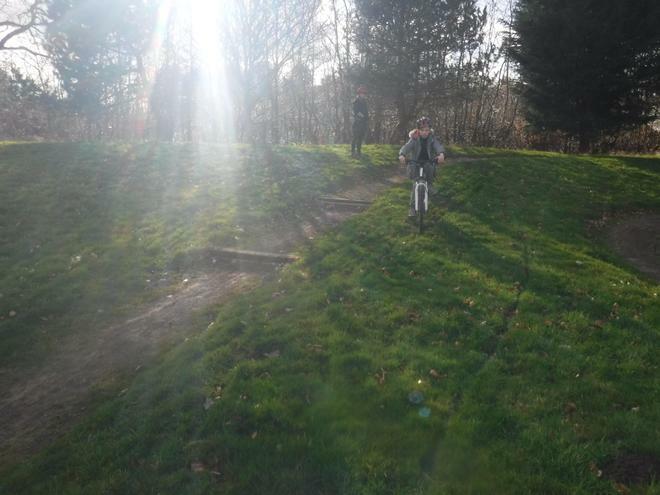 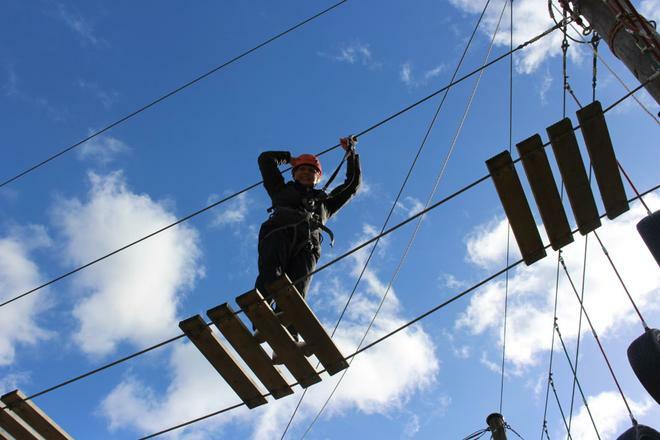 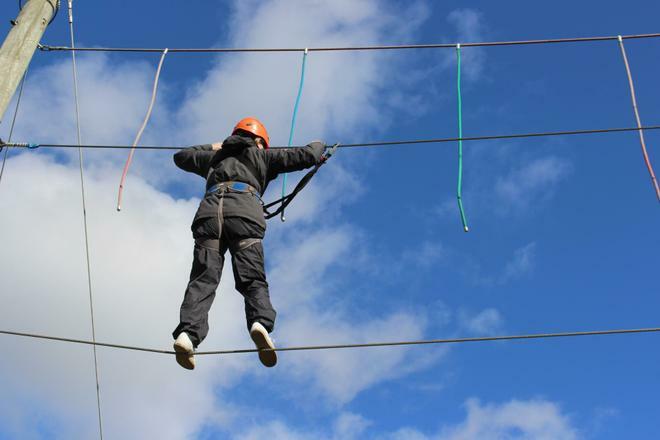 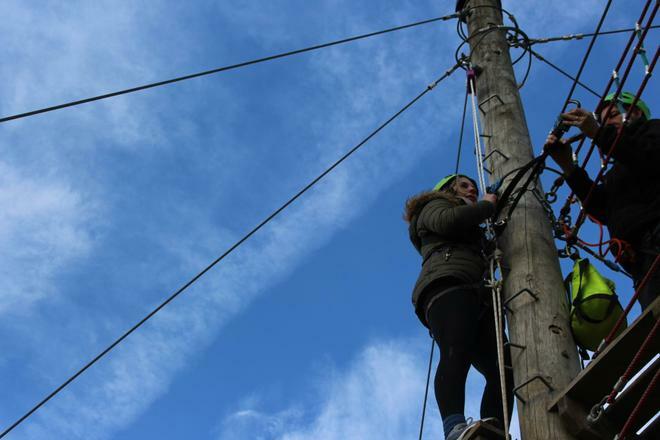 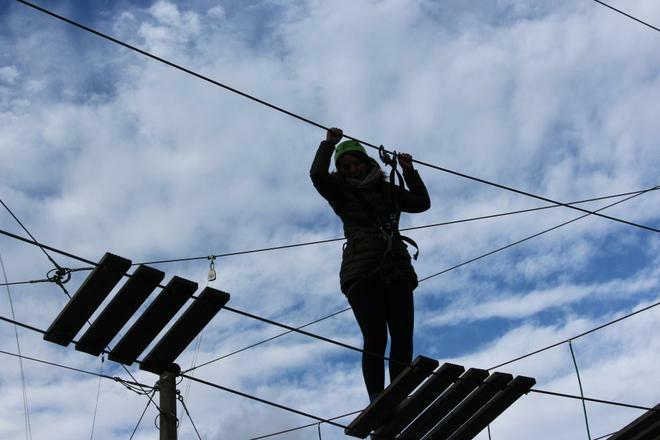 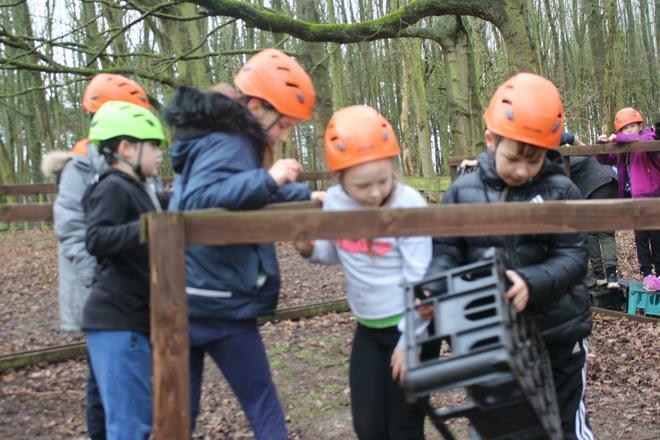 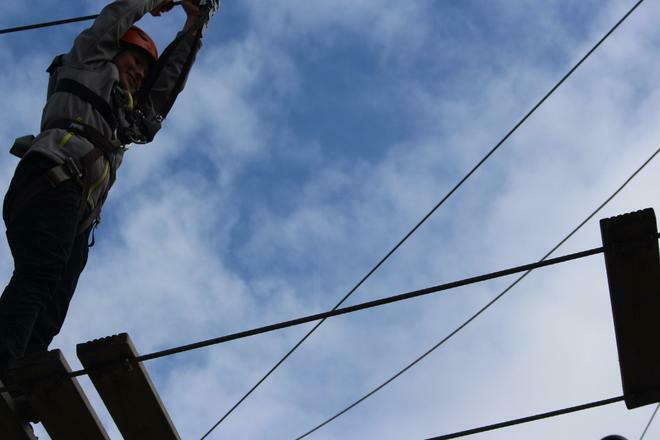 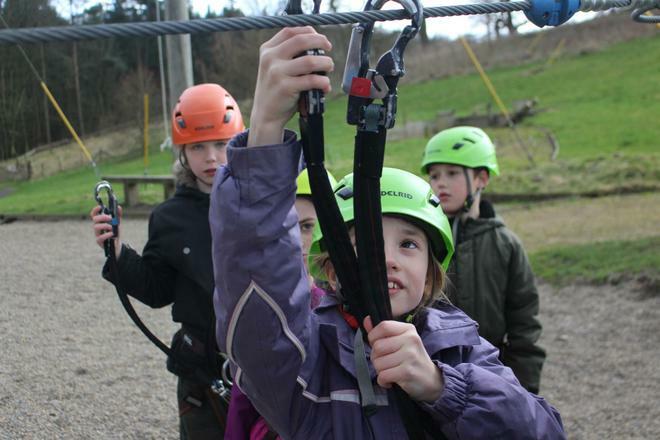 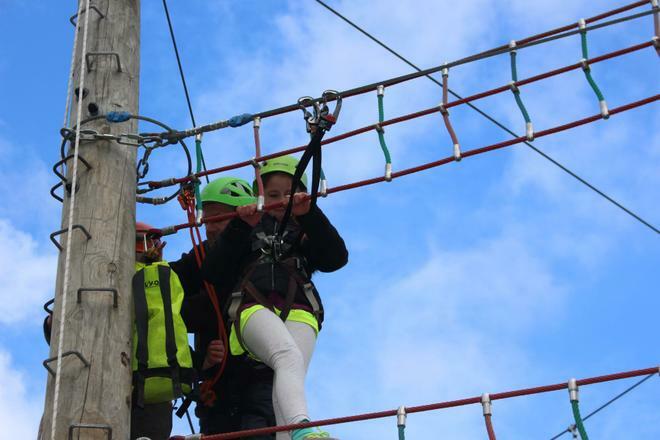 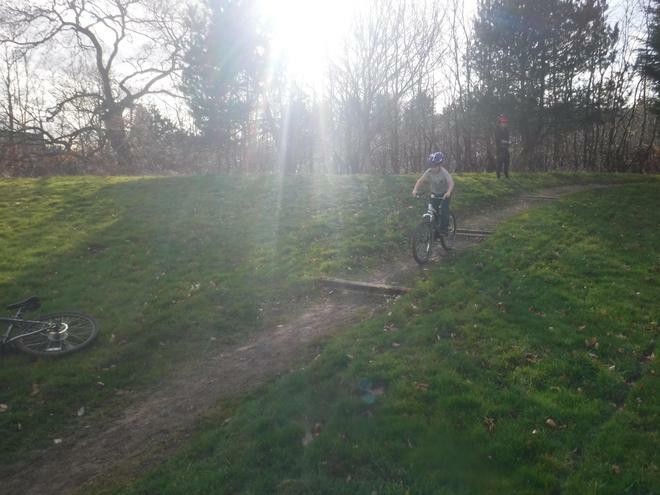 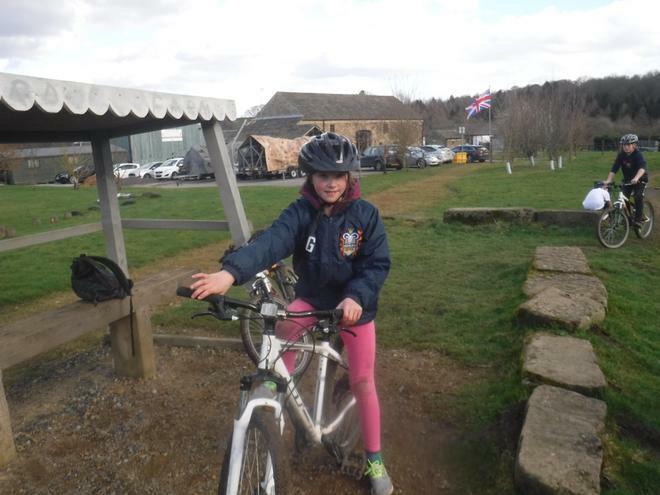 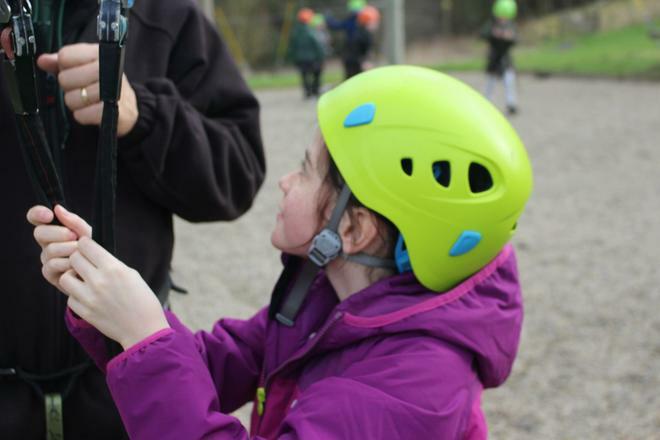 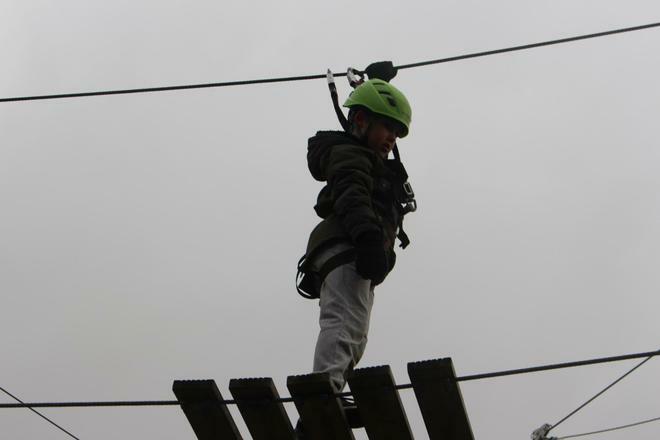 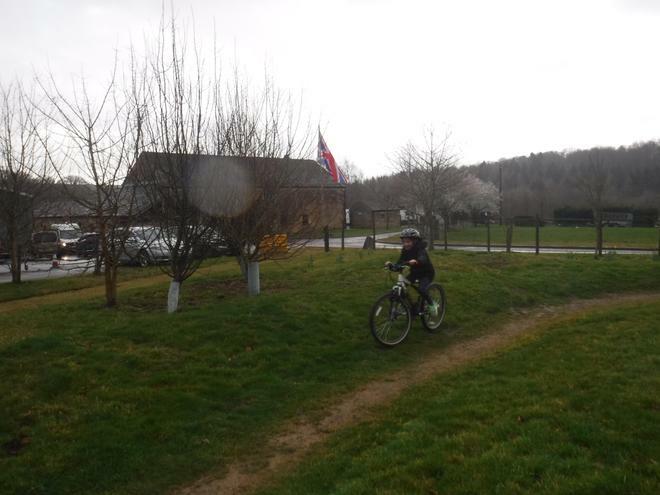 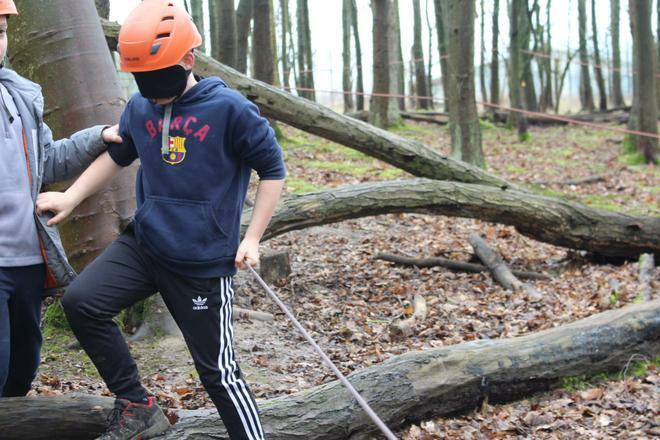 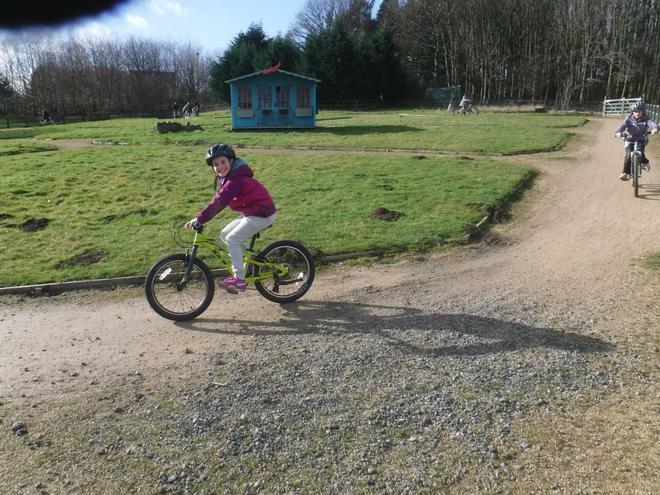 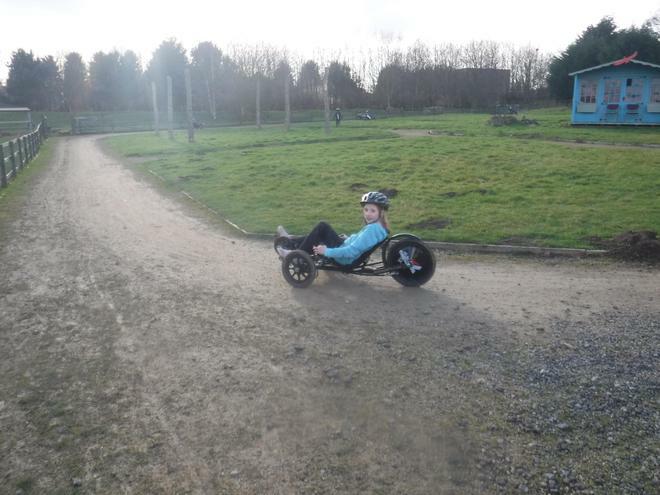 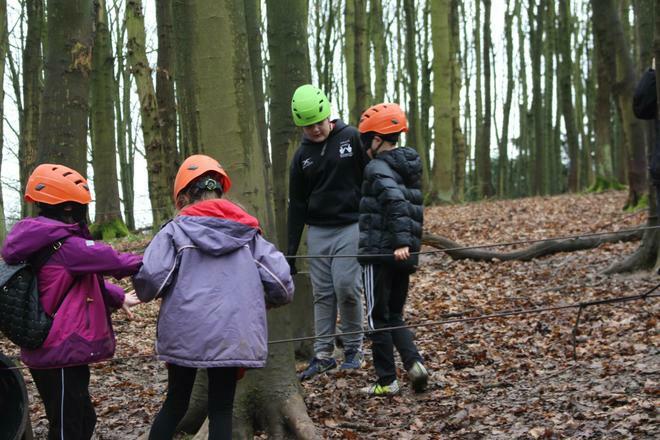 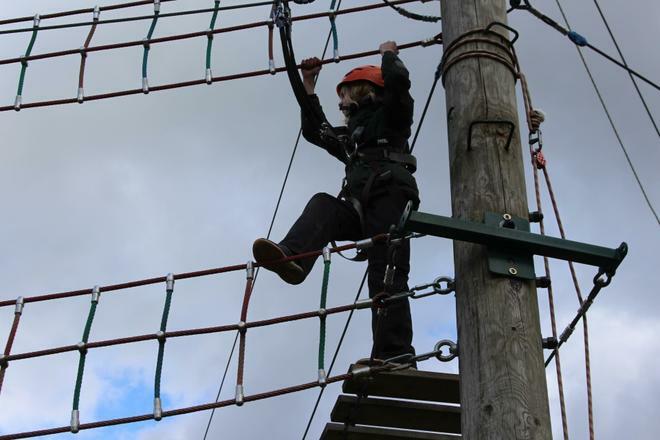 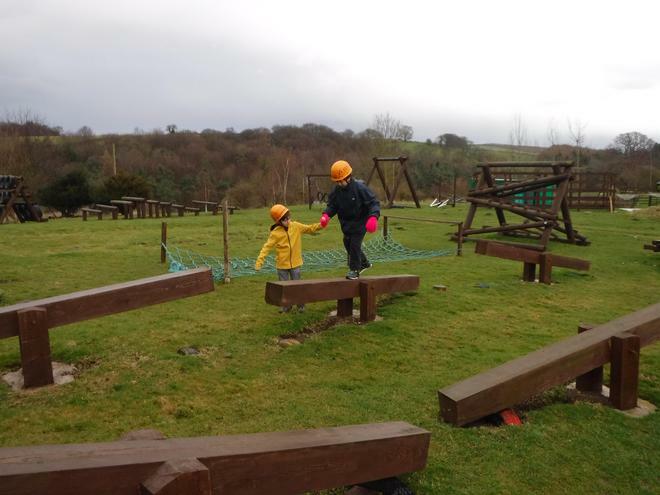 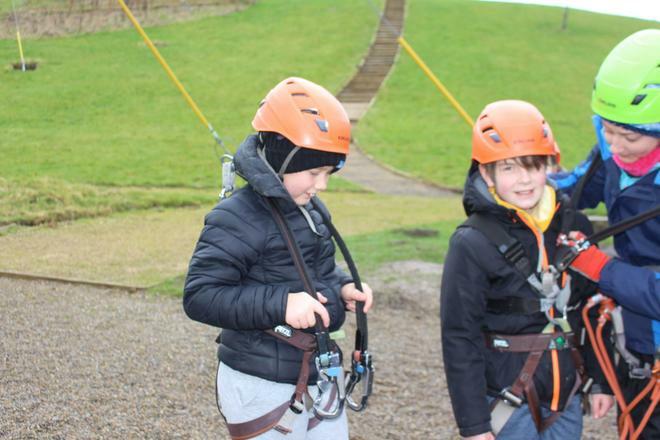 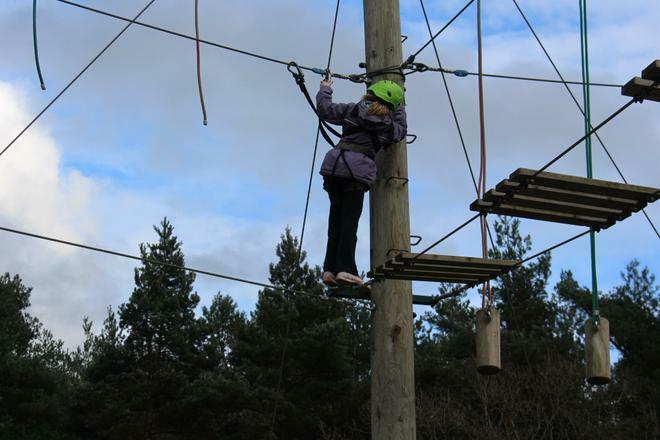 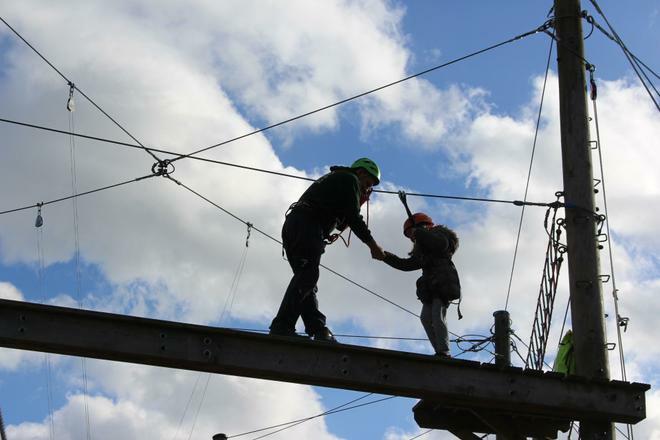 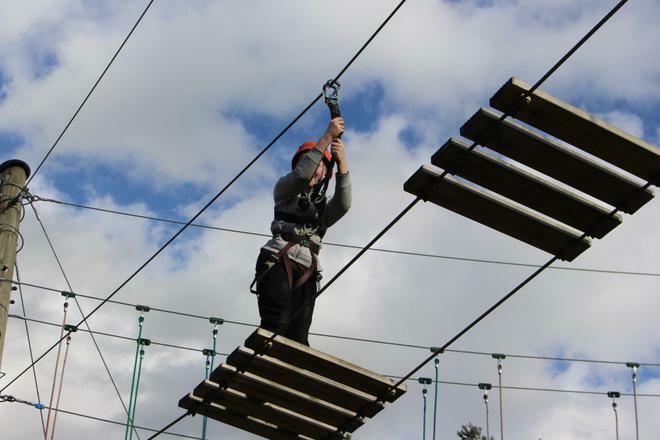 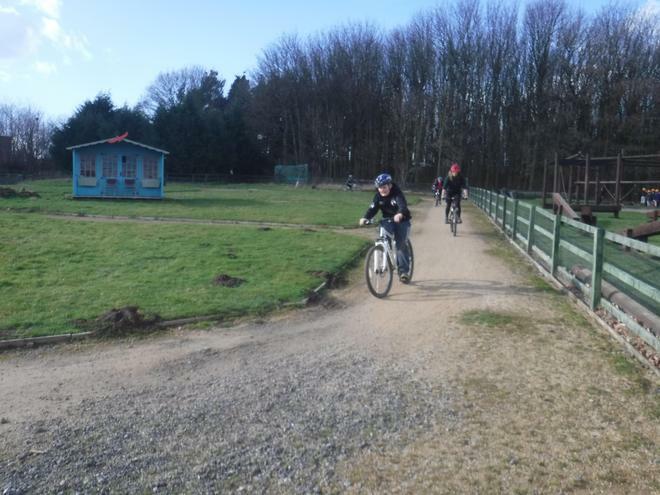 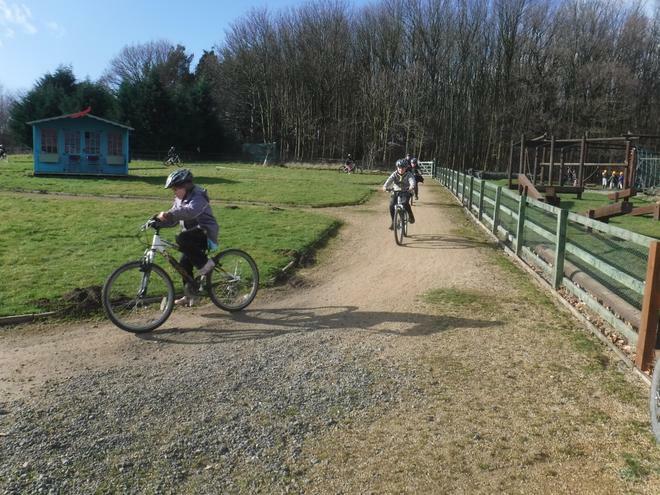 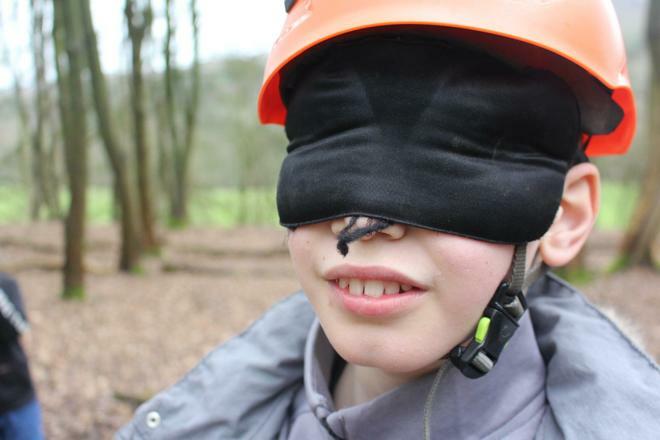 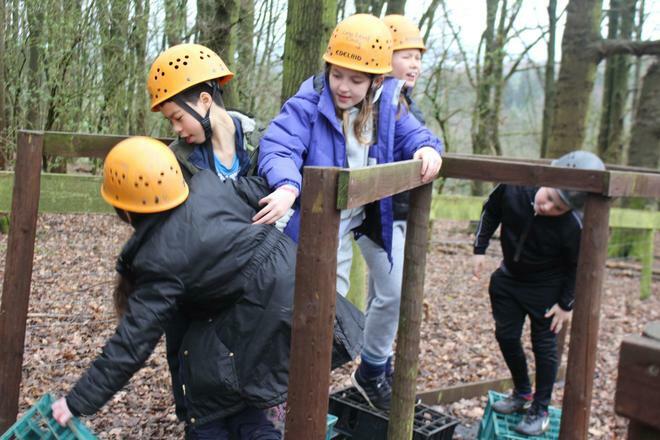 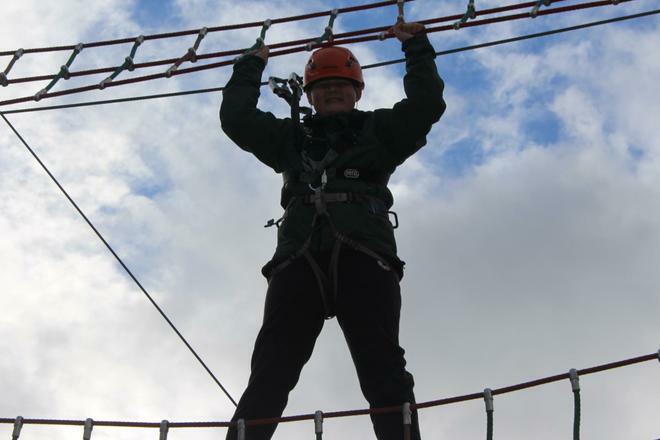 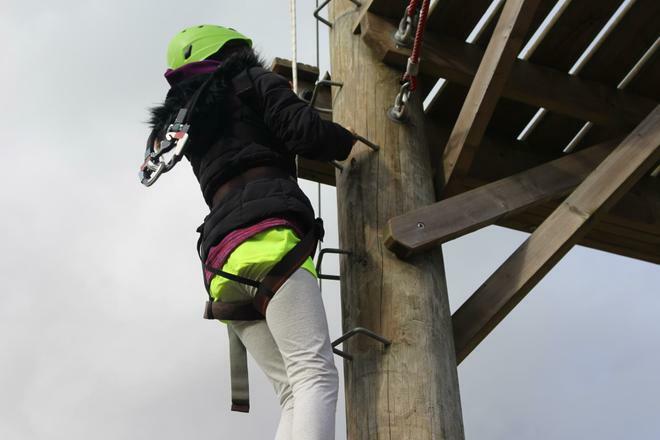 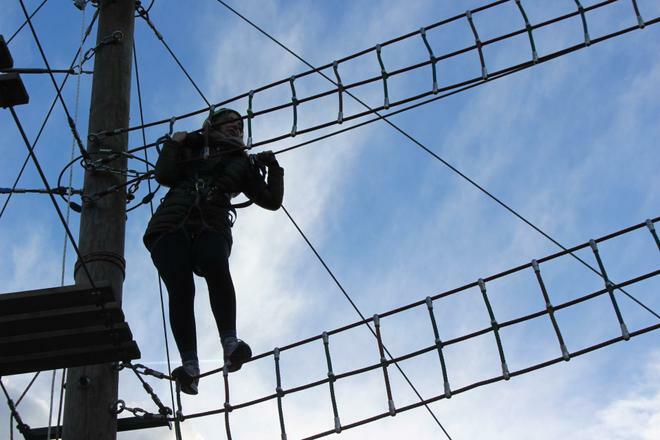 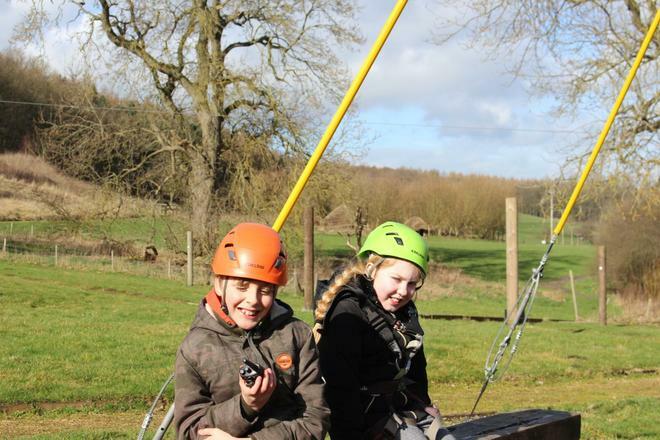 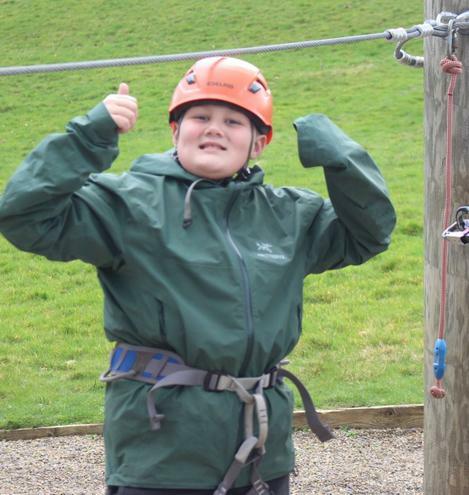 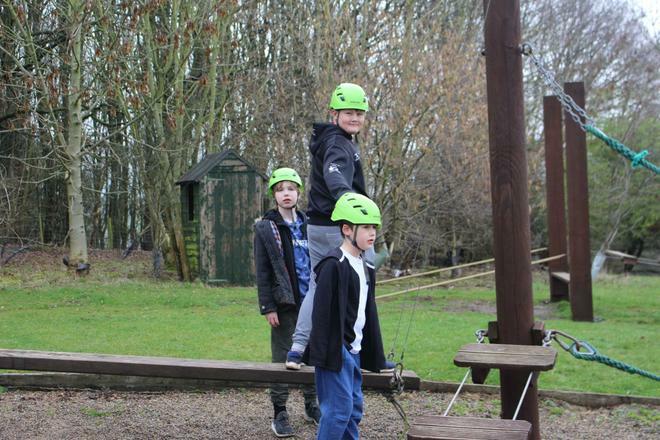 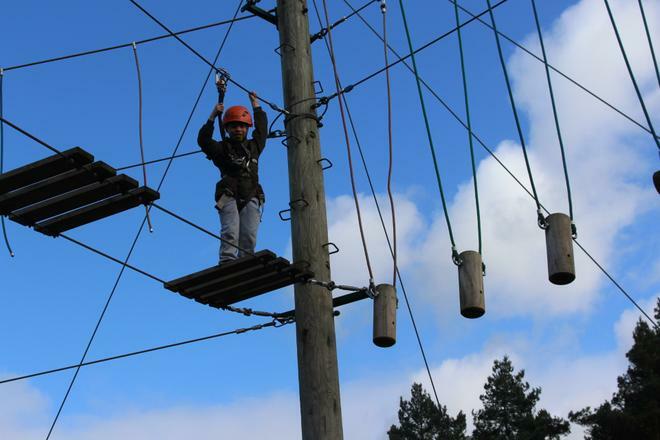 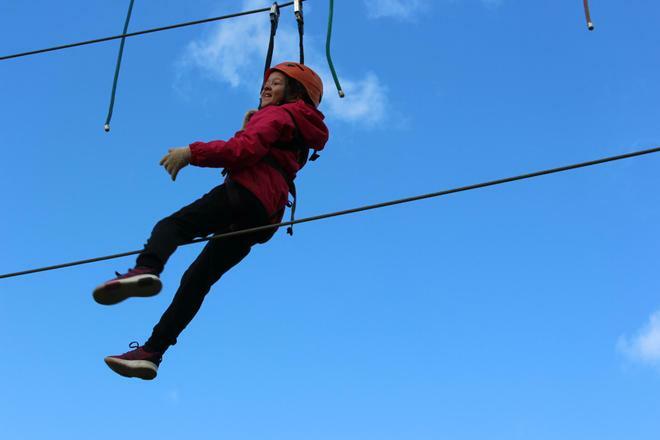 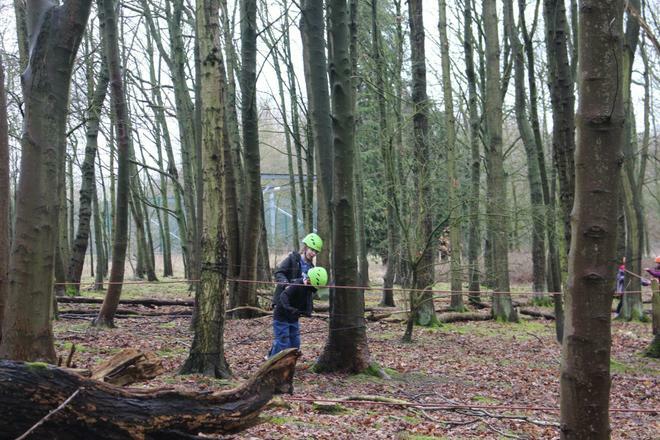 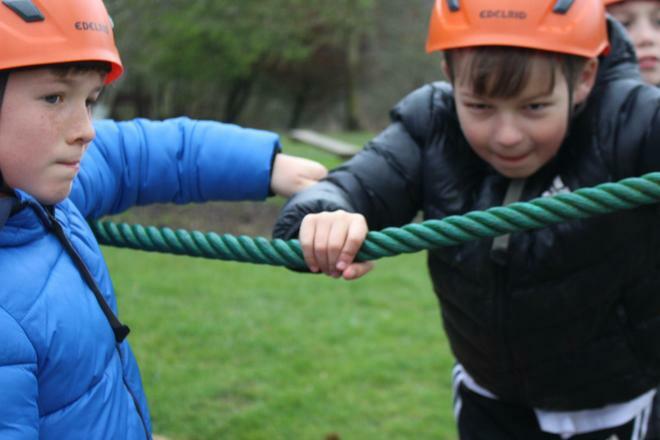 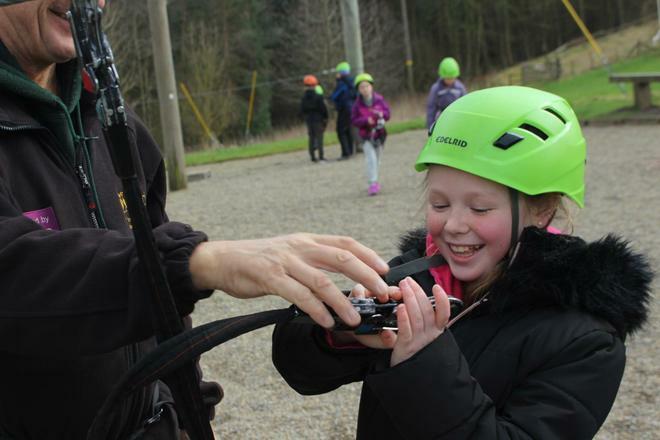 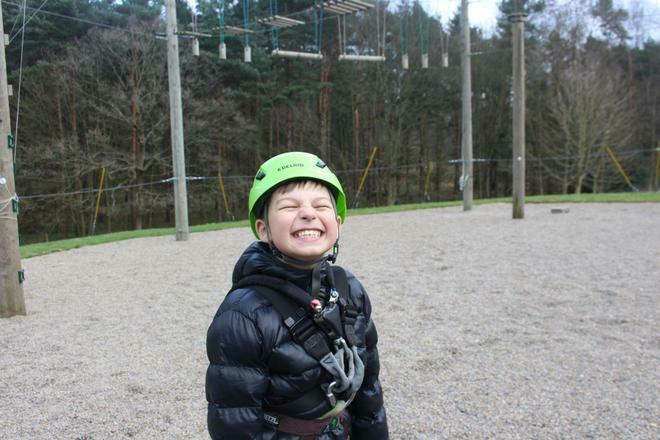 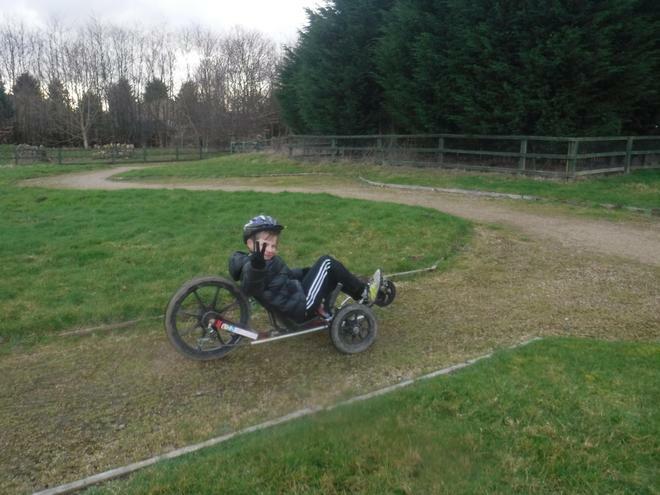 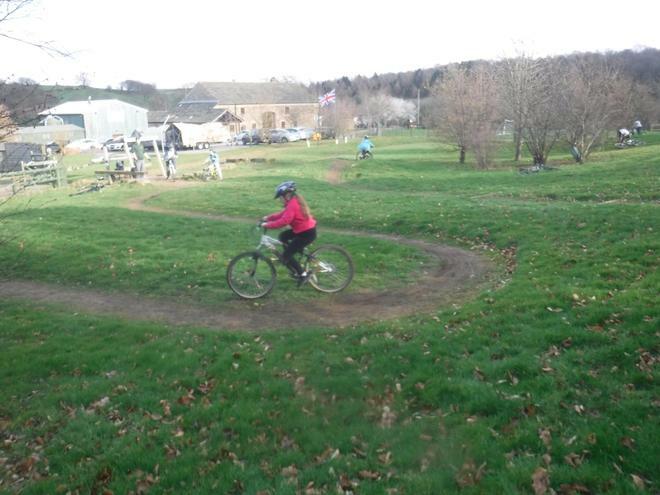 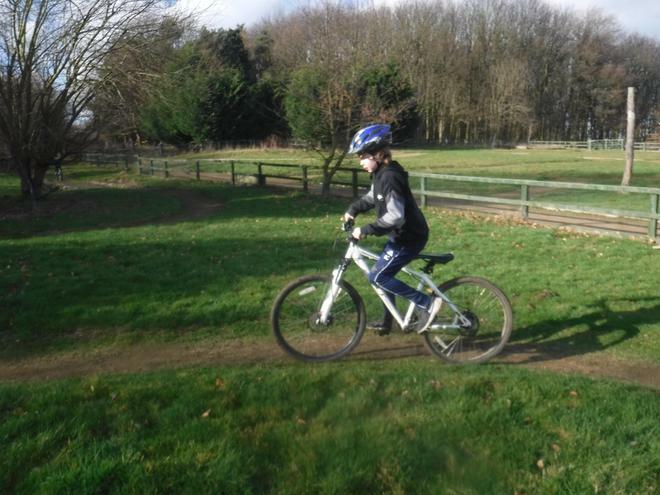 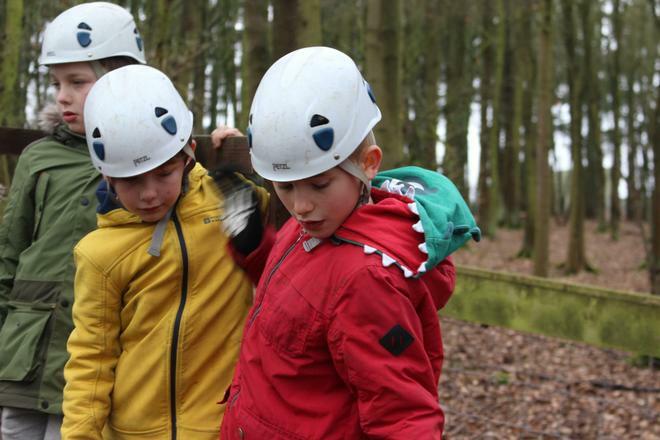 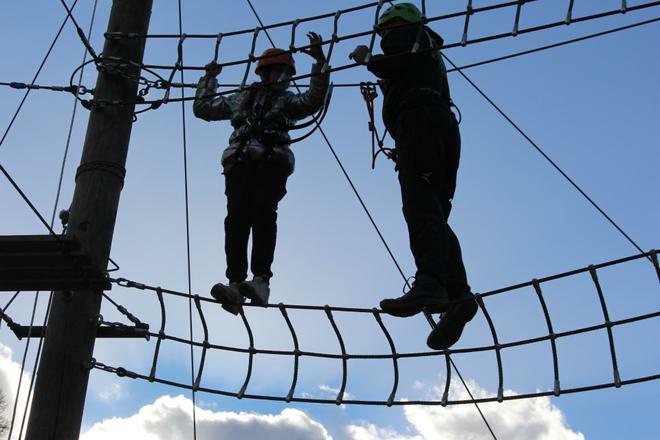 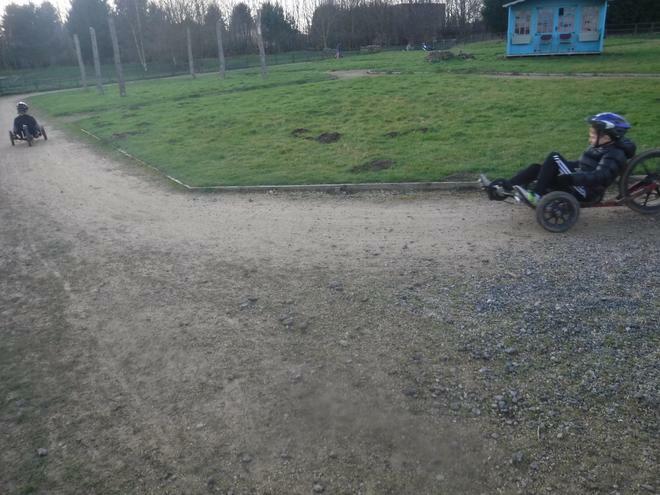 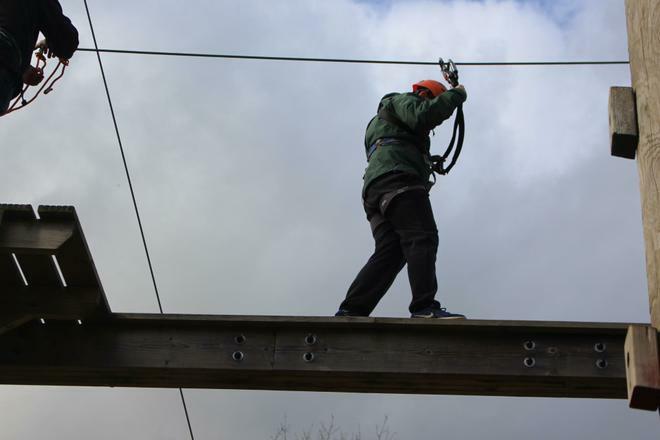 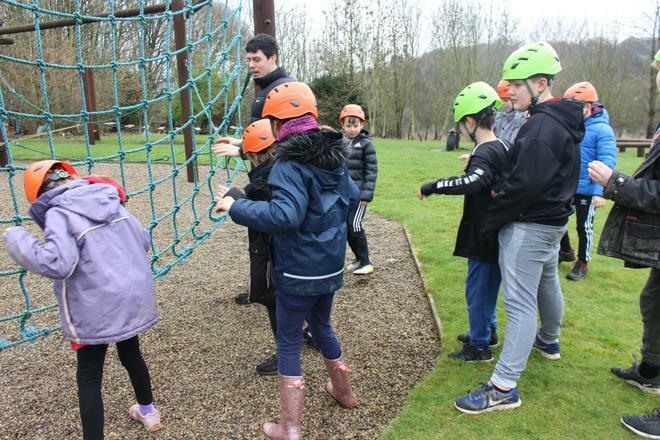 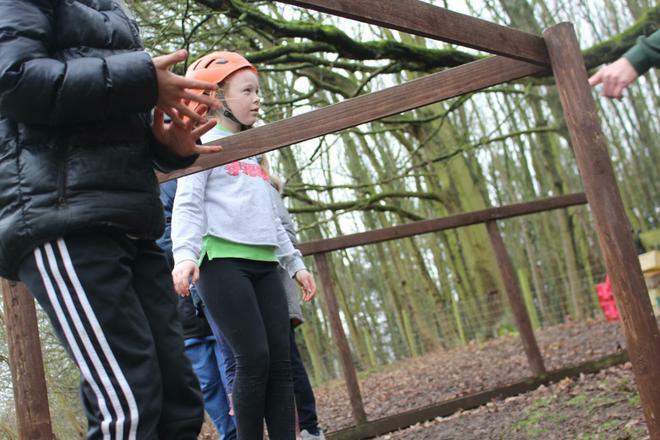 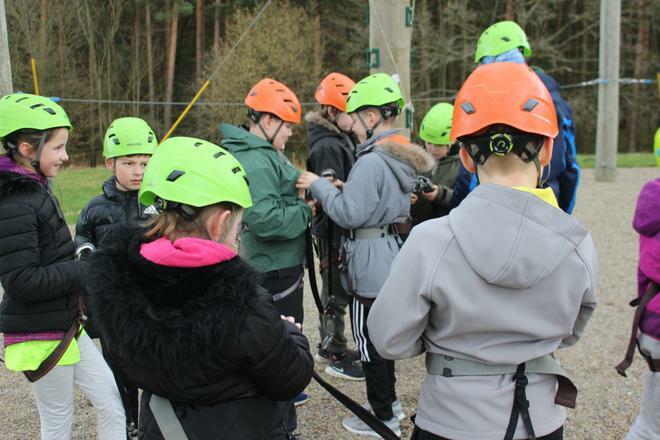 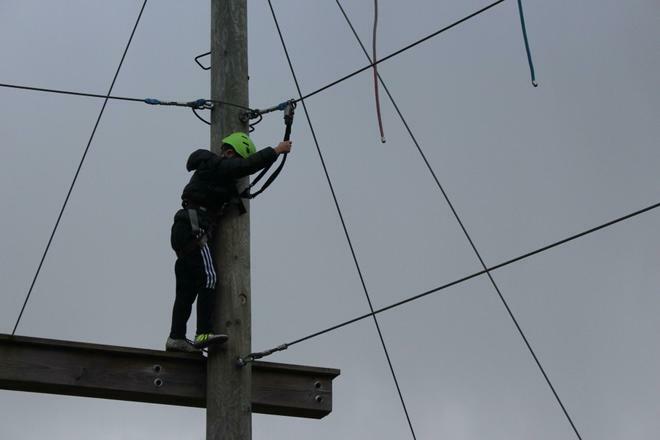 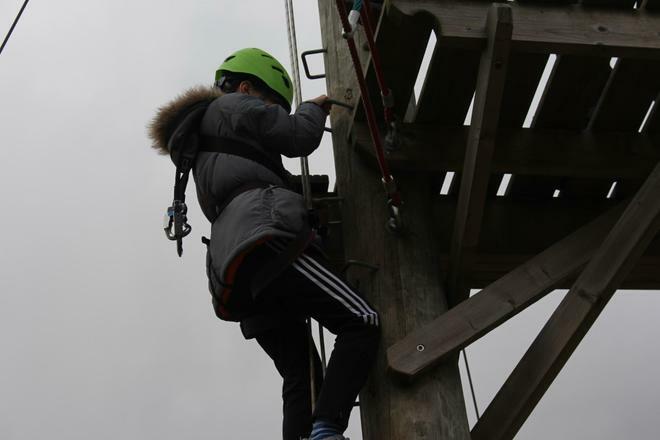 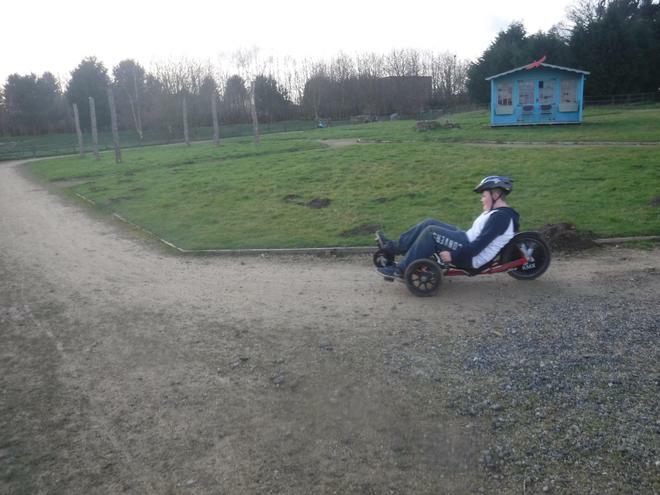 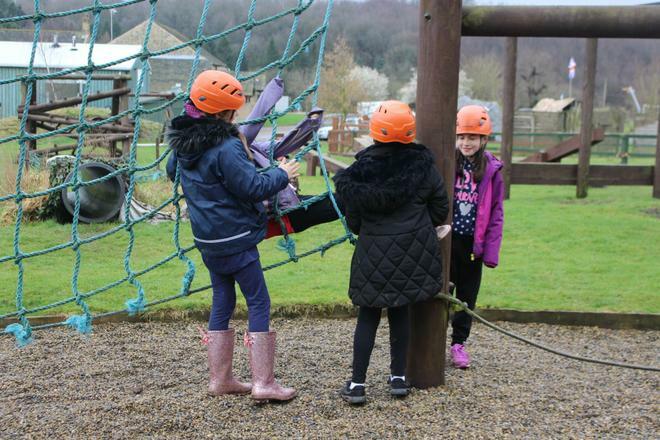 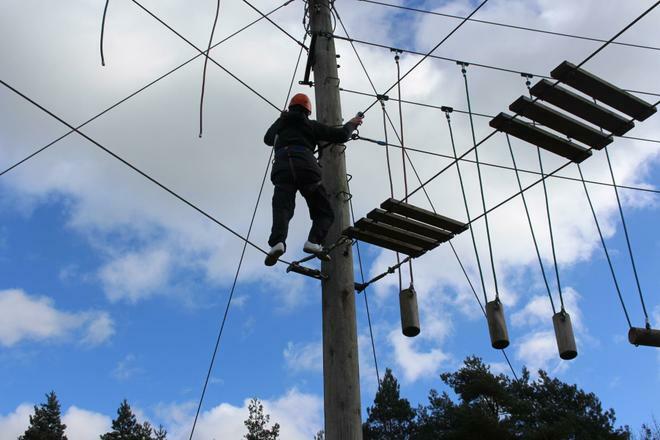 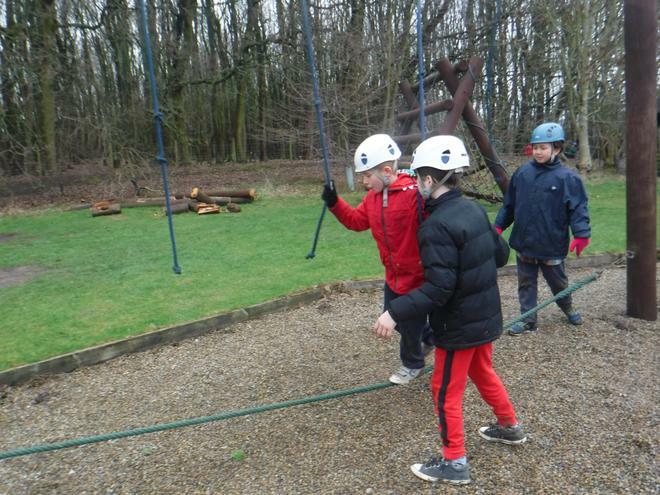 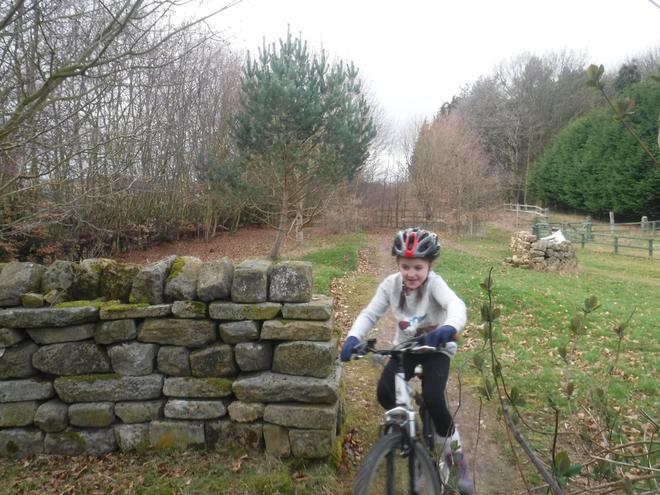 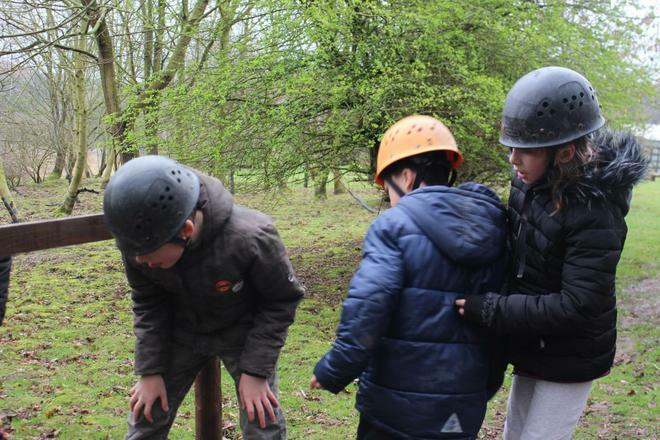 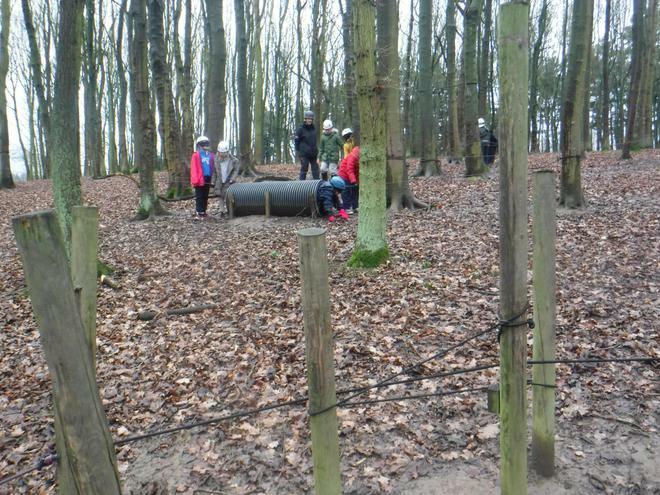 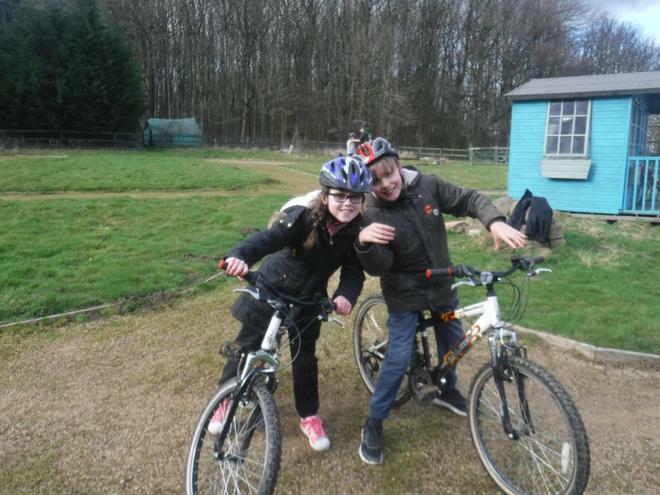 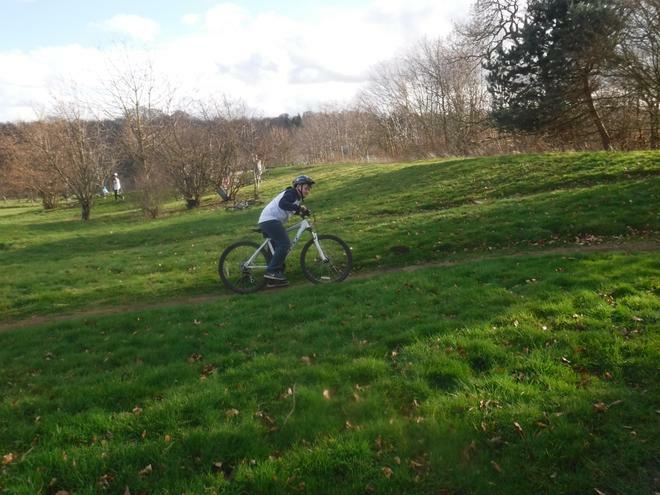 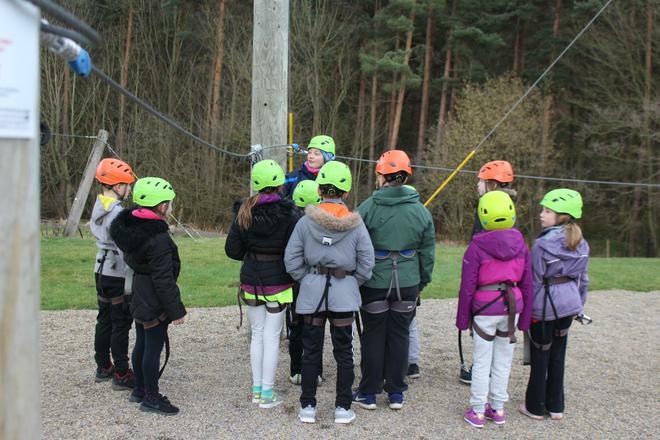 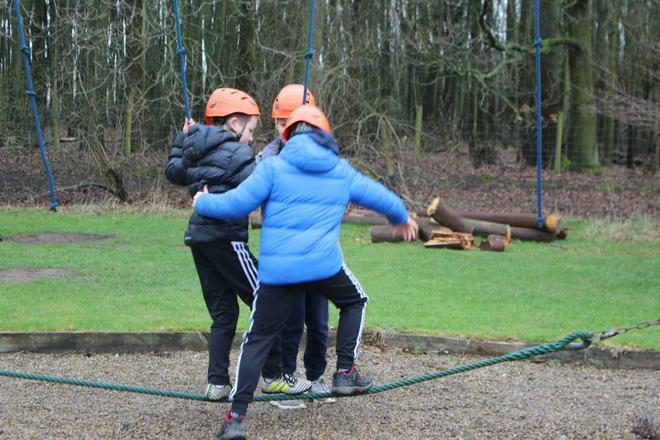 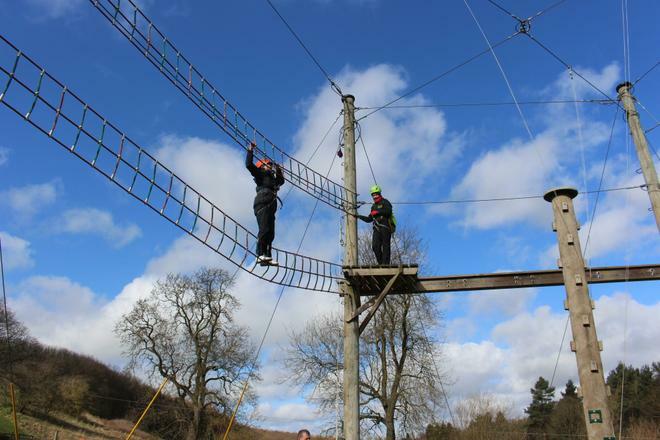 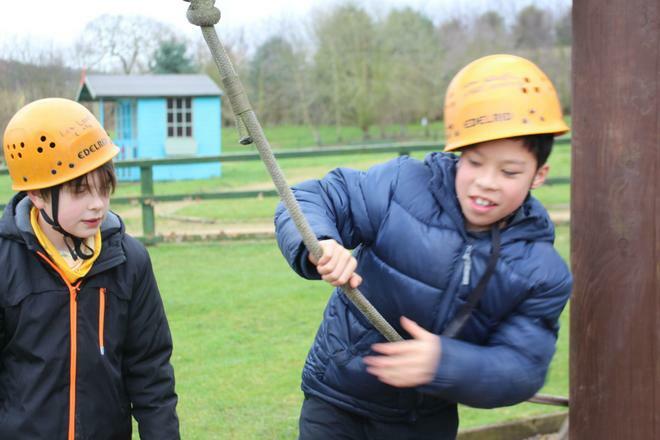 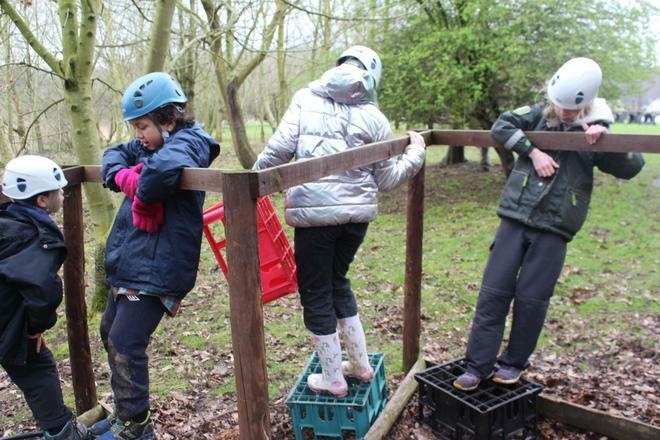 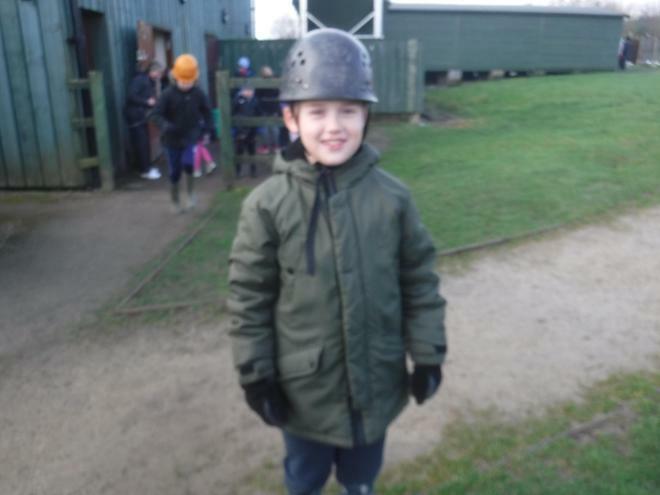 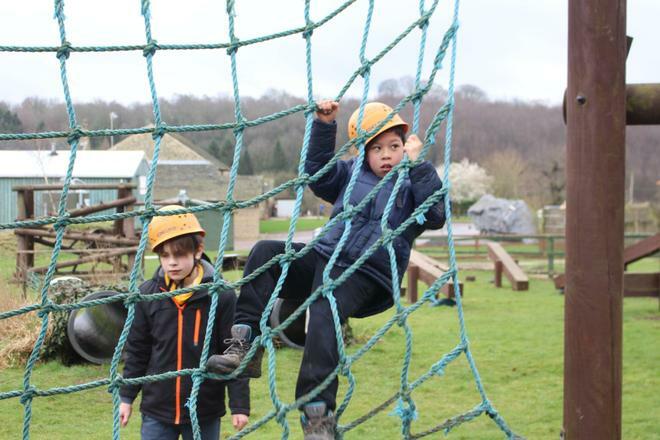 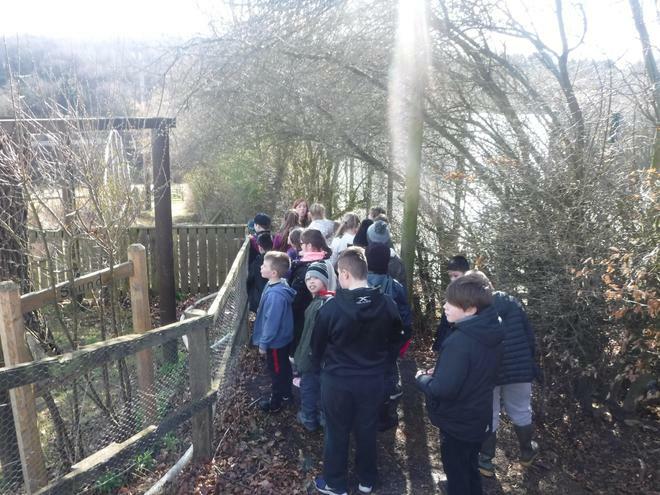 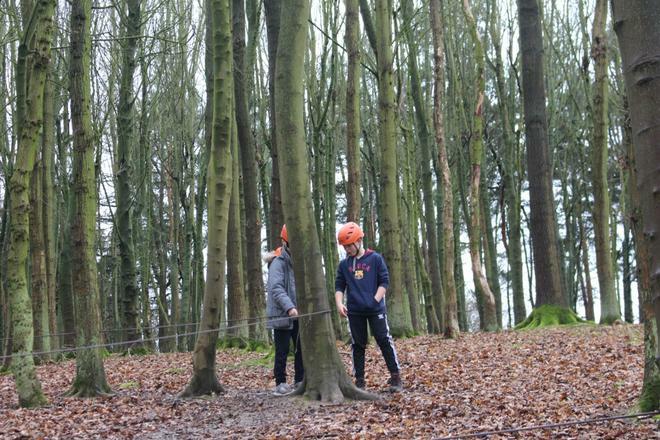 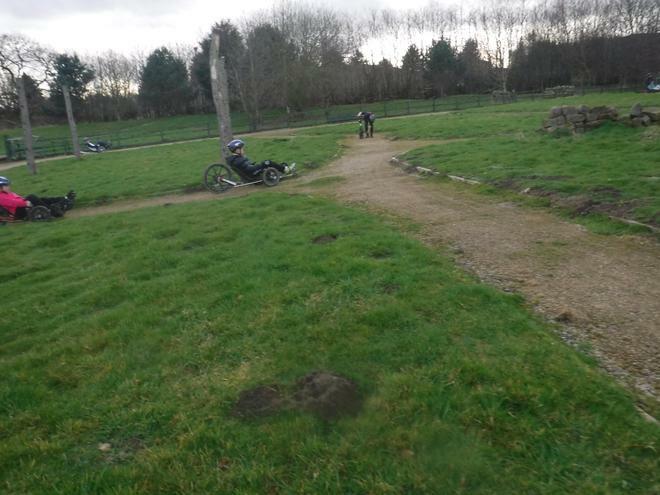 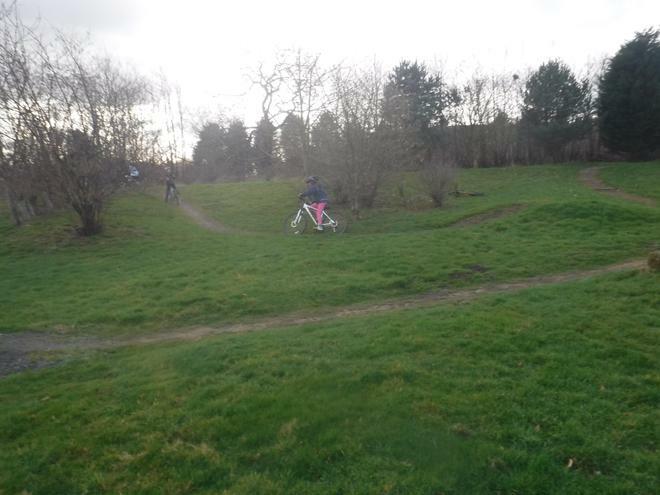 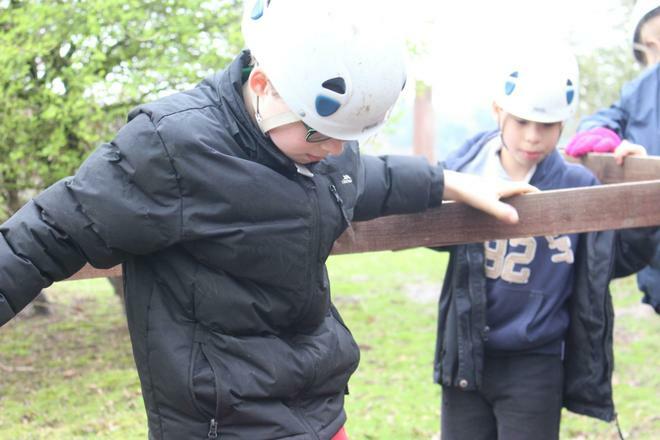 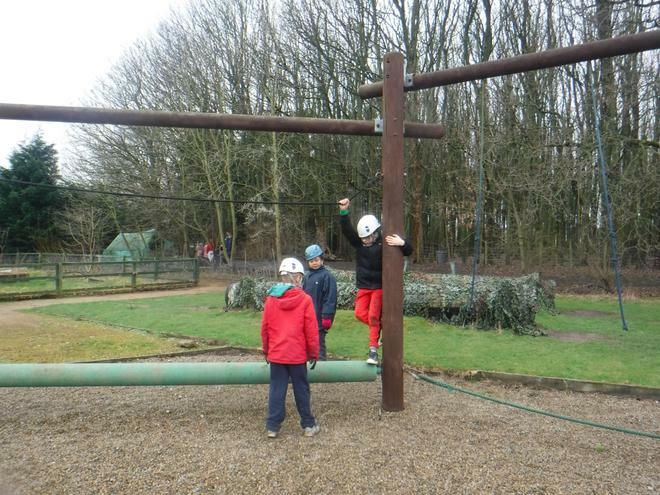 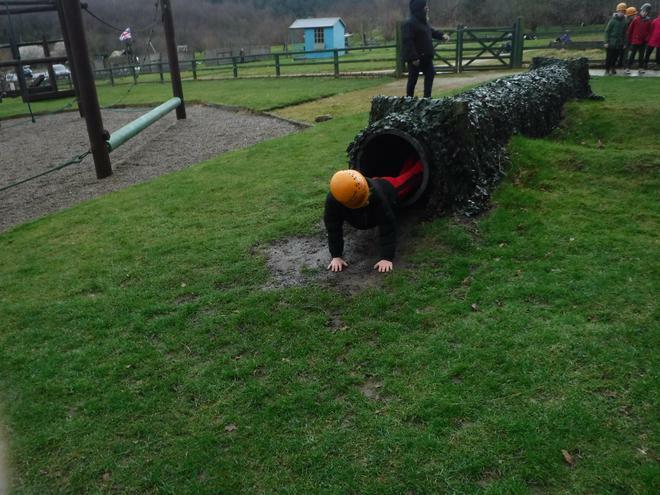 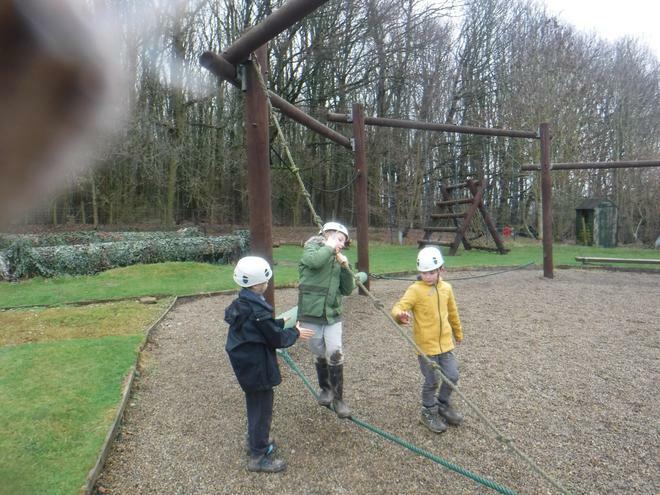 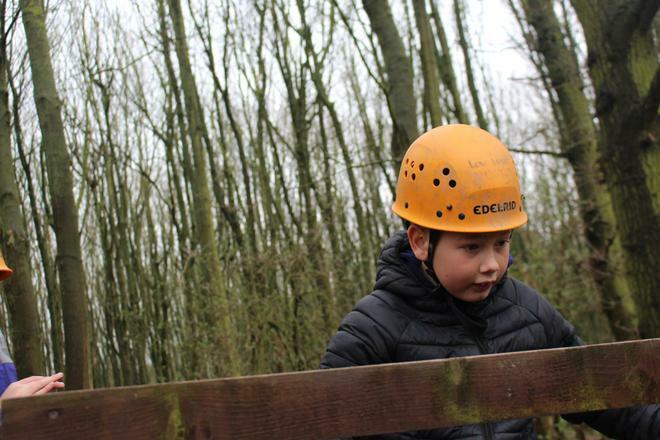 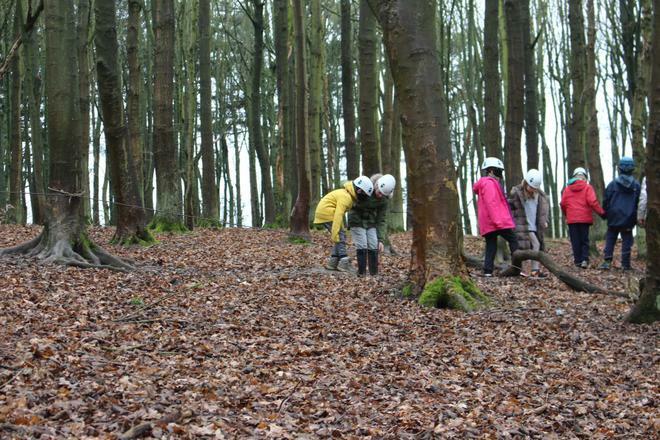 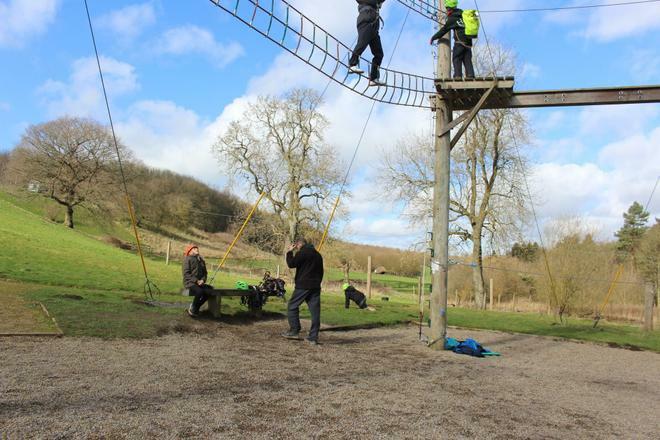 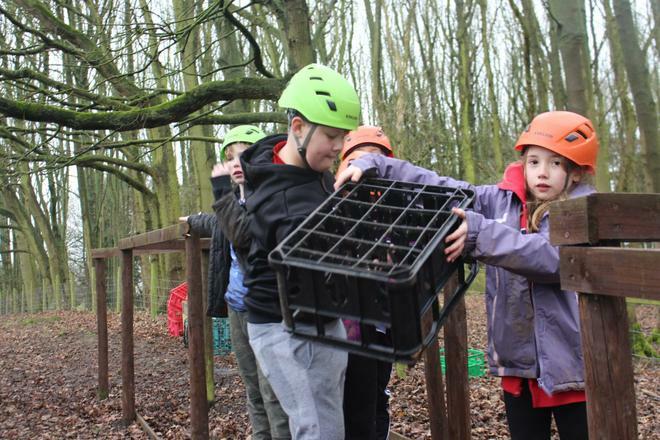 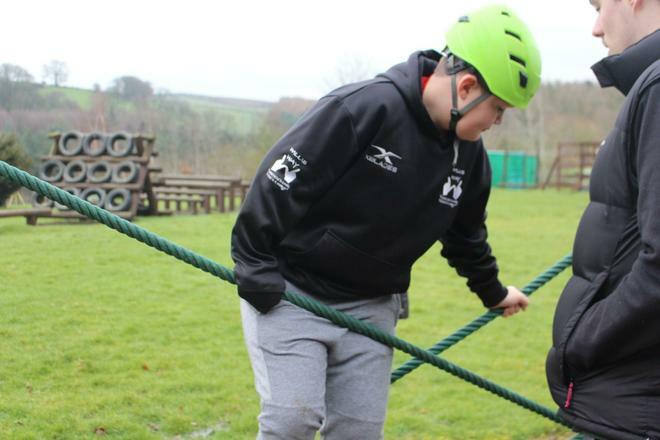 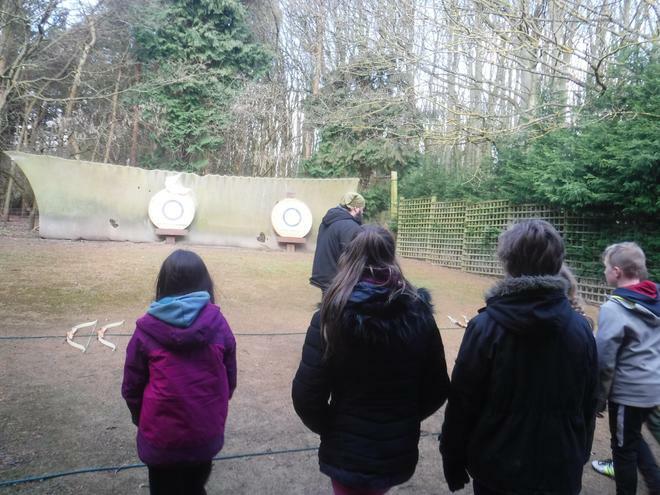 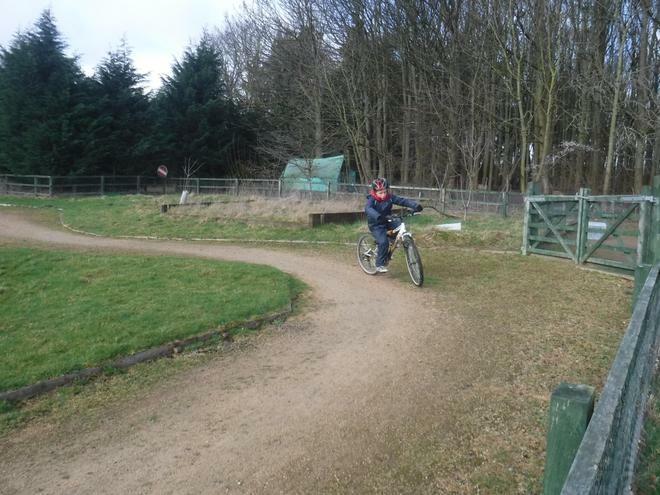 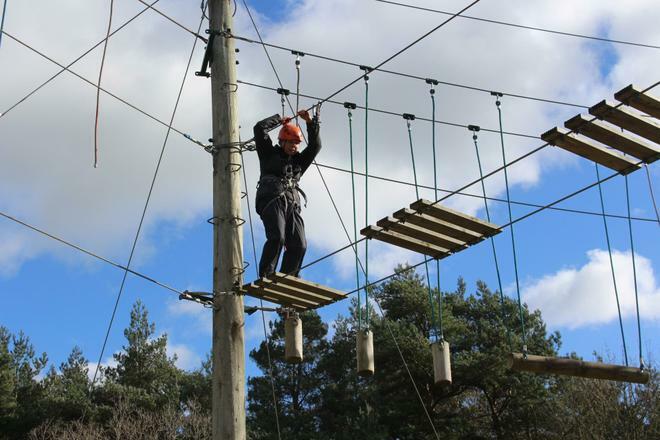 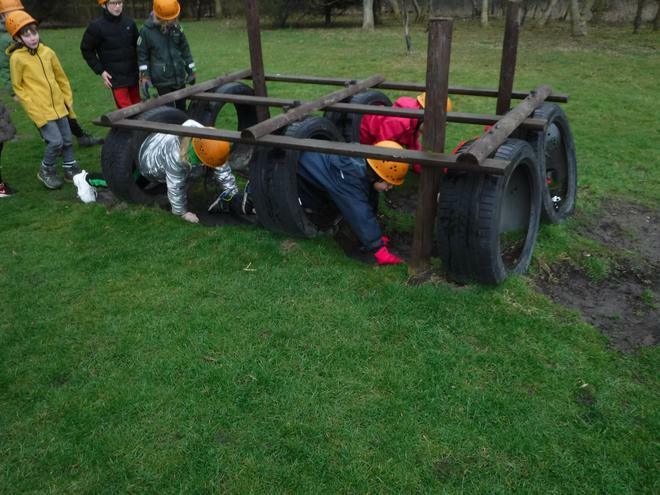 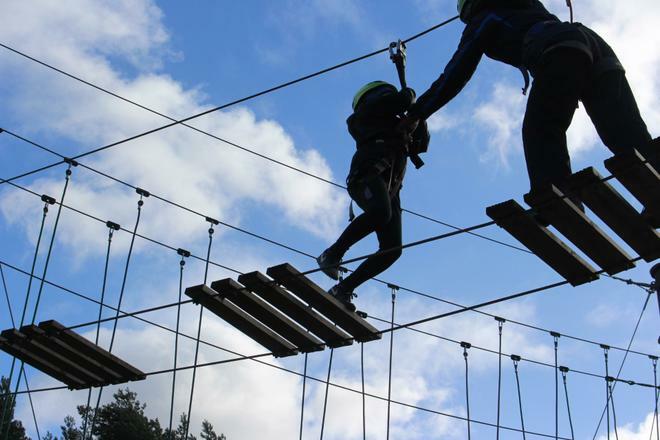 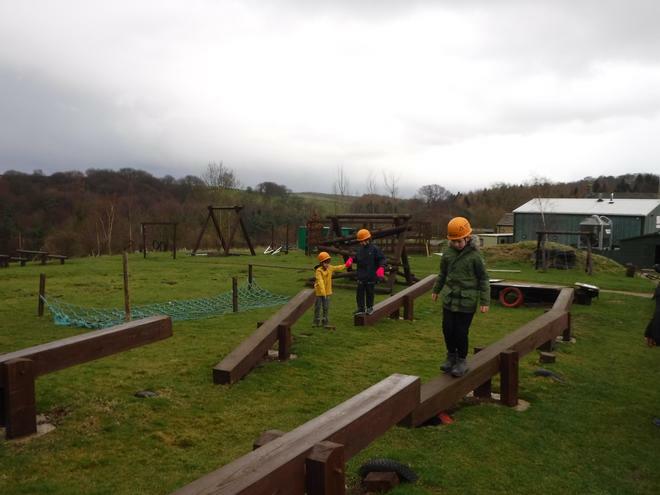 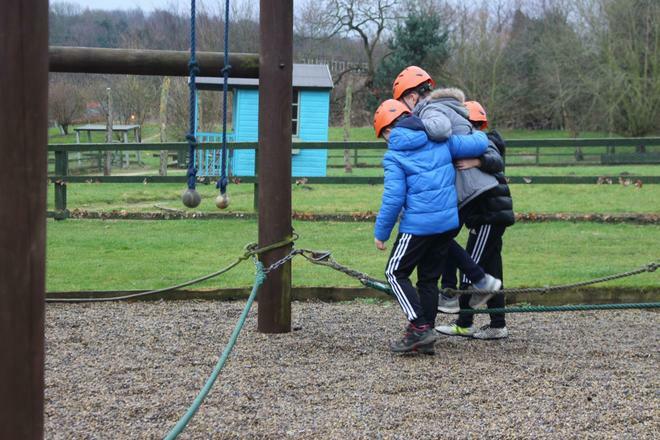 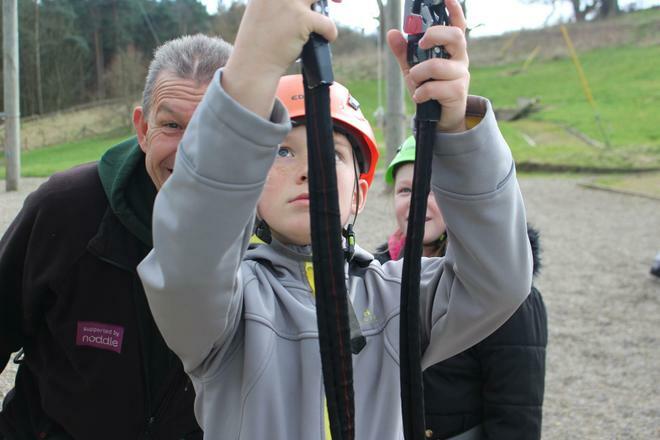 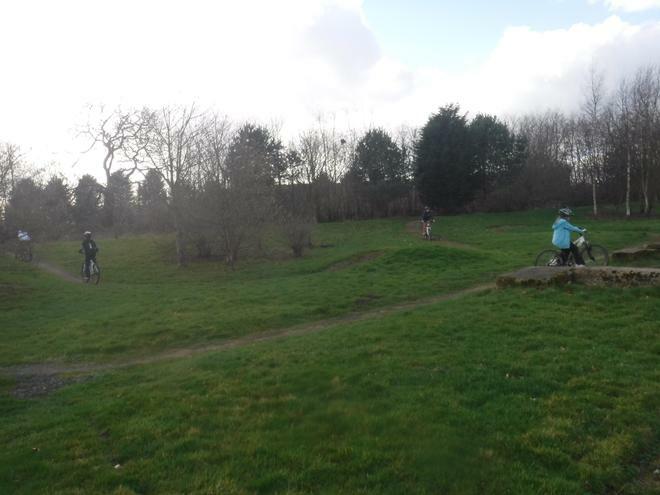 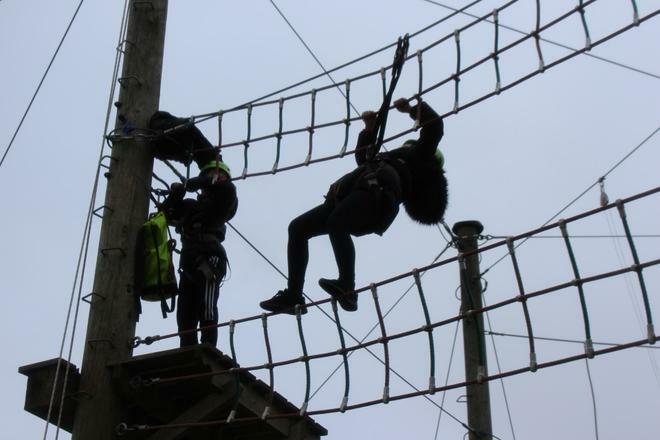 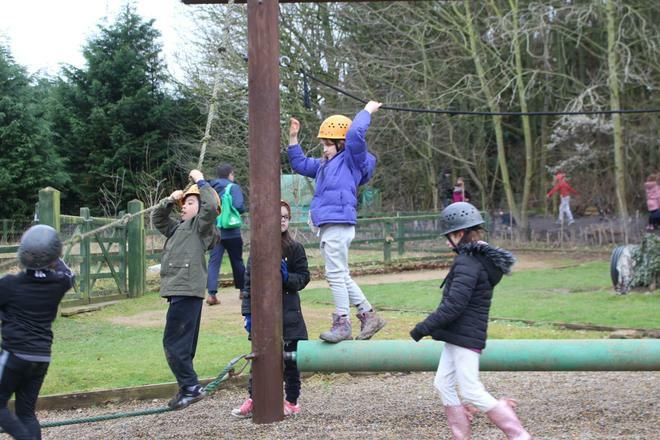 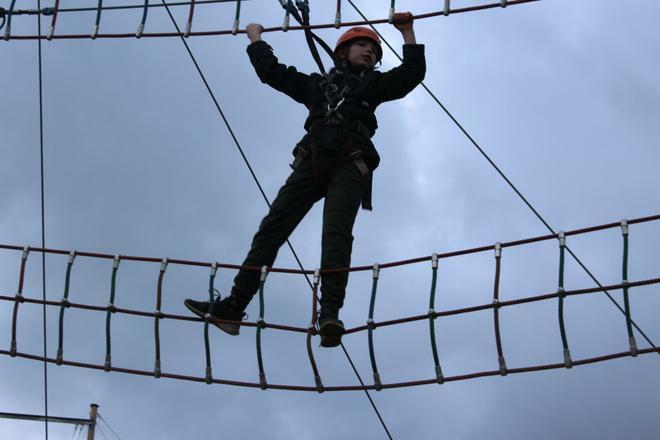 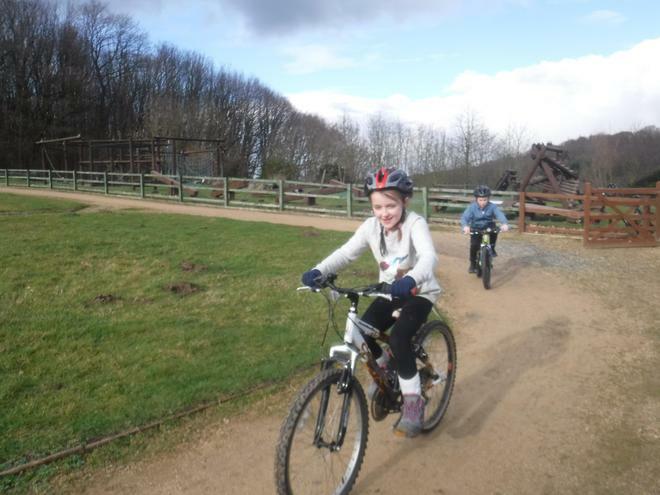 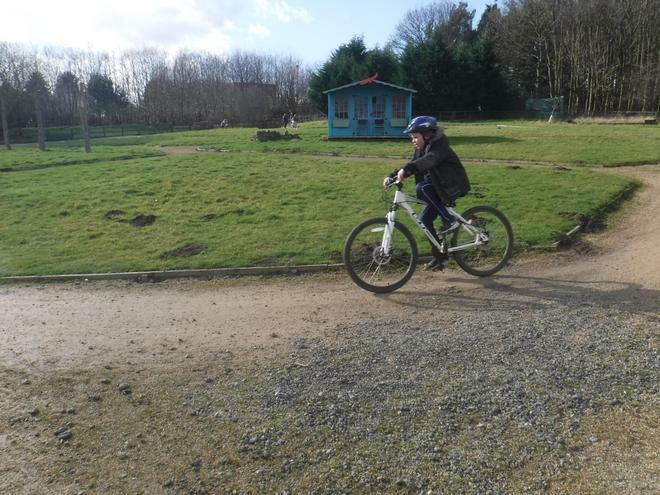 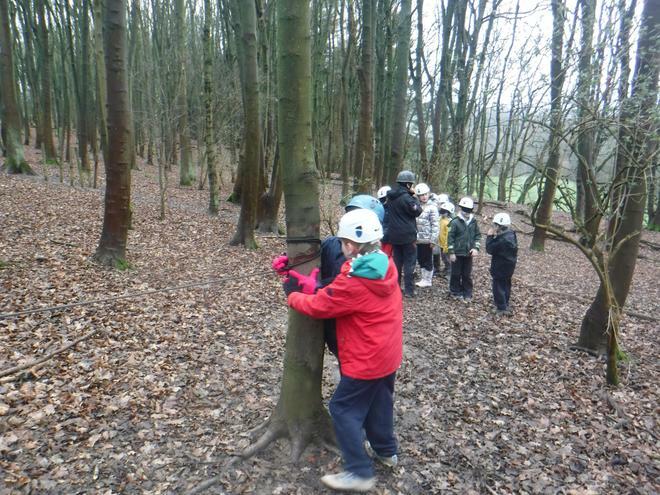 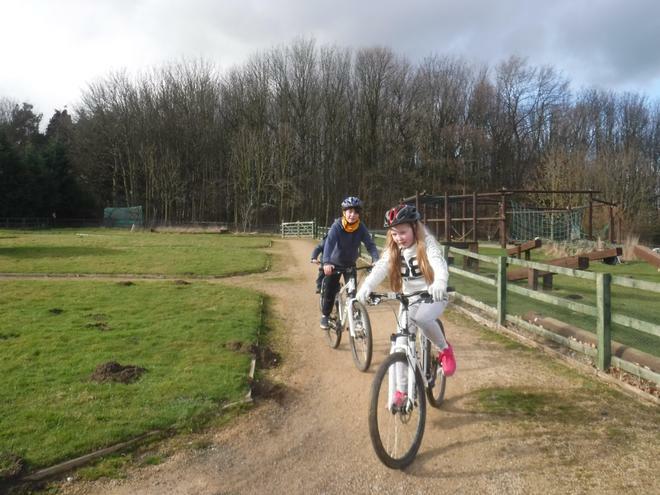 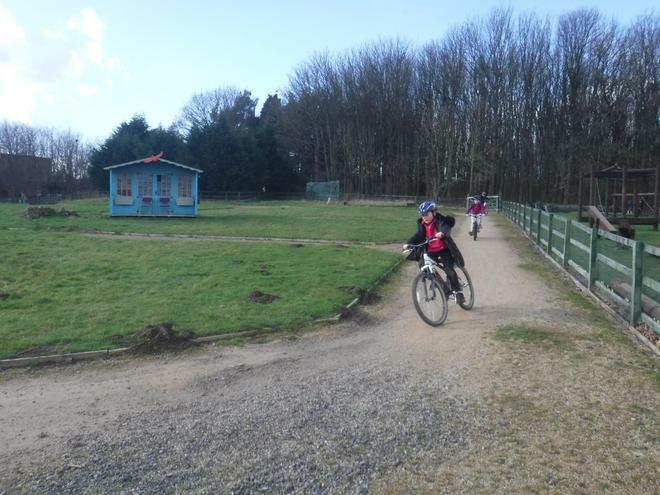 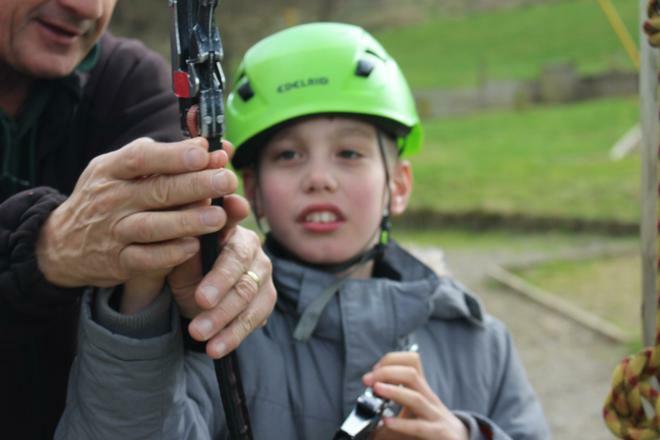 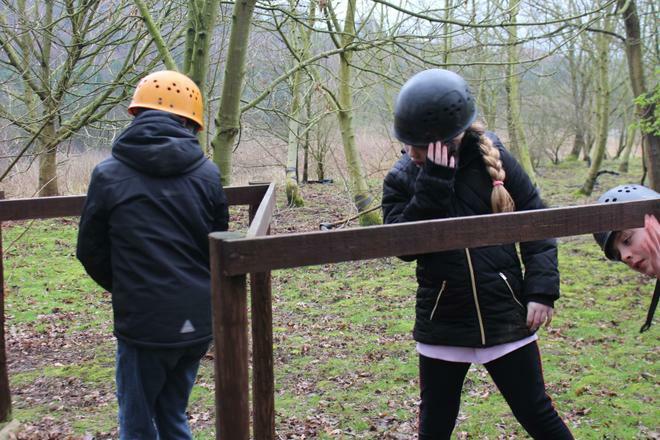 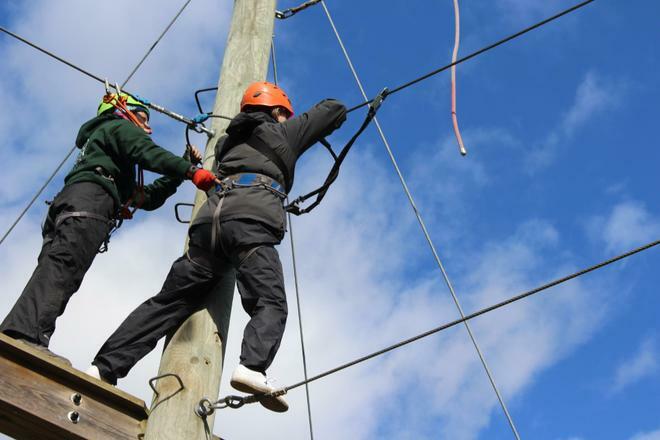 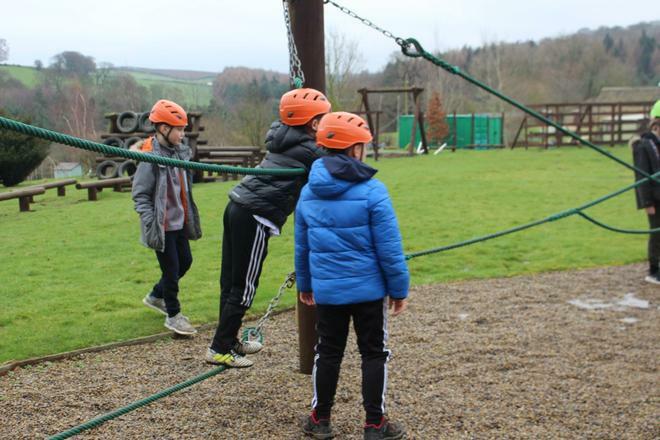 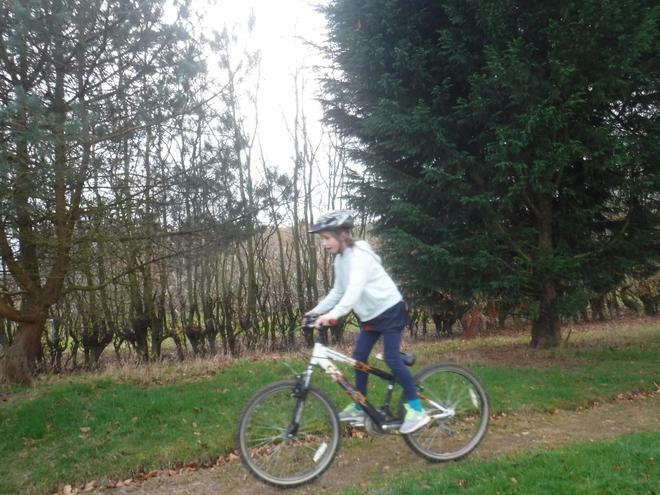 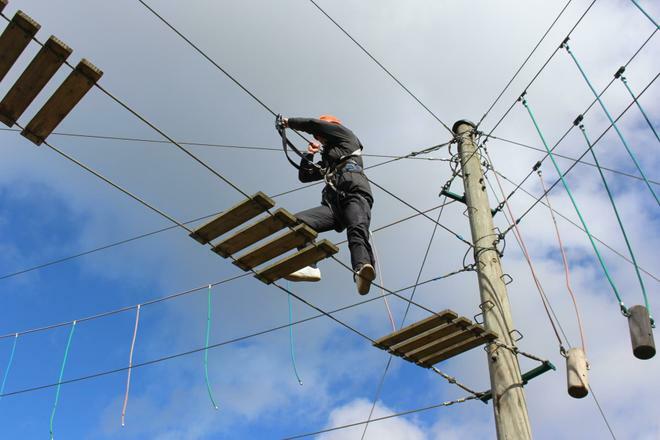 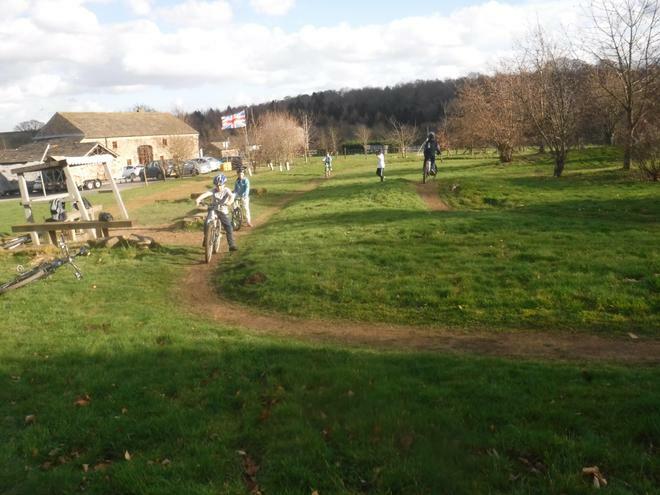 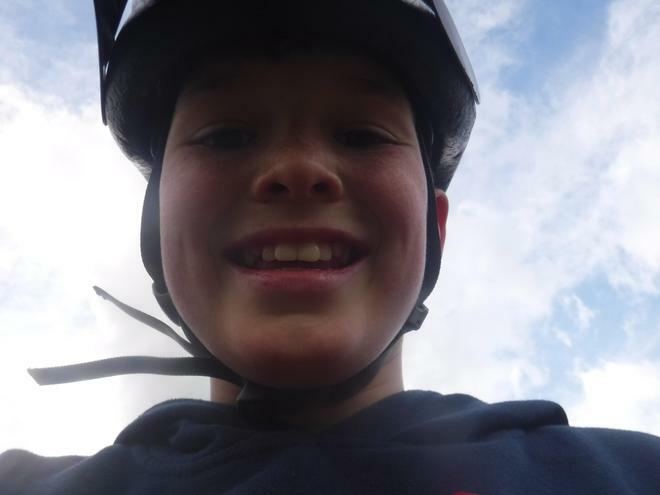 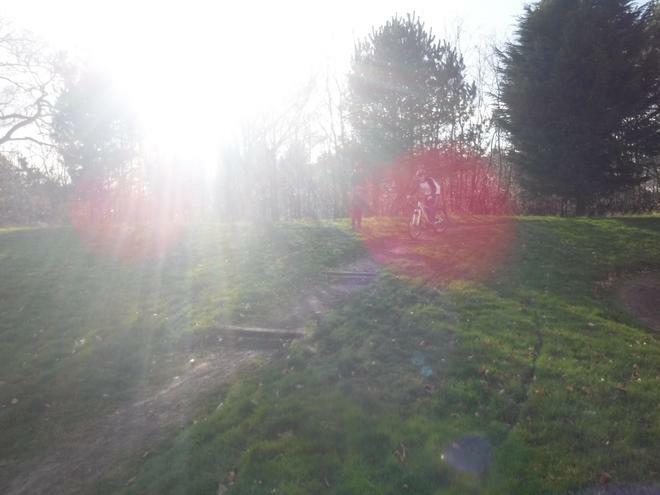 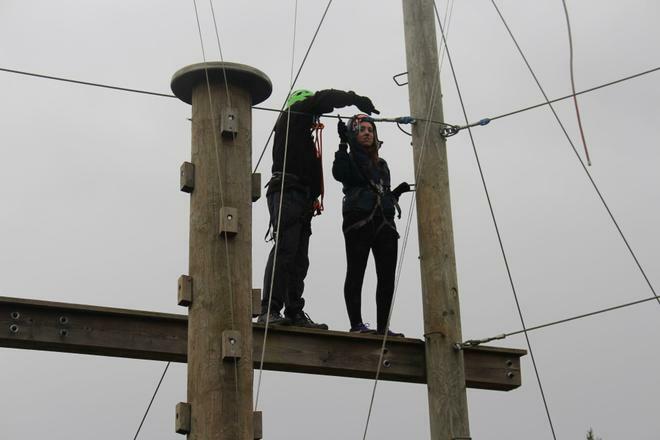 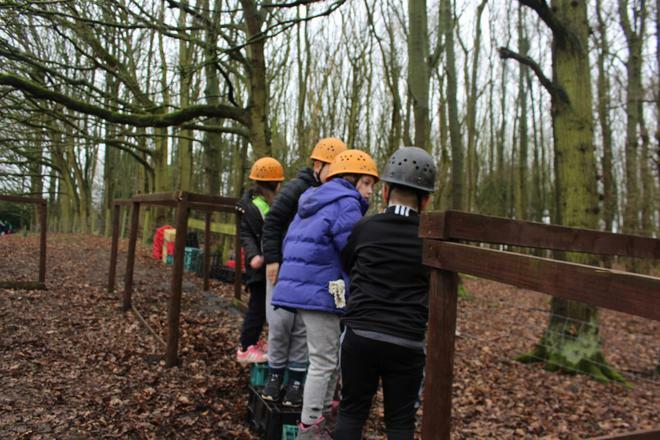 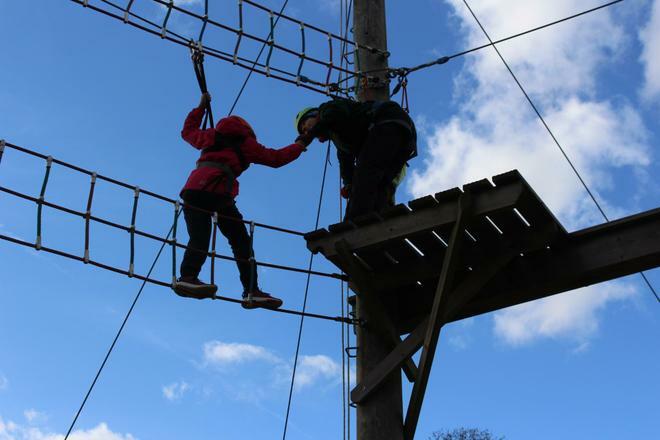 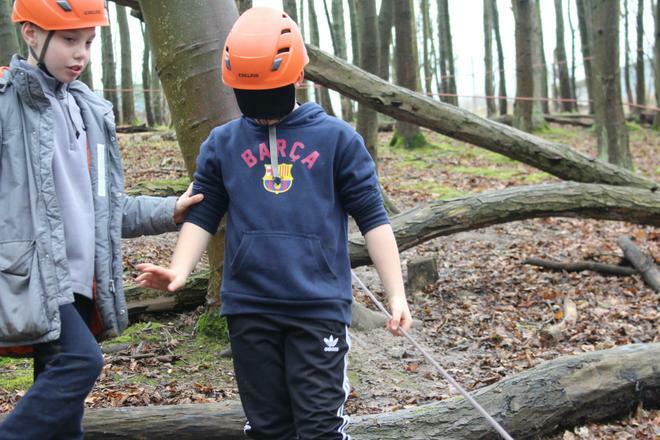 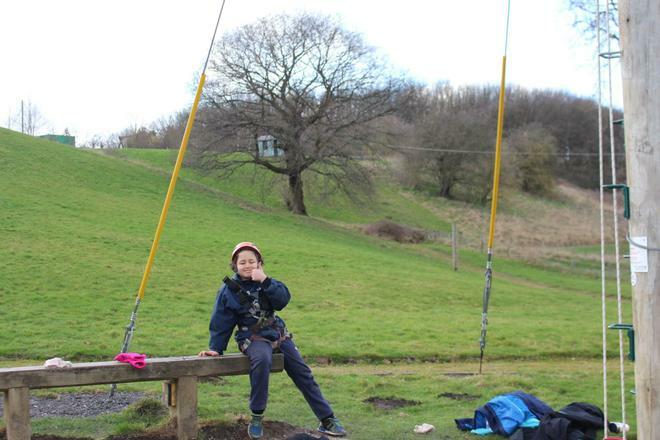 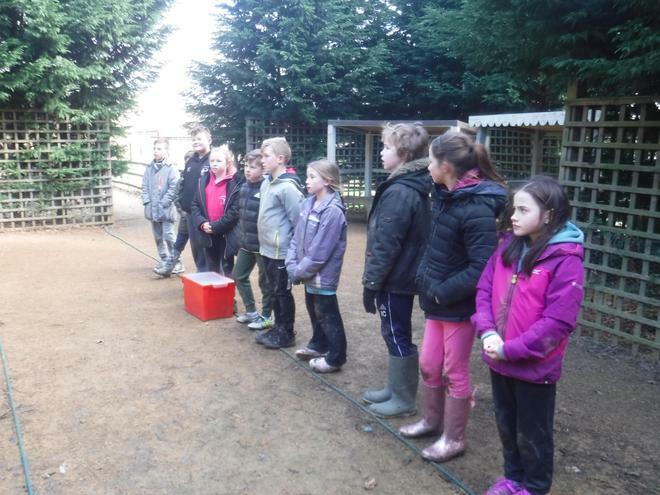 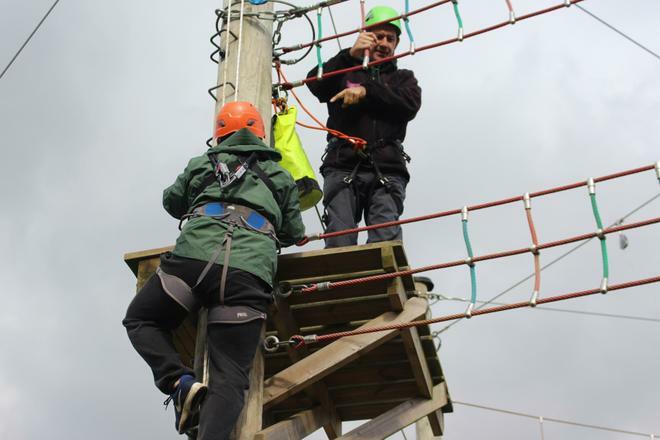 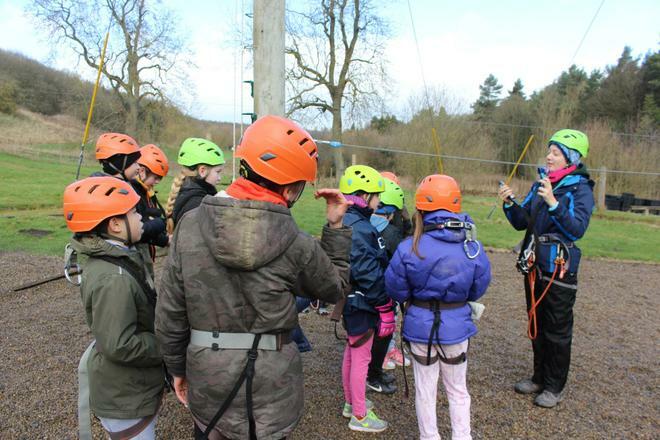 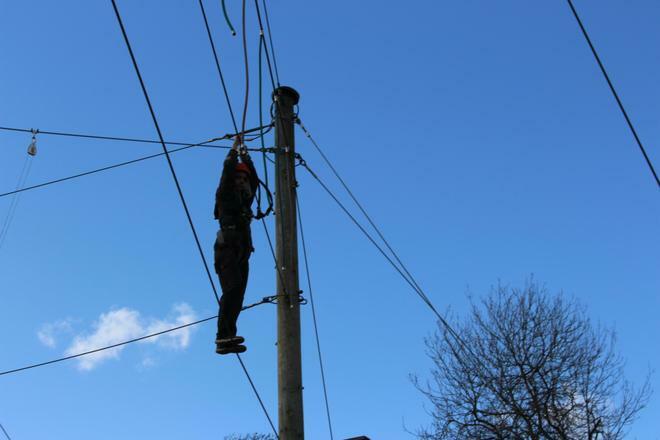 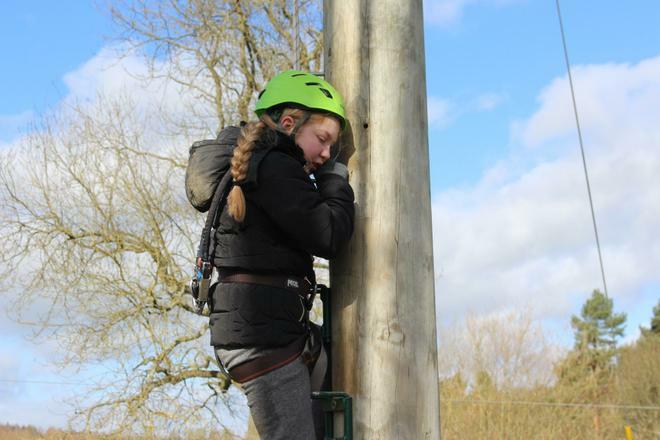 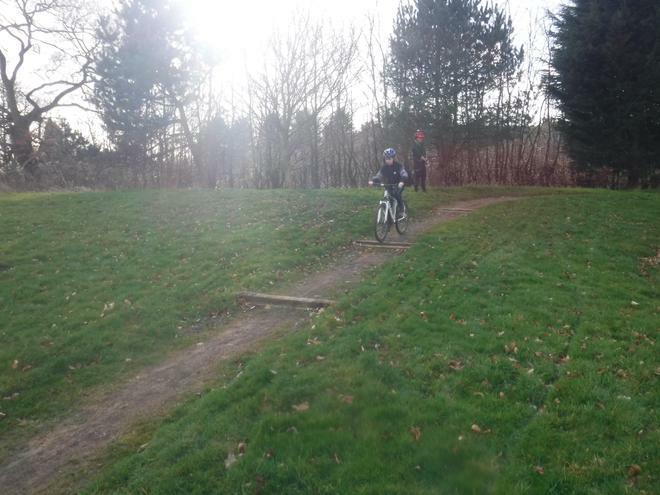 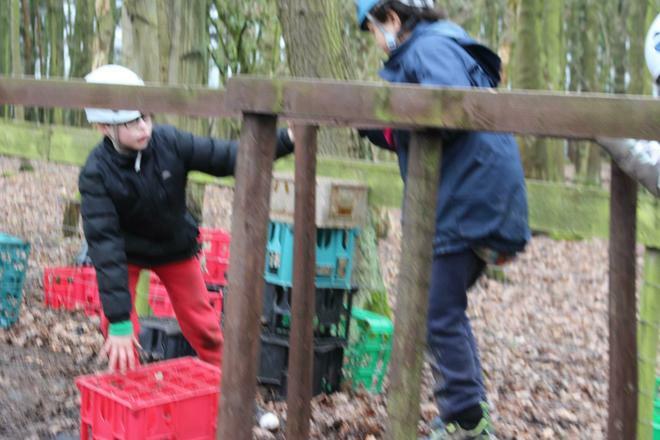 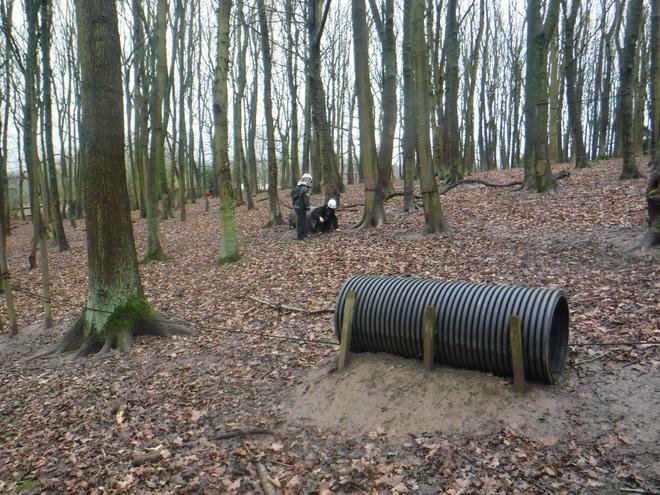 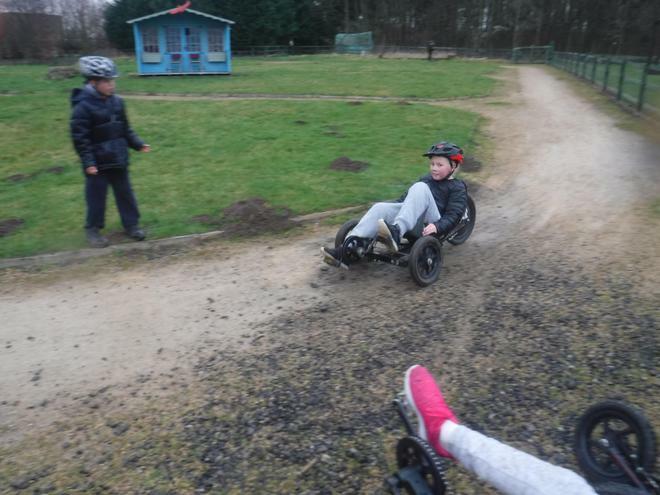 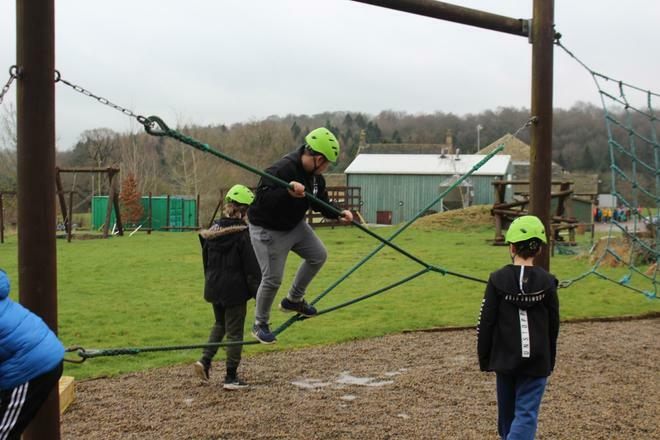 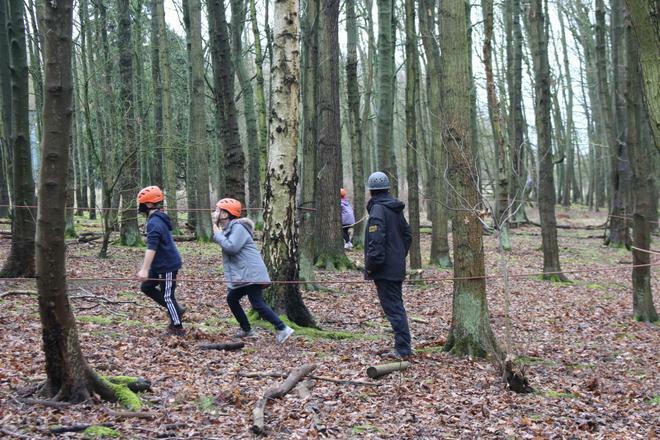 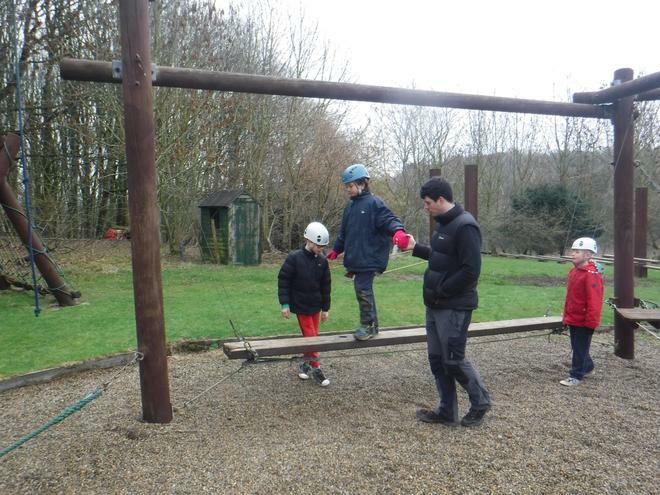 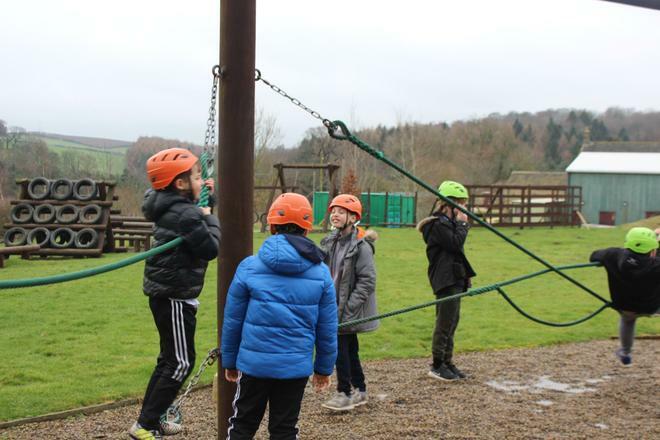 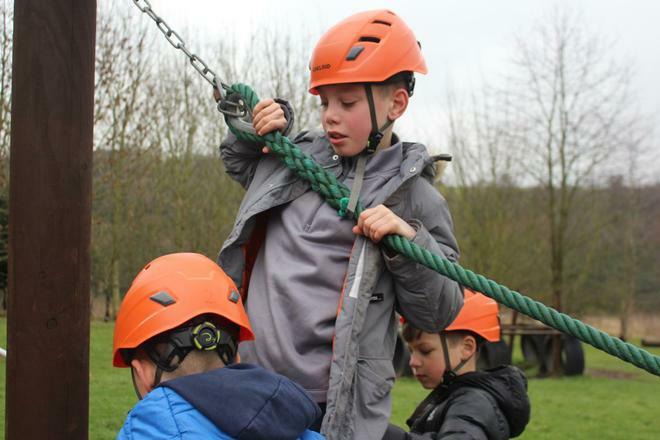 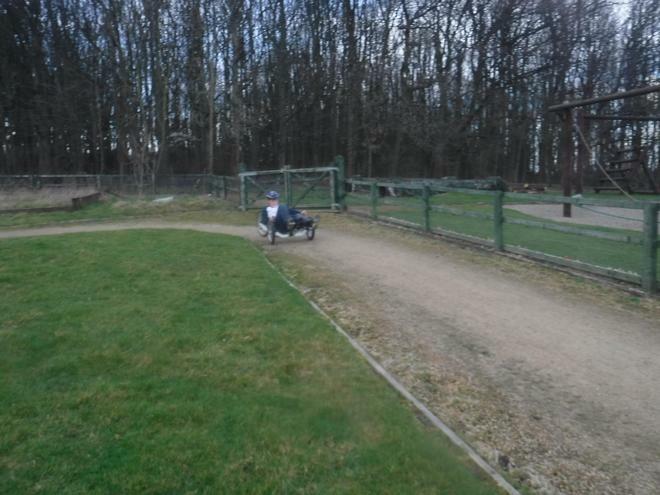 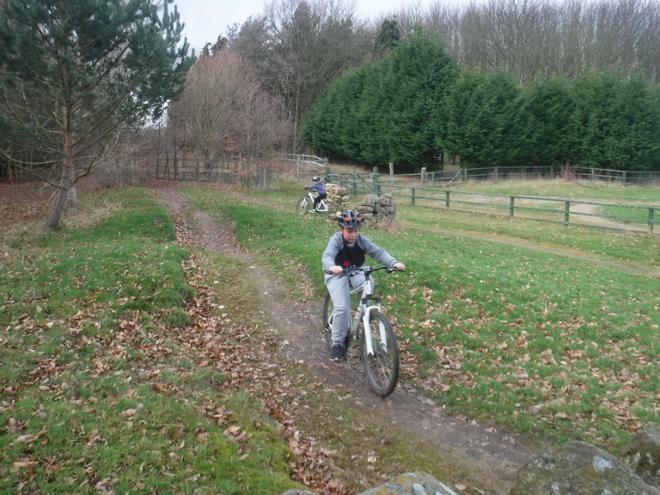 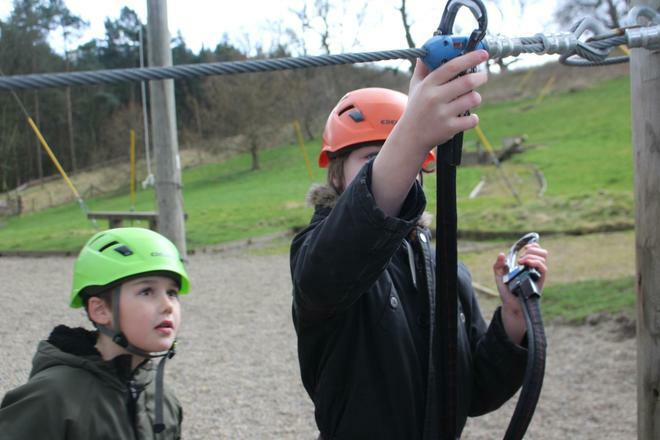 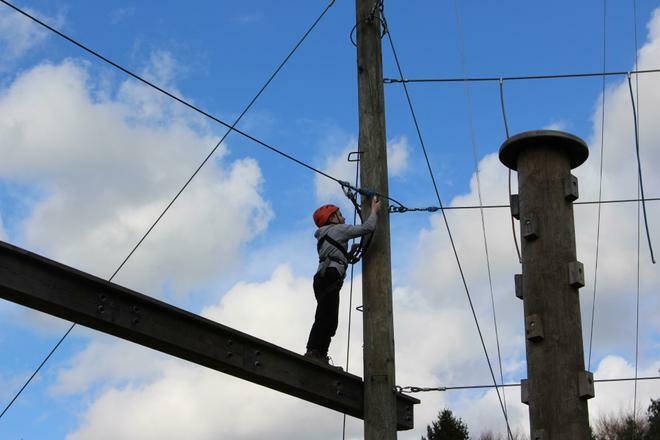 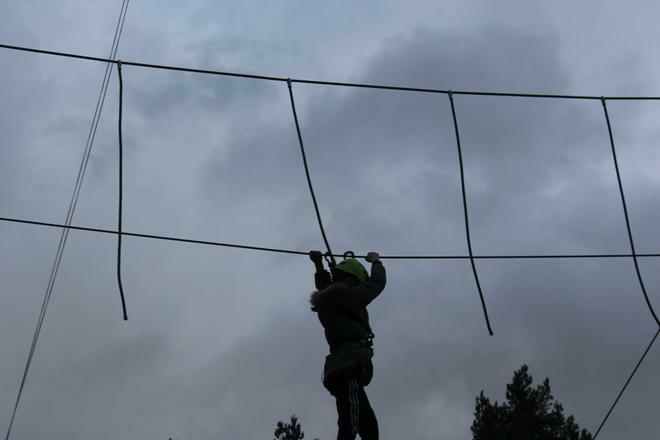 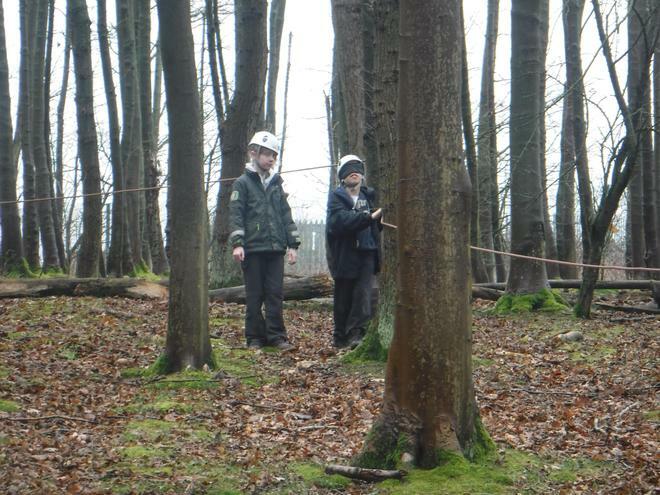 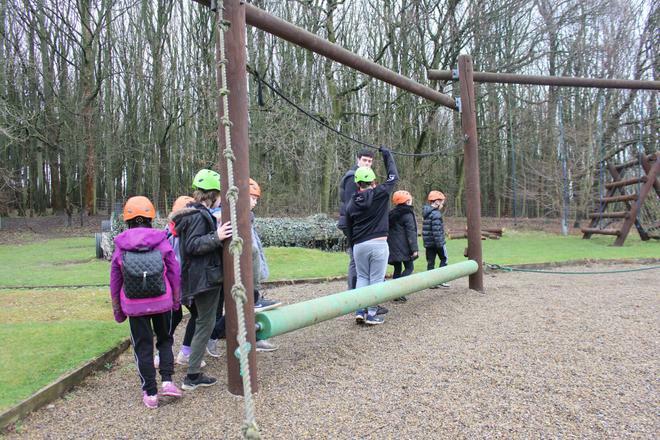 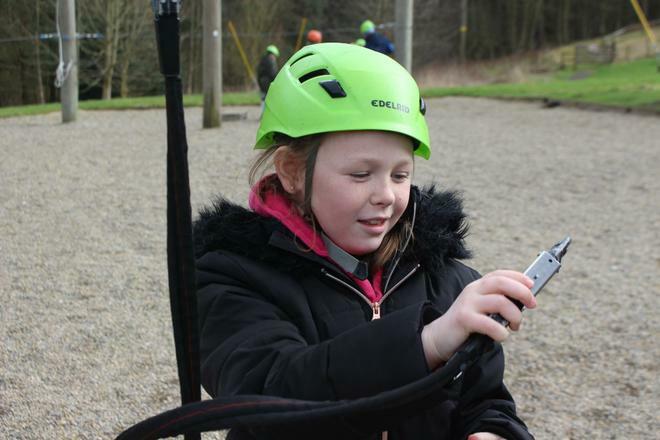 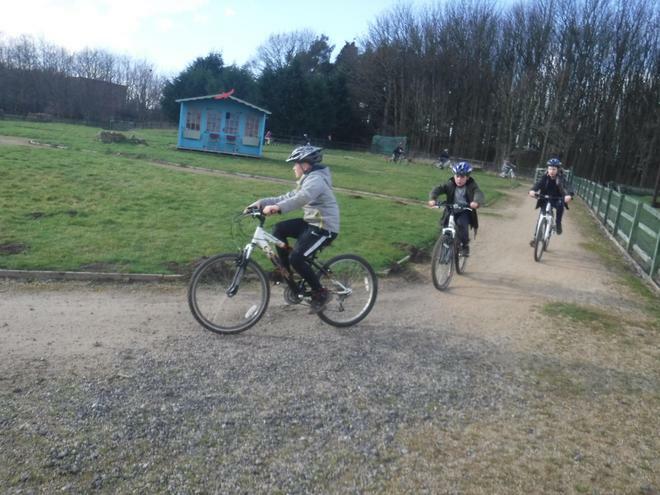 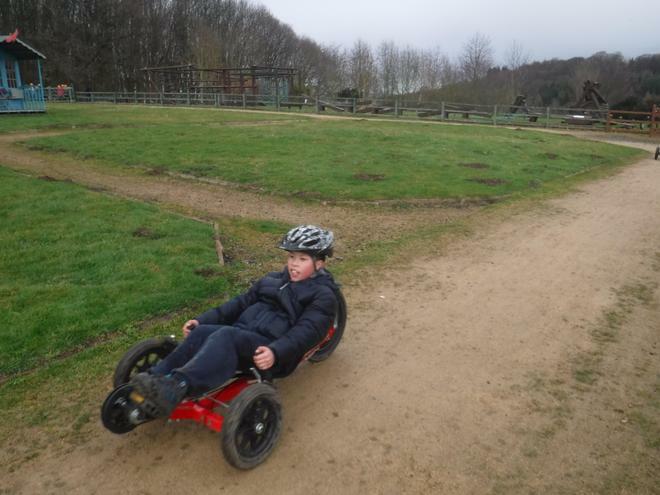 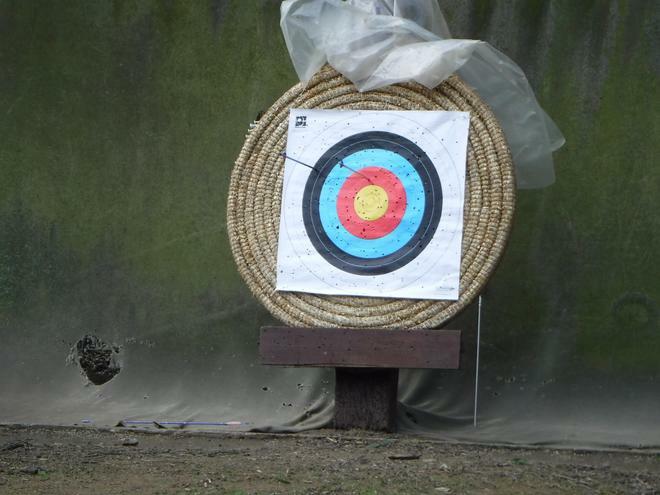 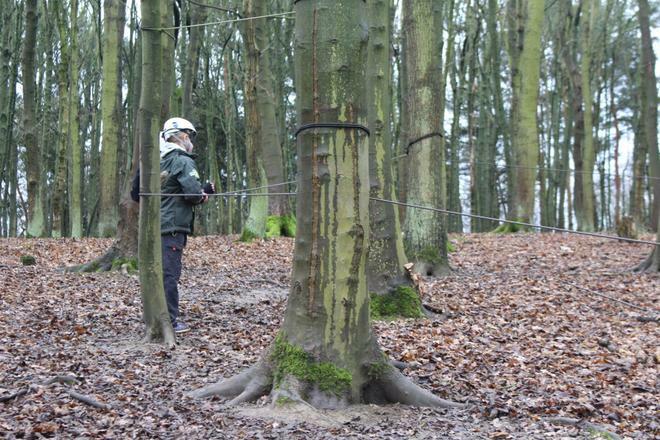 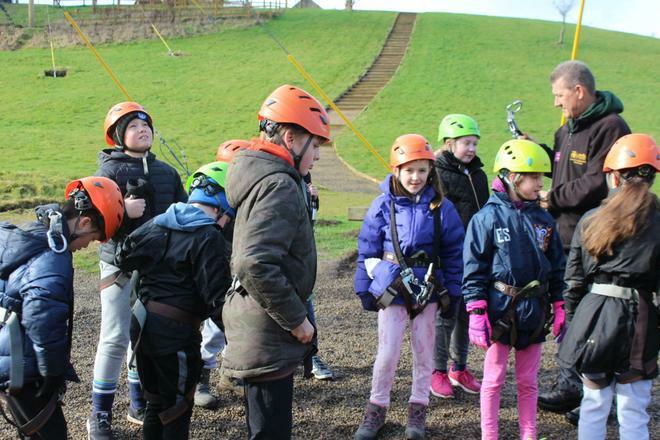 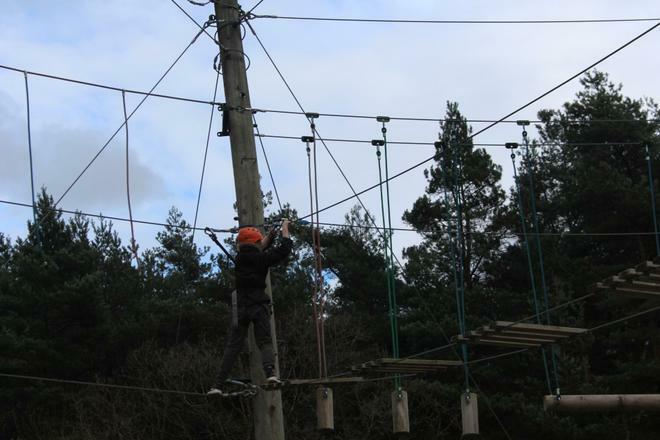 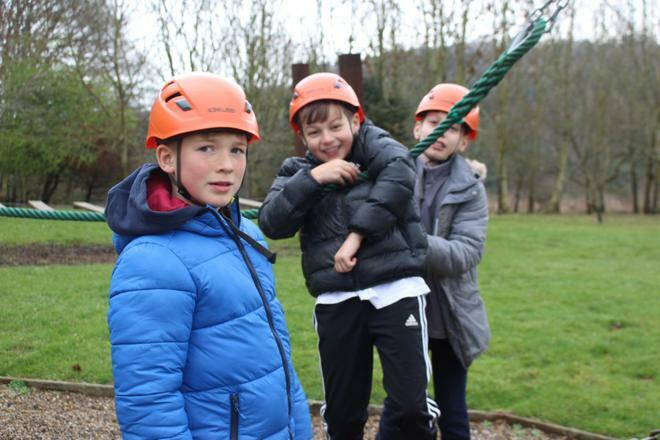 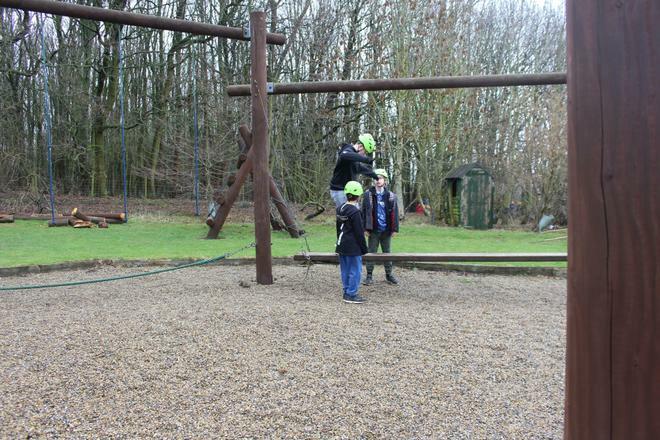 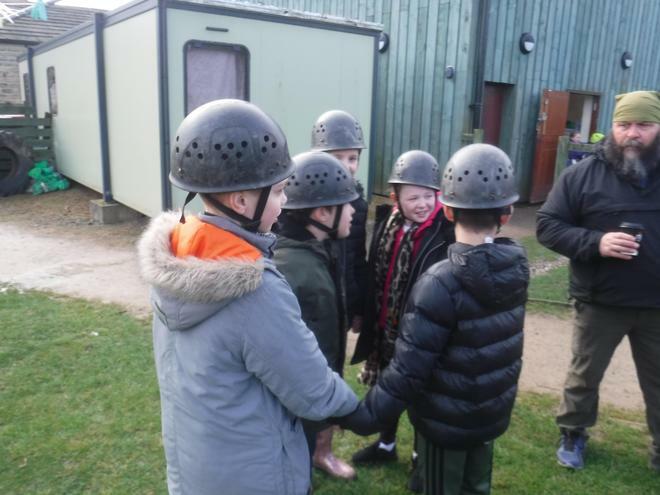 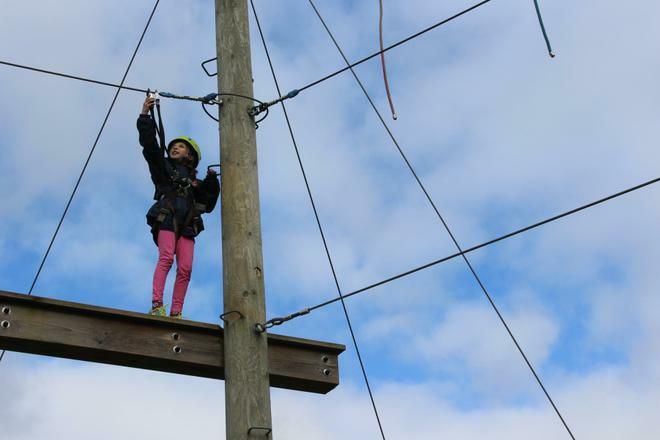 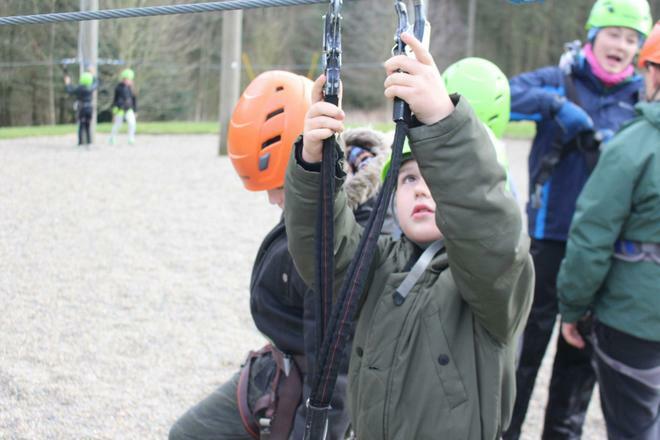 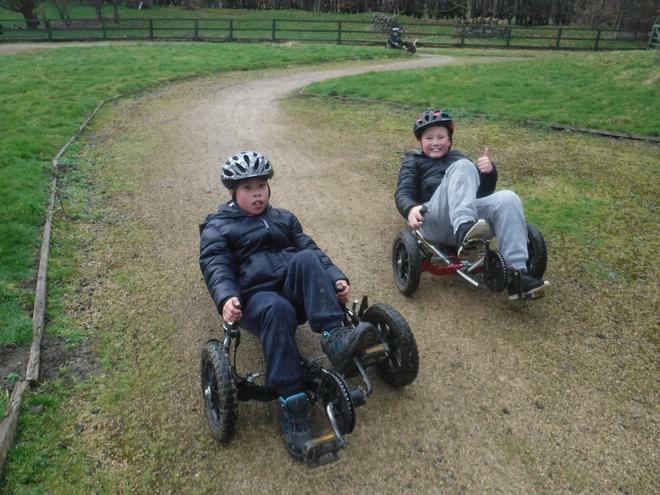 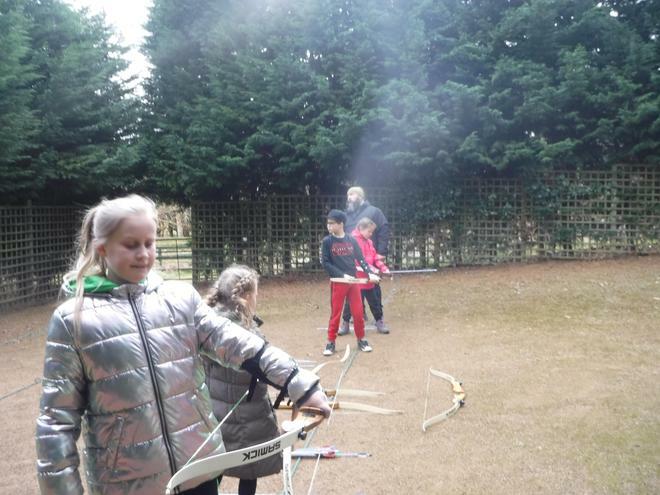 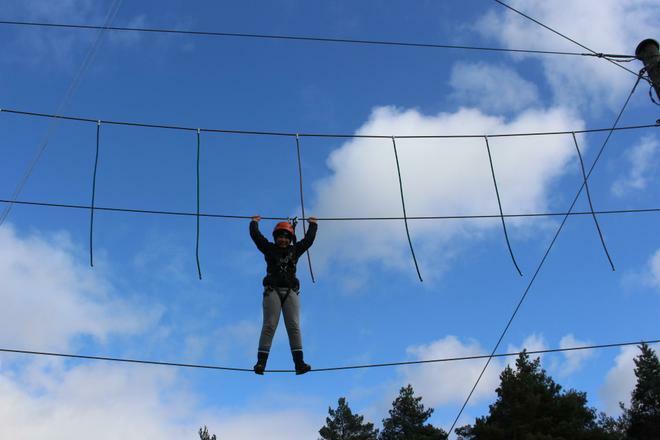 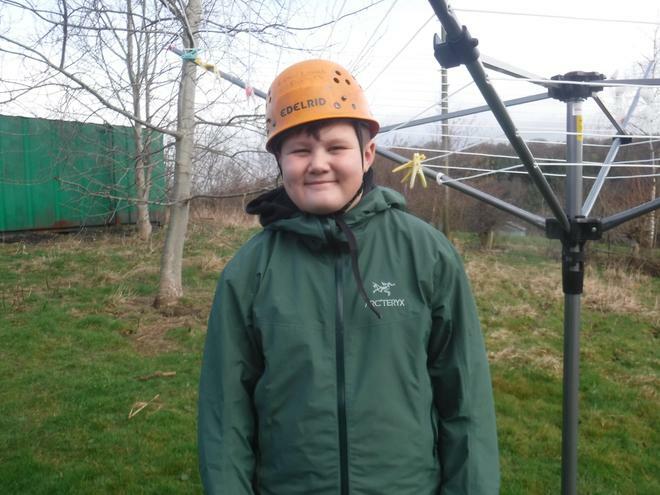 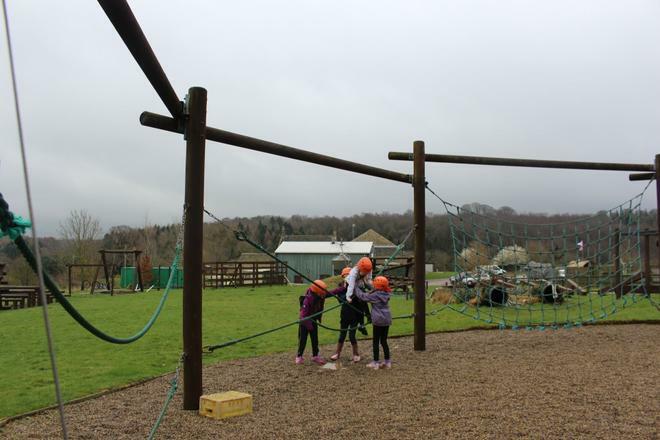 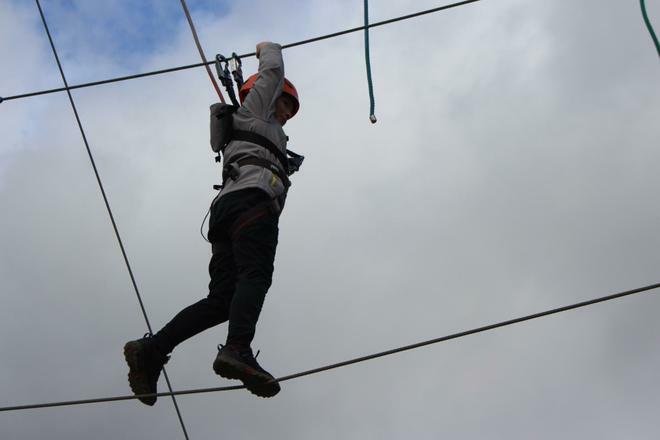 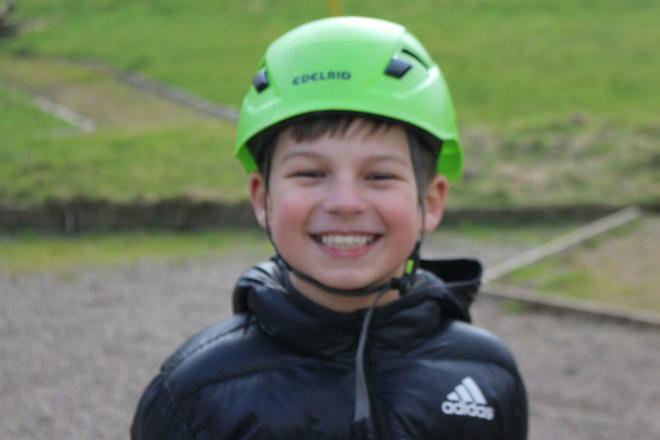 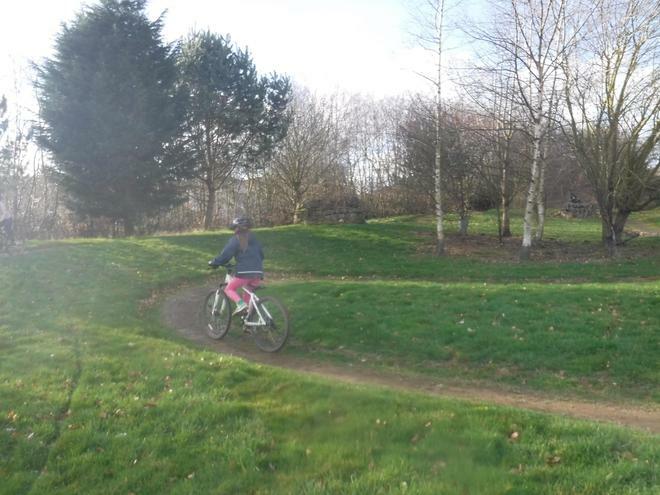 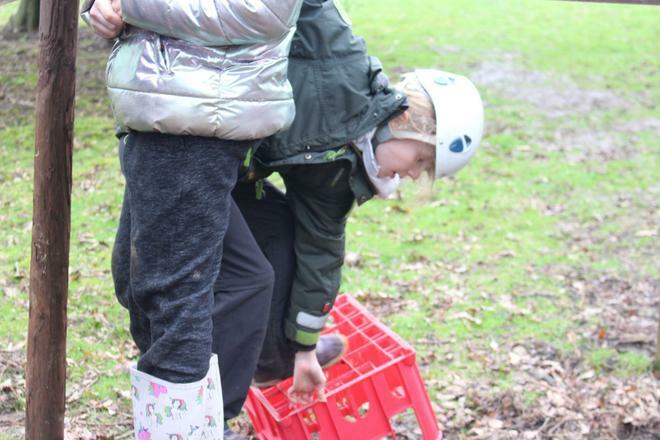 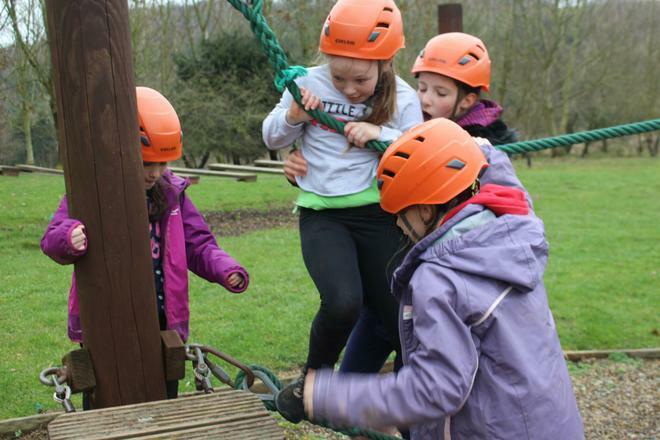 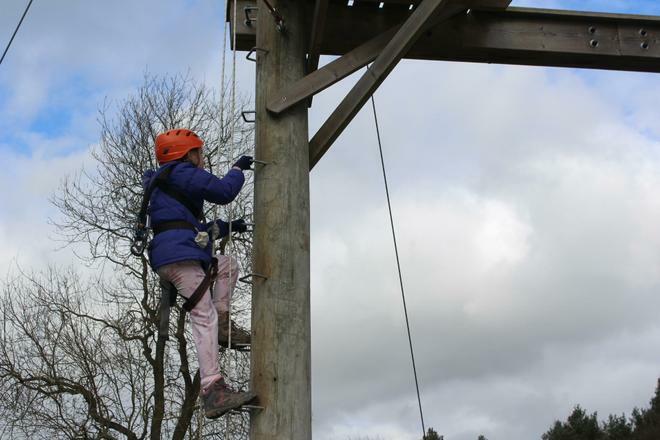 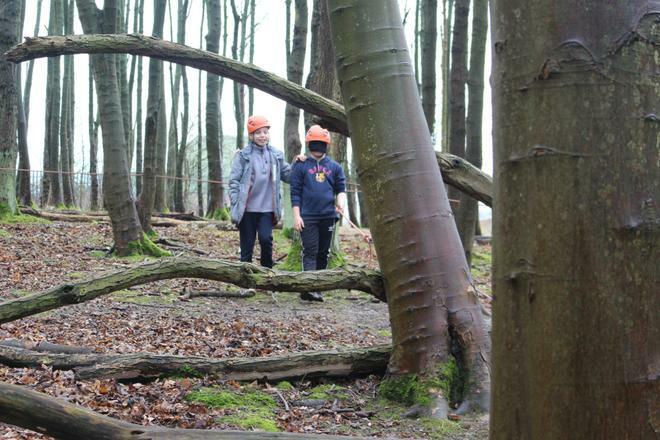 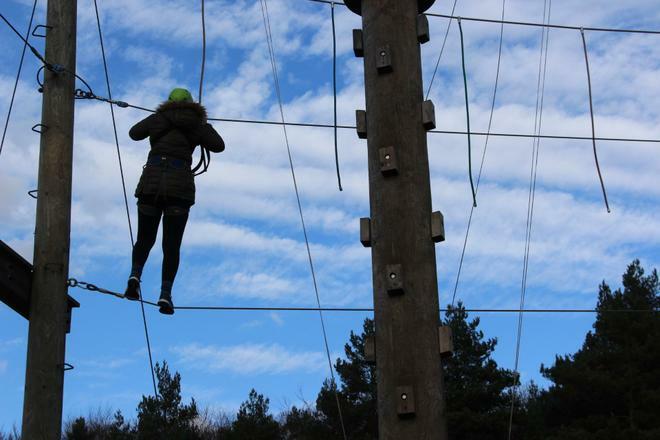 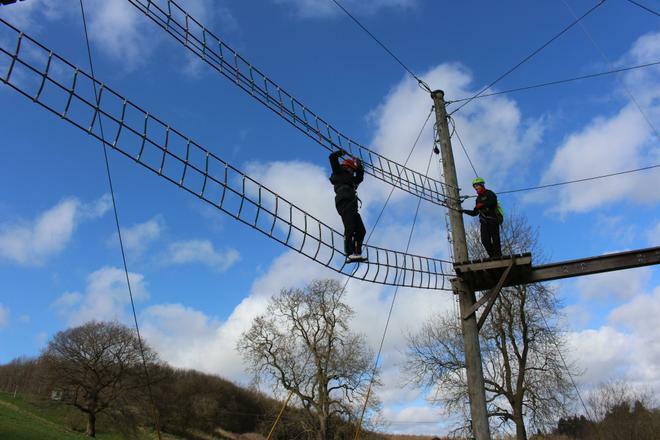 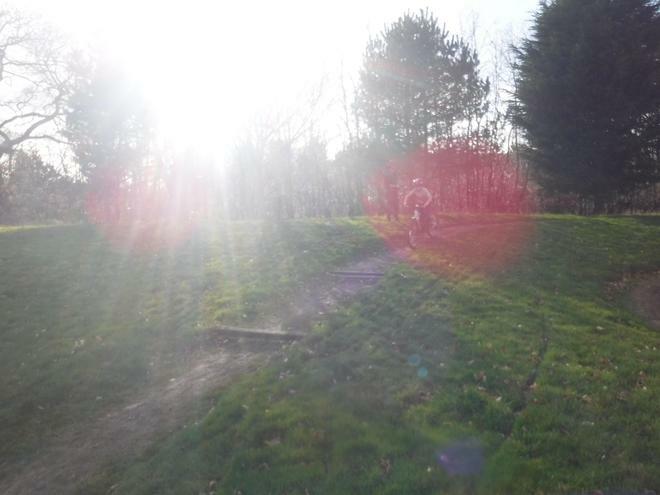 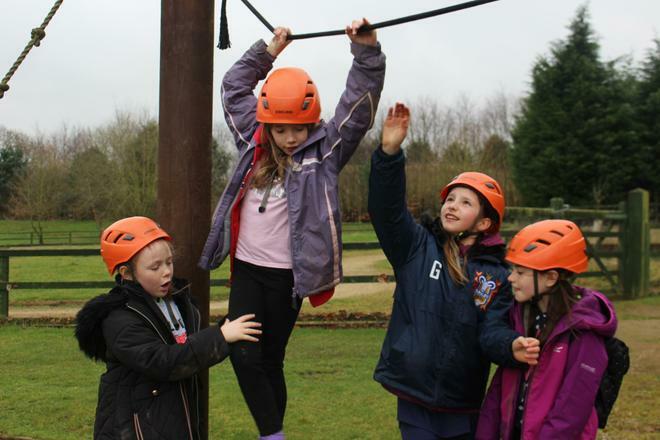 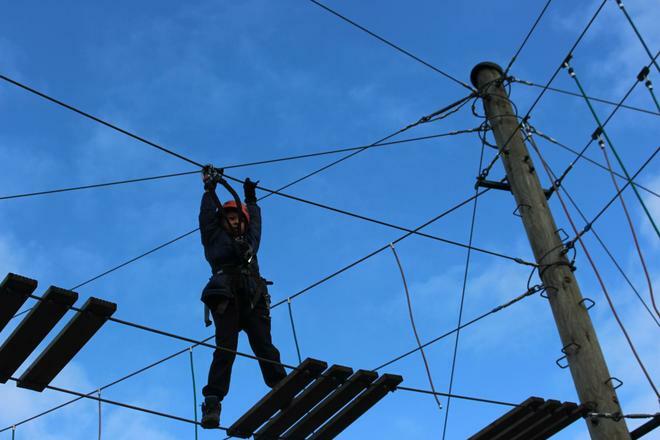 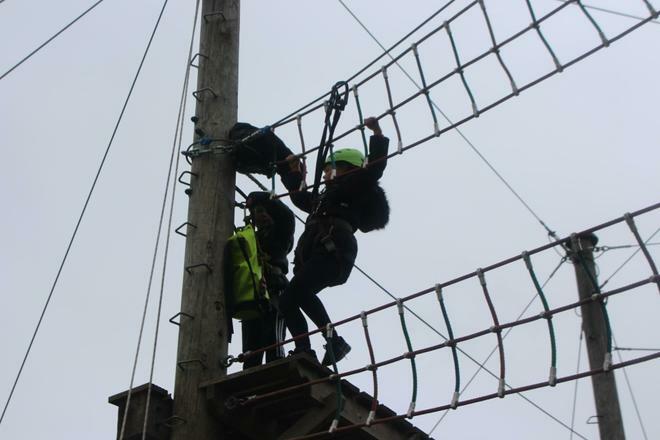 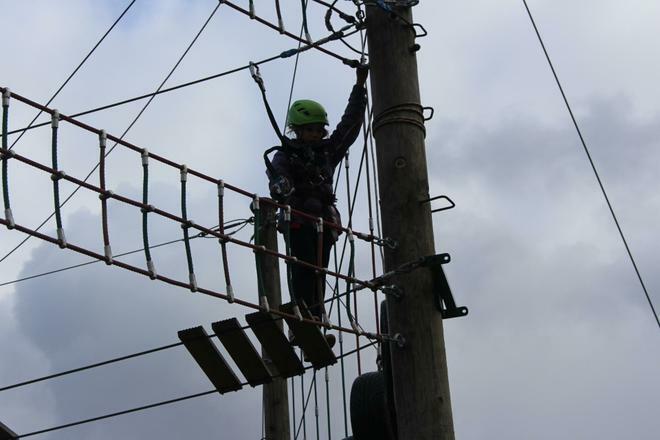 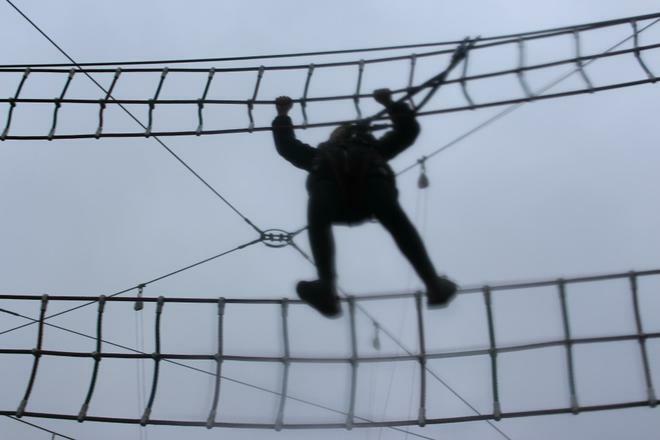 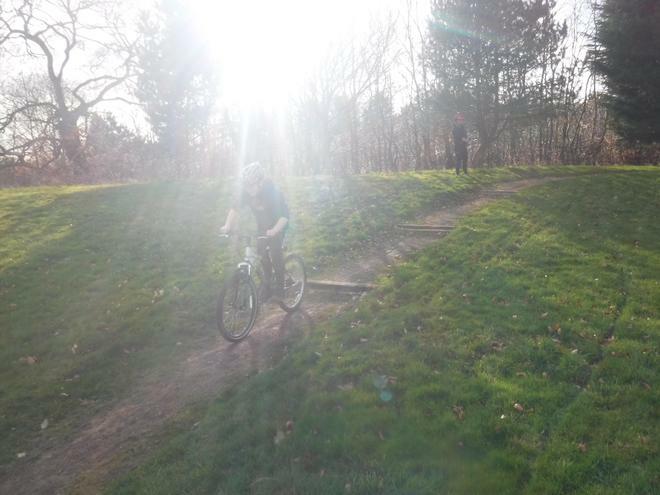 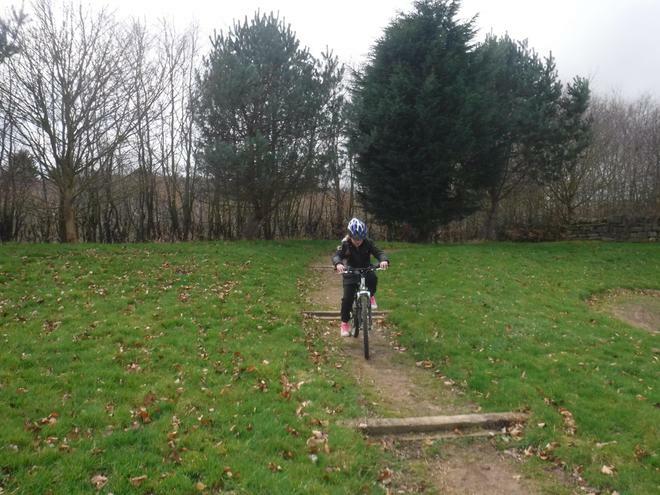 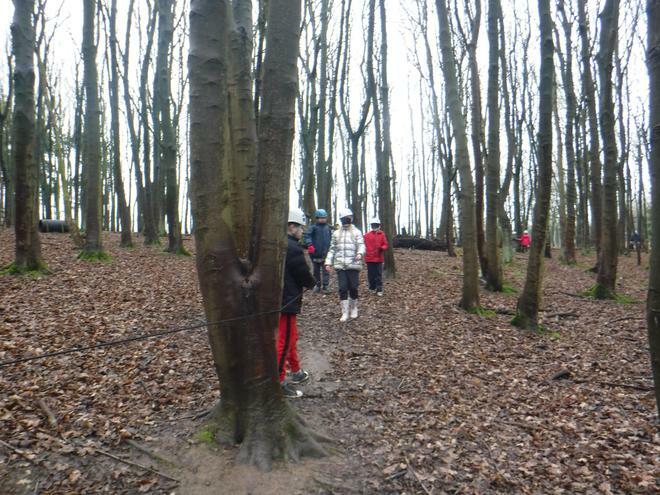 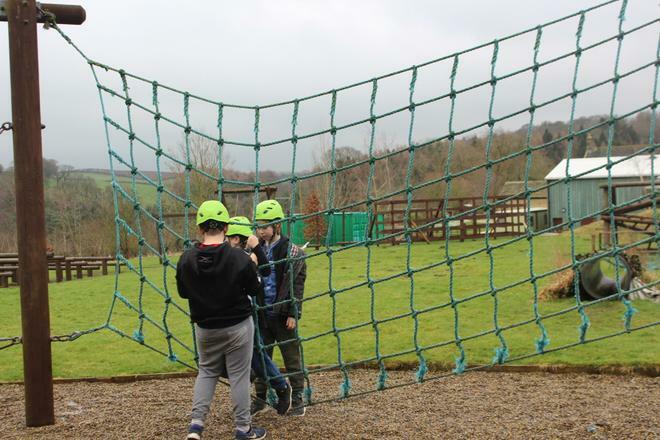 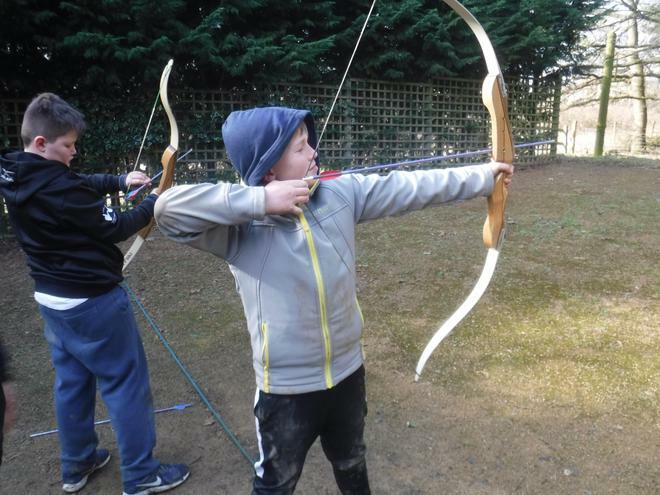 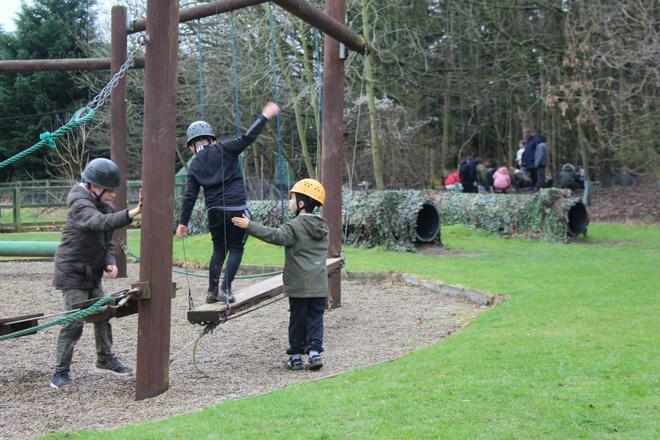 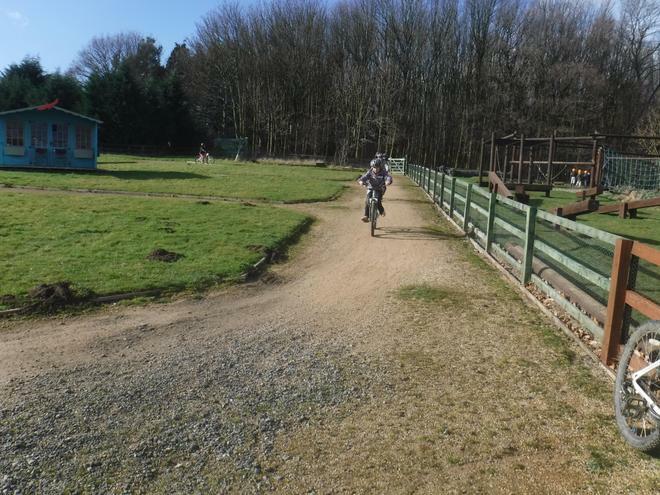 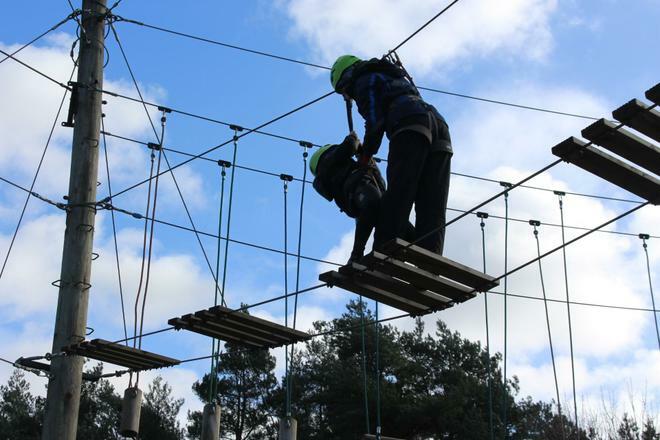 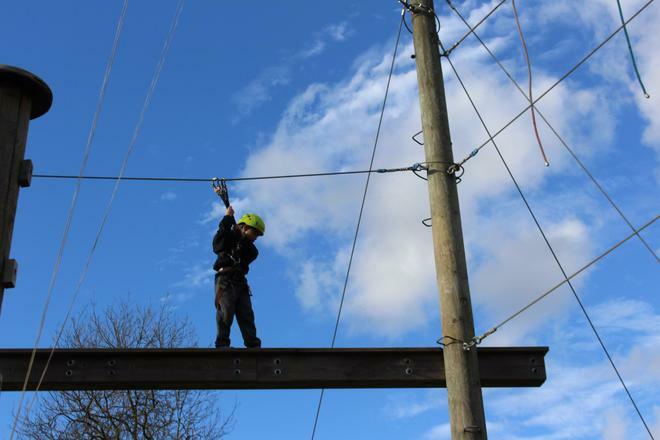 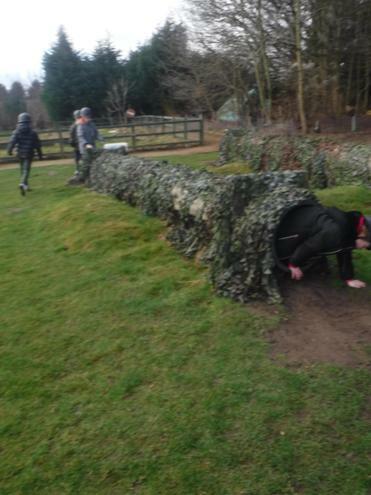 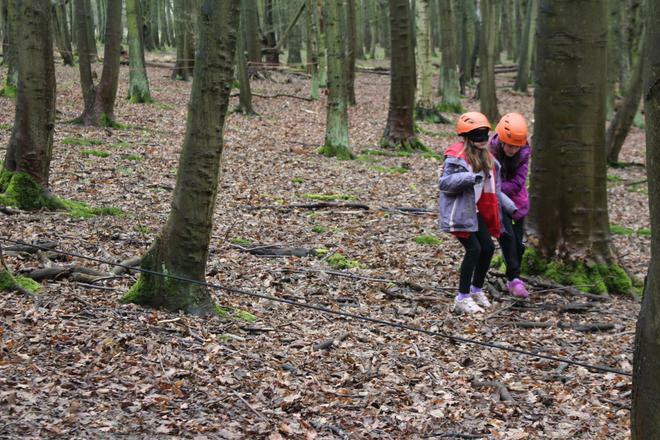 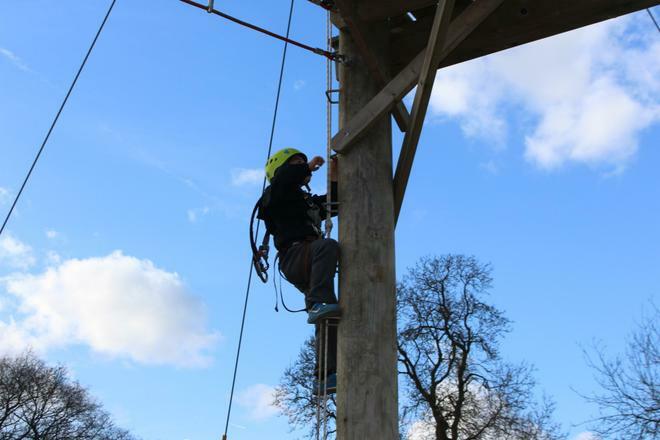 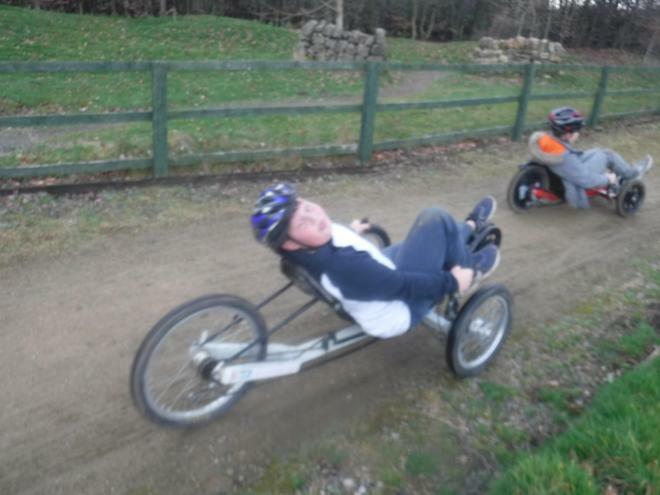 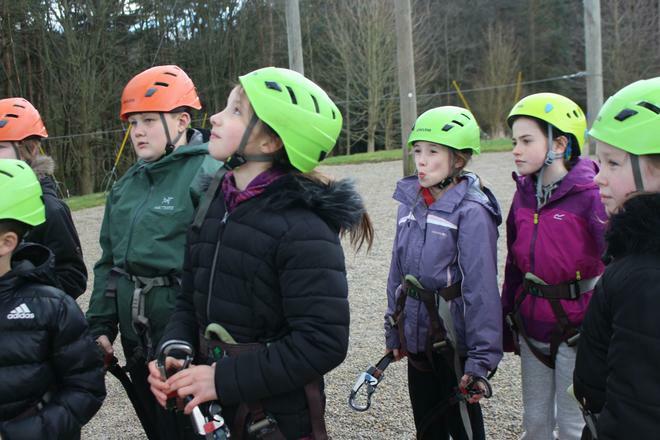 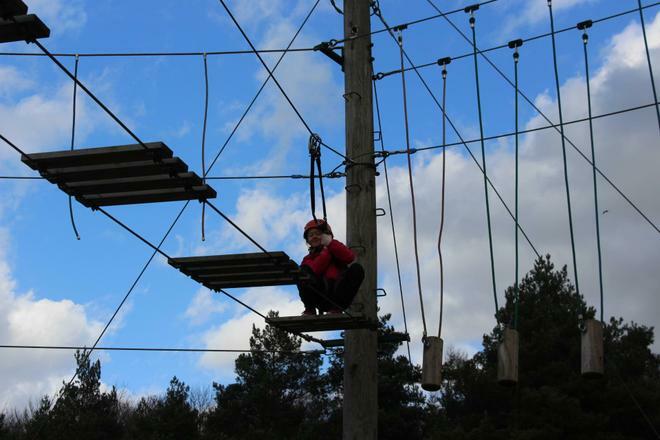 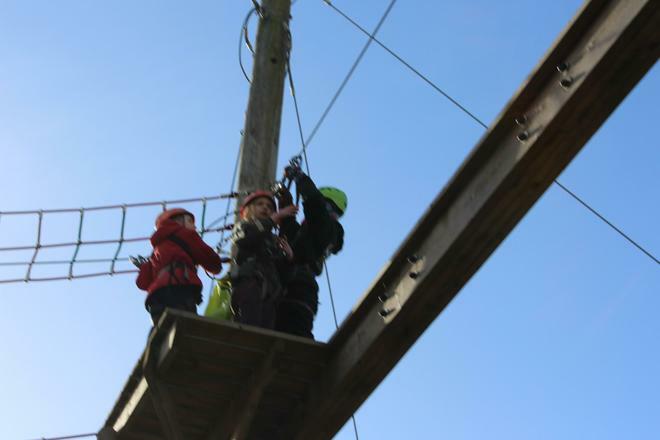 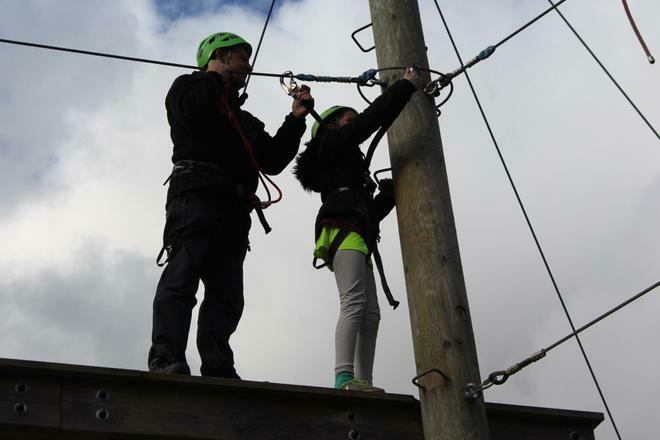 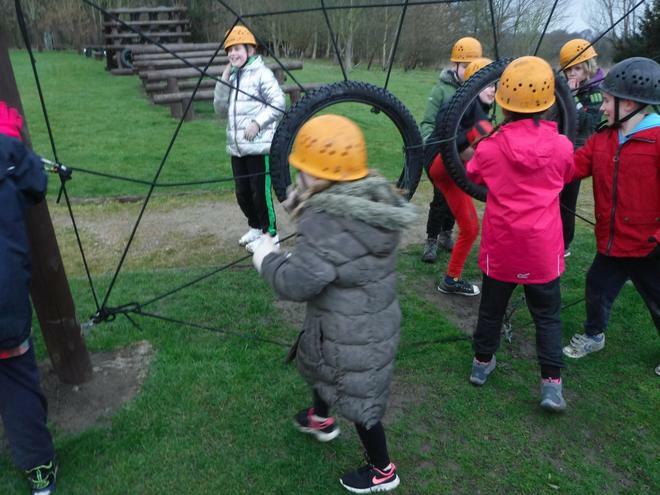 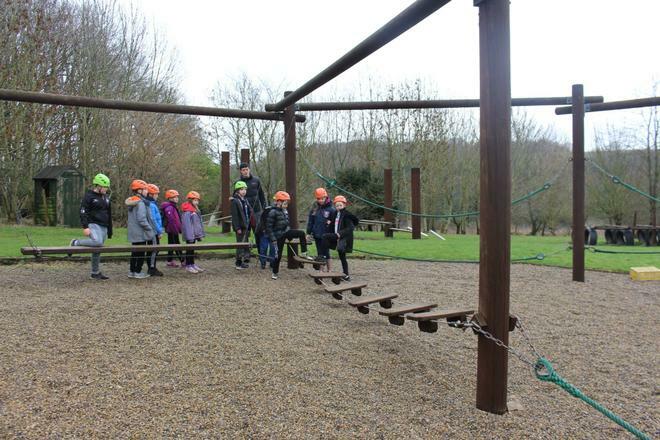 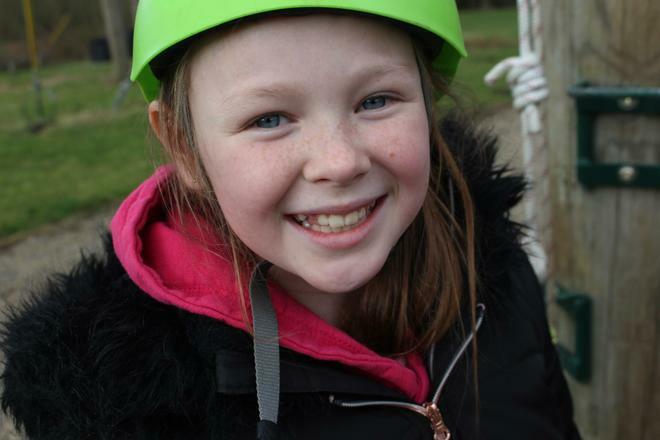 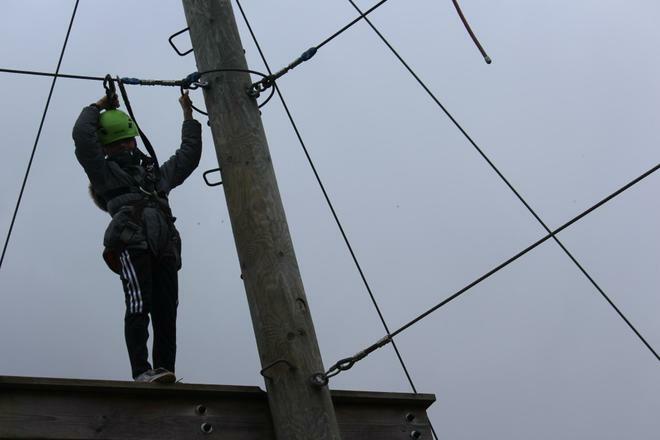 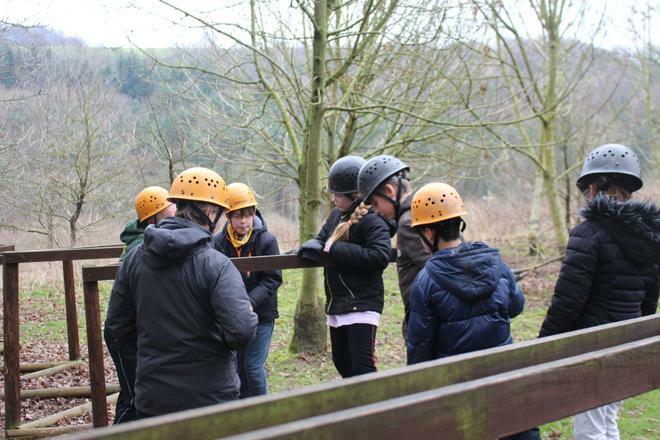 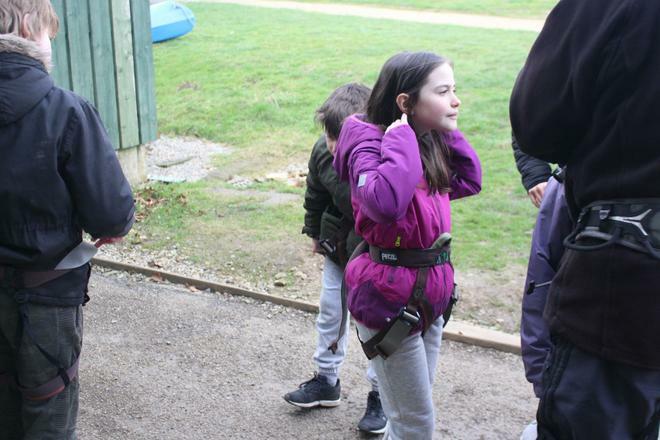 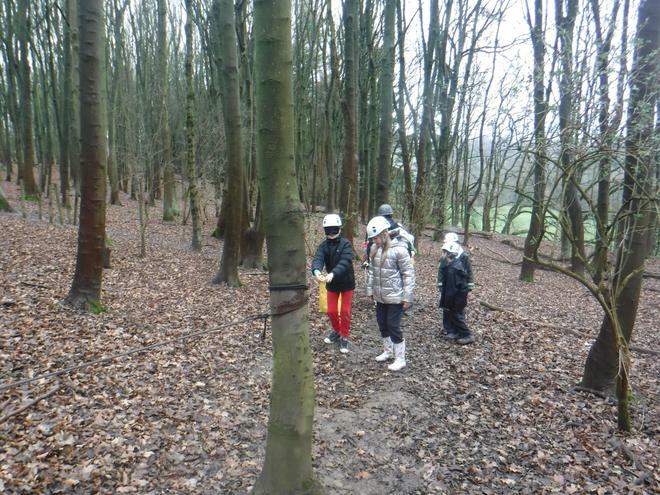 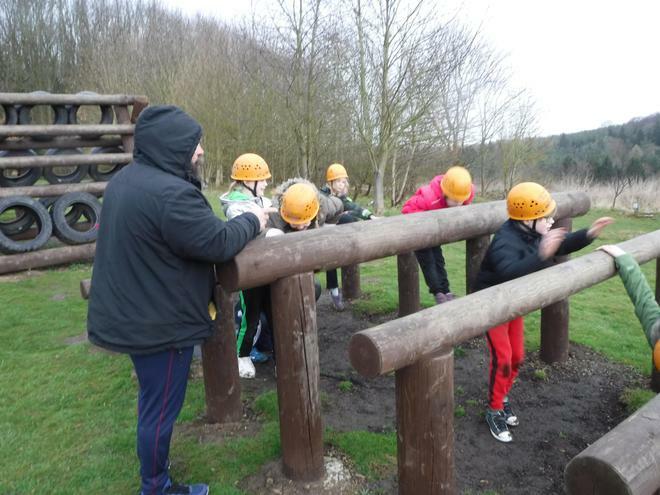 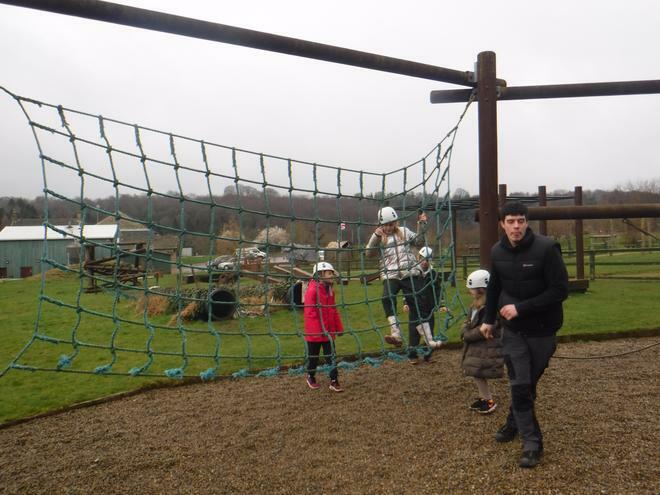 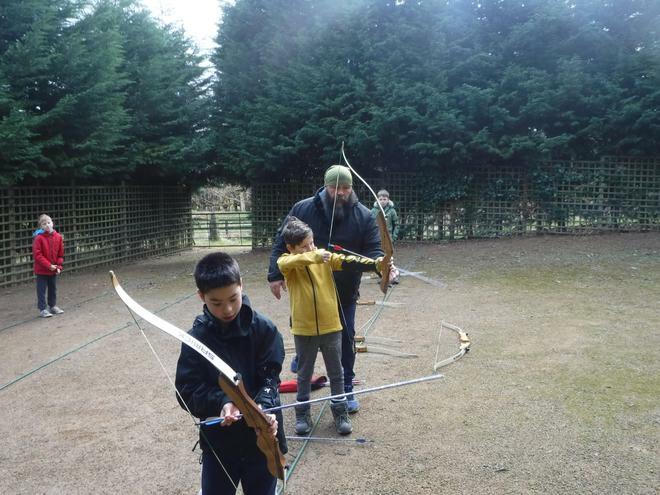 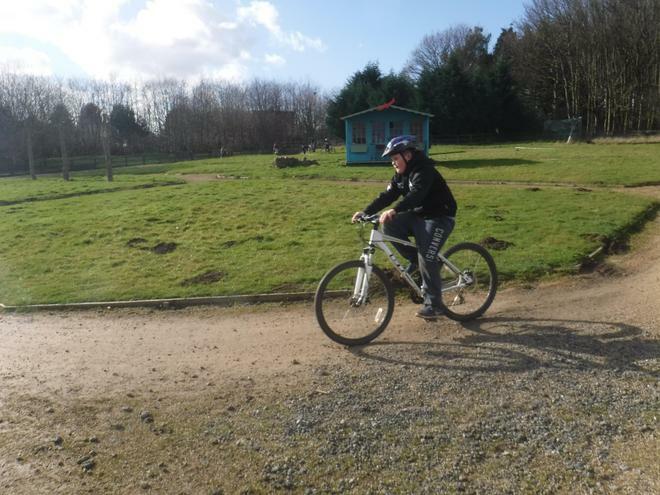 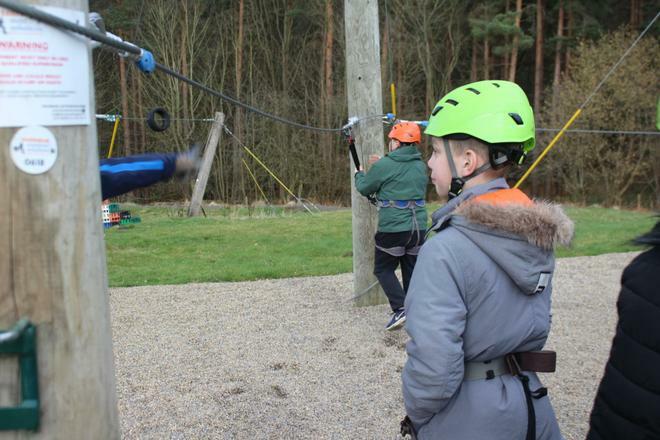 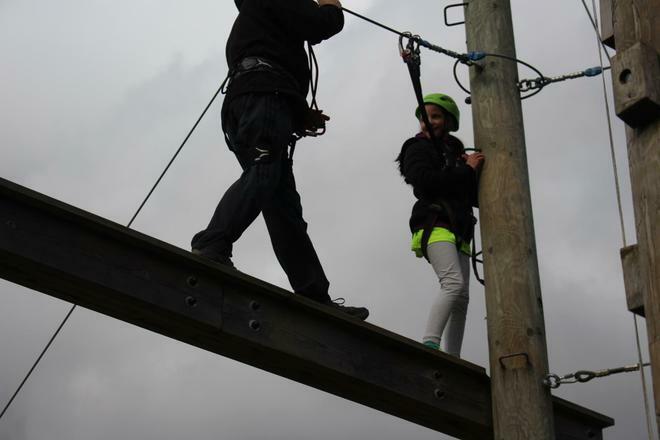 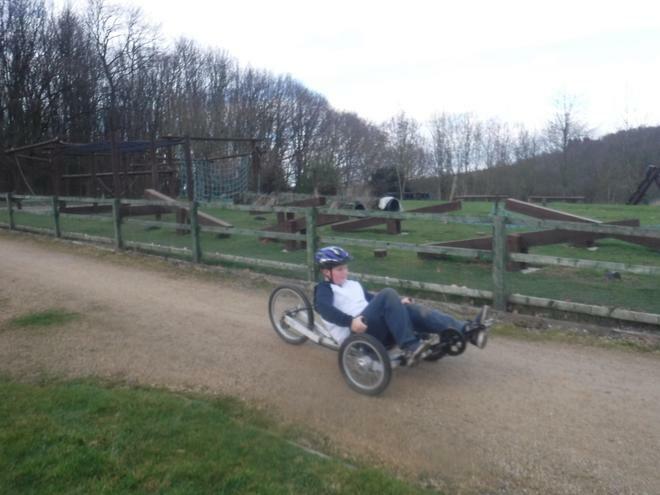 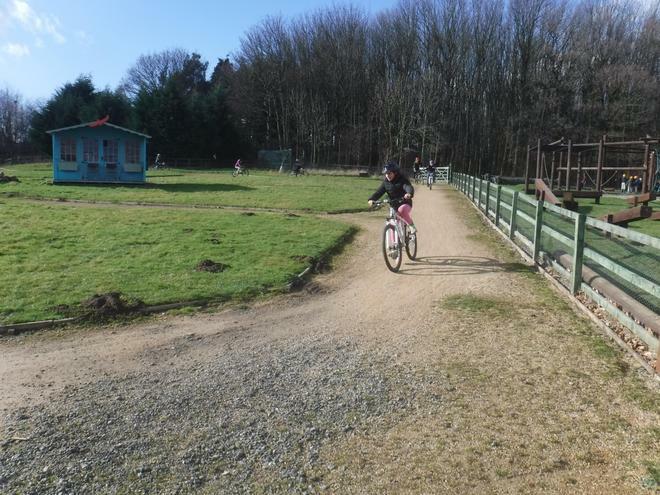 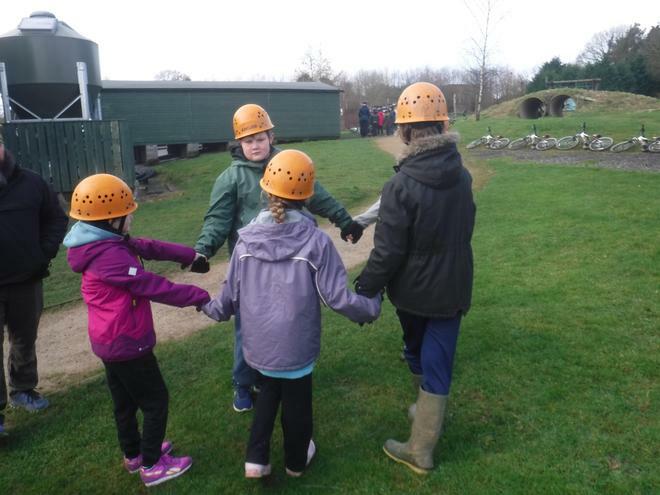 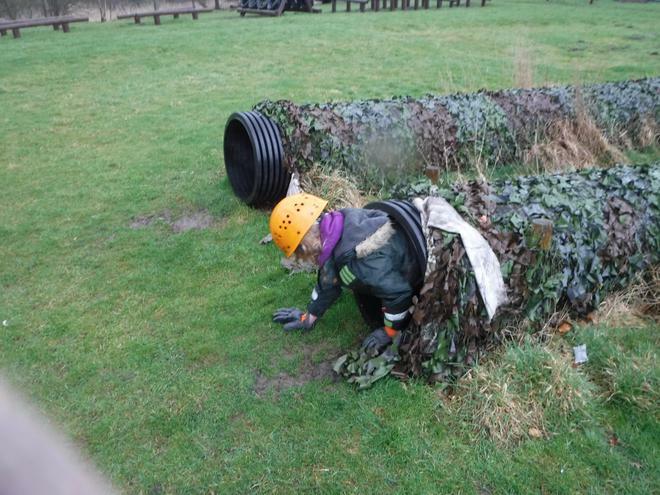 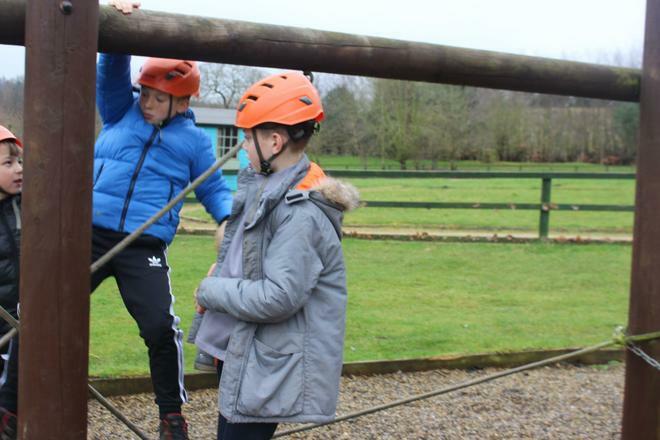 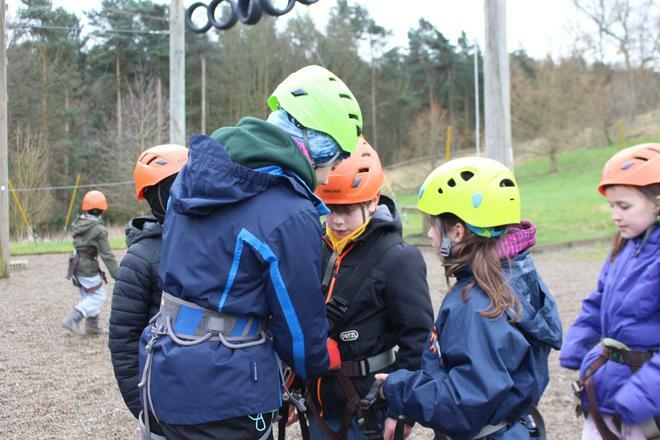 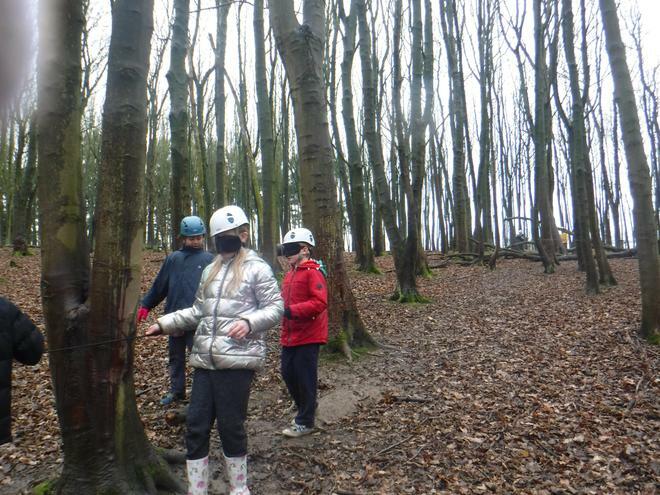 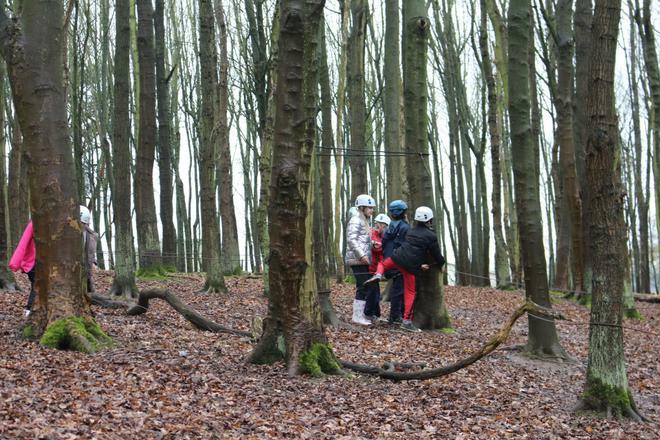 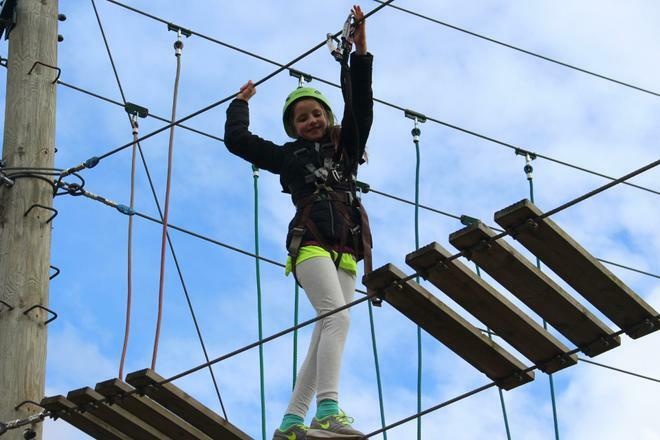 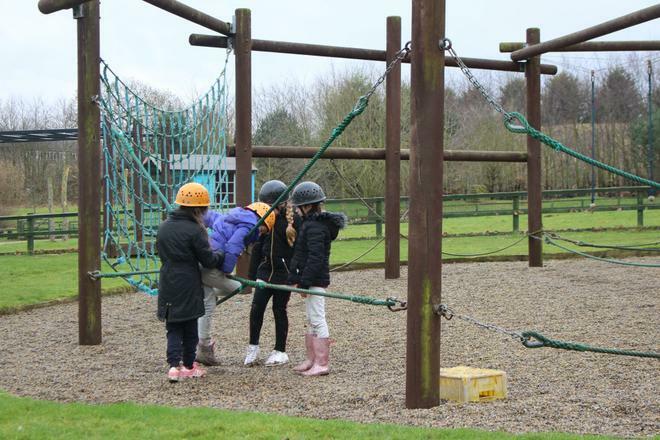 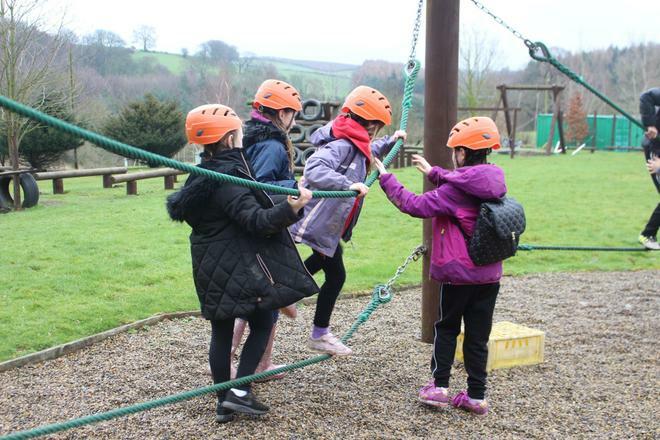 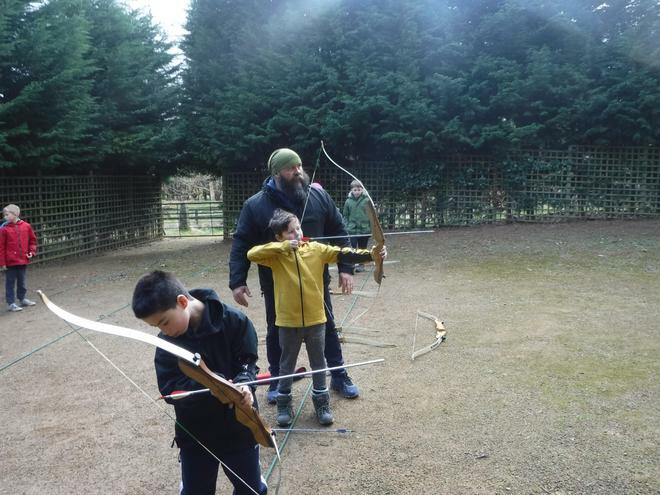 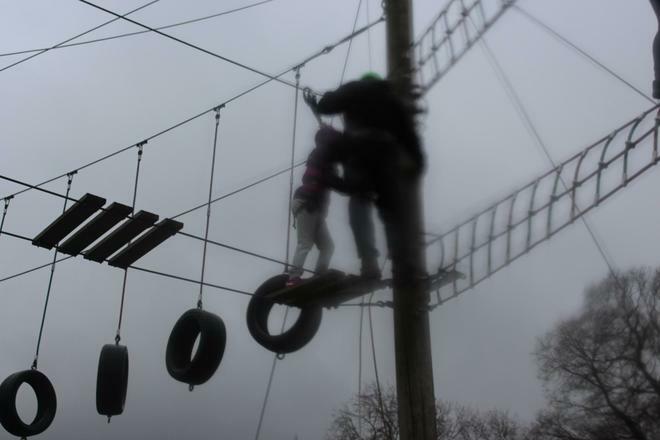 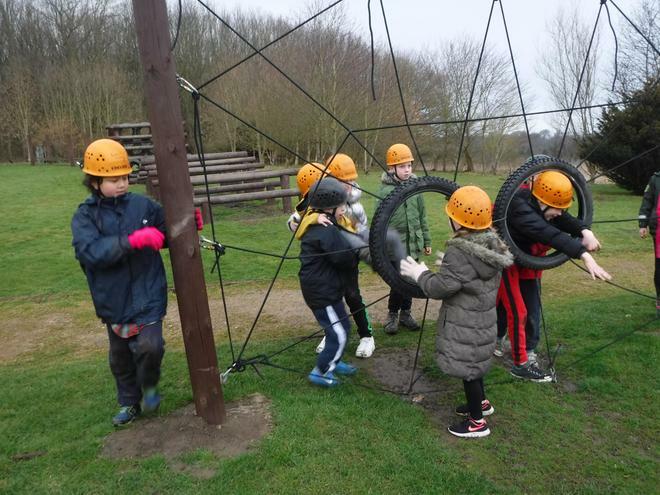 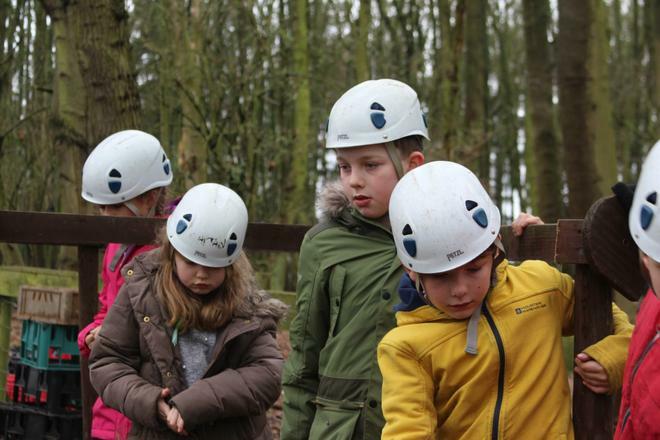 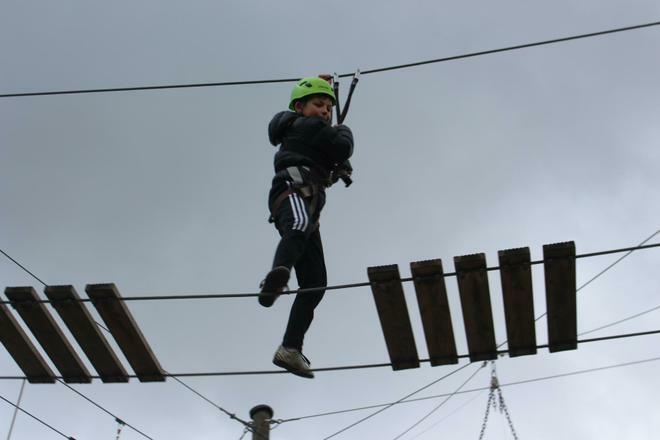 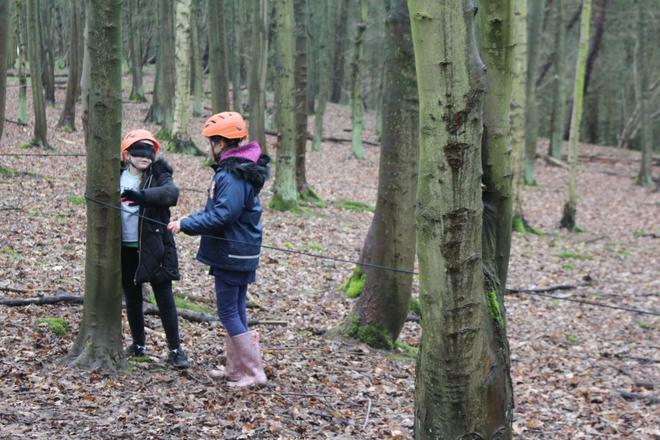 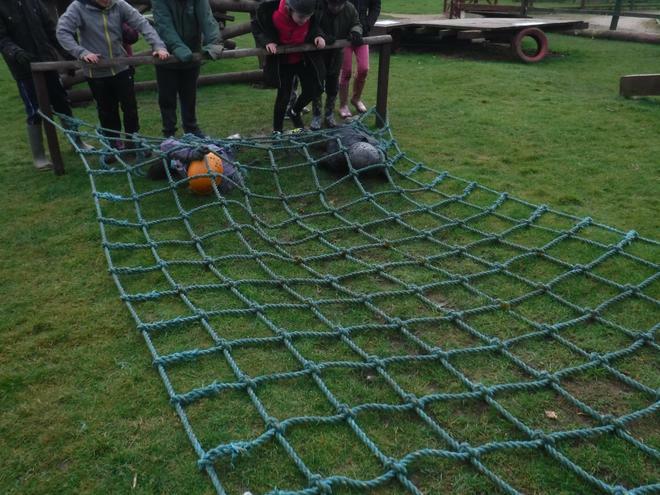 In the afternoon the groups when out to do their first adventurous activity - one group took on the challenge of the high ropes, another group enjoyed archery followed by the assault course where team work was essential and the final group enjoyed cycling both on a track and on rougher terrain. 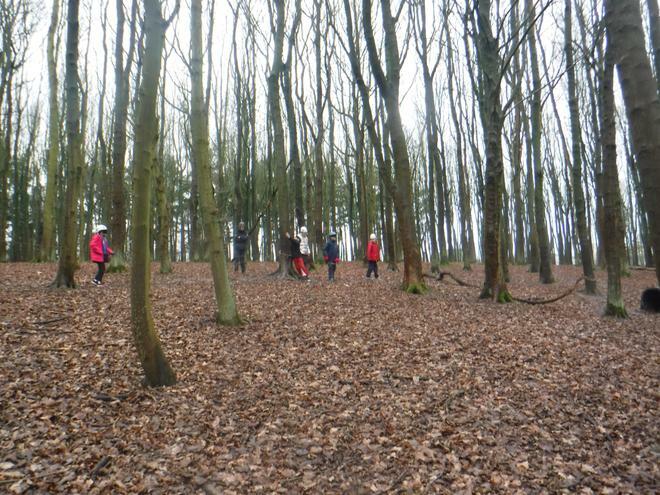 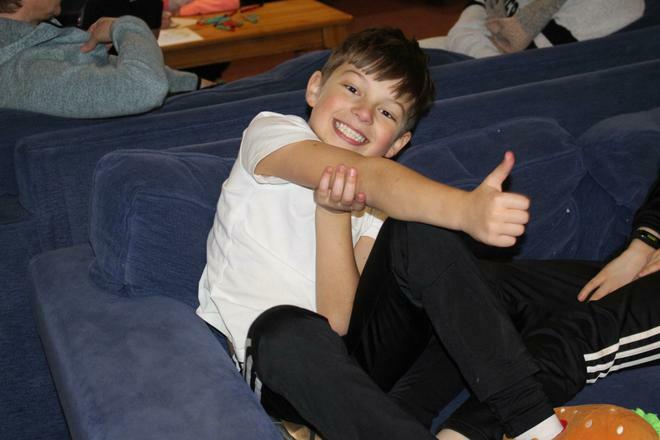 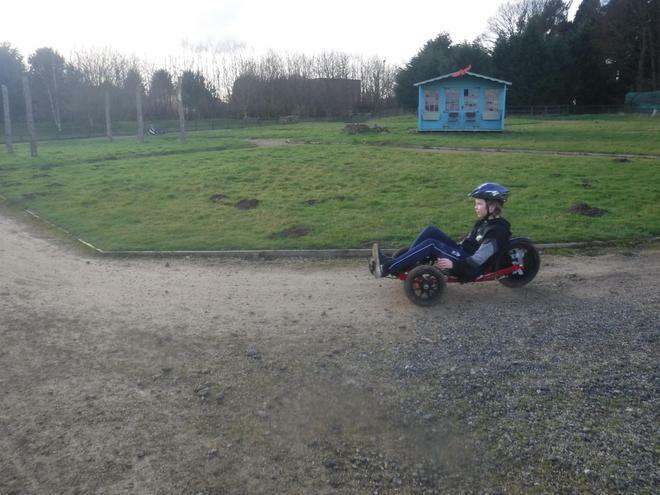 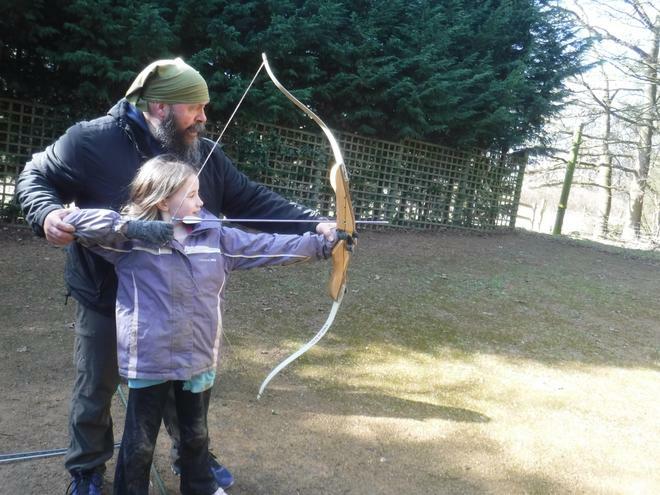 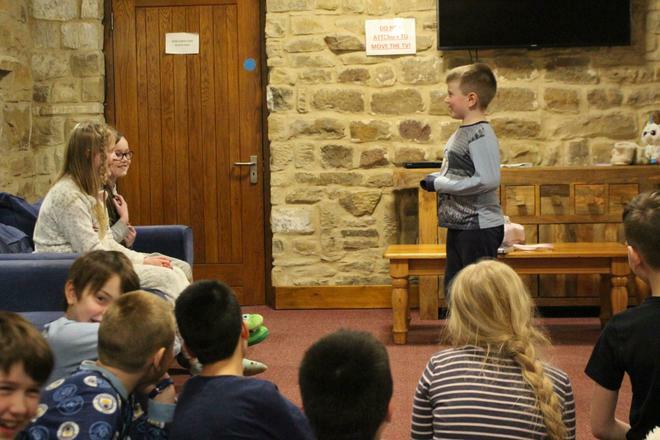 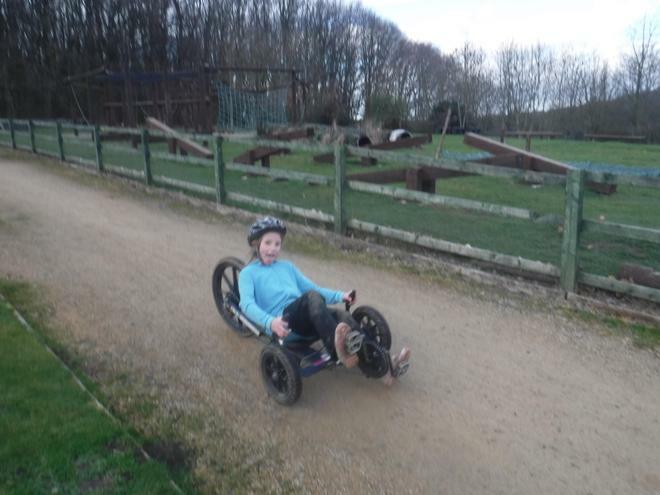 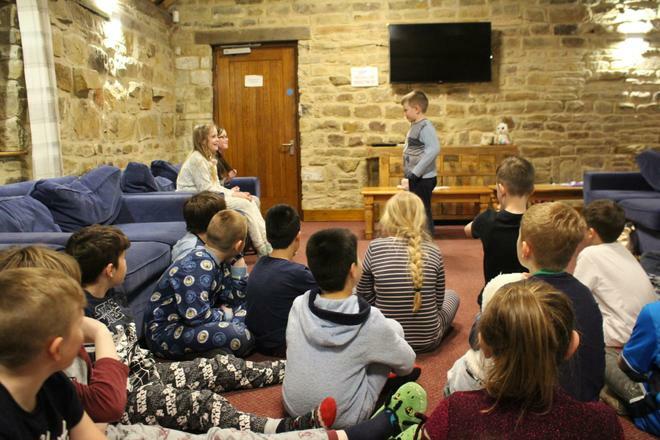 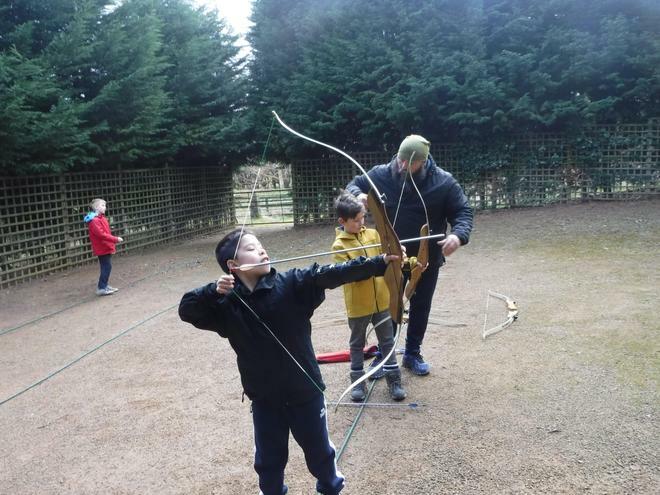 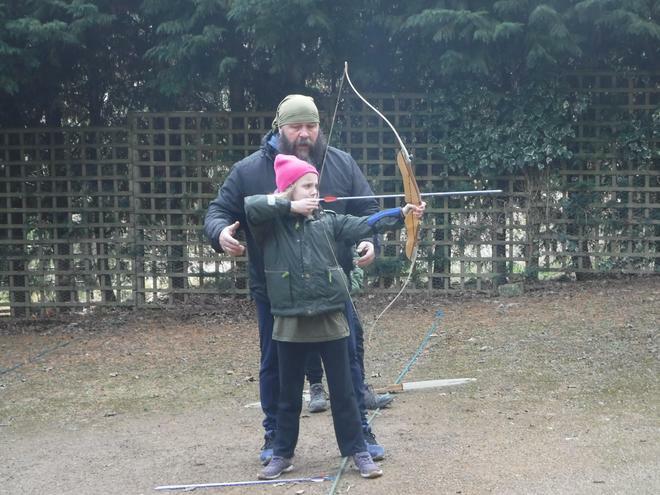 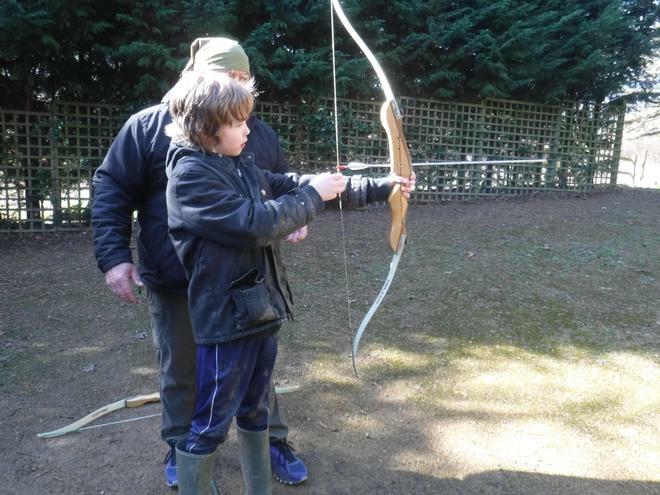 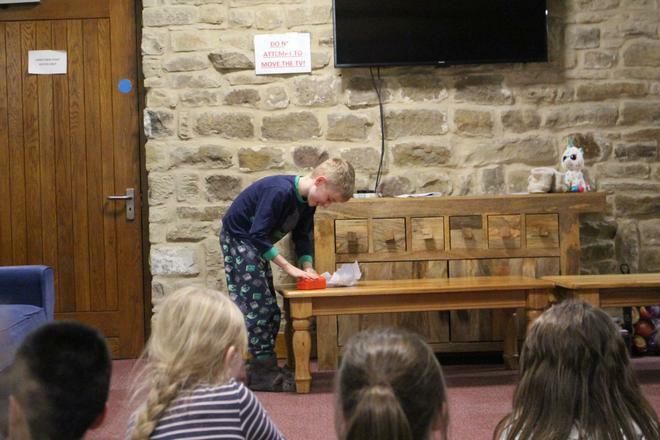 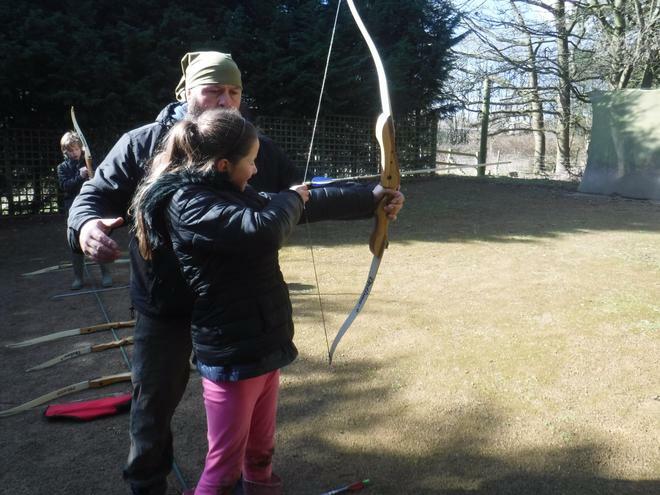 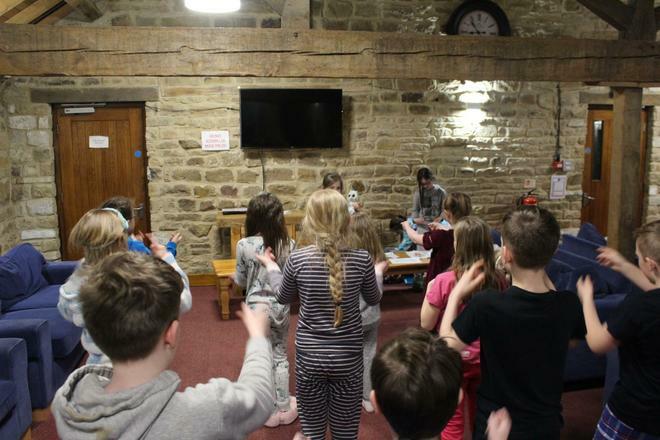 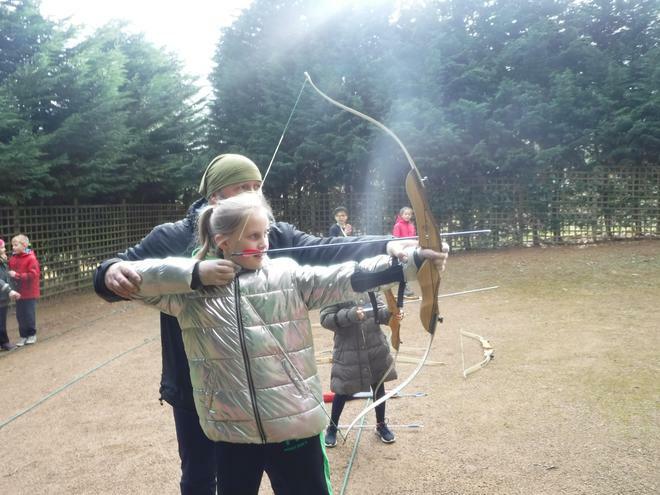 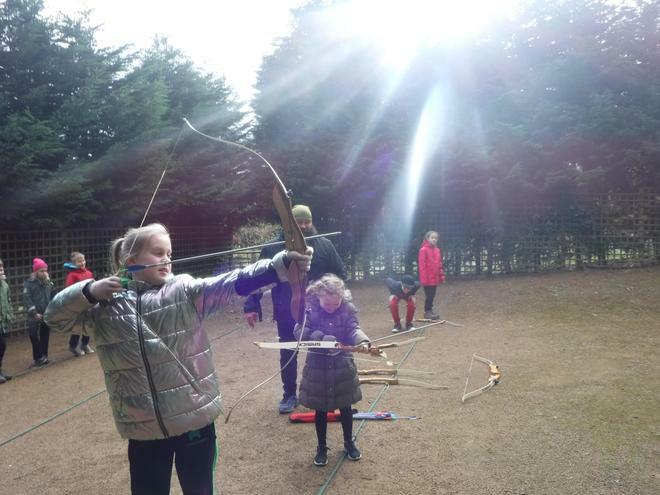 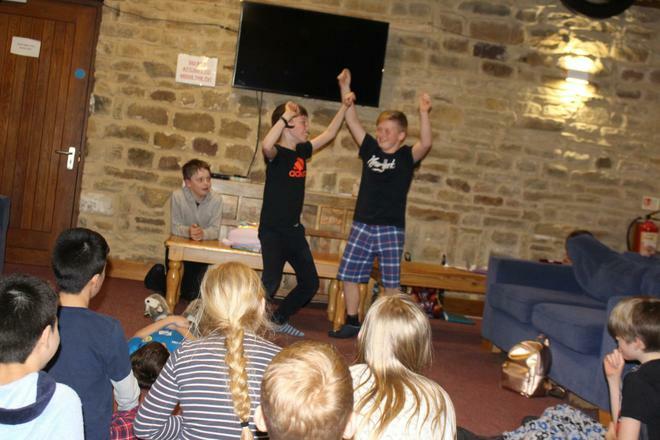 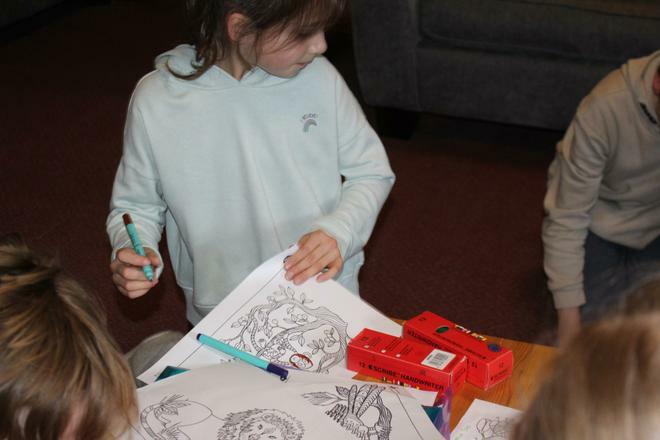 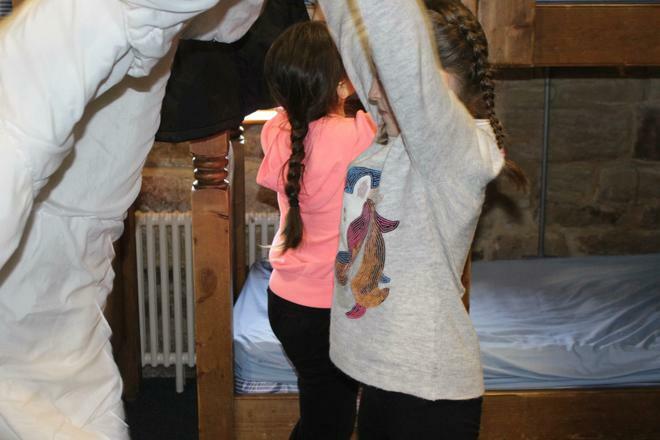 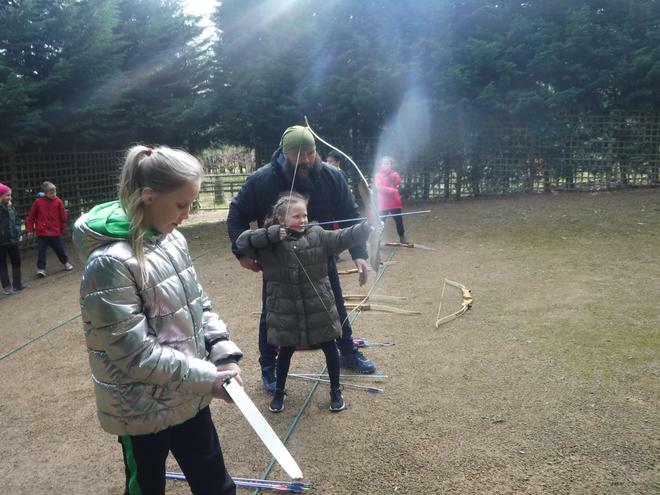 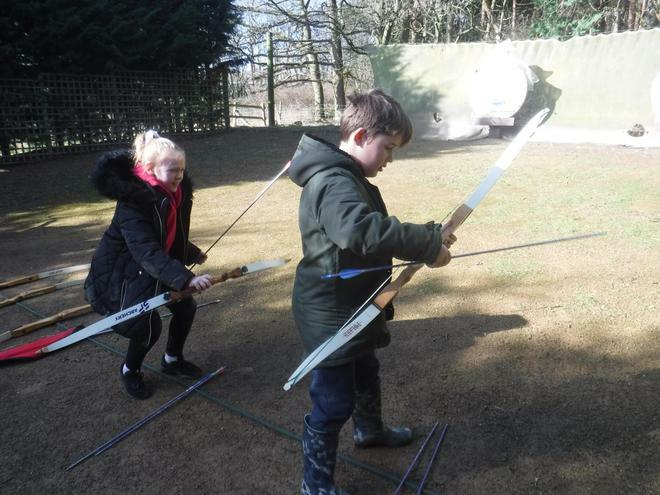 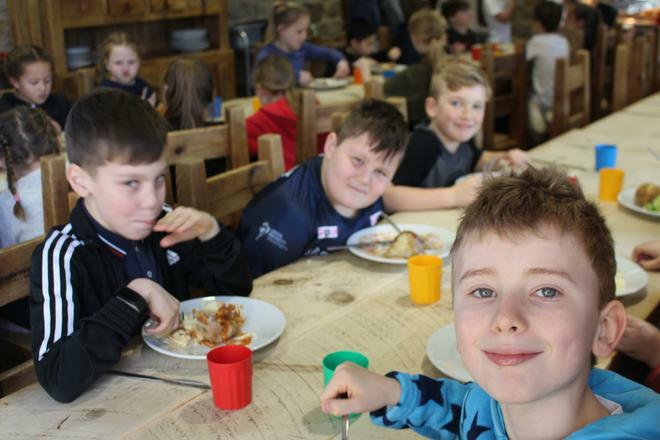 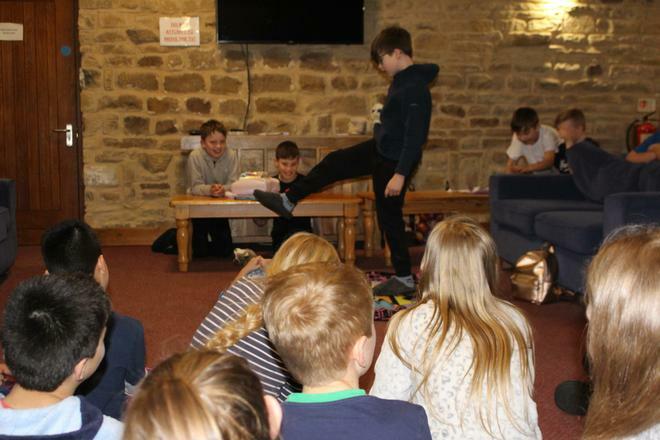 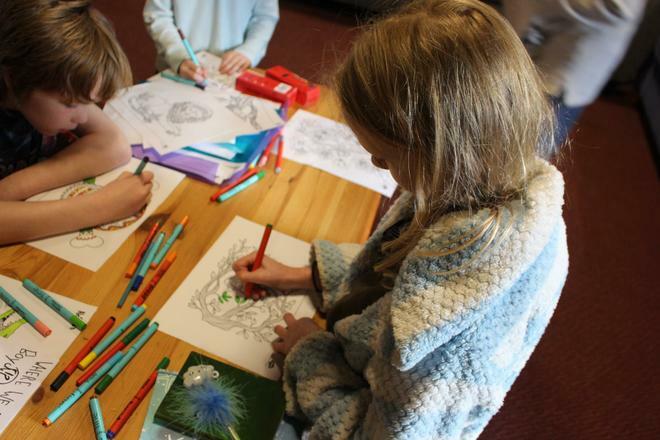 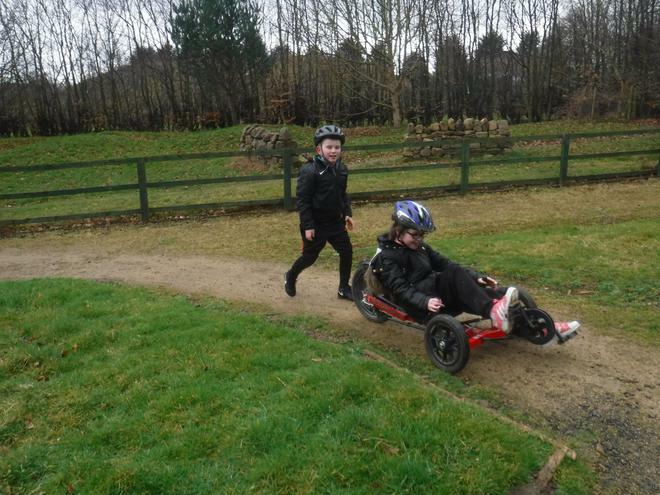 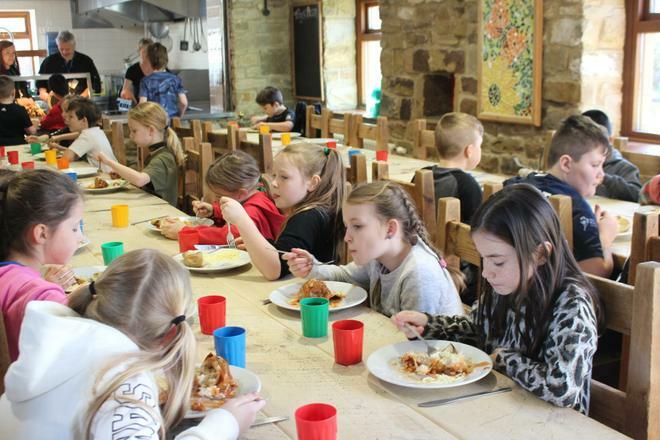 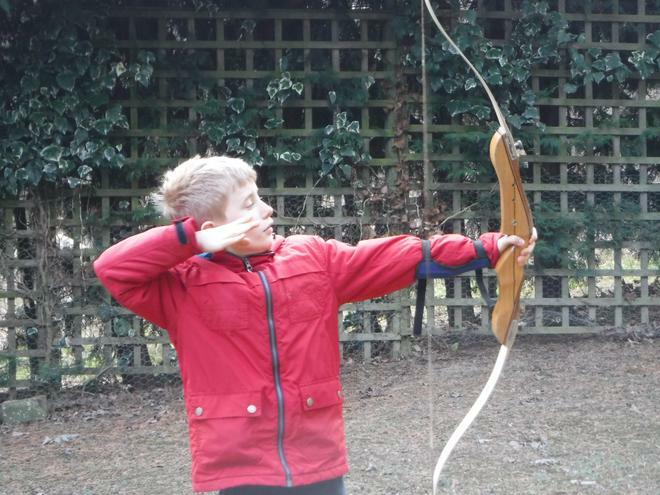 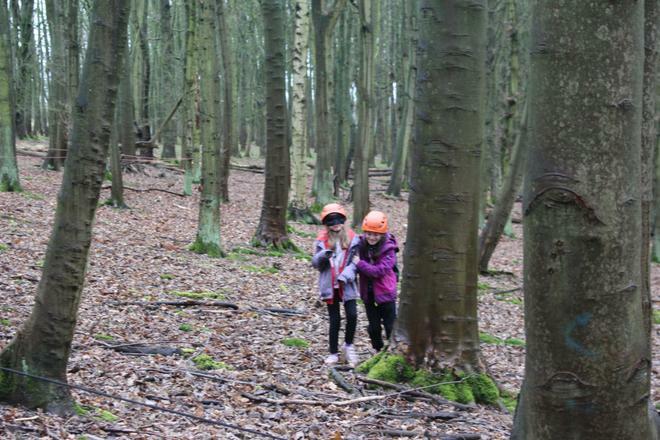 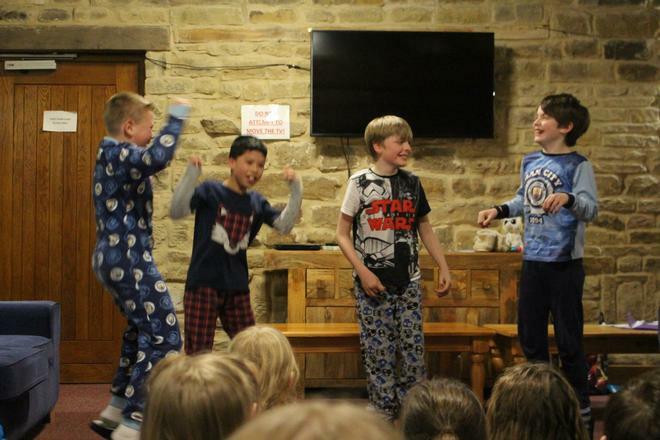 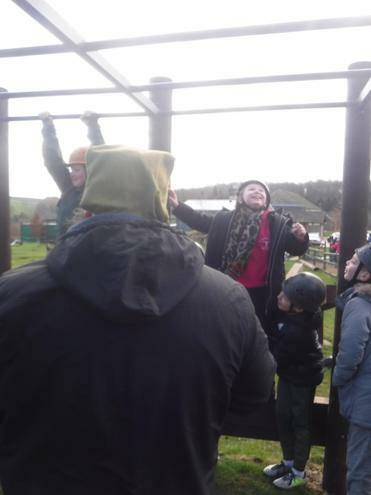 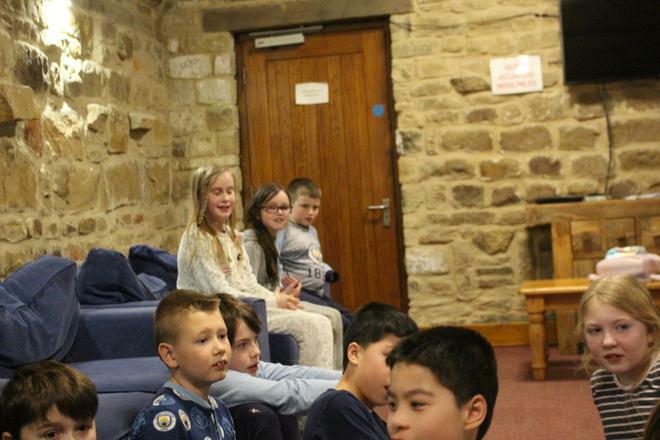 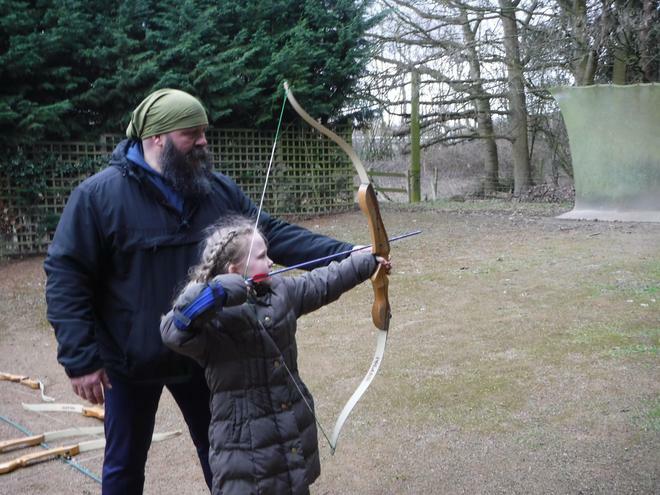 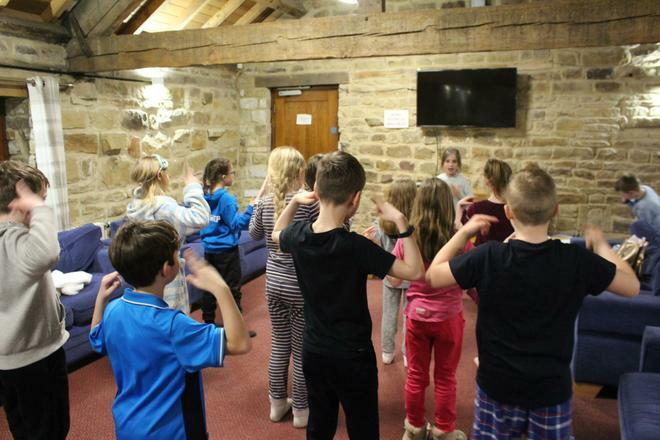 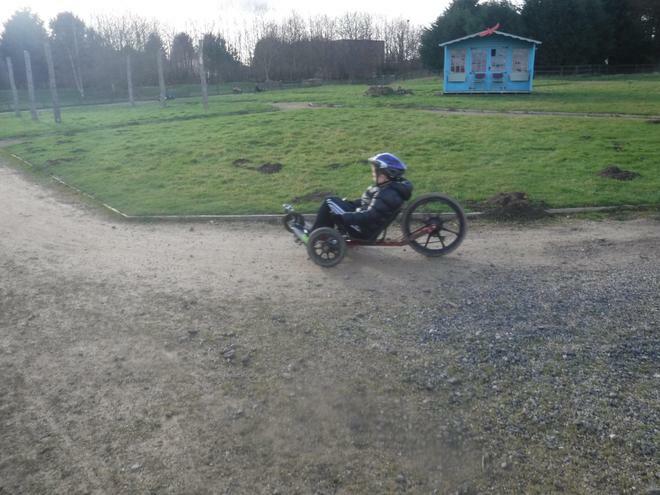 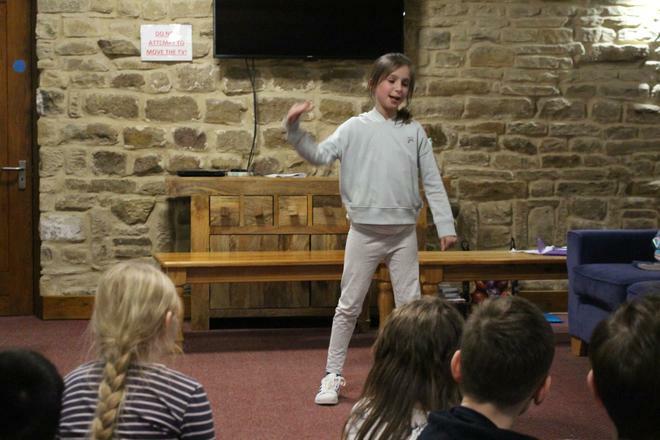 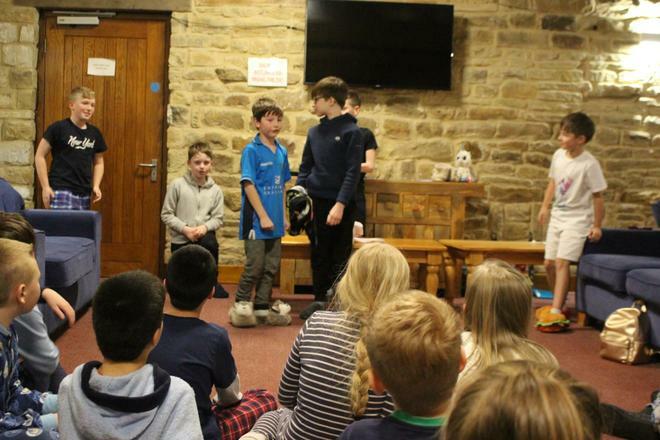 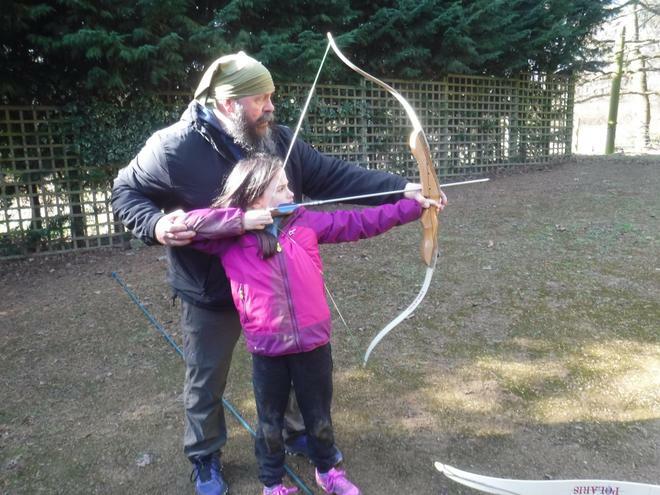 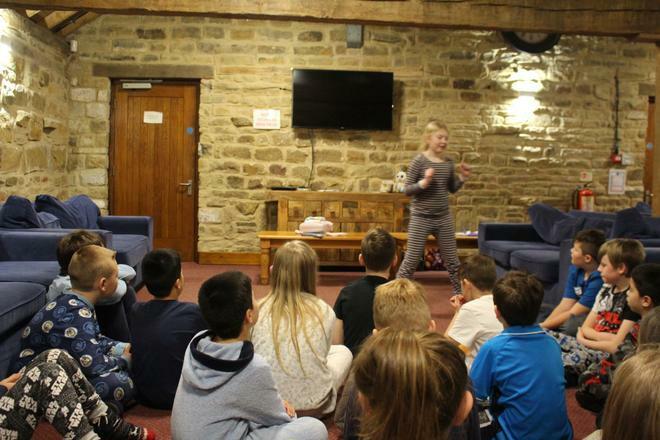 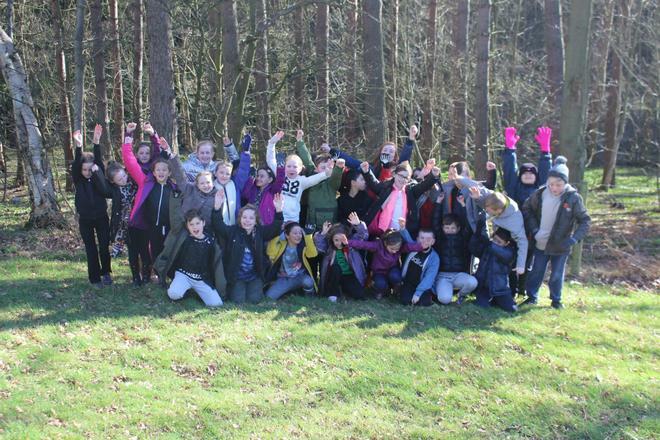 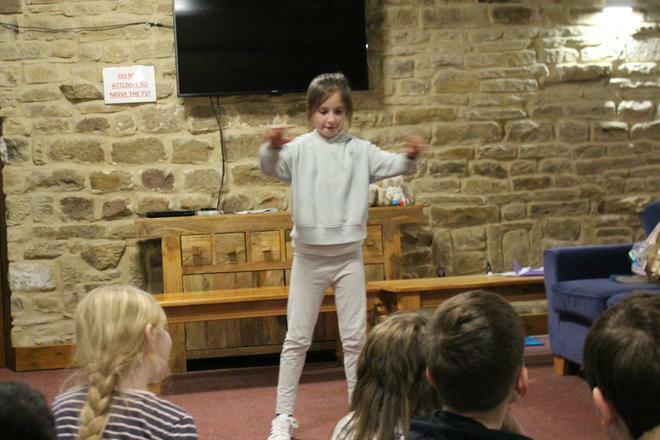 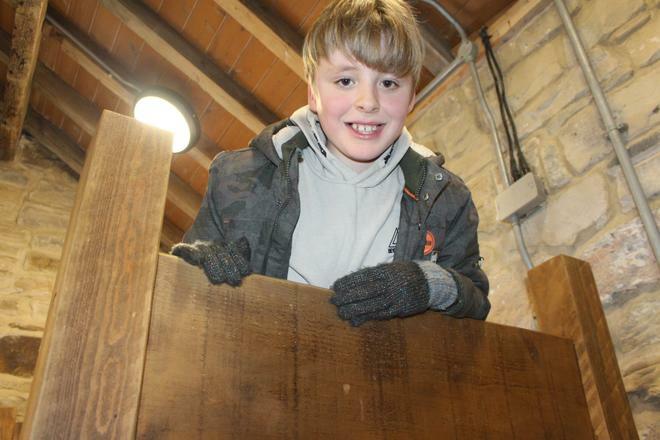 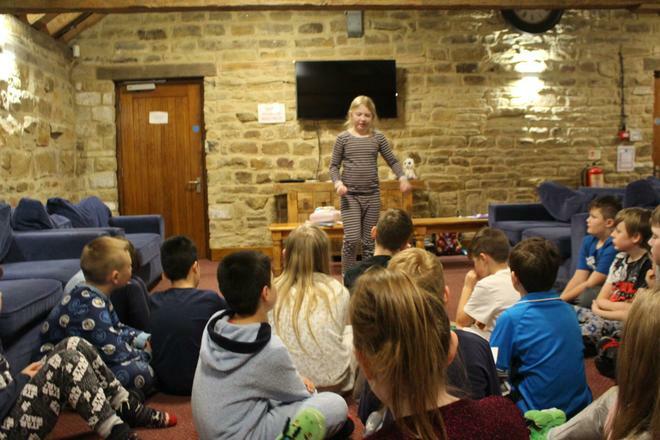 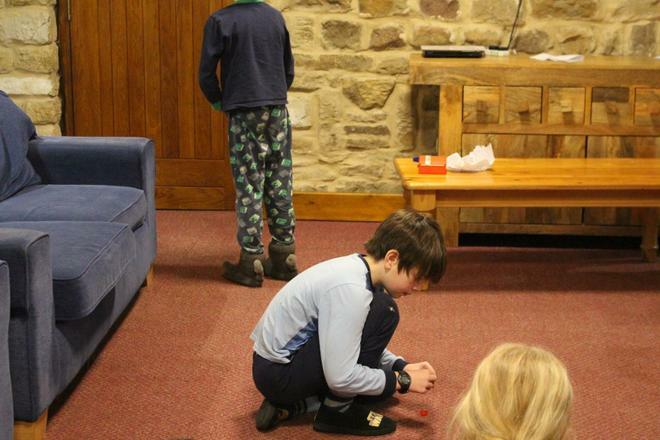 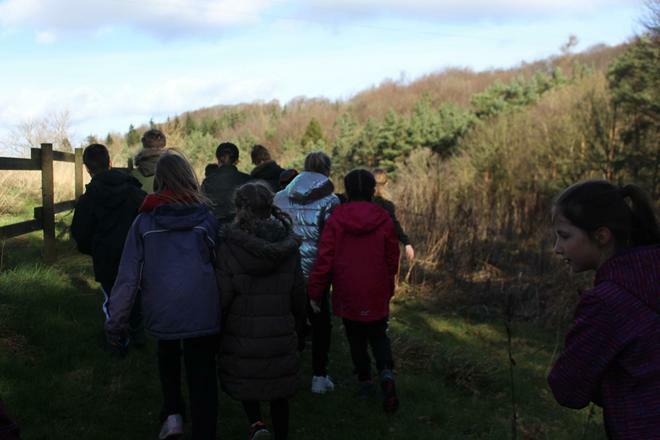 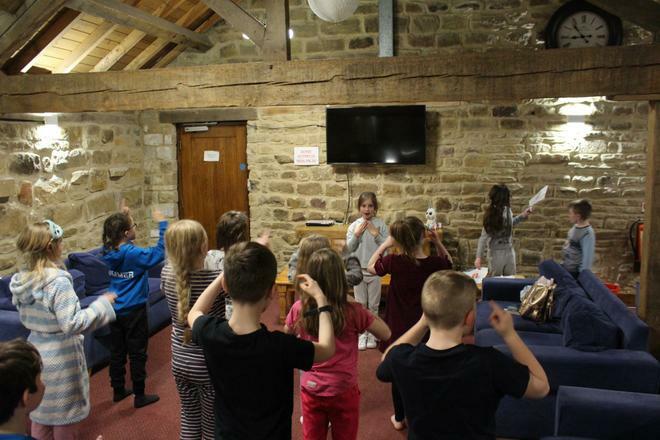 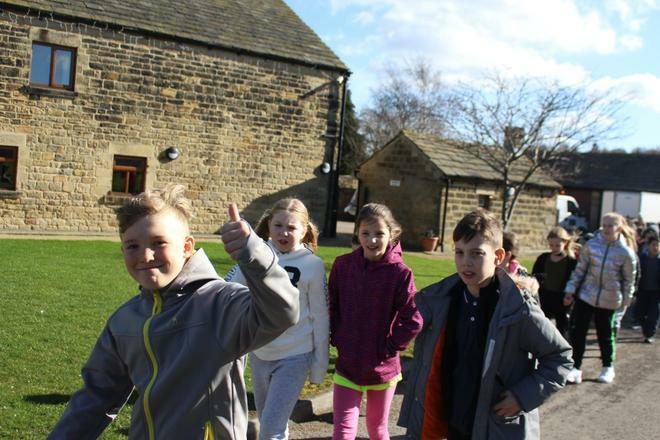 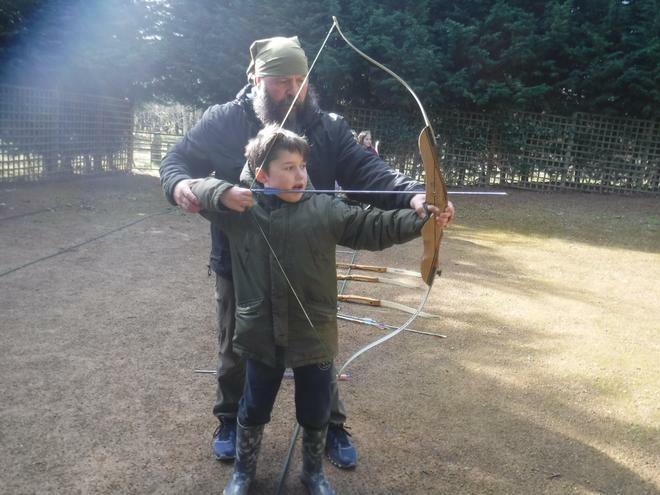 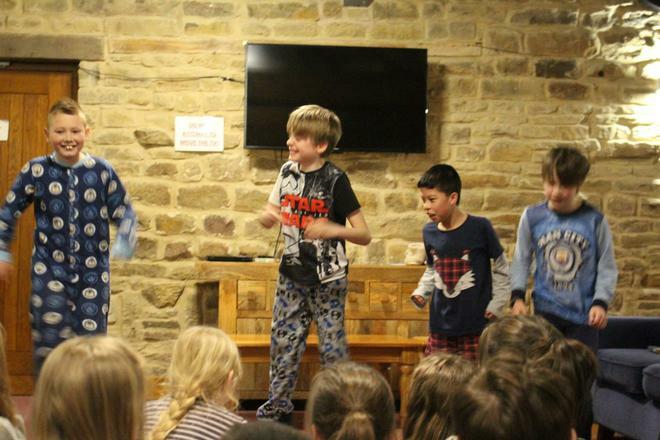 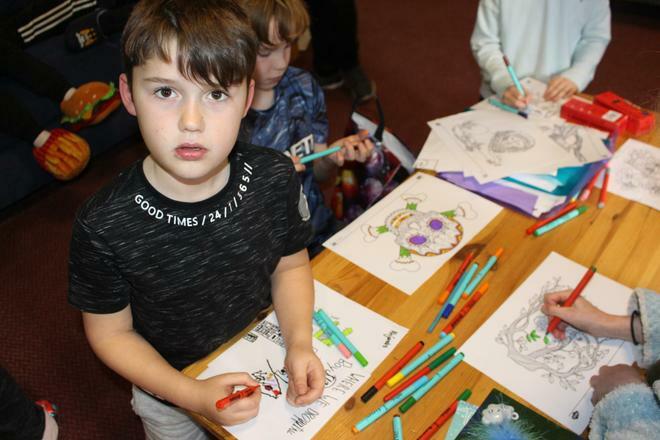 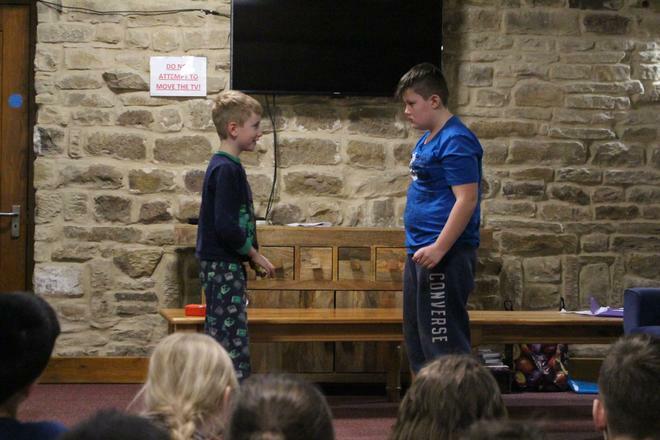 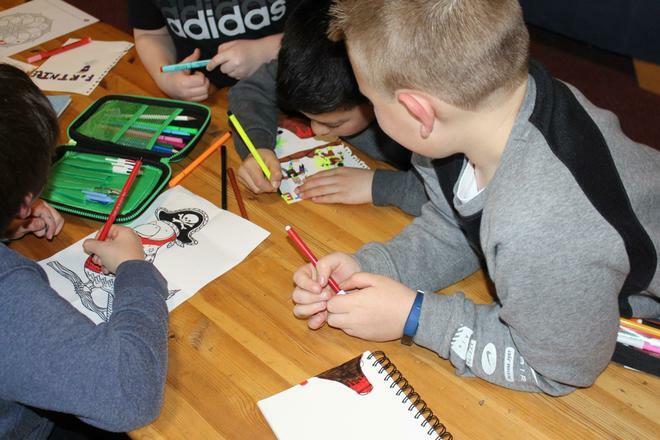 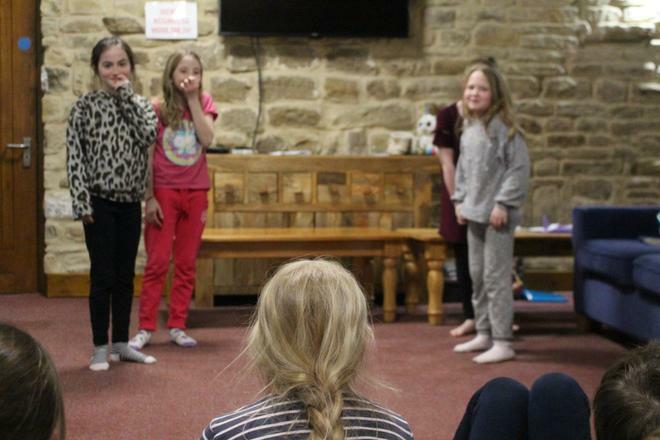 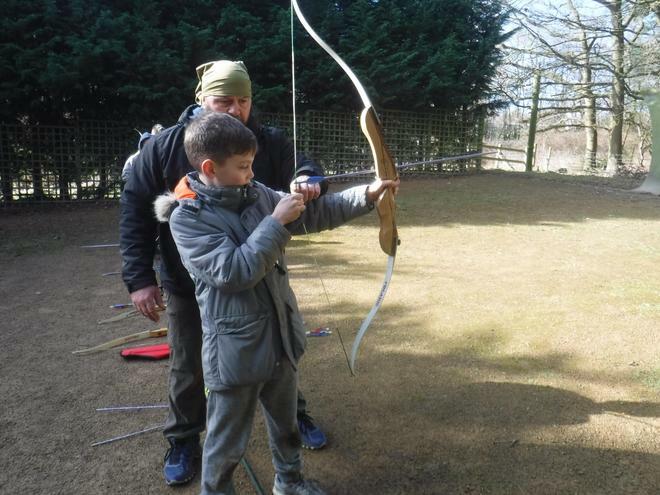 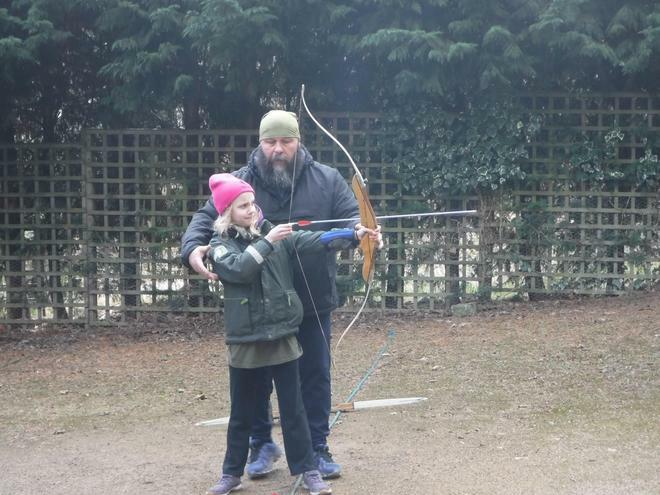 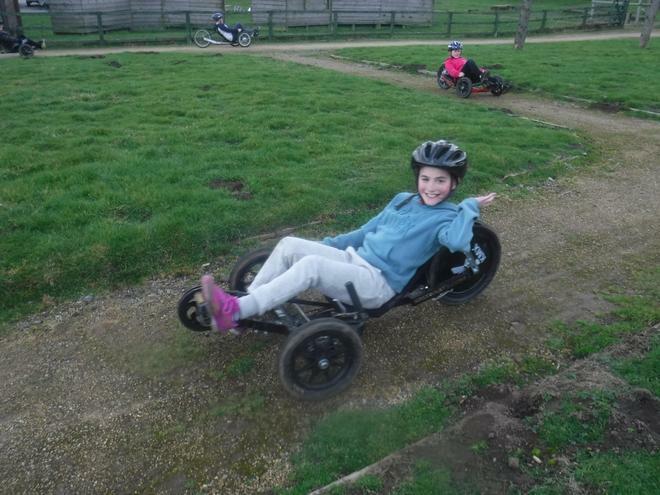 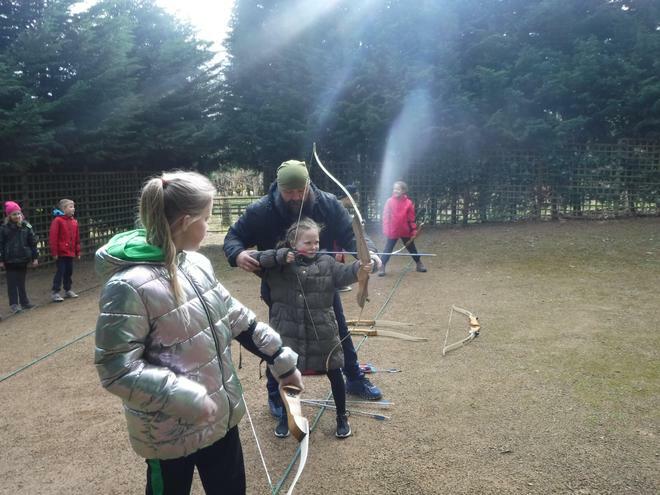 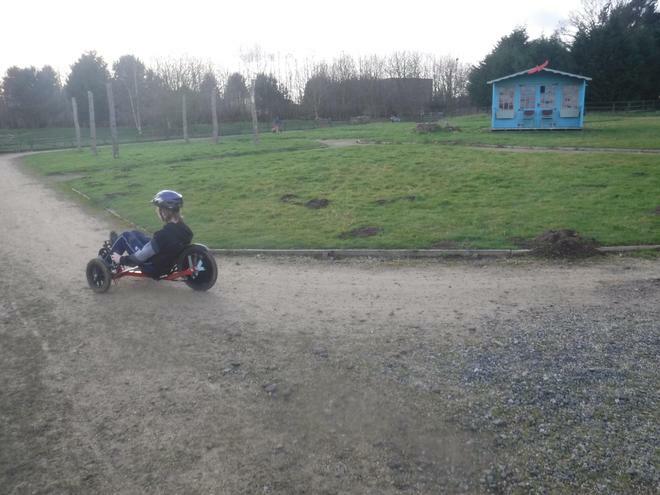 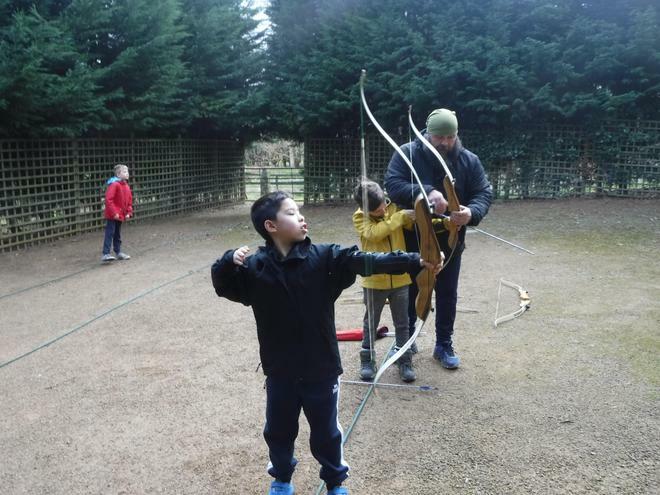 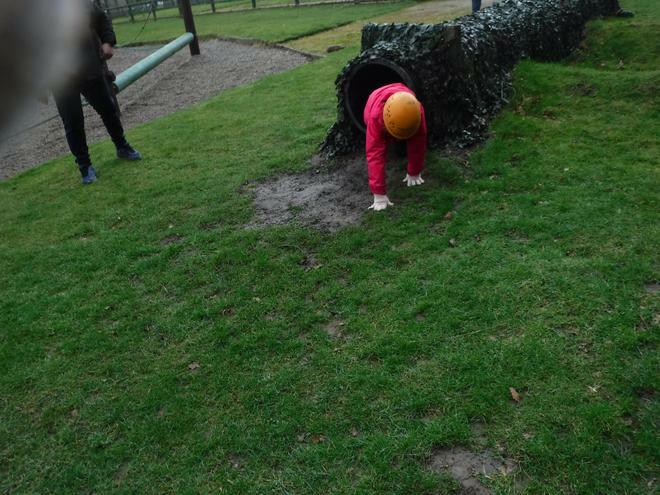 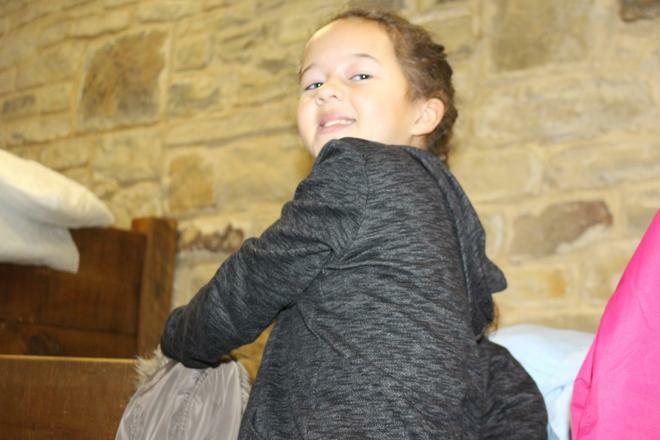 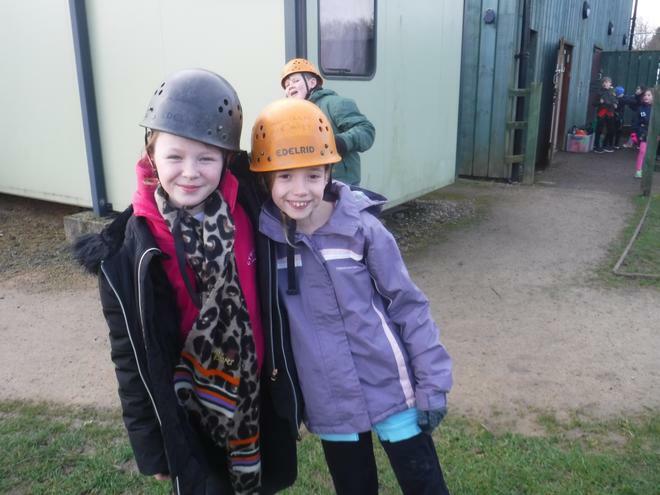 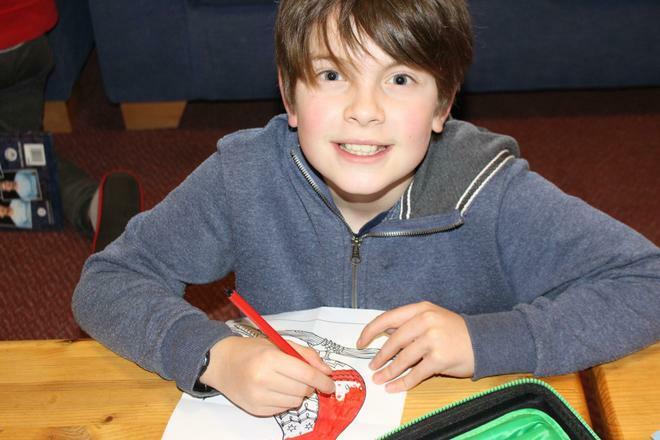 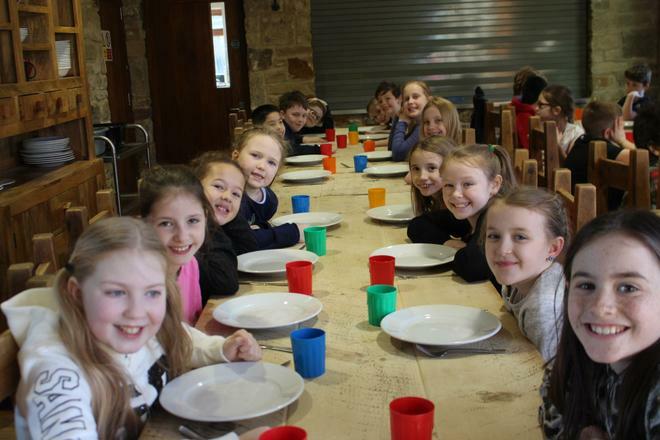 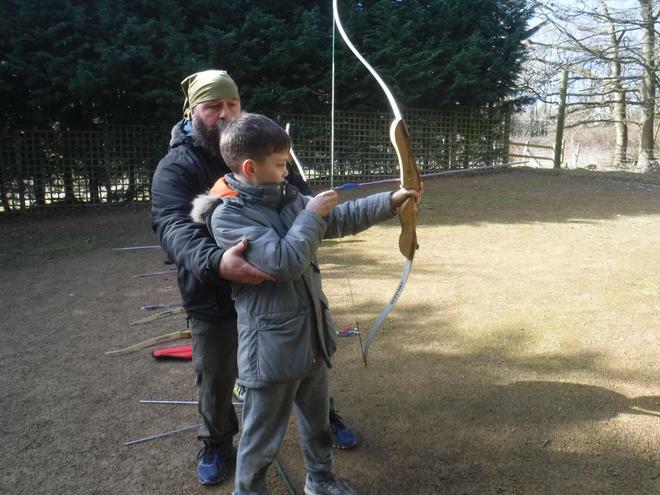 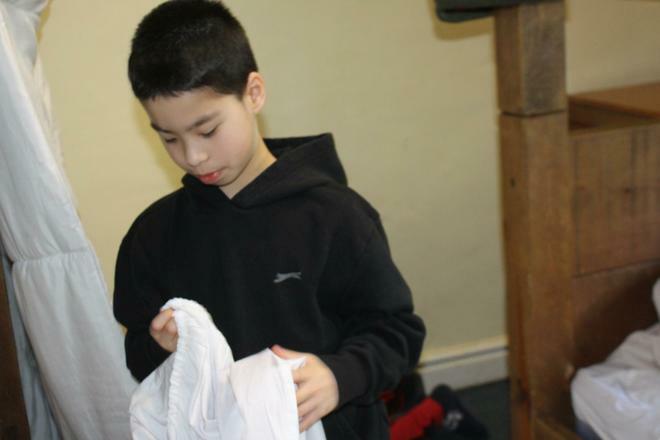 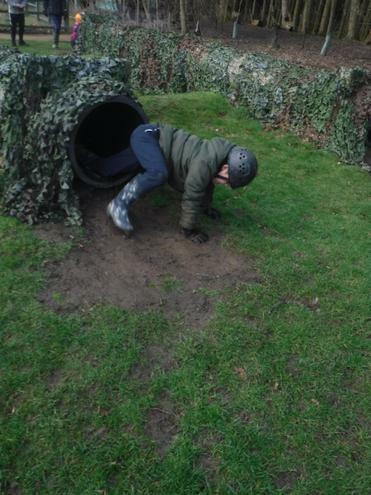 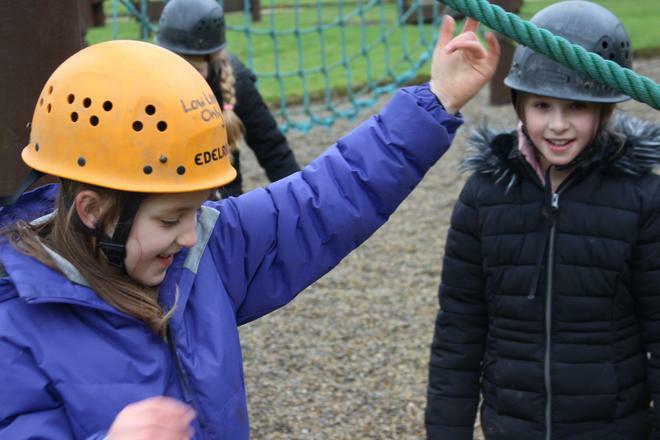 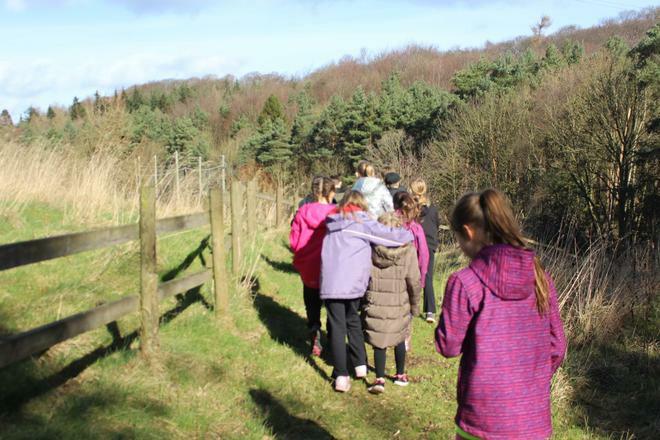 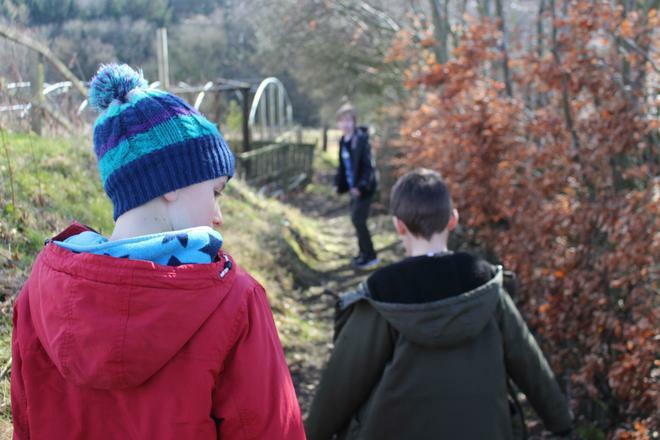 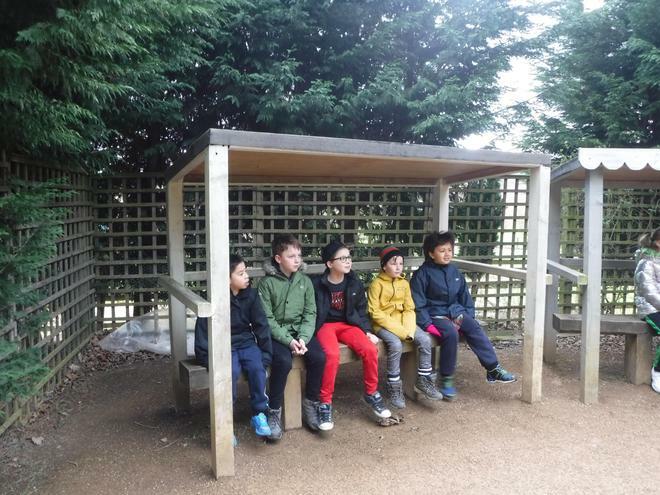 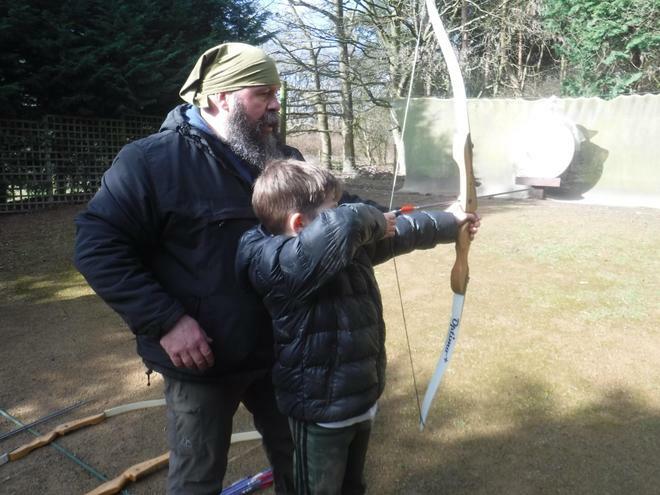 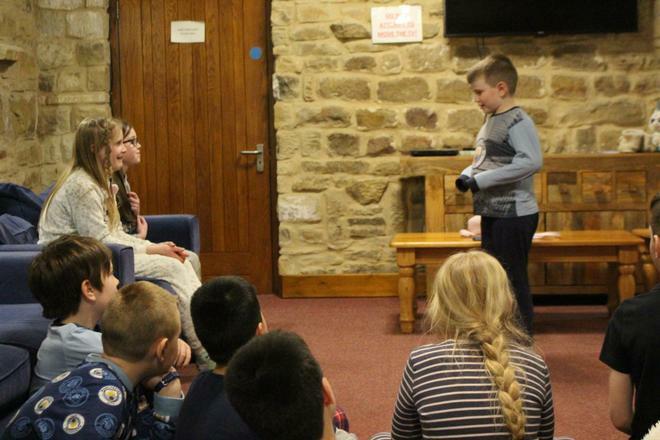 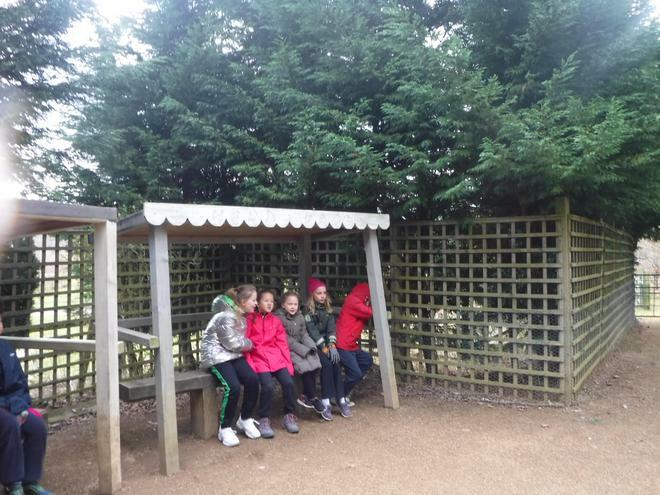 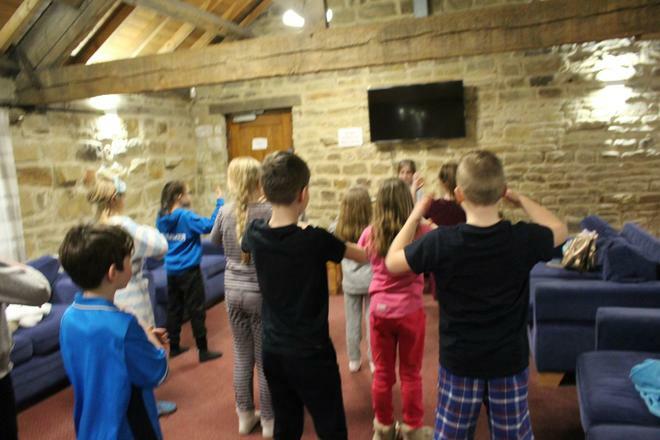 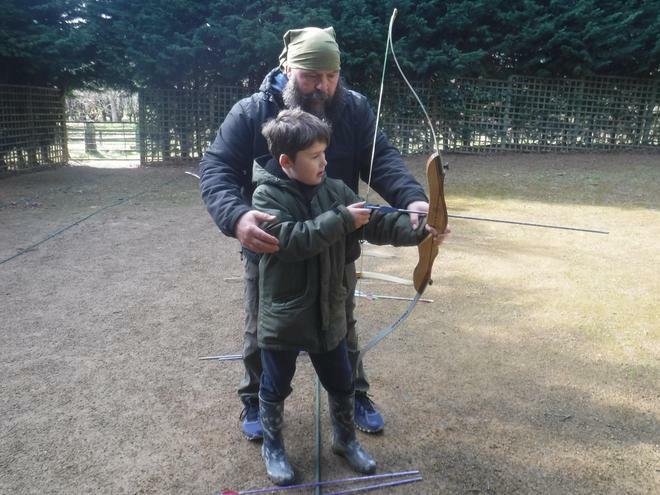 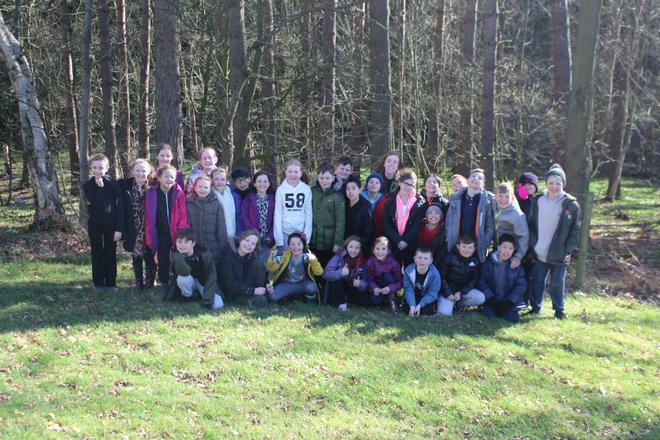 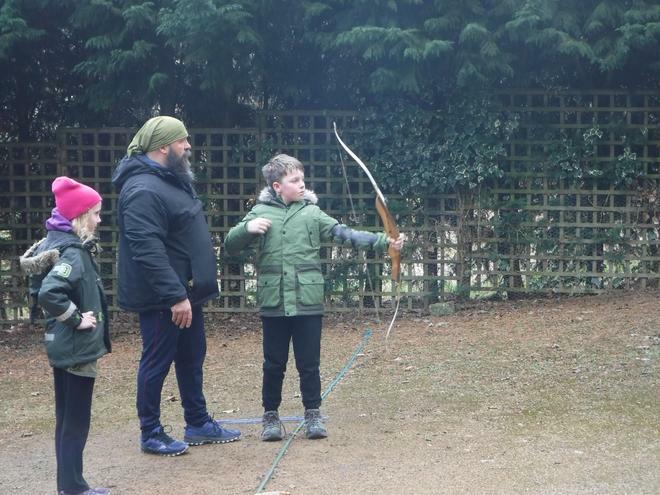 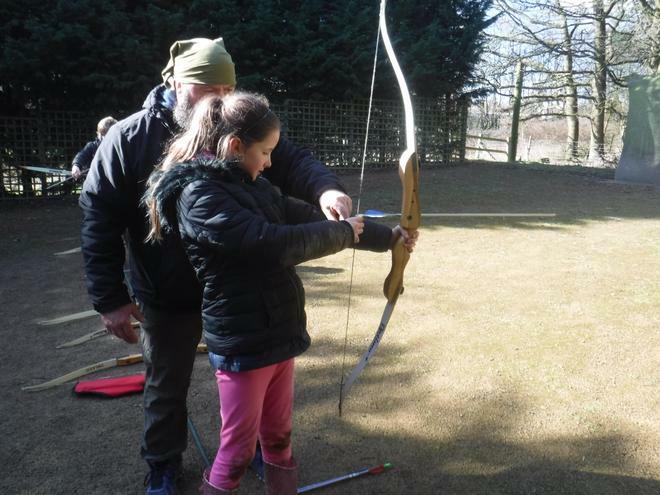 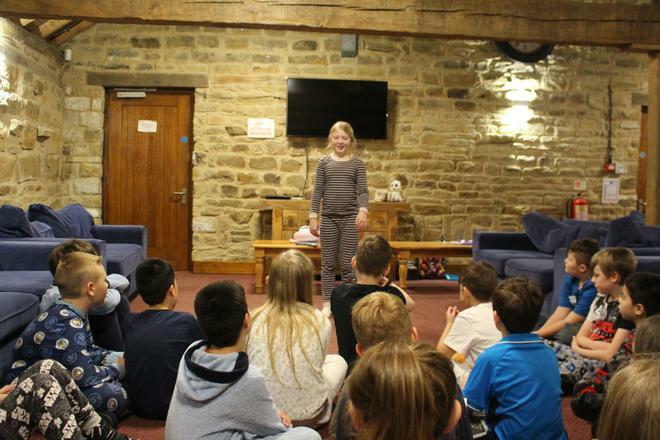 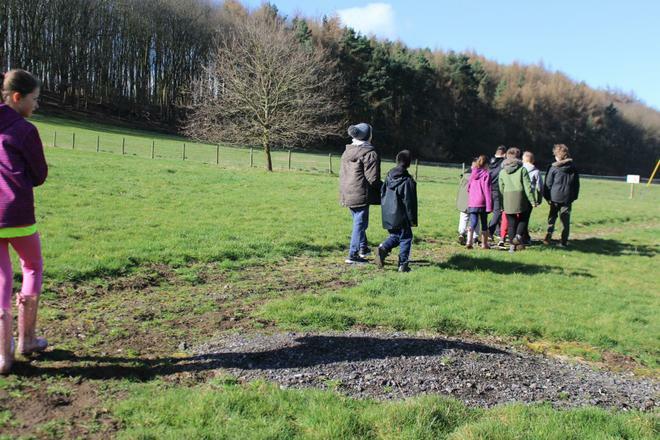 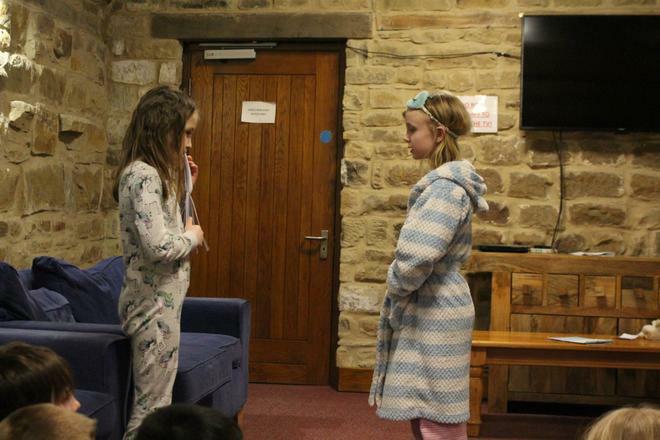 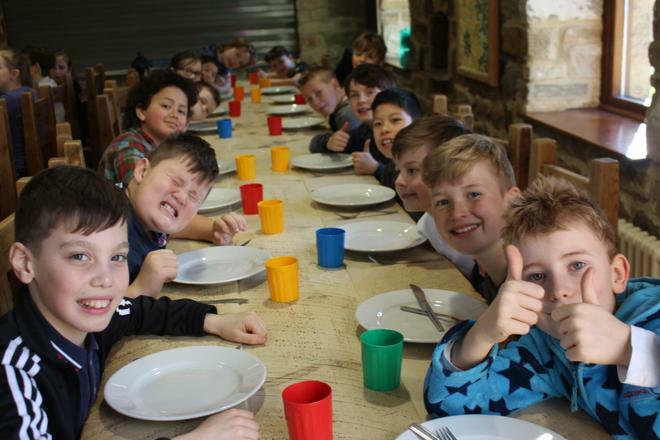 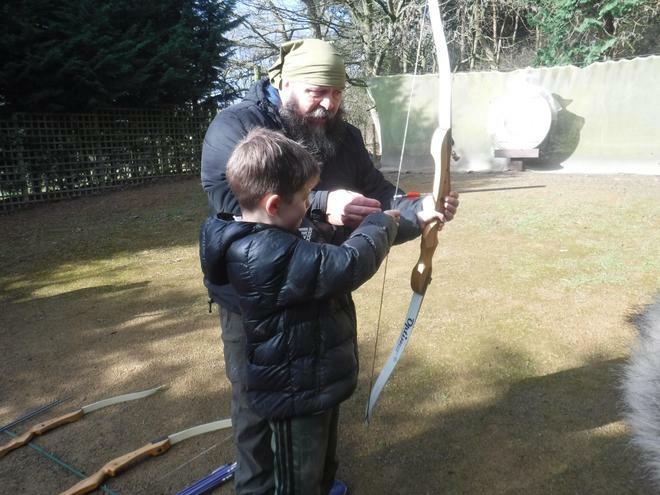 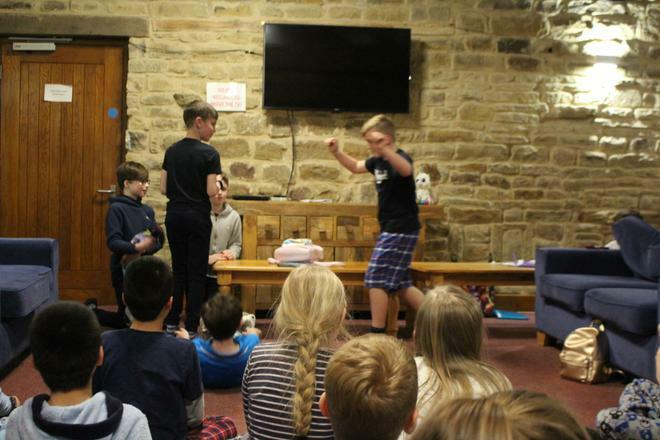 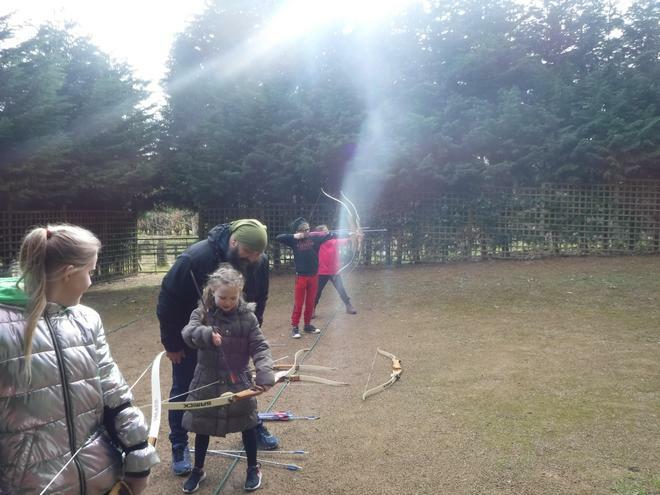 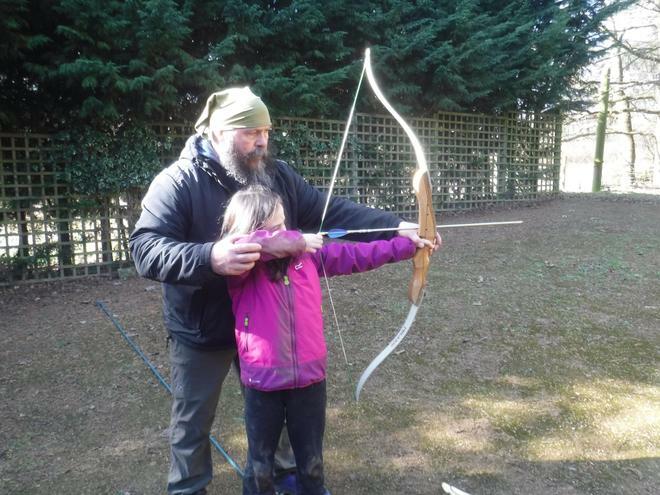 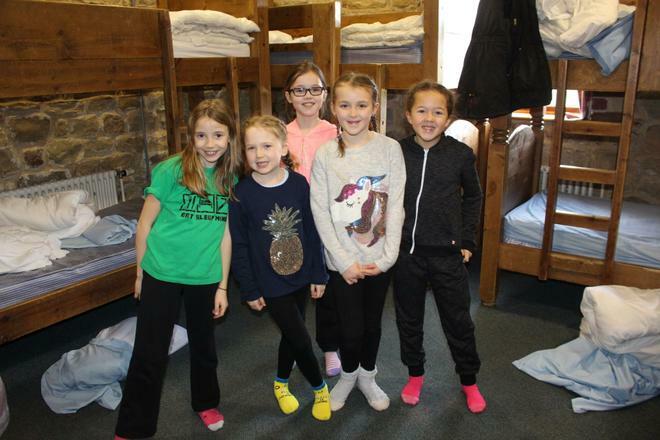 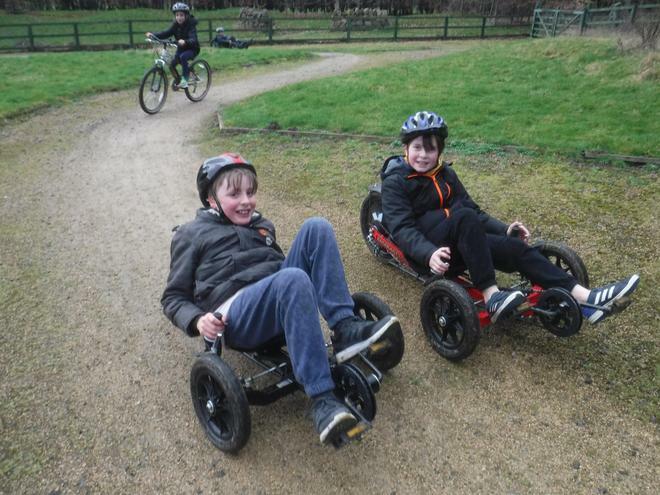 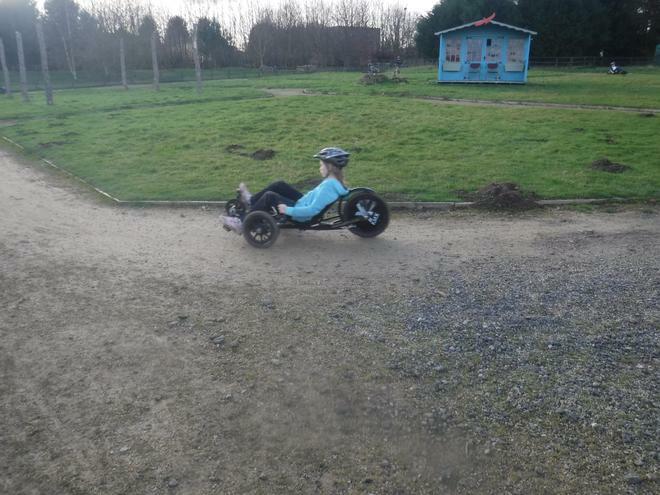 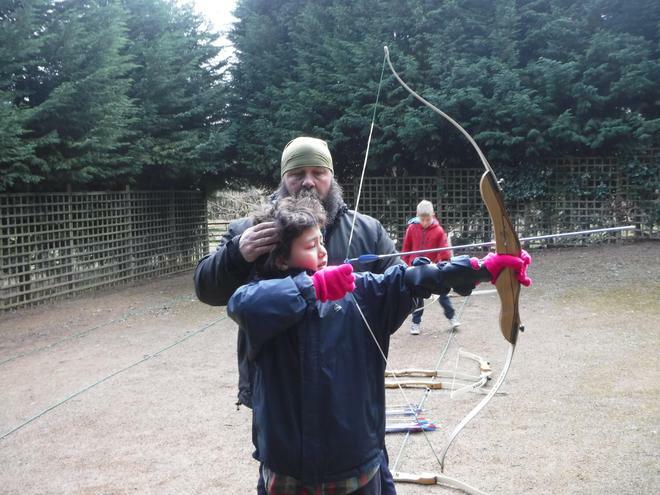 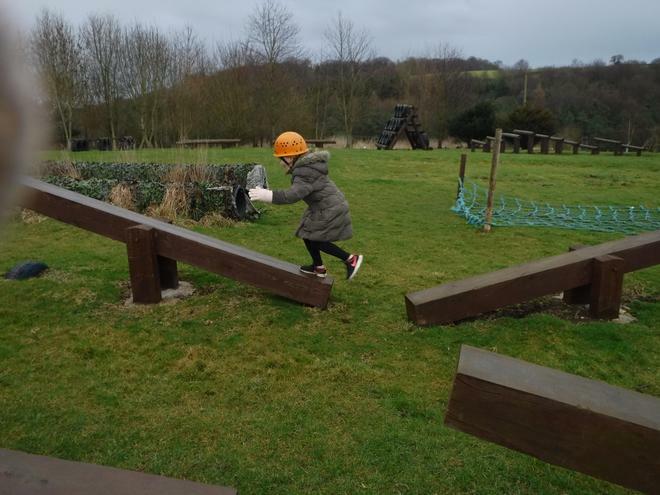 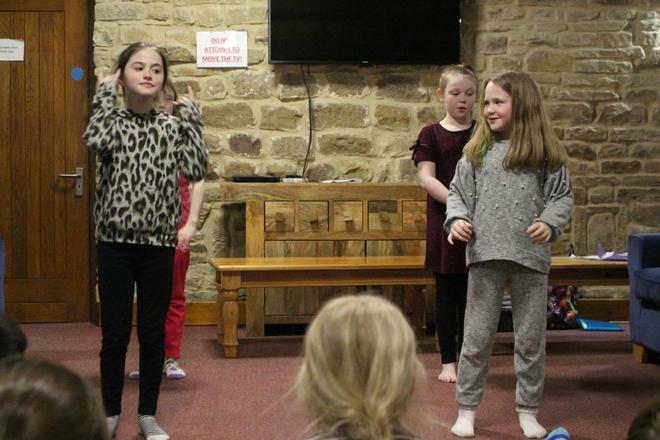 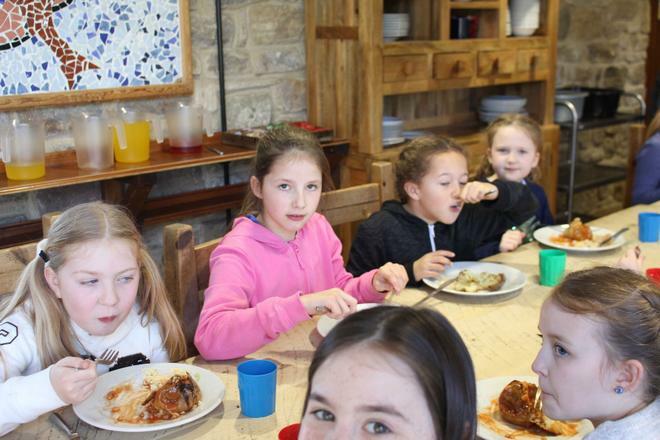 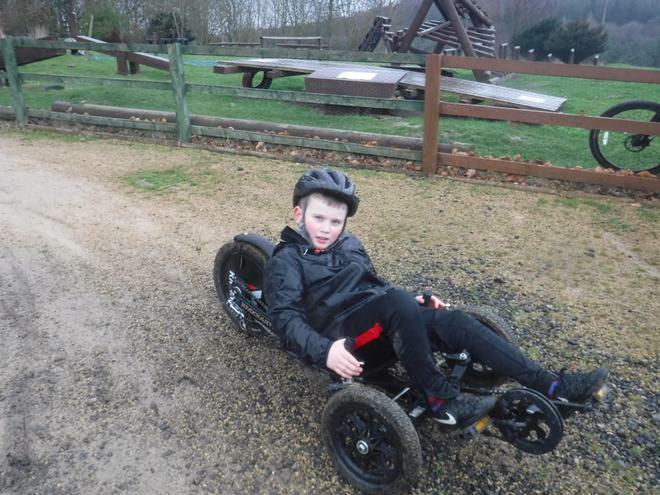 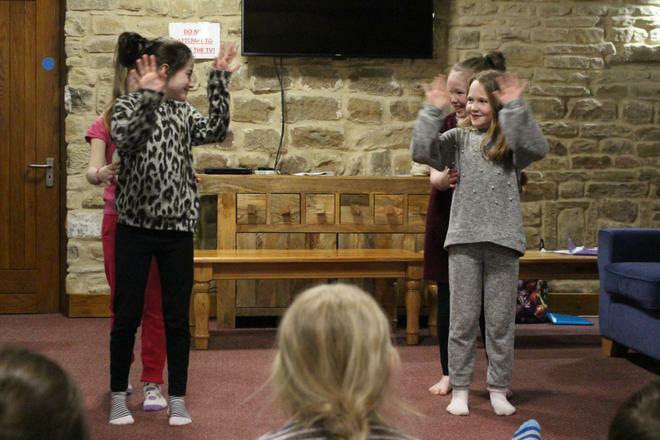 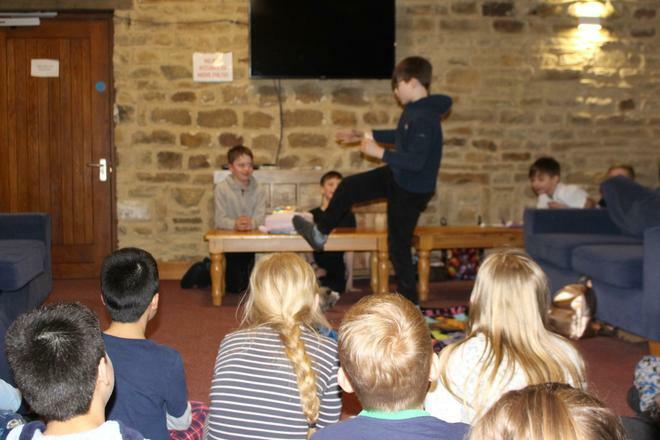 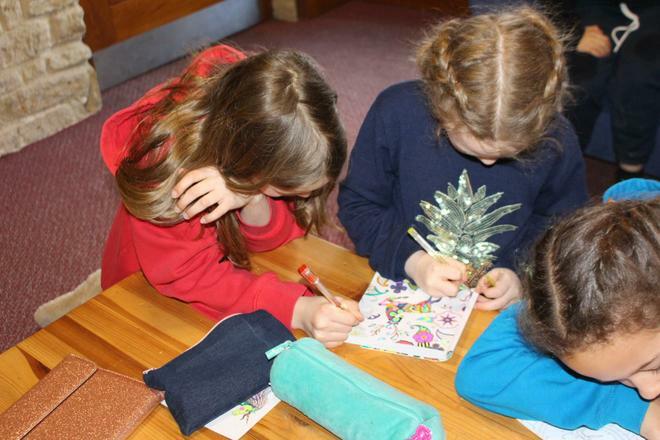 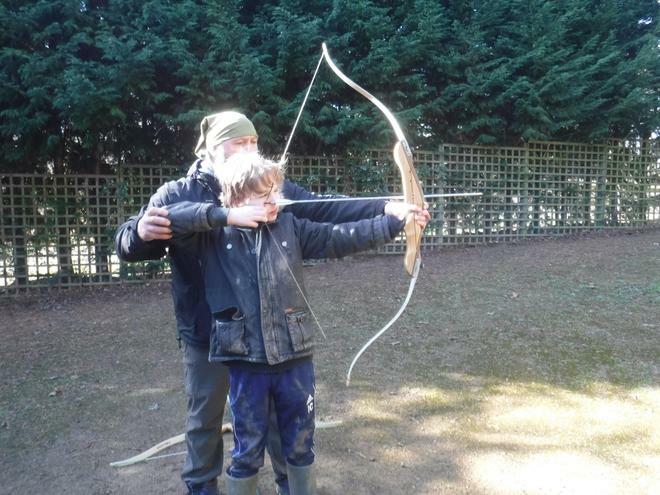 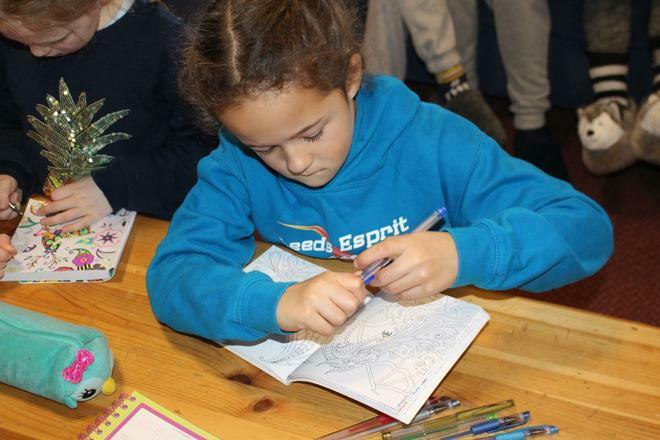 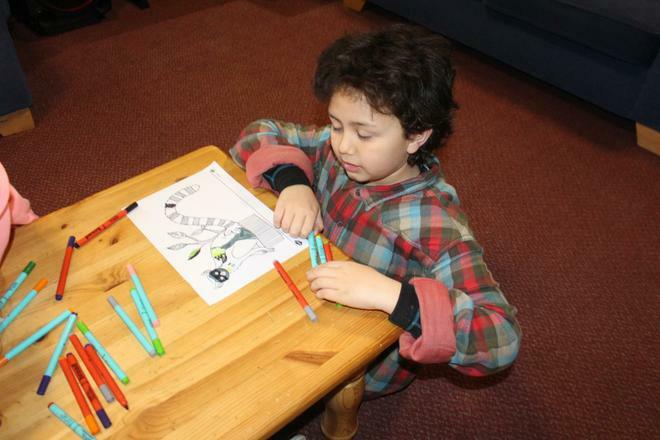 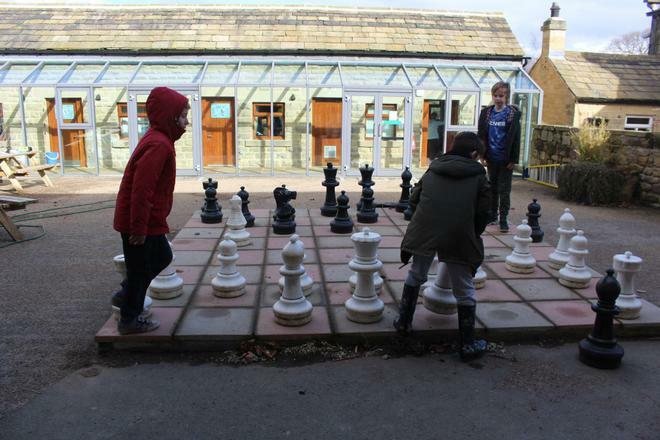 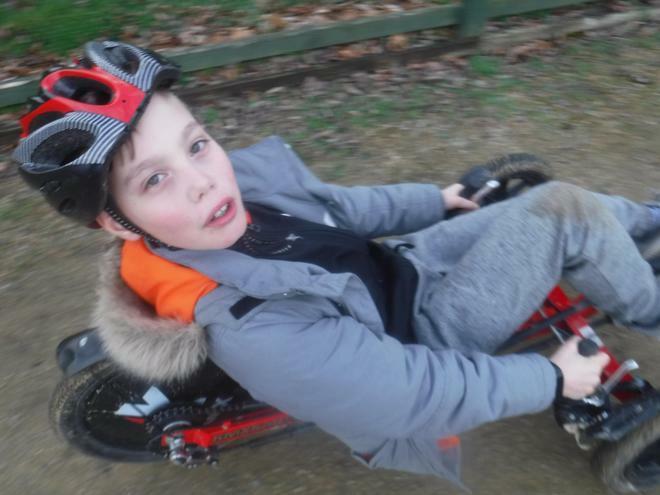 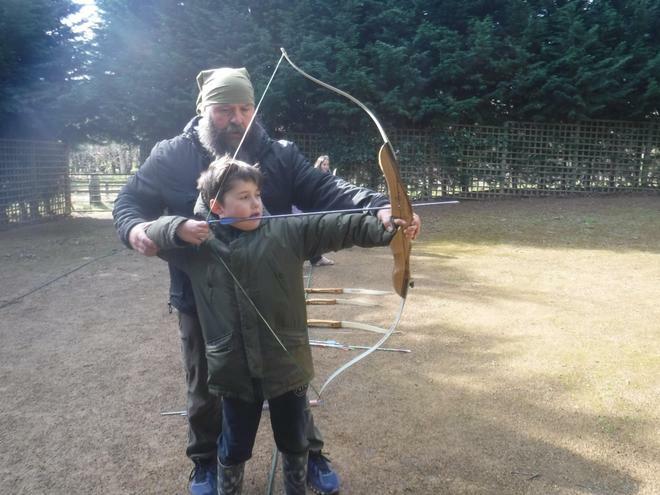 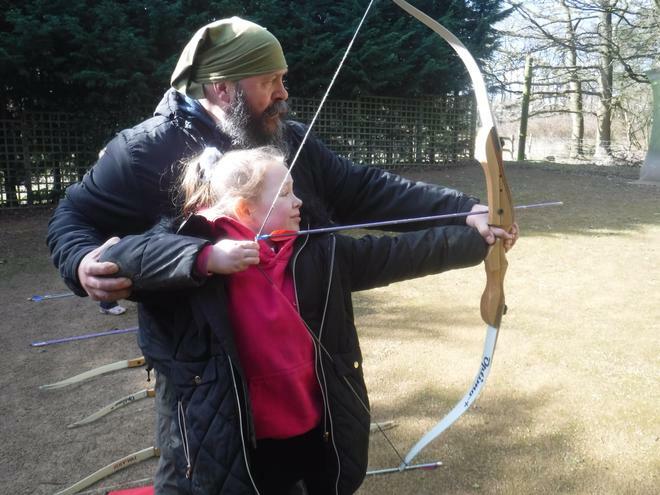 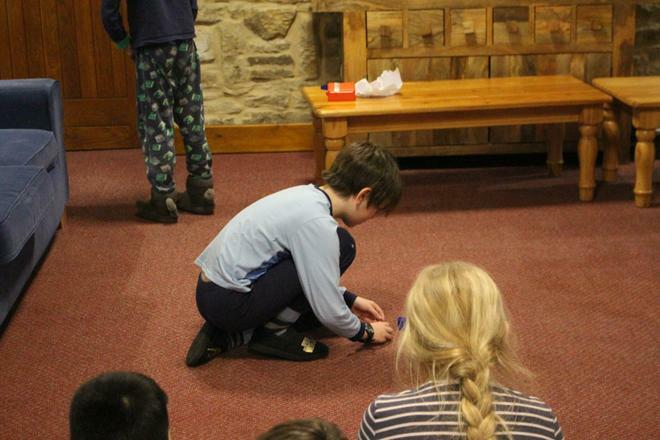 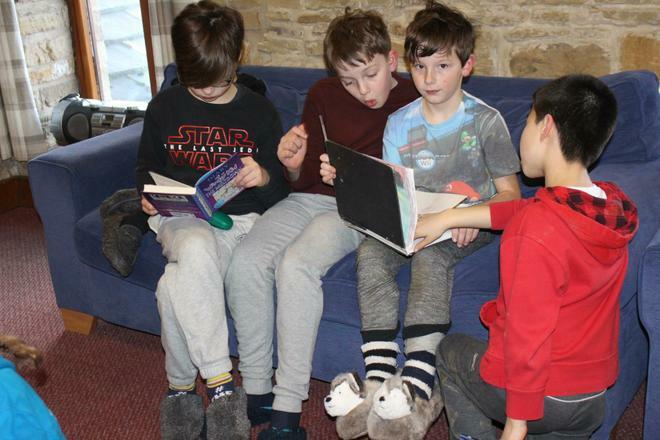 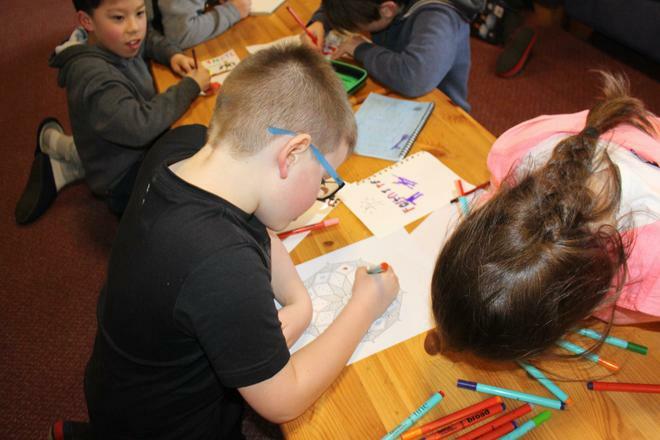 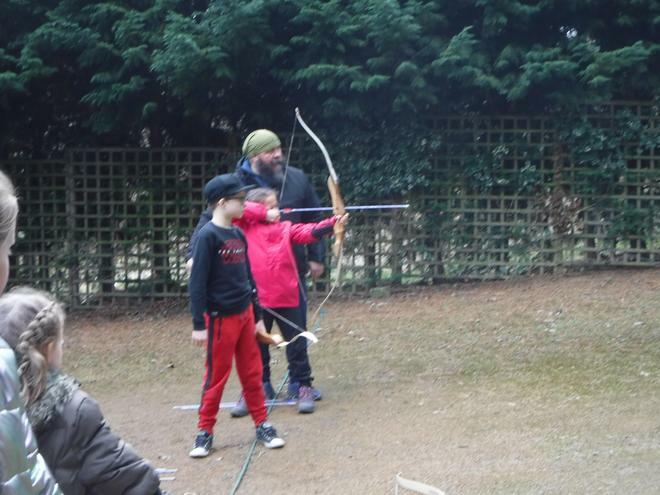 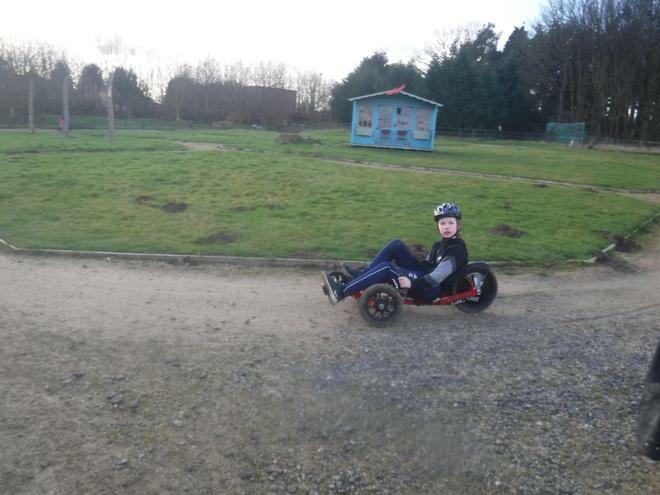 Then it was back to the centre where the children had some time to relax before enjoying a delicious dinner of homemade pizza followed by chocolate cheesecake. 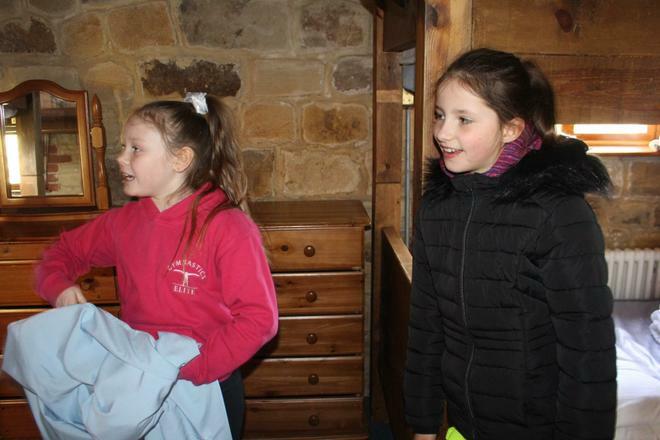 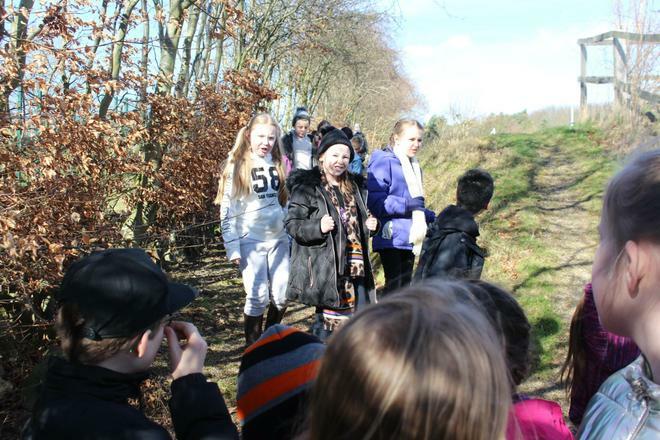 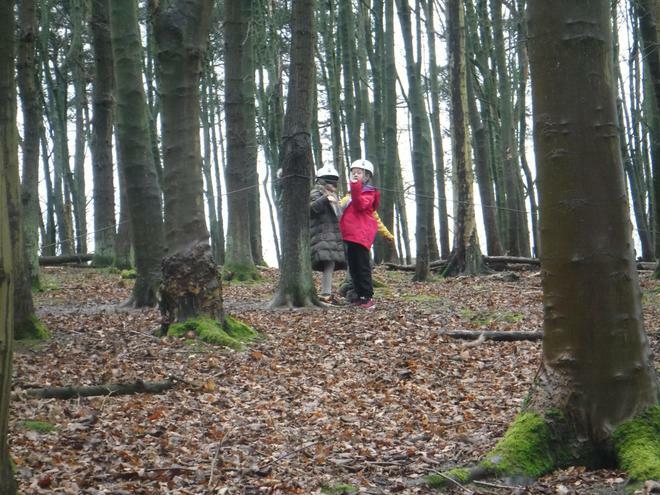 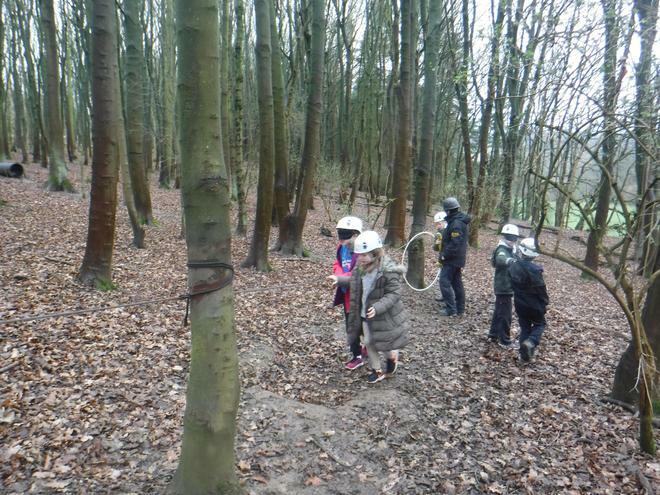 The children then had to wrap up warm as they headed out for the night walk. 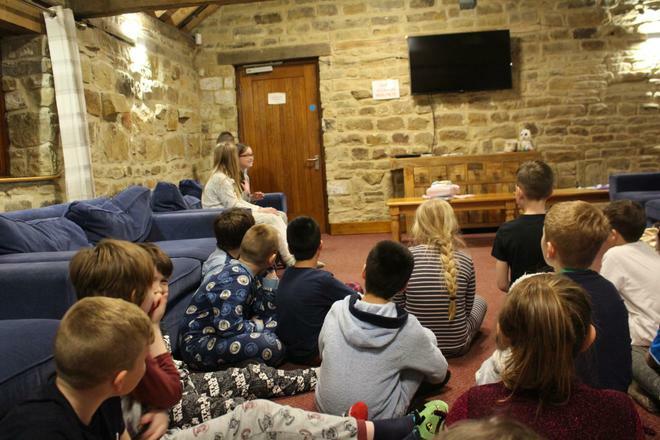 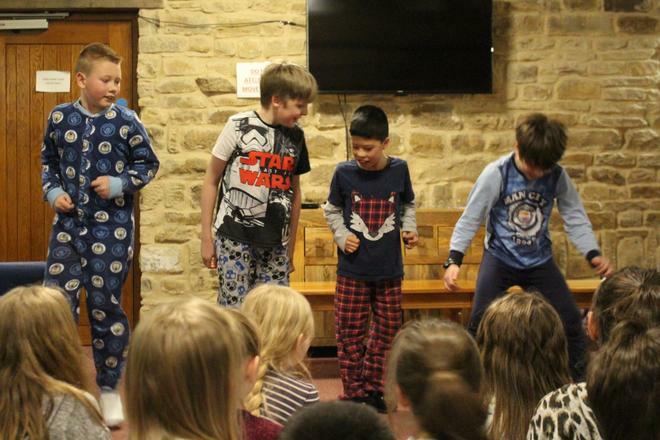 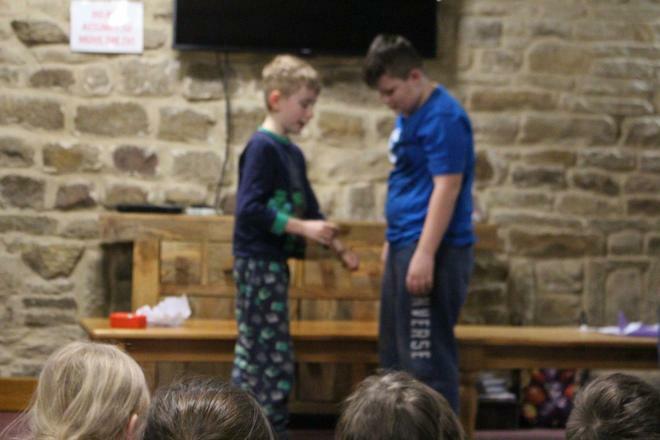 Unsurprisingly, after such a busy day, the children were all fast asleep by 10.30pm! 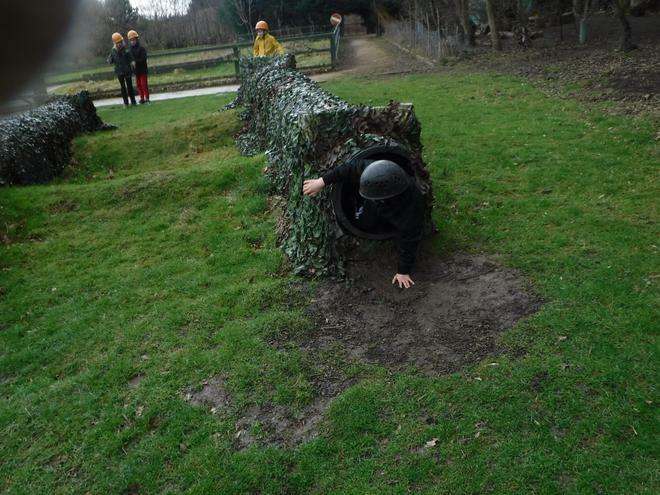 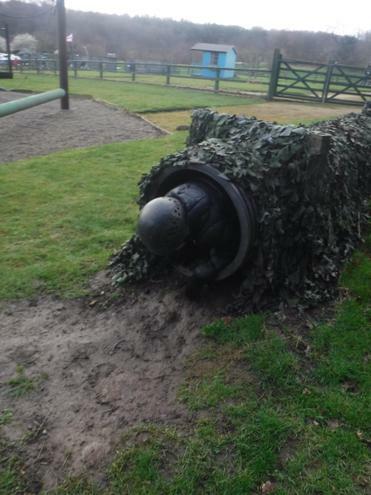 Roll on day 2.